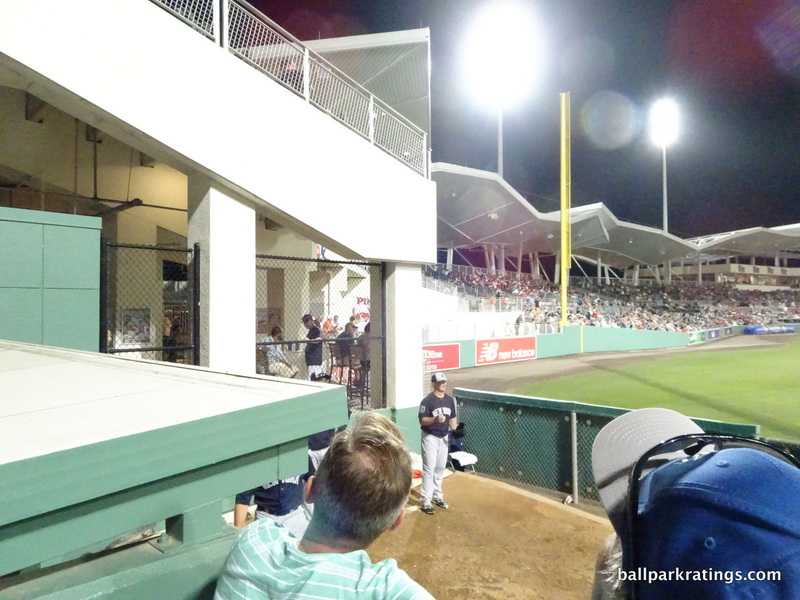 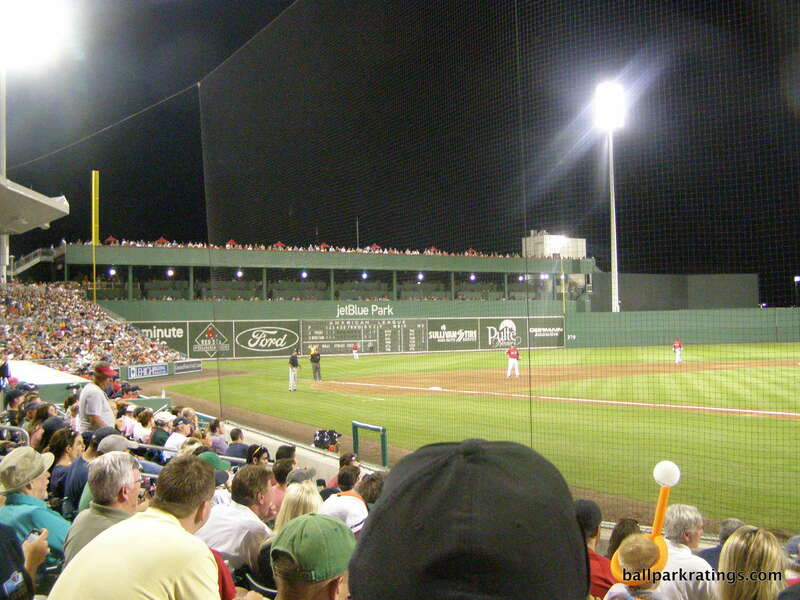 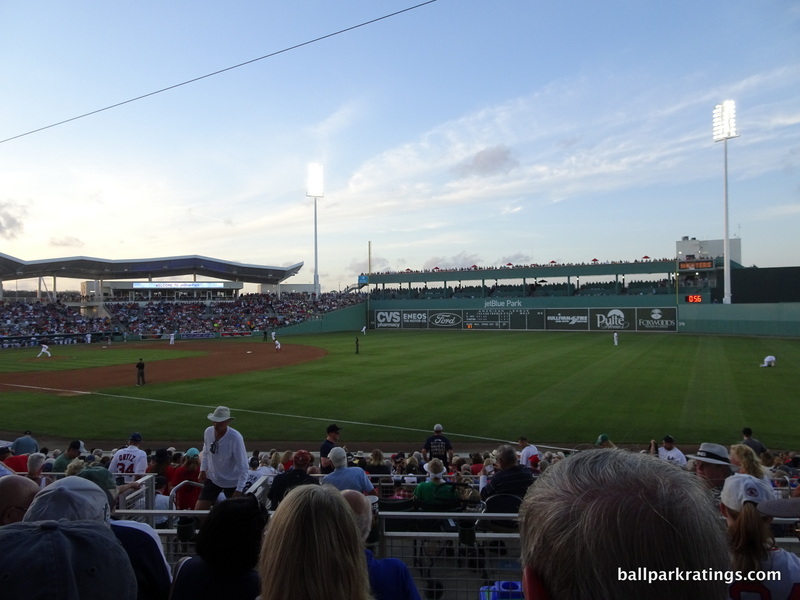 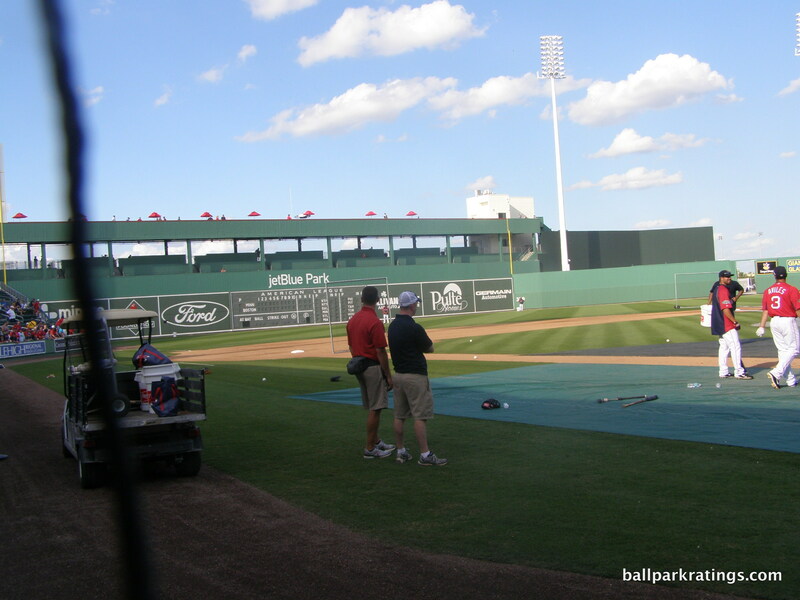 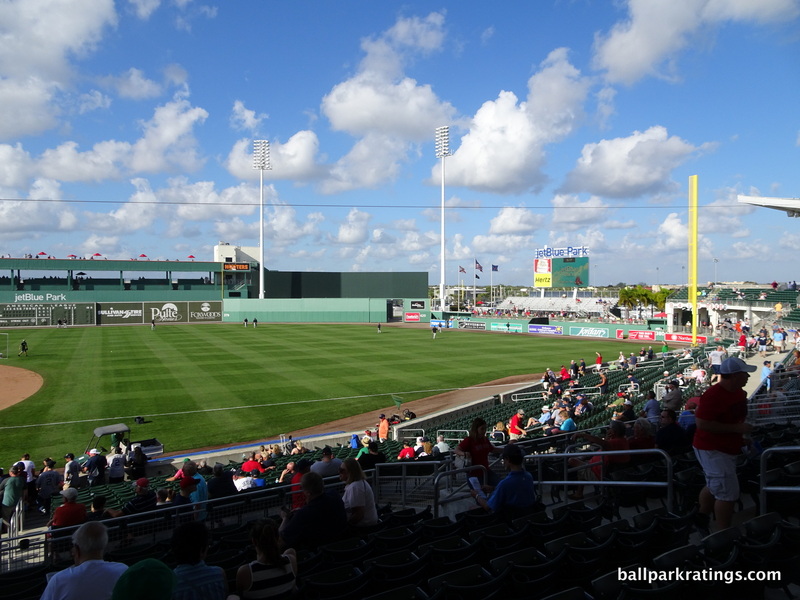 JetBlue Park at Fenway South. 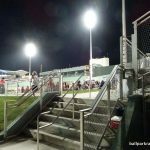 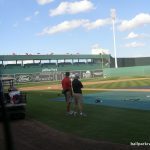 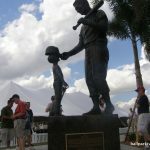 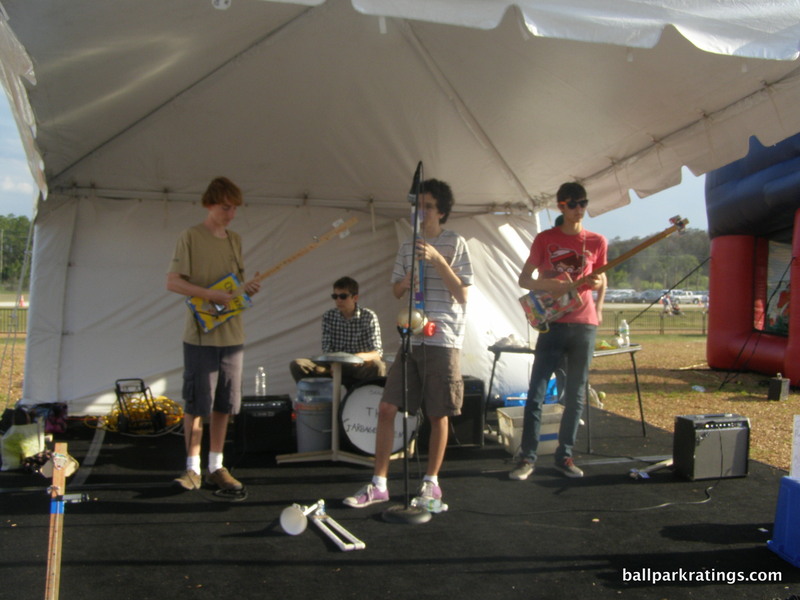 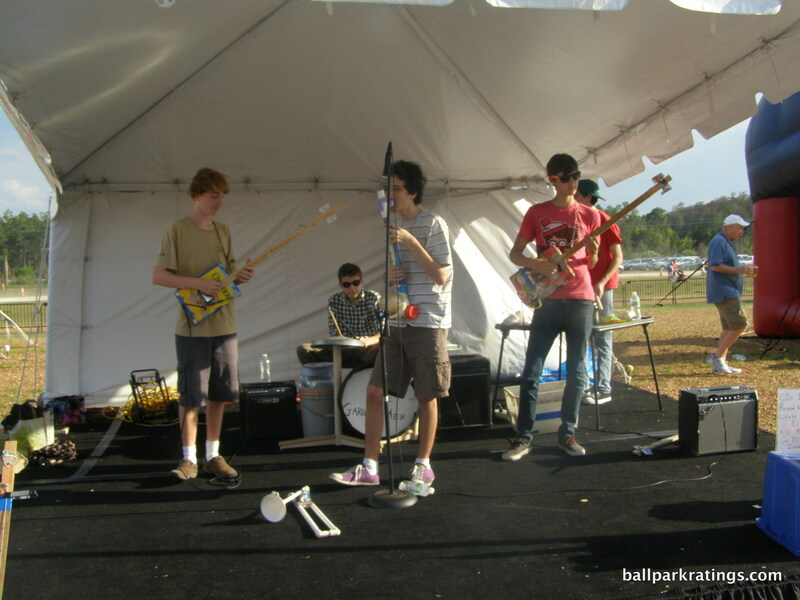 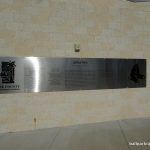 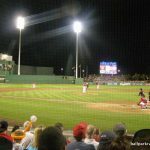 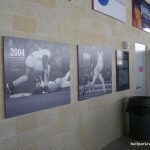 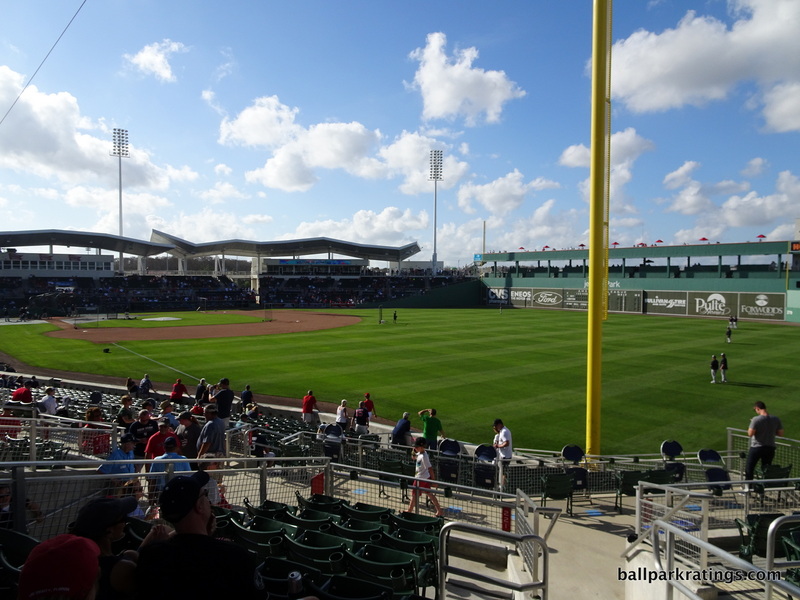 Reportedly attempting to create a facsimile of baseball’s most historic cathedral, JetBlue Park was perhaps the most hyped spring training opening of the 2010s, understandably so given such an exalted vision. 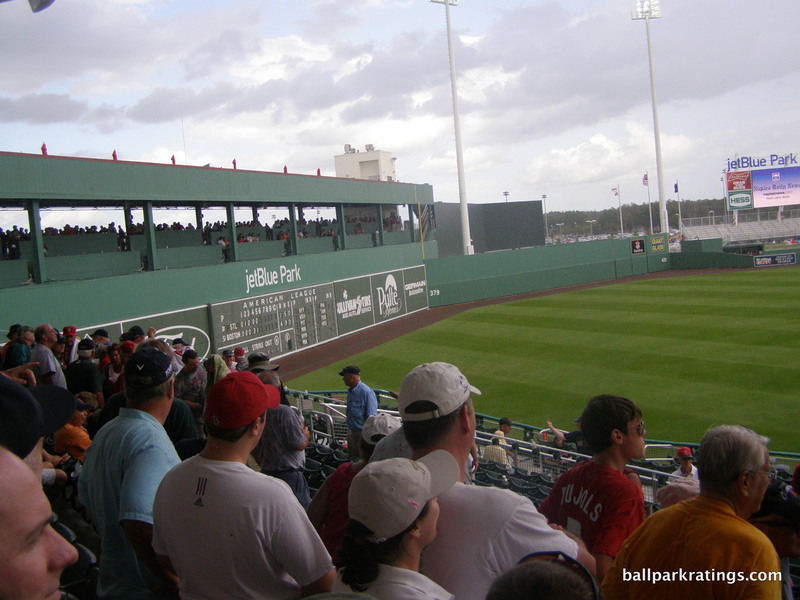 A re-creation of Fenway Park. 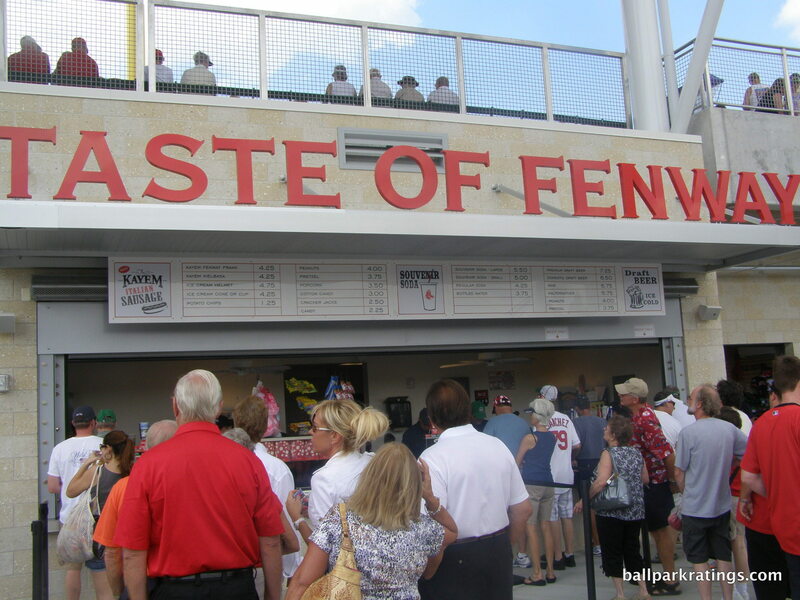 How were the Red Sox going pull that off given that Fenway’s true appeal is rooted in organically cultivated authenticity, not synthetically manufactured nostalgia? 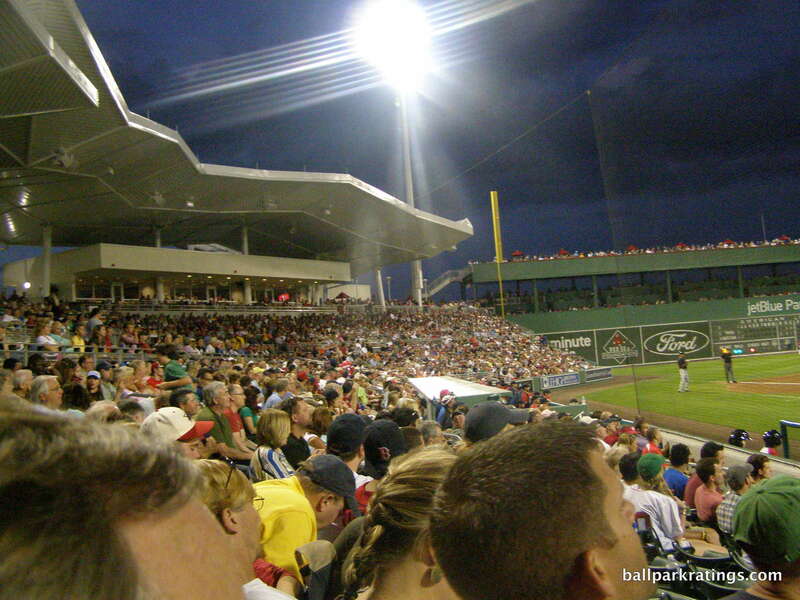 To that point, Florida’s Fenway is McKechnie Field (LECOM), an authentically historic venue. 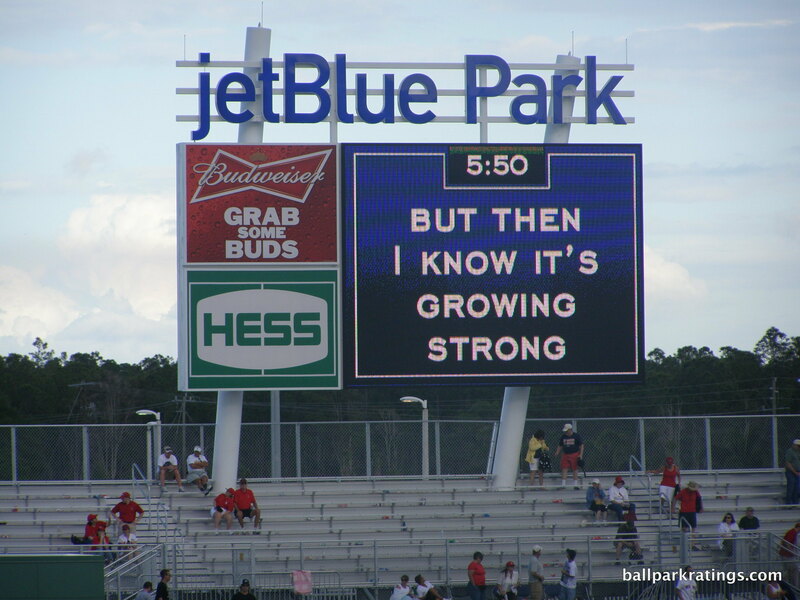 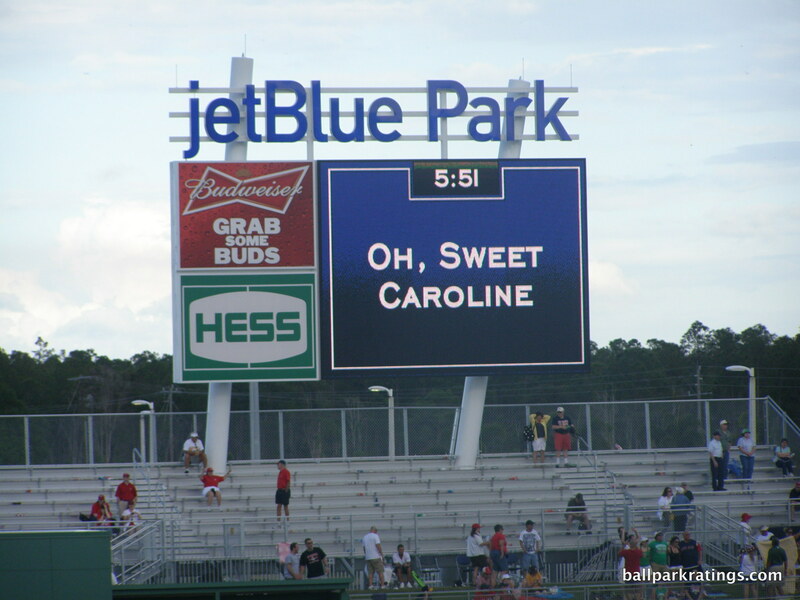 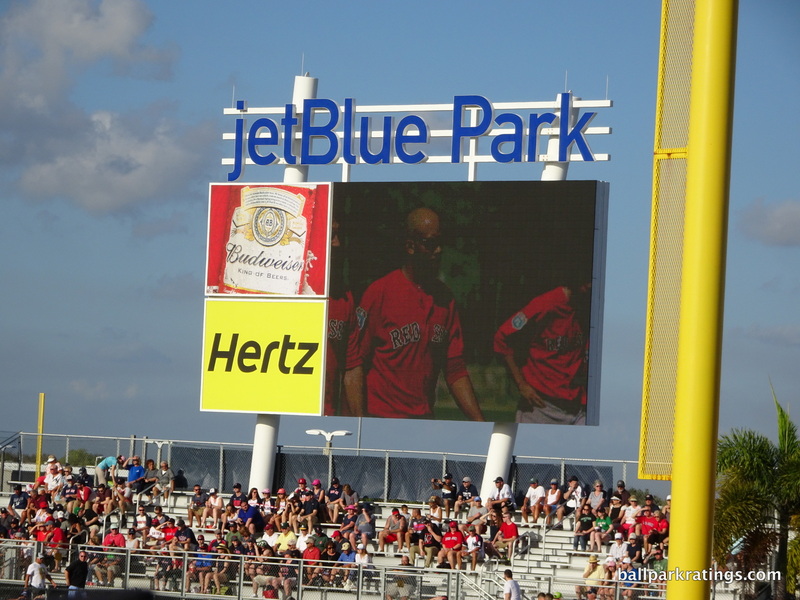 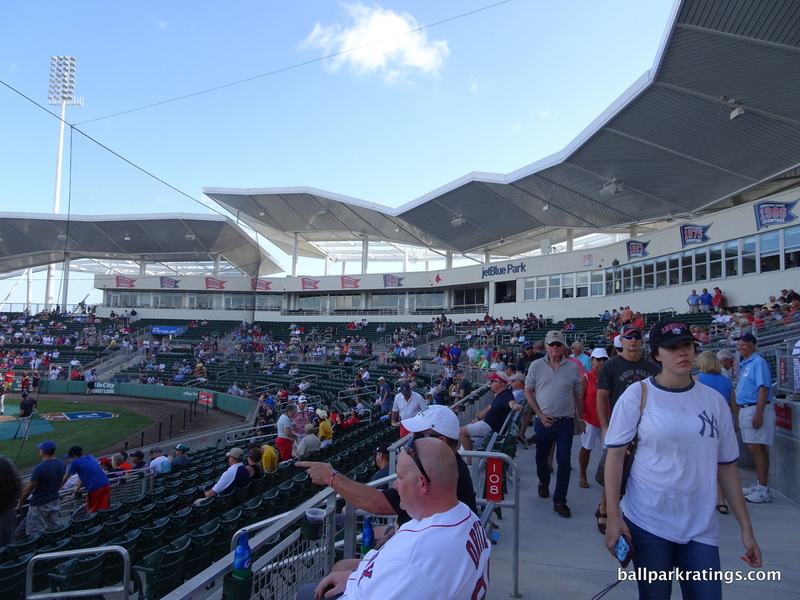 In the face of those misgivings, JetBlue Park couldn’t engage in mere mimicry. 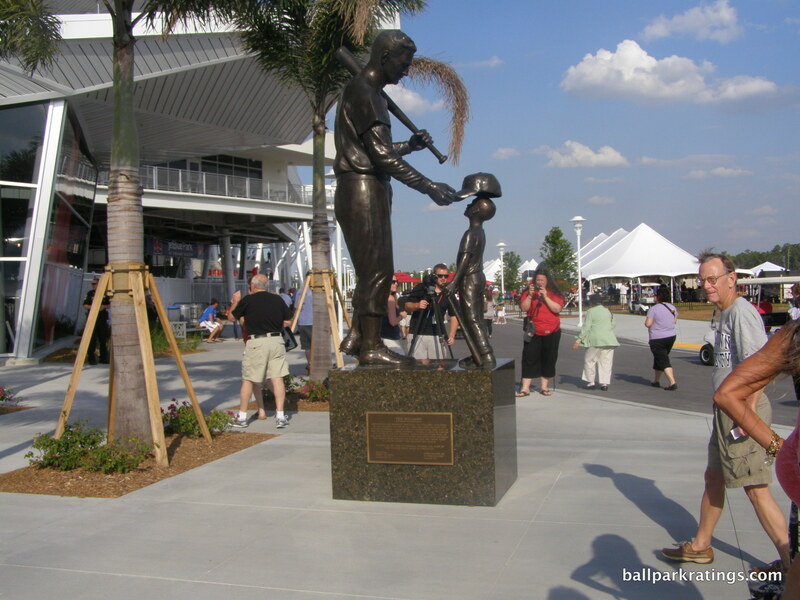 Luckily, this is no exact copy. 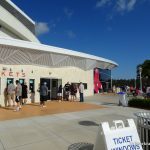 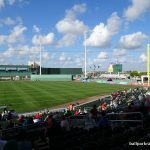 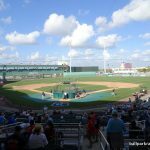 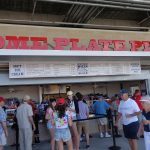 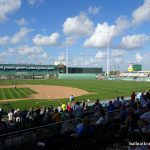 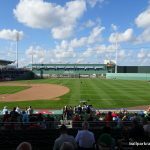 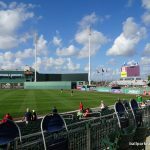 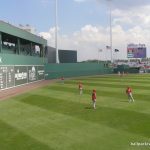 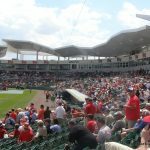 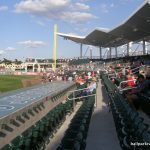 Fenway South is ultimately successful by forgoing its own identity, building a ballpark with an architectural style that is authentically Floridian and tastefully fusing it with features that remind fans of home. 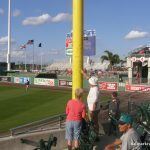 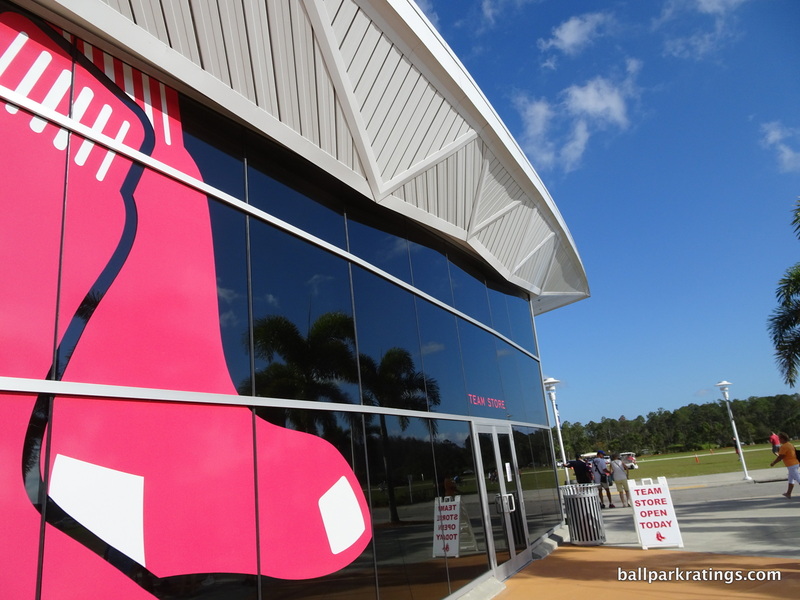 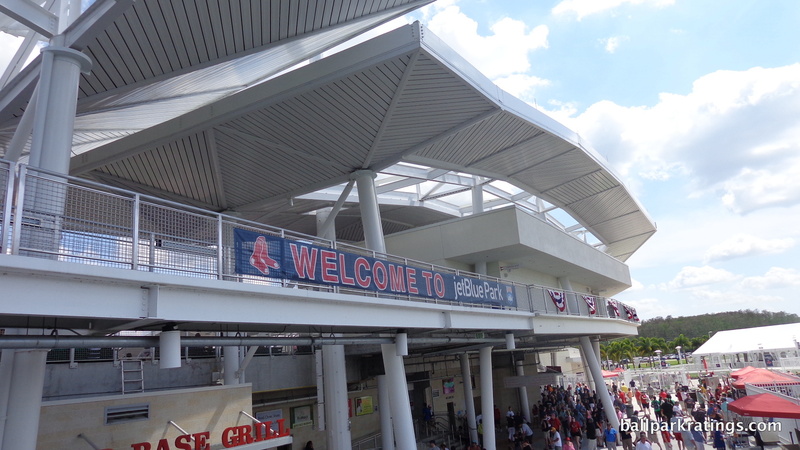 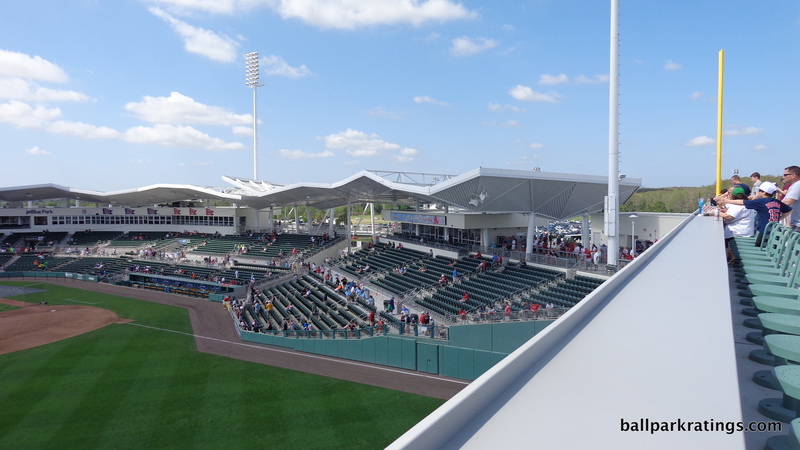 JetBlue Park does all that—it has the Monster, the dimensions, Pesky’s Pole, and much more—but it’s ultimately defined by its own elevated aesthetic concepts recalling the local landscape. 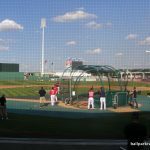 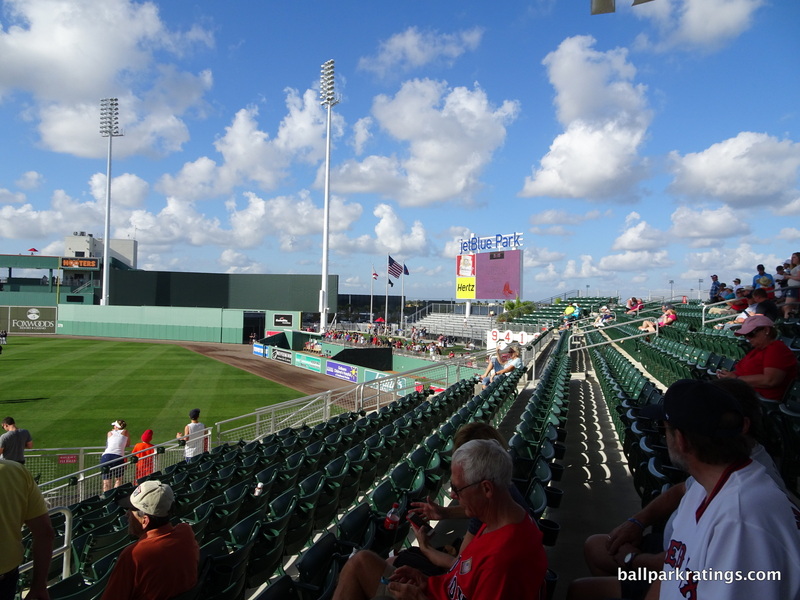 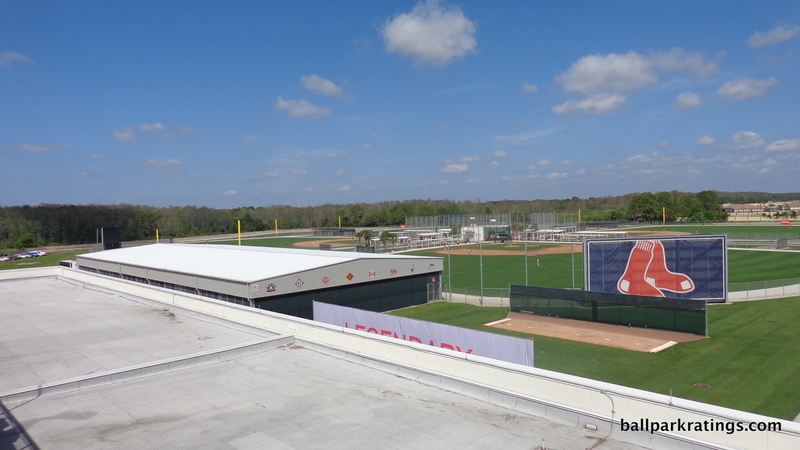 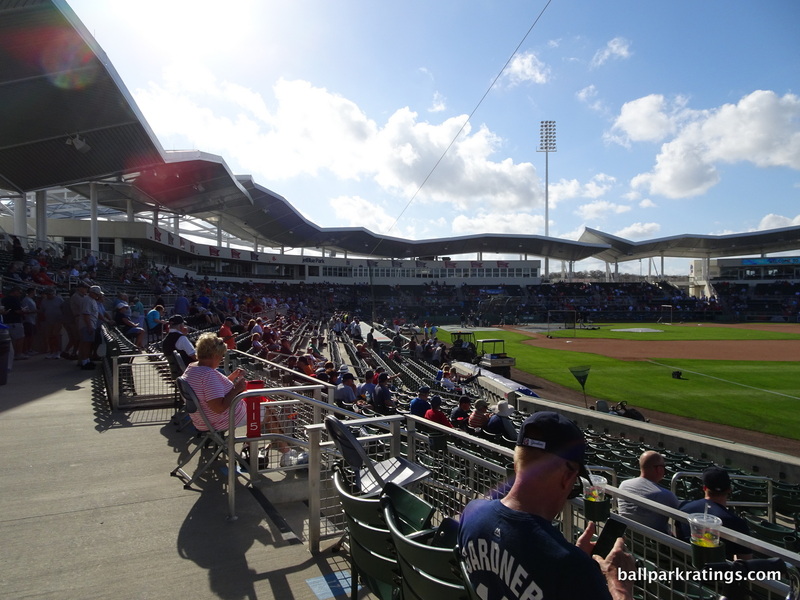 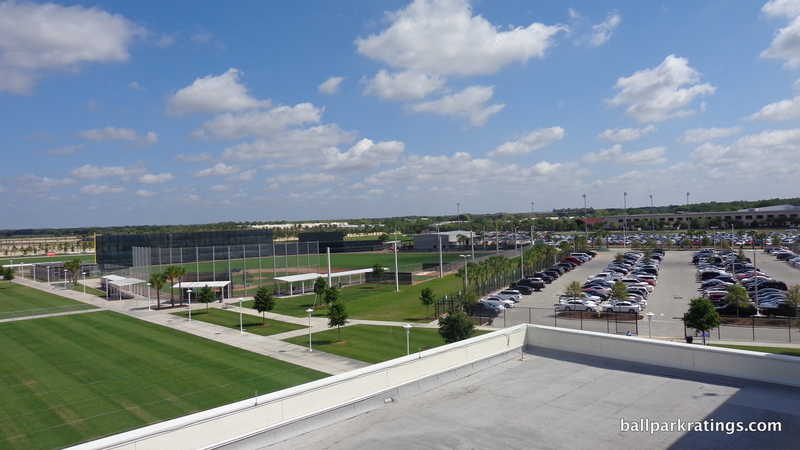 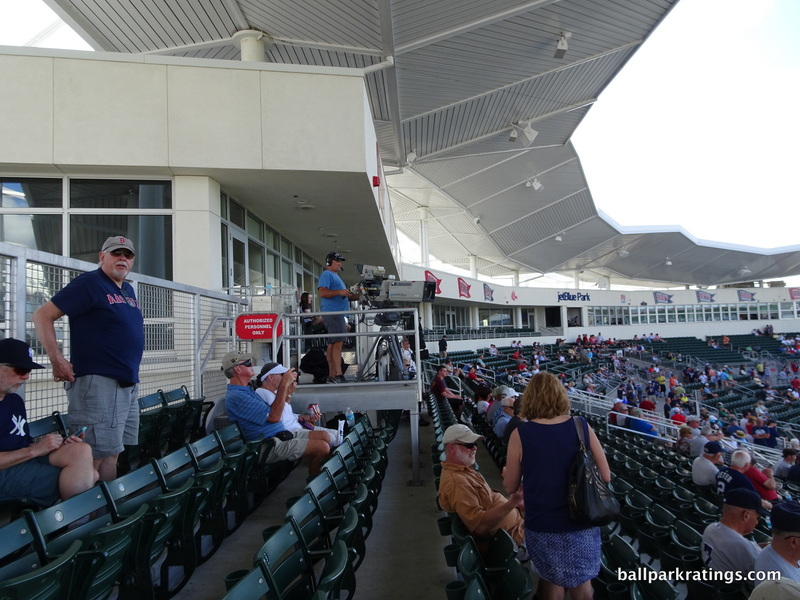 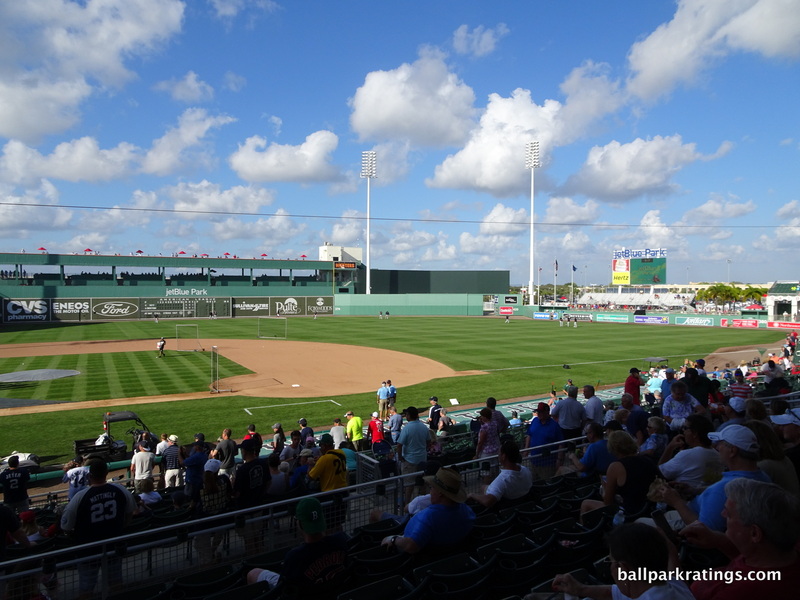 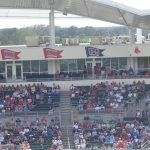 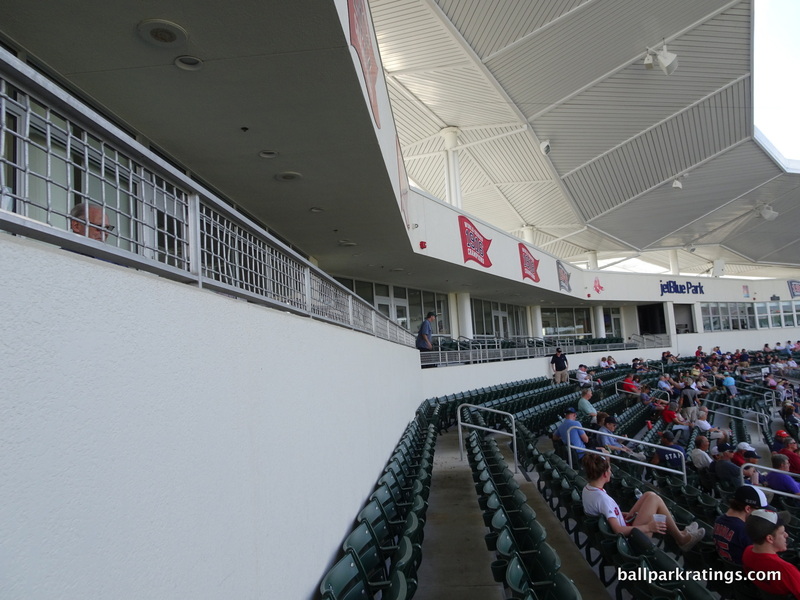 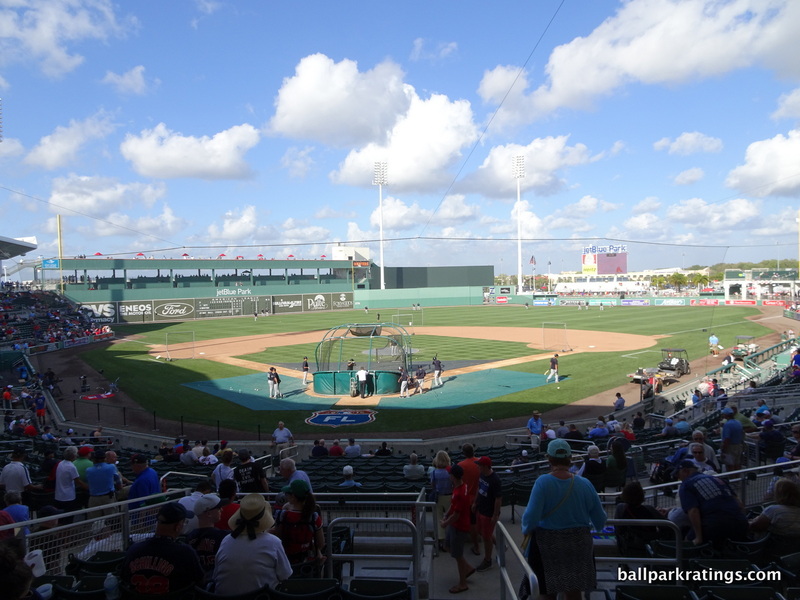 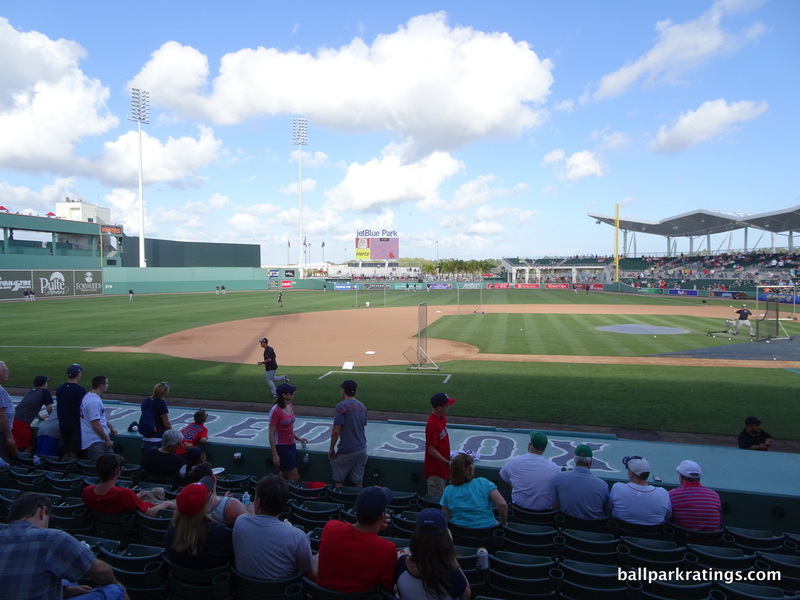 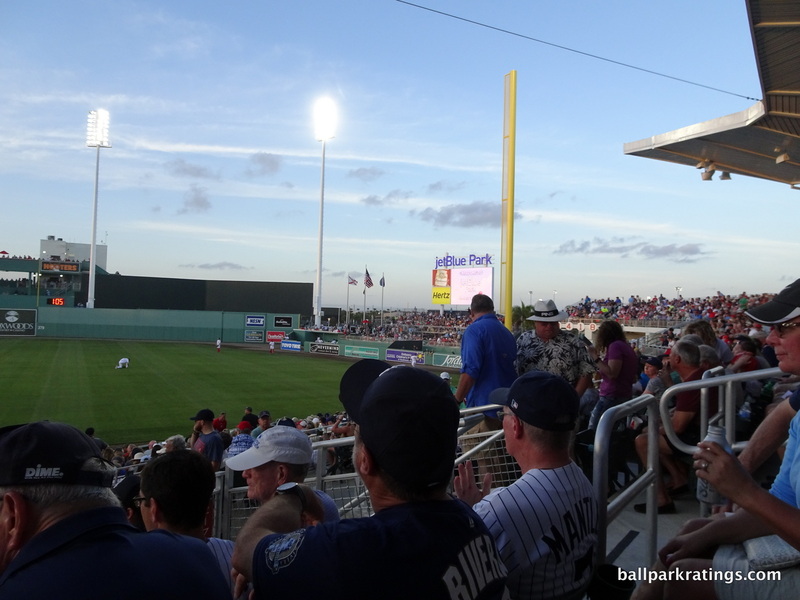 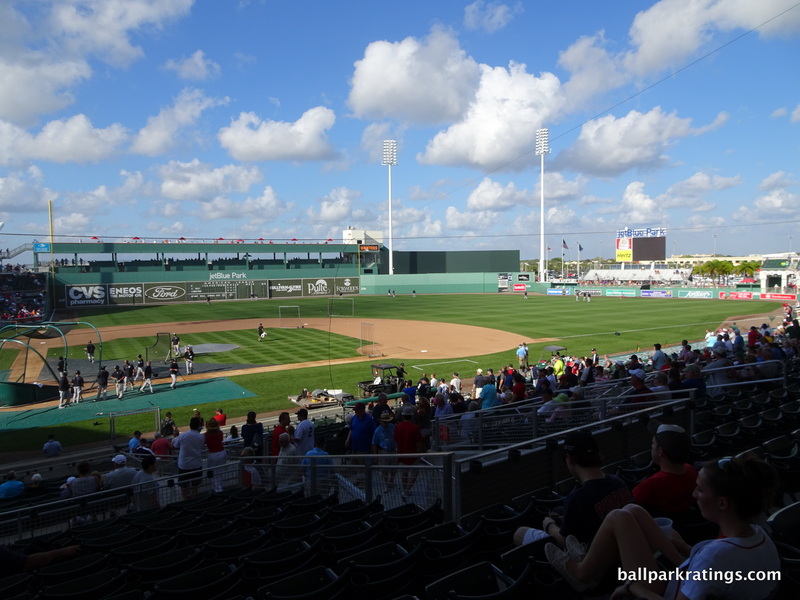 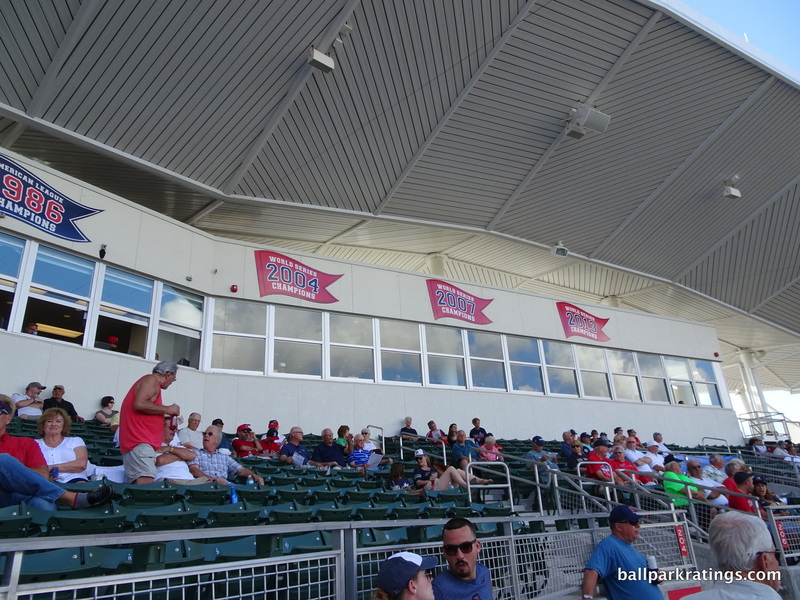 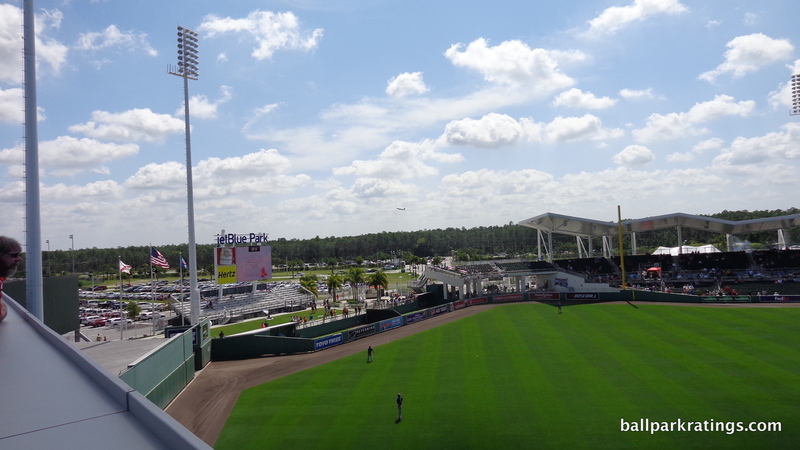 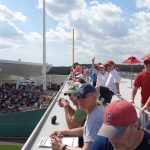 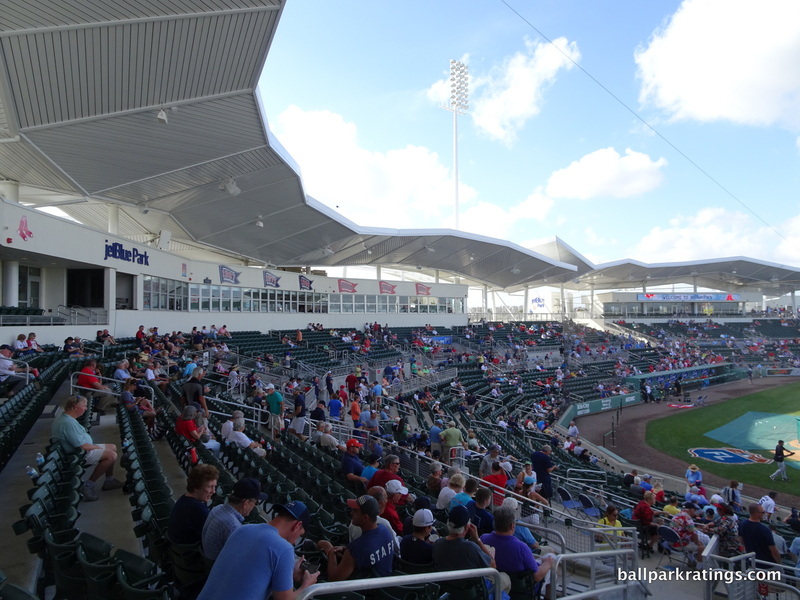 I have JetBlue Park a hair short of other great spring training ballparks, and fully separated from the tier of outstanding ones, because it lacks some of the key features of a state-of-the-art spring venue. 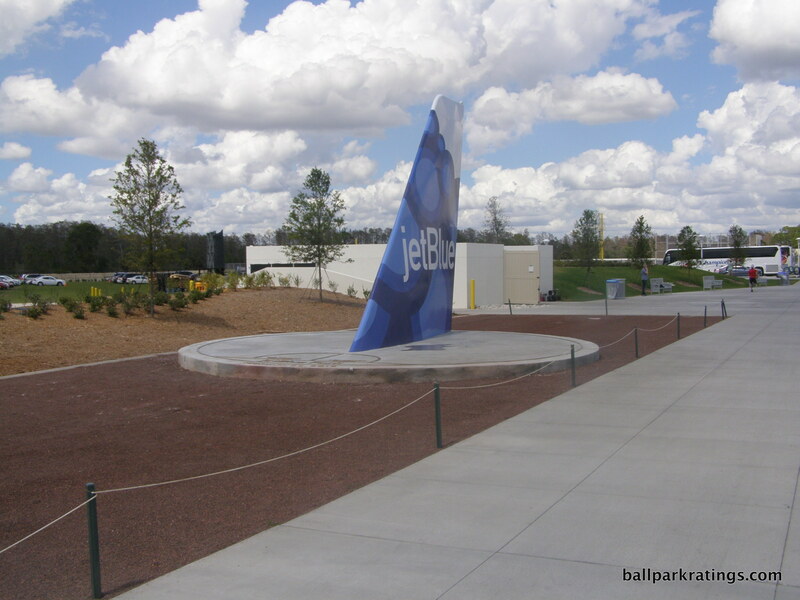 Perhaps understandable for a 1912 emulation, the park does not have an open, 360-degree concourse, and JetBlue is missing some amenities. 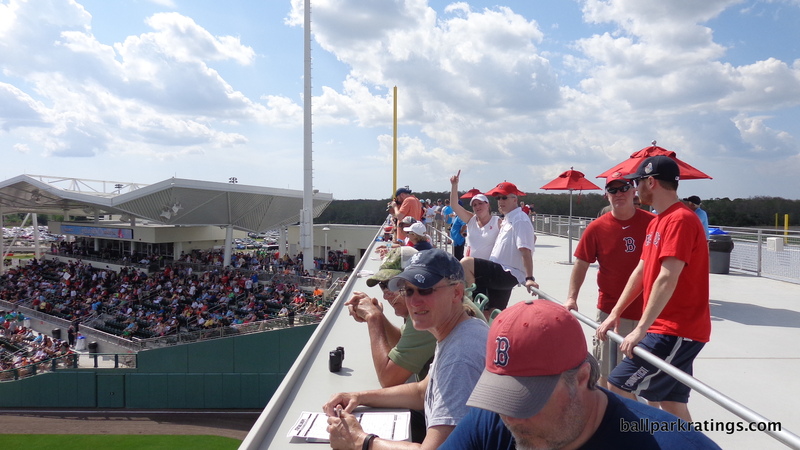 But overall, the Red Sox and Ft. Myers have exceeded my expectations by building something that feels real. 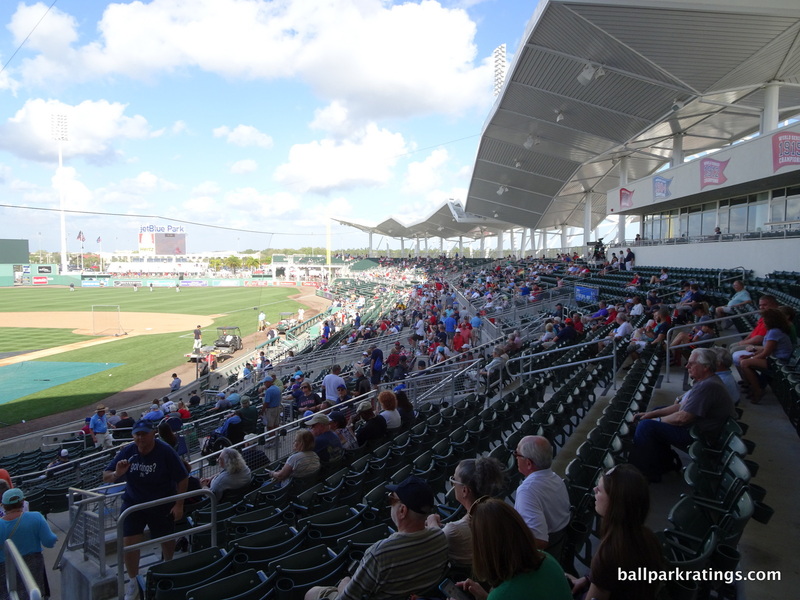 The park’s isolated setting demonstrably falls short of that of its regular season counterpart. 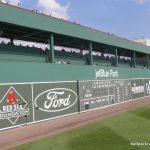 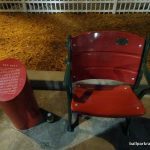 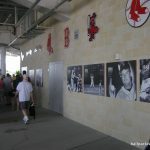 Fenway resonates in part because of its relationship to the neighborhood, something that is totally lacking at JetBlue. 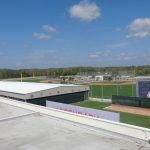 Located on the east side of Interstate 75 off Daniels Parkway, the Red Sox aim to develop this land into a mixed-use development community. 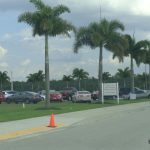 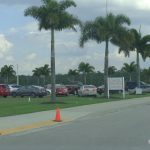 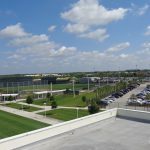 The location is currently most notable for its proximity to the Fort Myers’ airport. 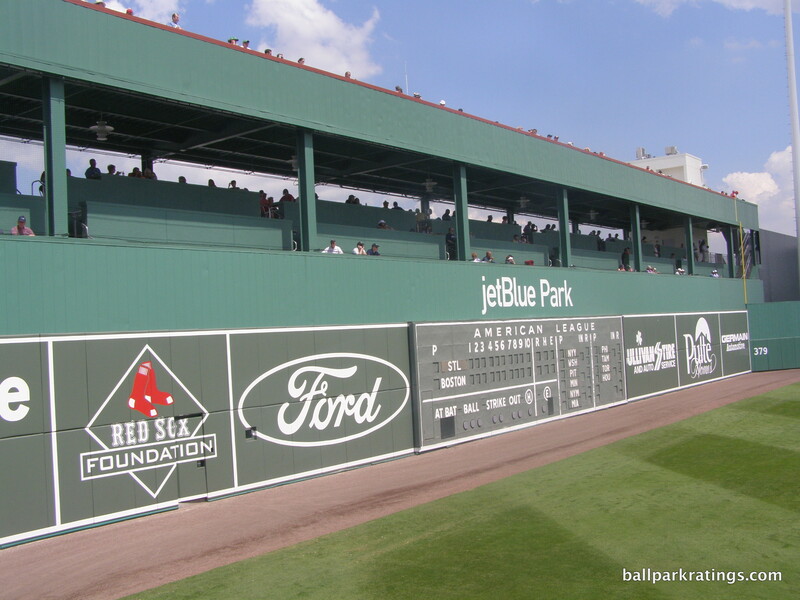 Future development isn’t paramount to JetBlue’s entire appeal like the situation in Goodyear, AZ, but the disparity from Fenway Park is striking. 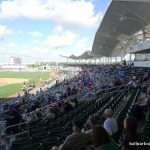 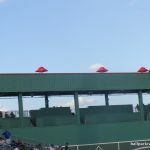 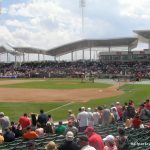 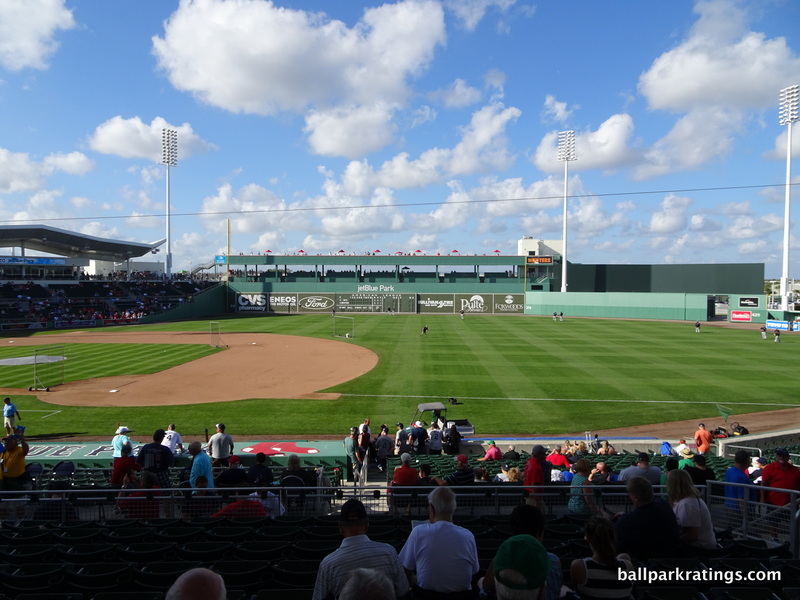 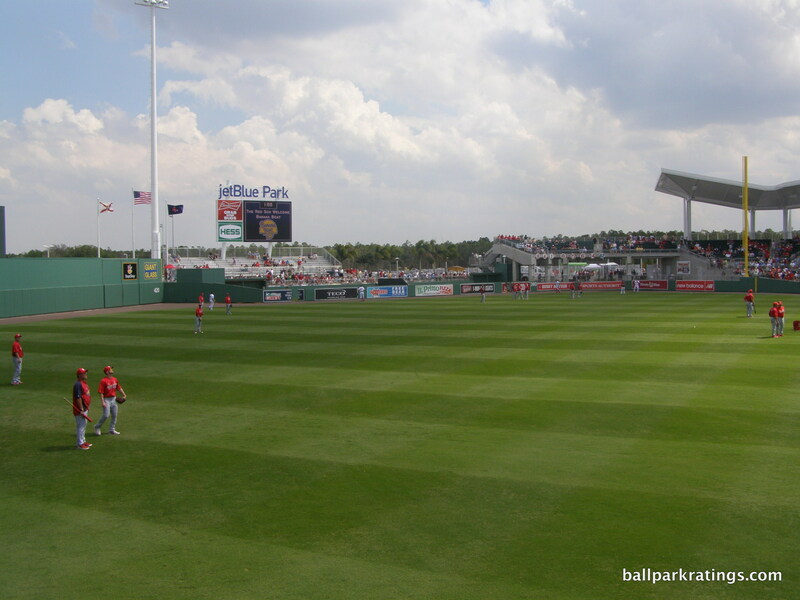 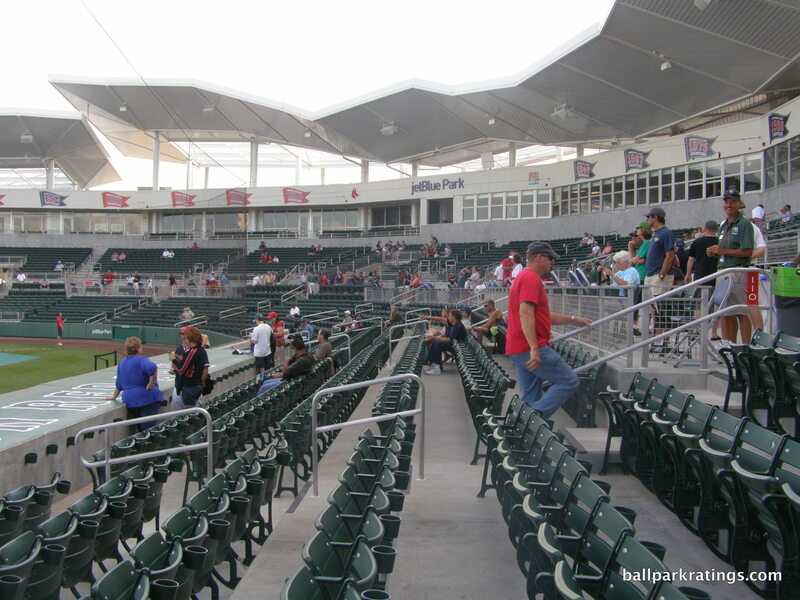 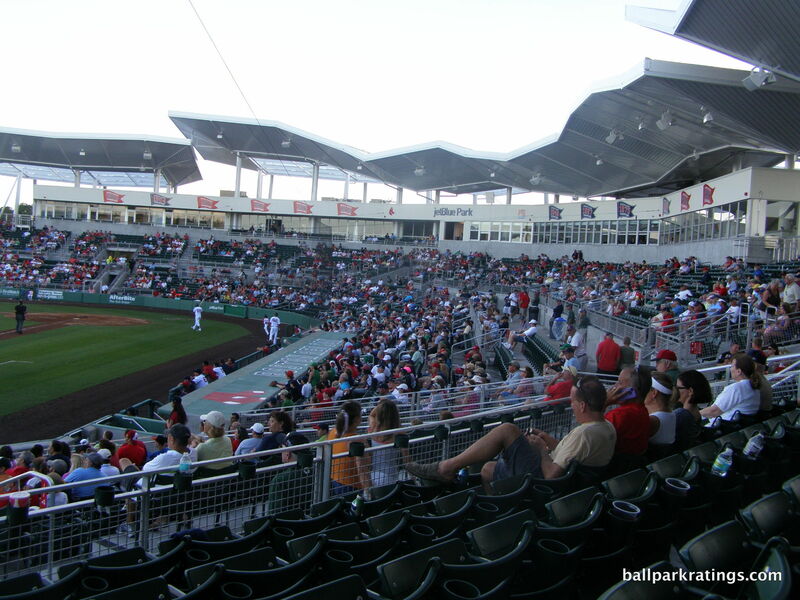 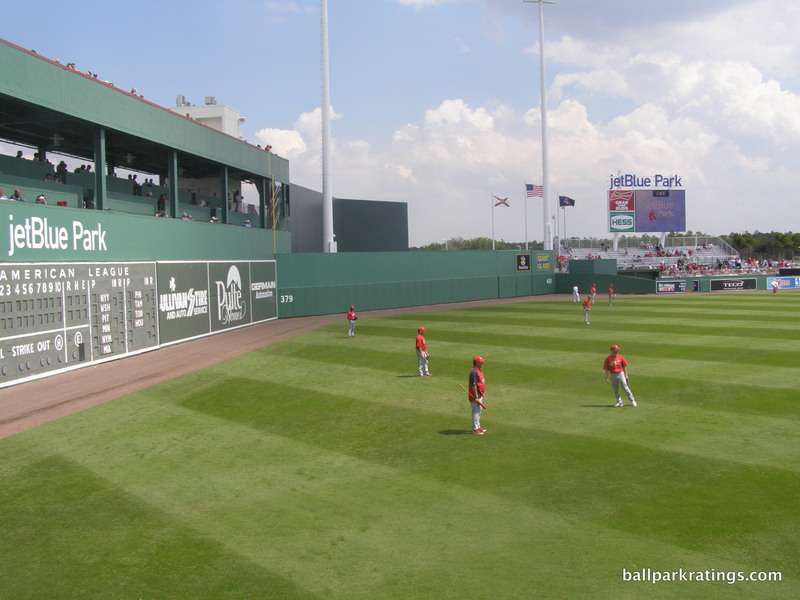 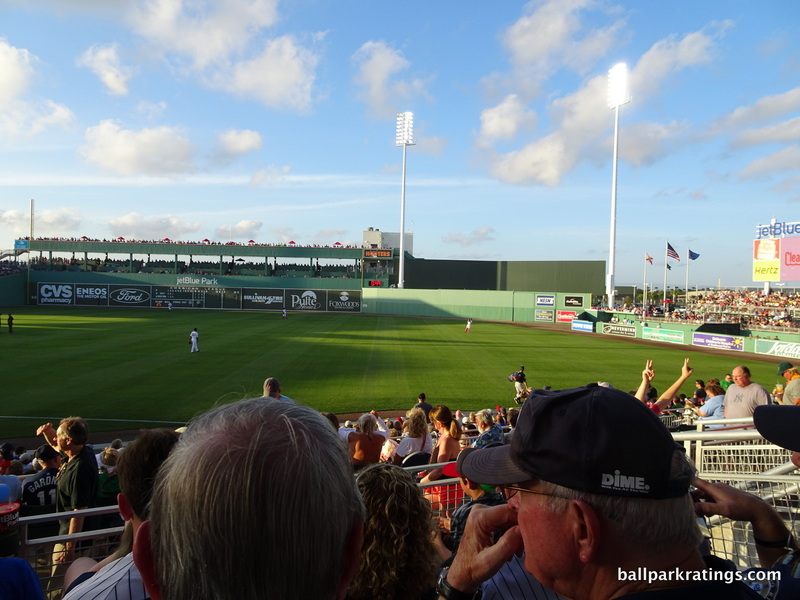 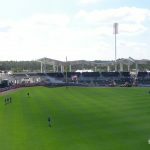 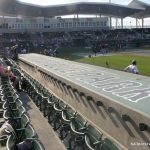 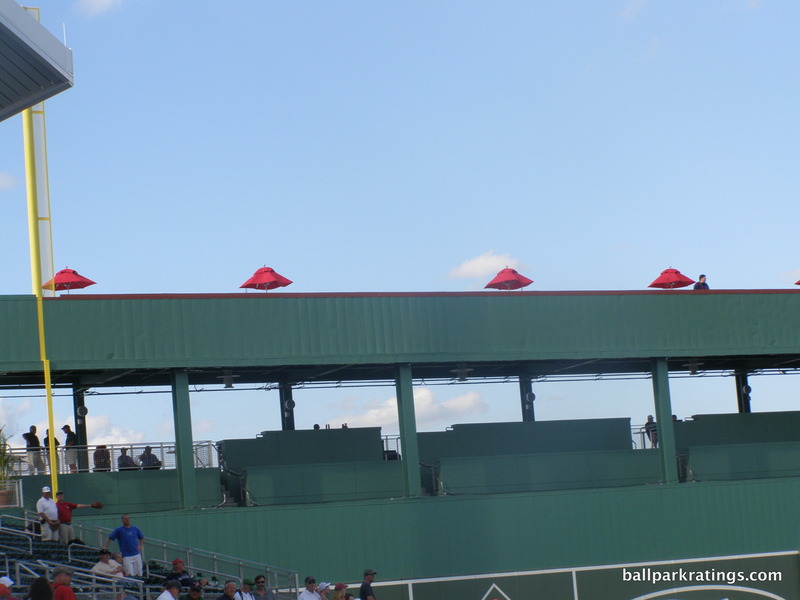 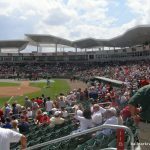 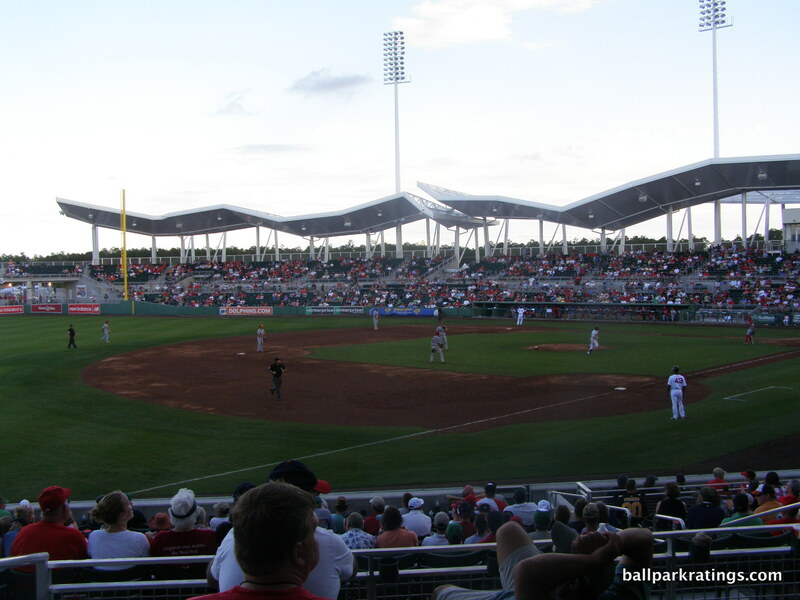 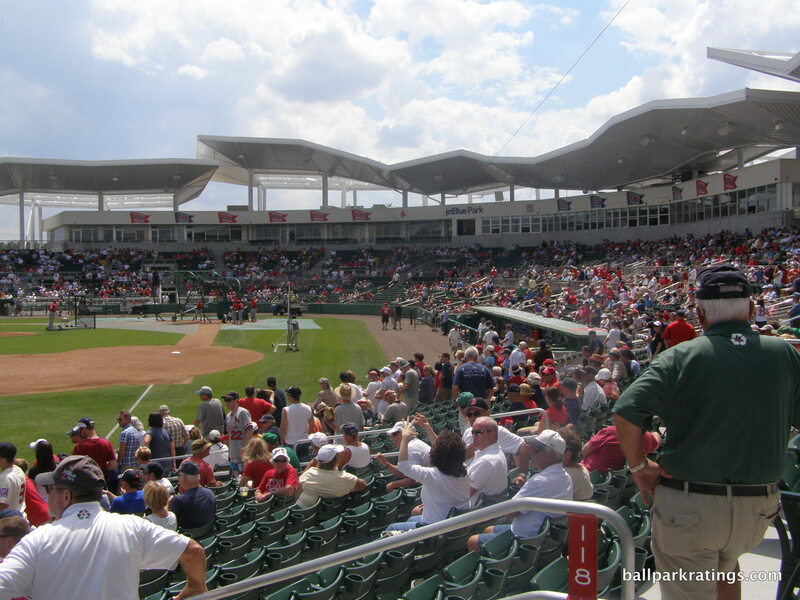 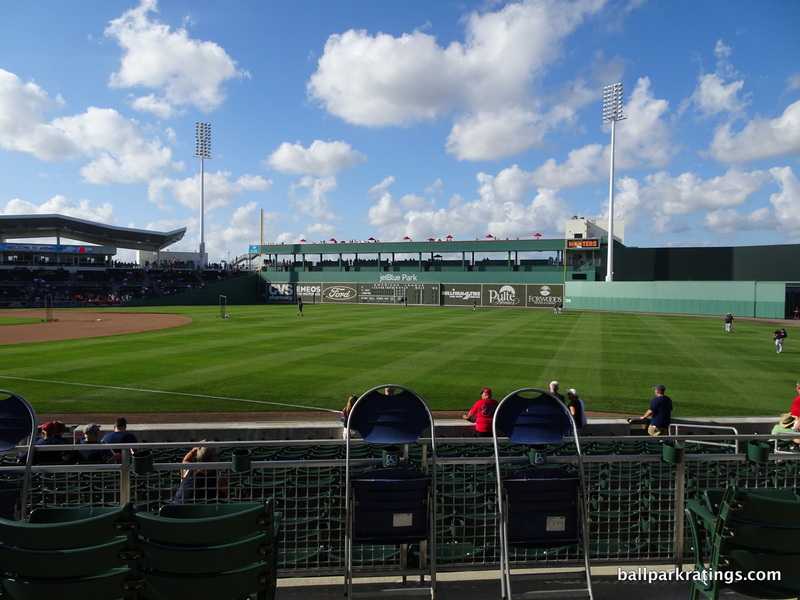 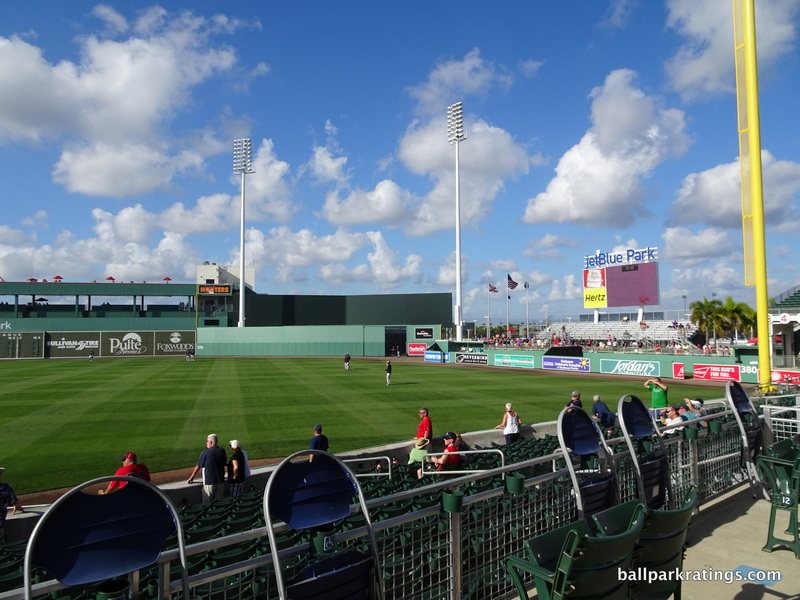 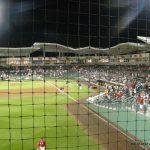 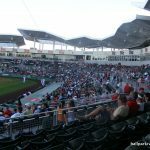 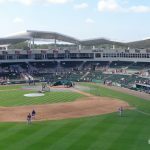 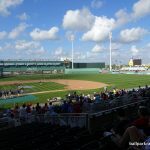 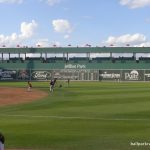 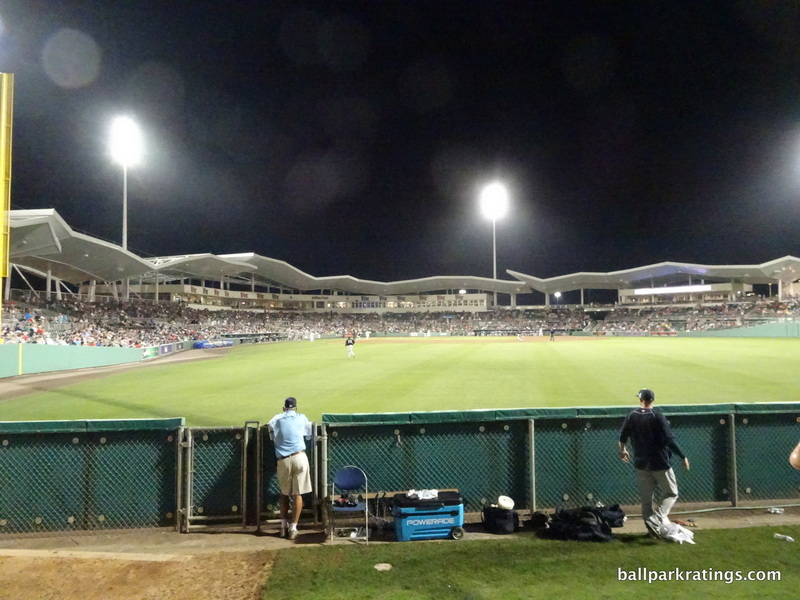 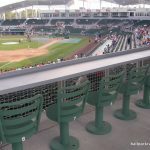 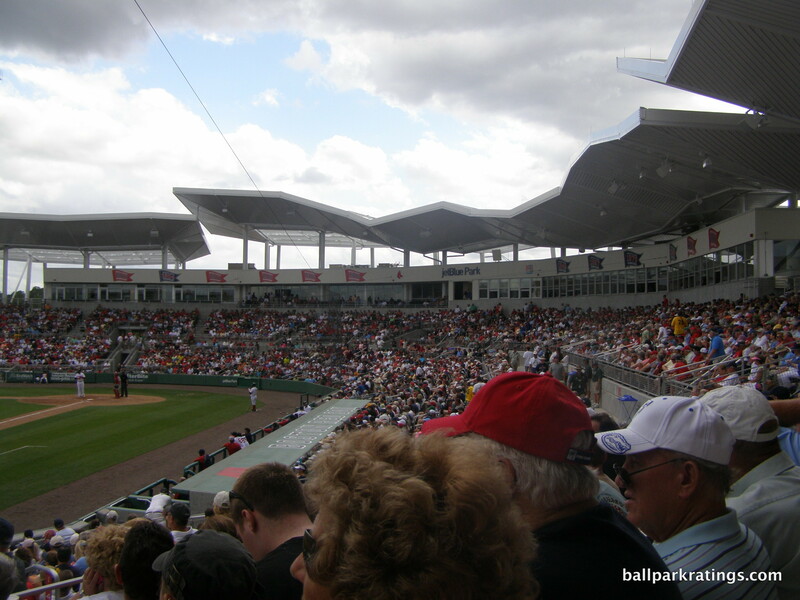 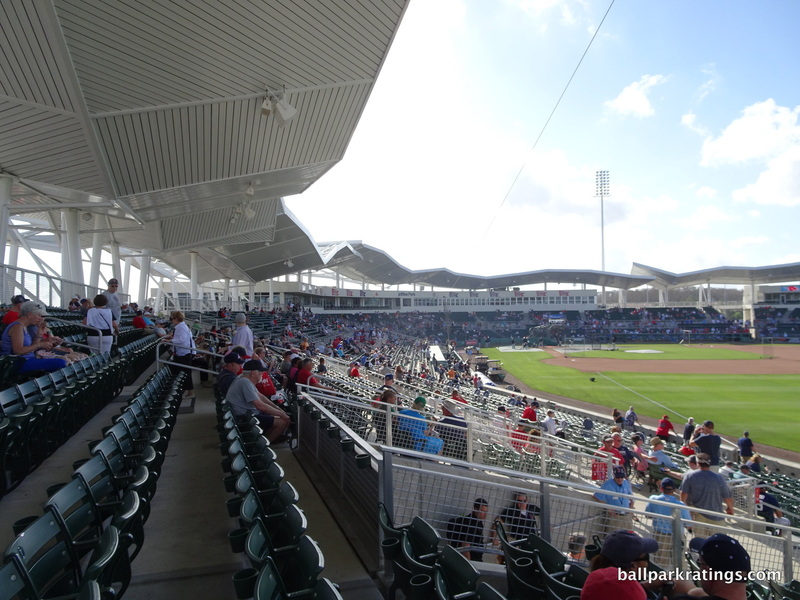 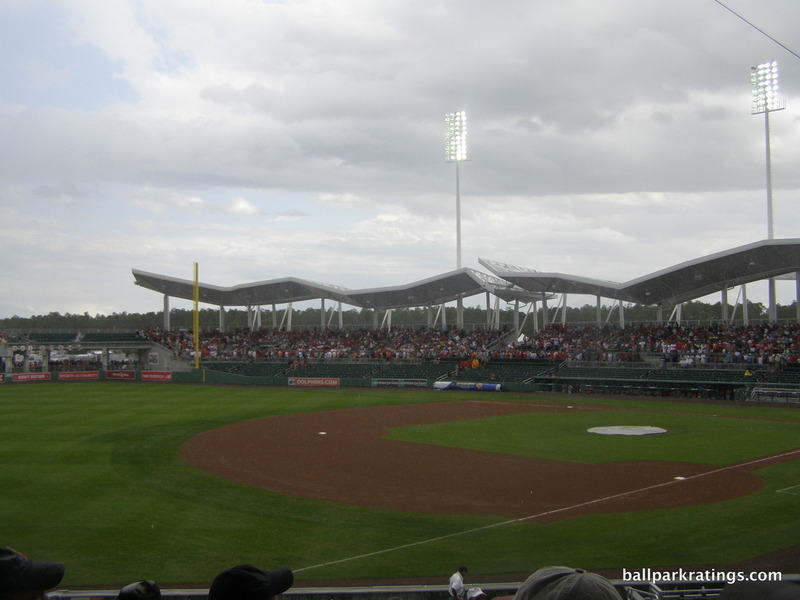 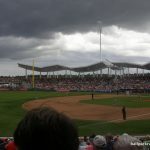 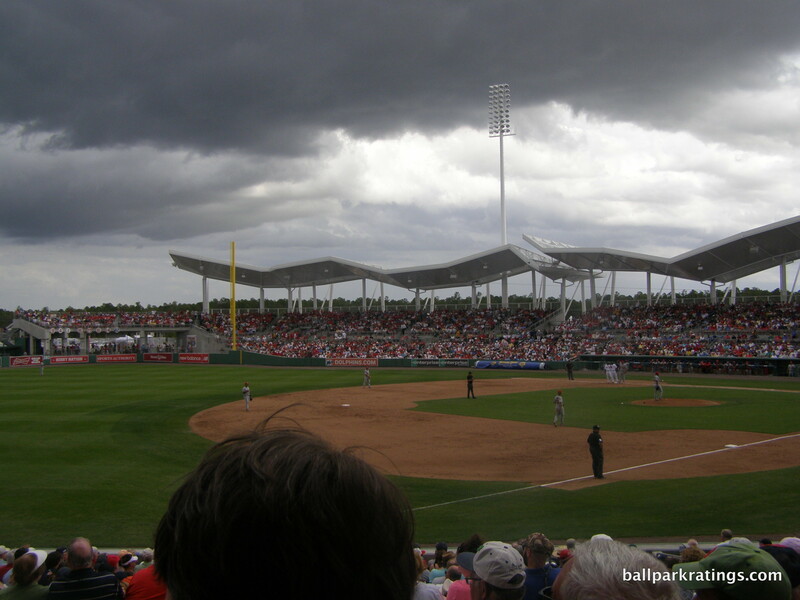 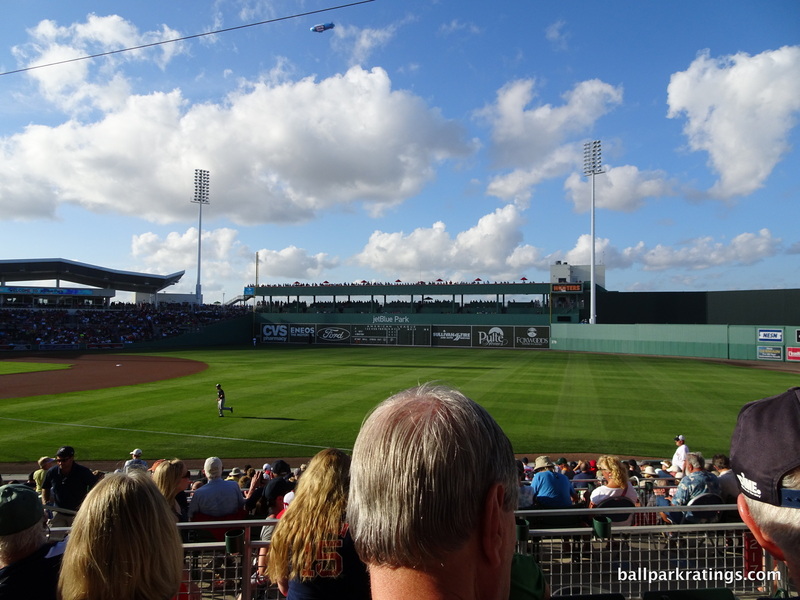 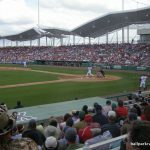 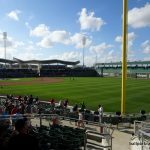 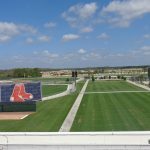 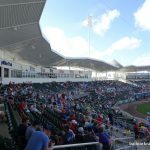 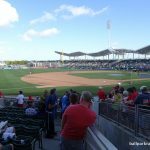 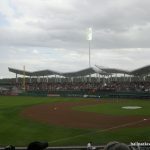 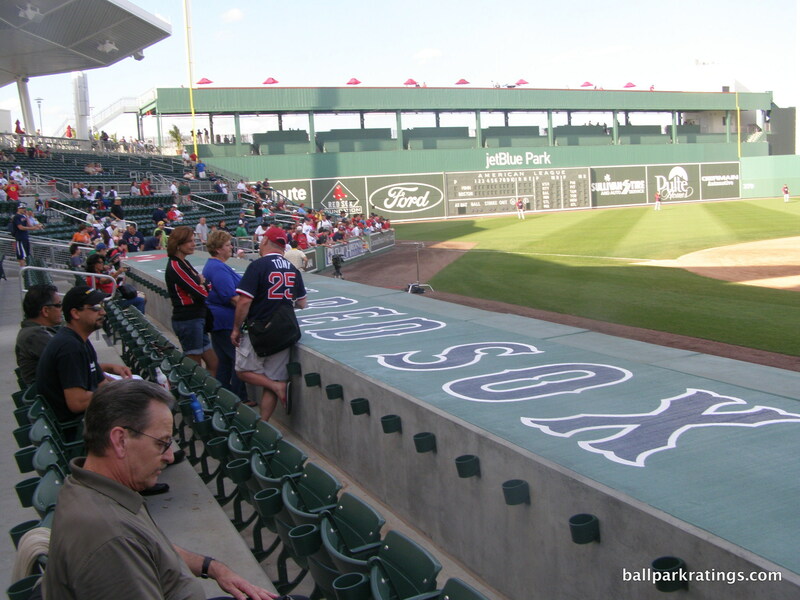 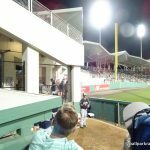 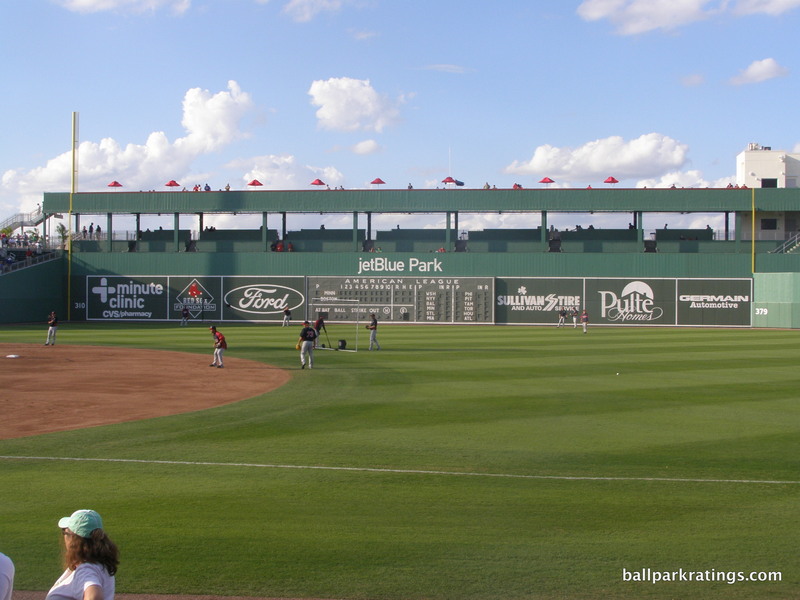 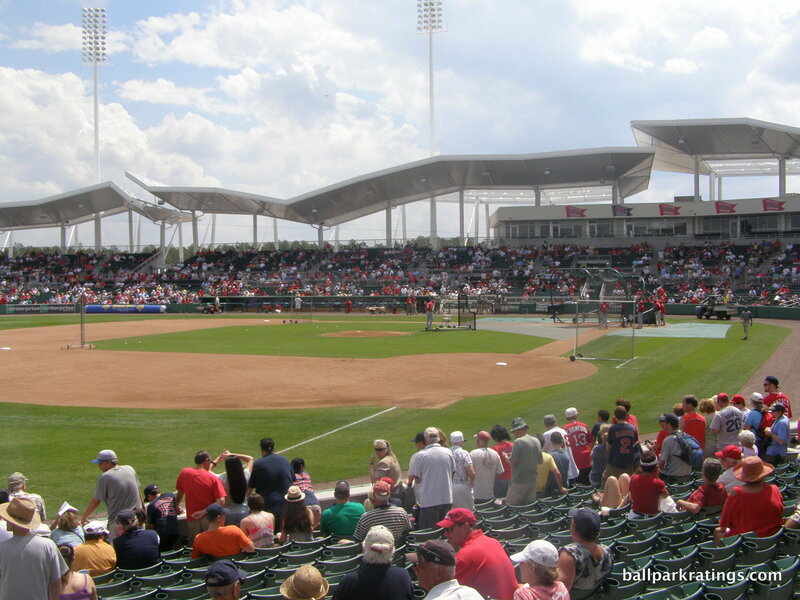 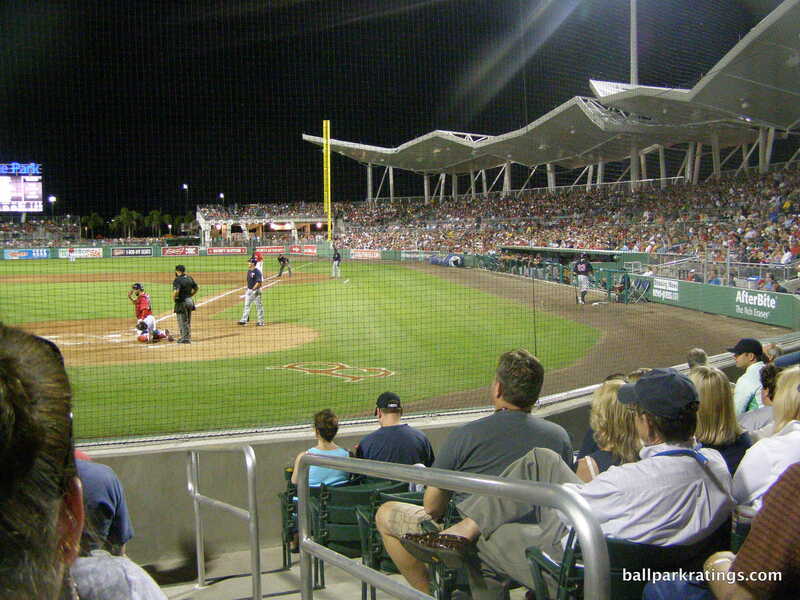 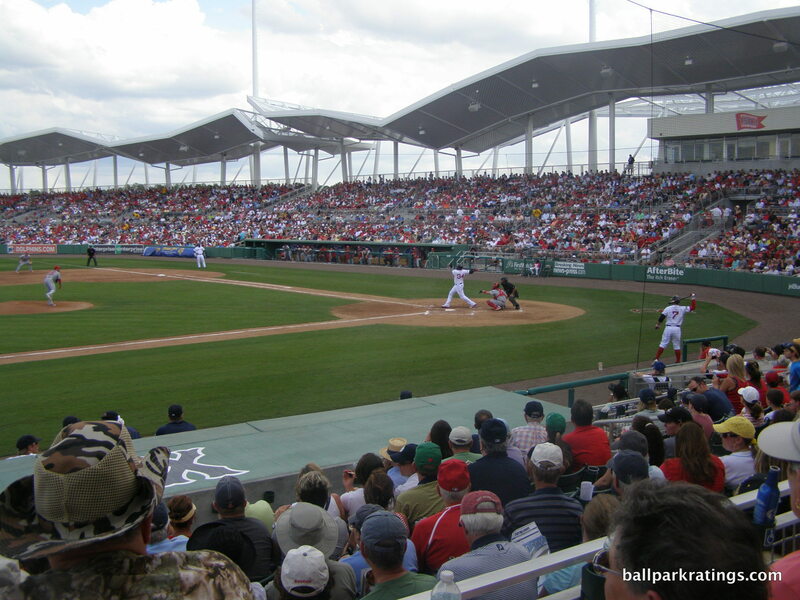 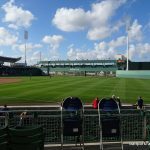 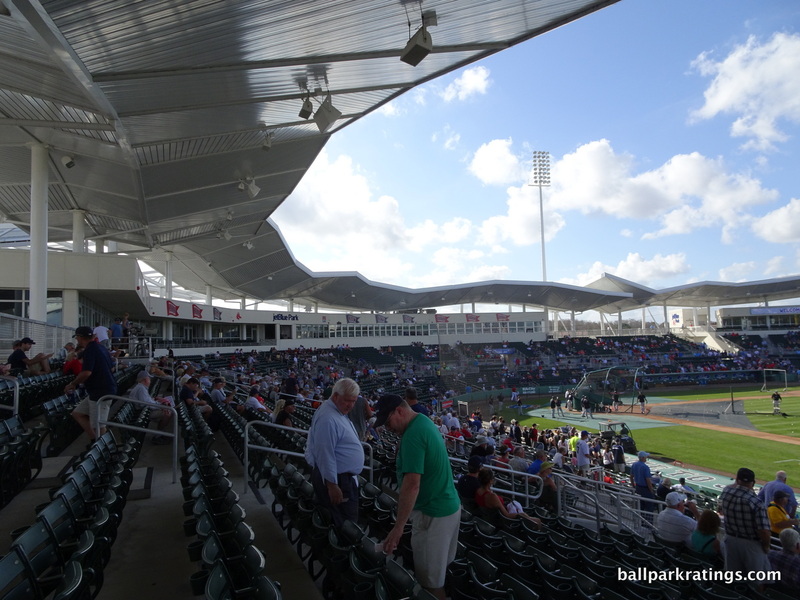 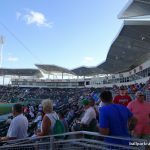 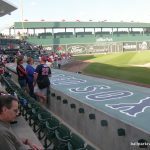 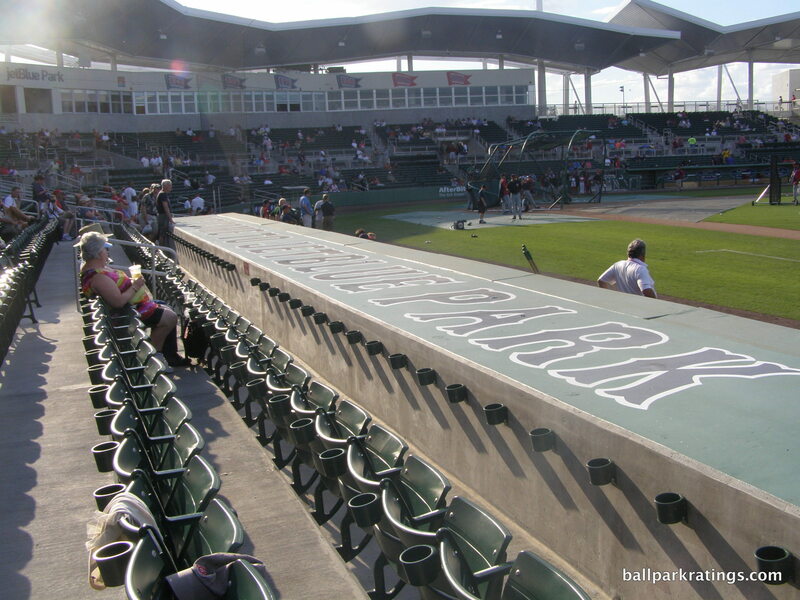 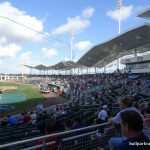 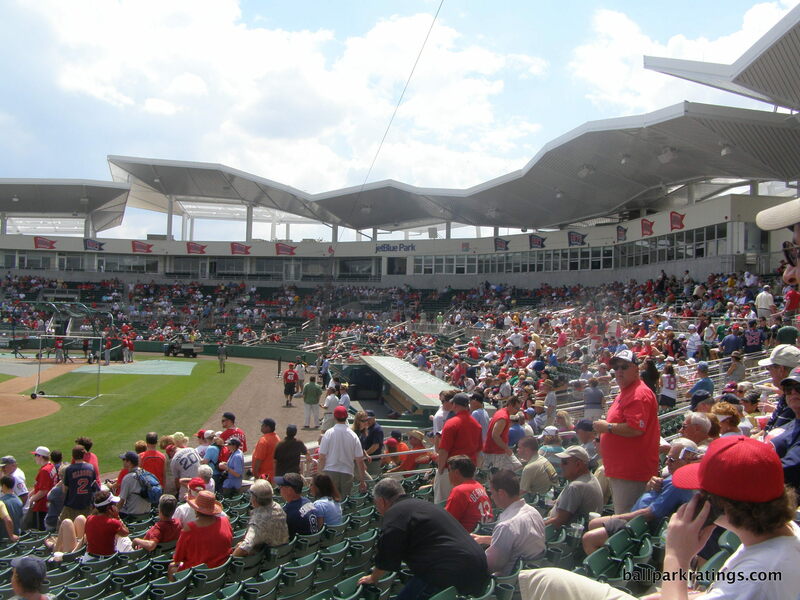 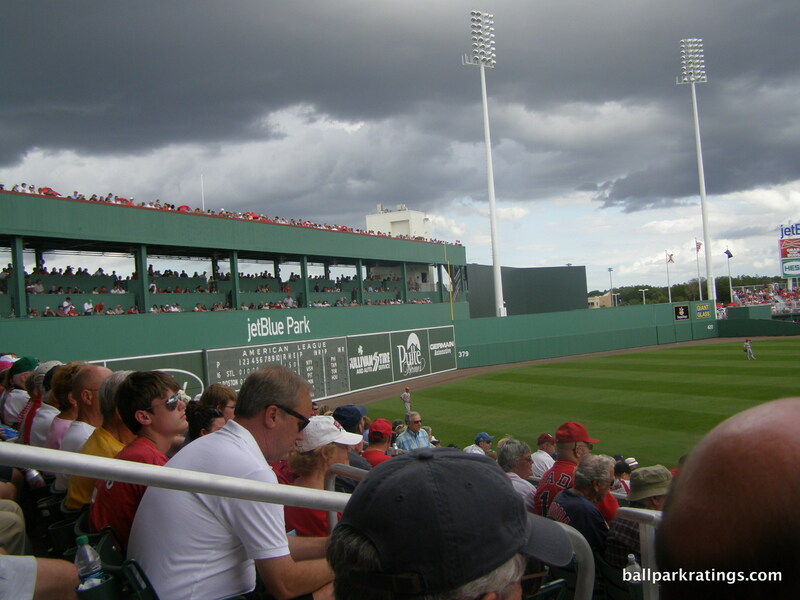 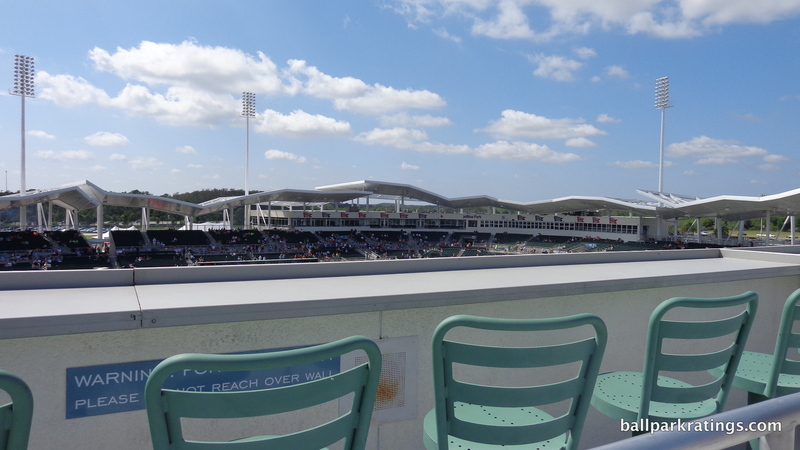 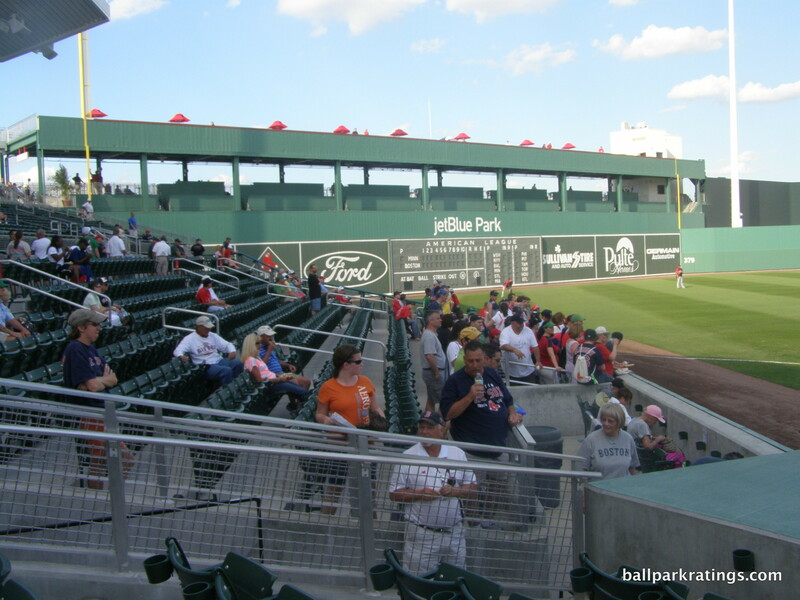 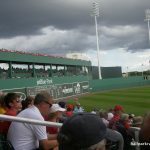 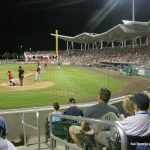 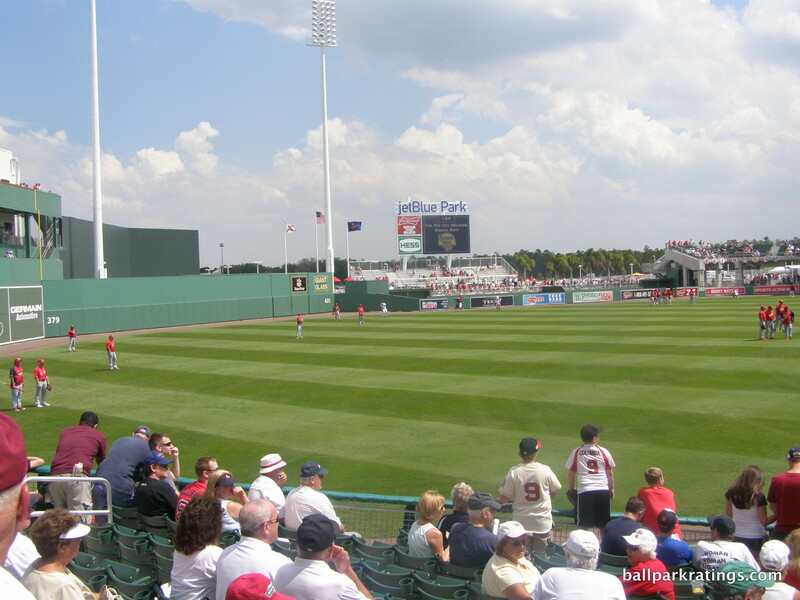 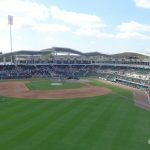 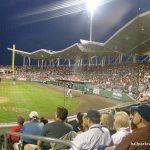 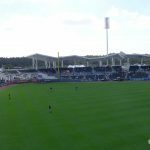 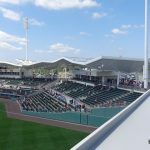 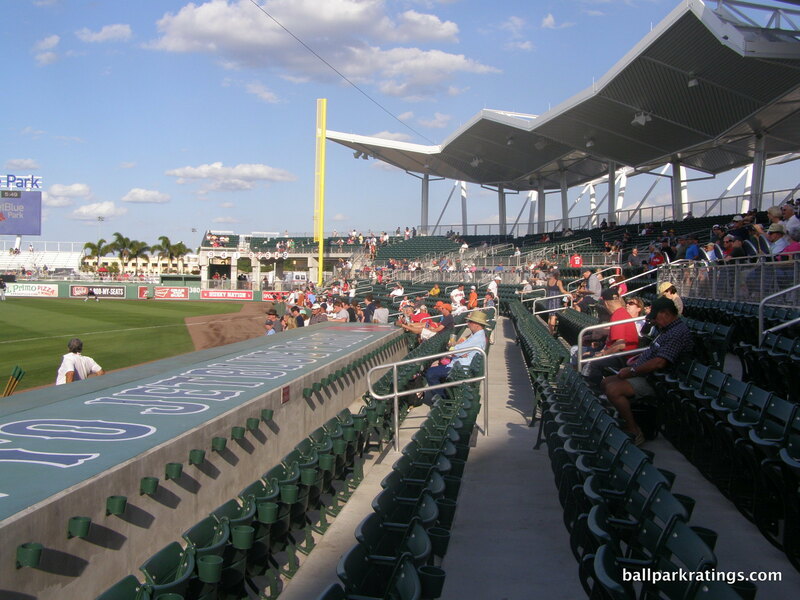 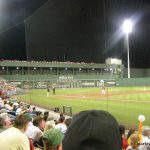 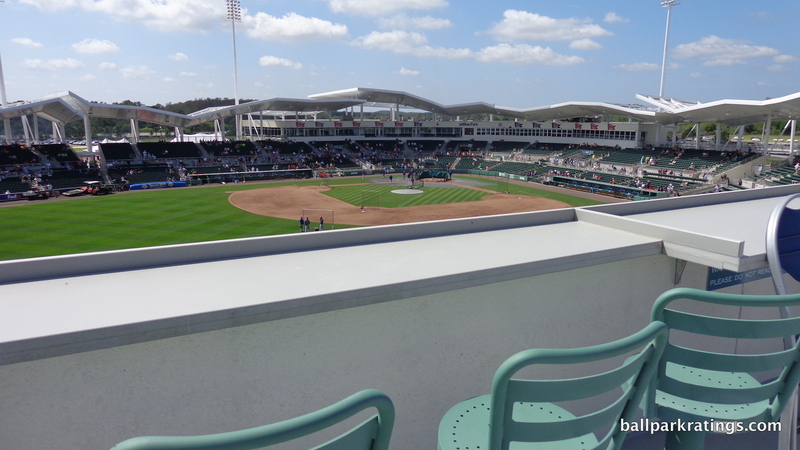 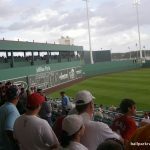 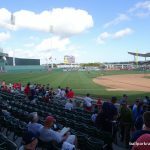 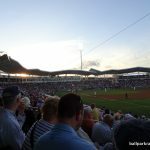 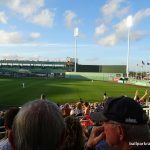 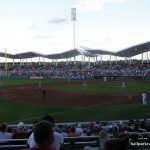 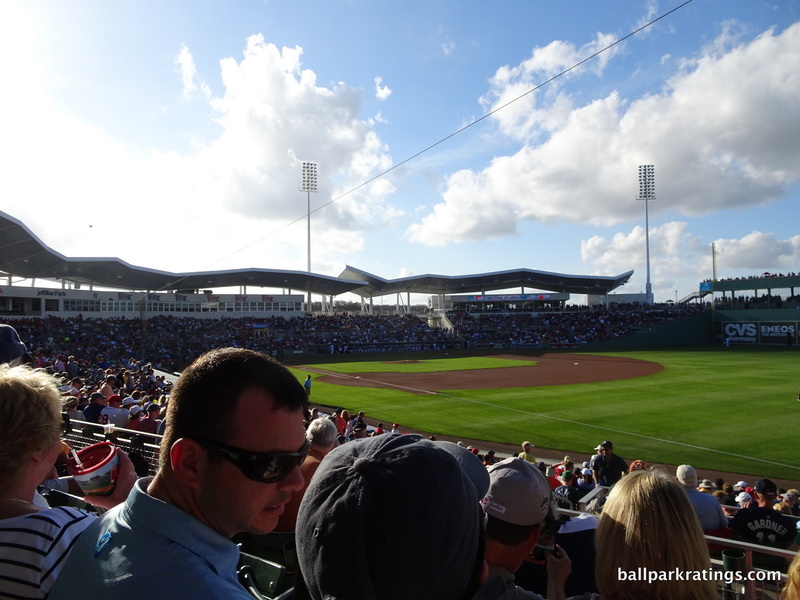 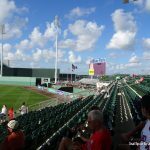 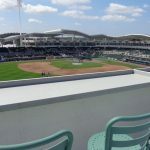 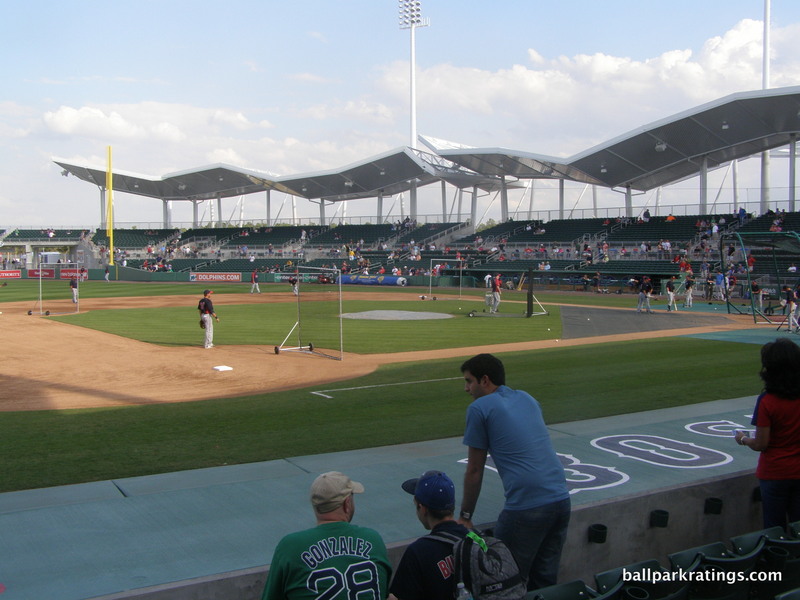 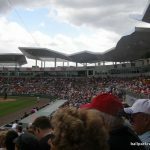 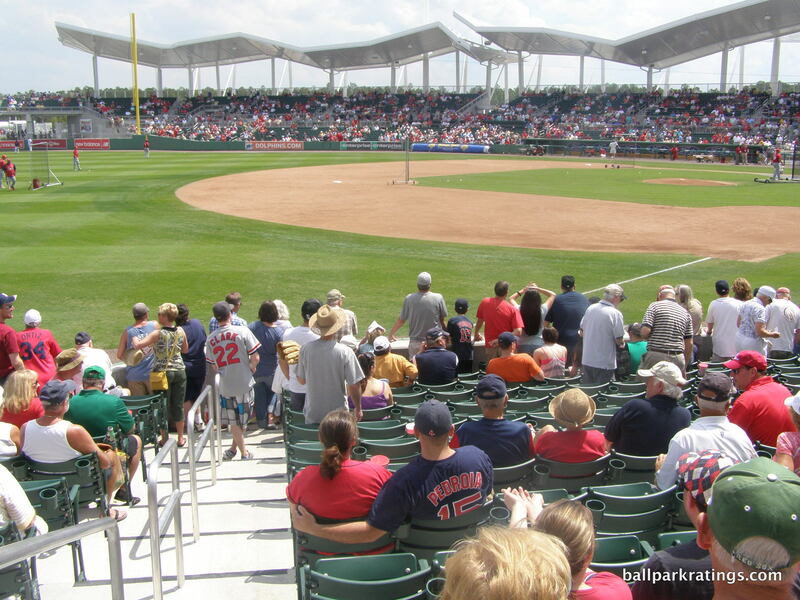 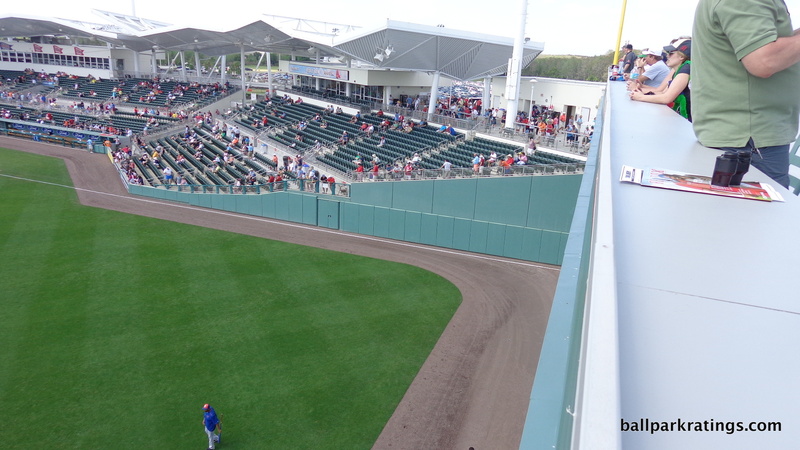 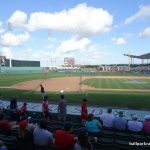 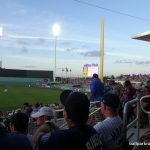 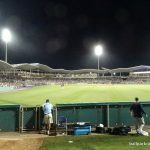 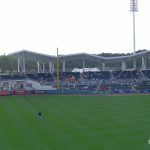 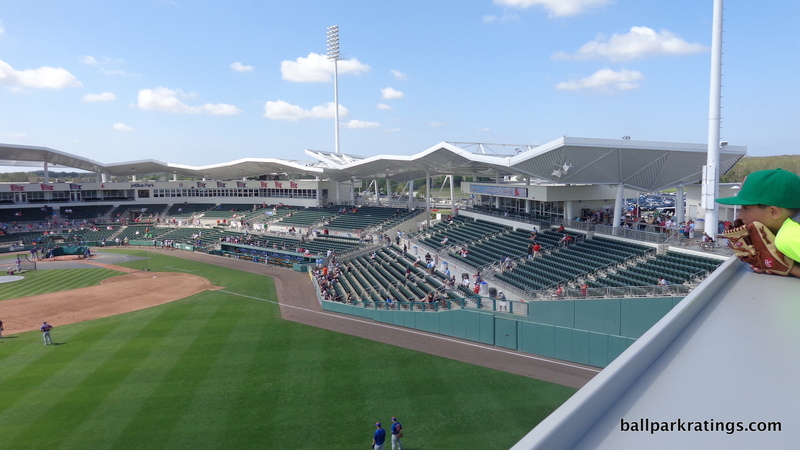 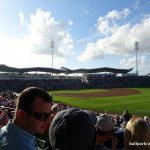 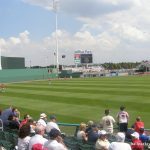 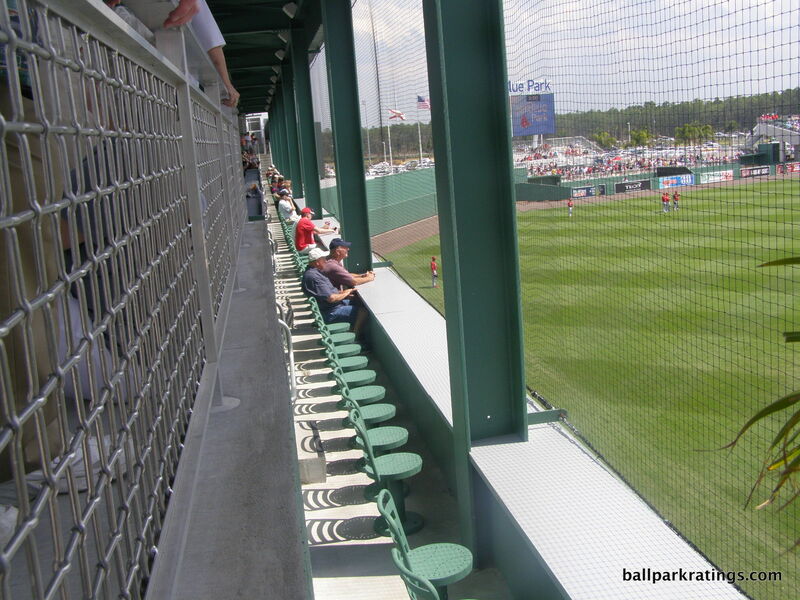 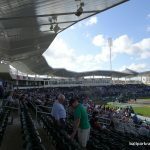 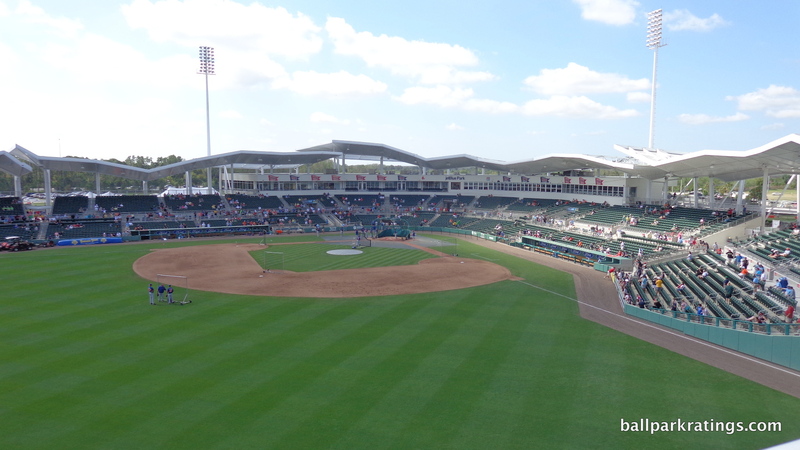 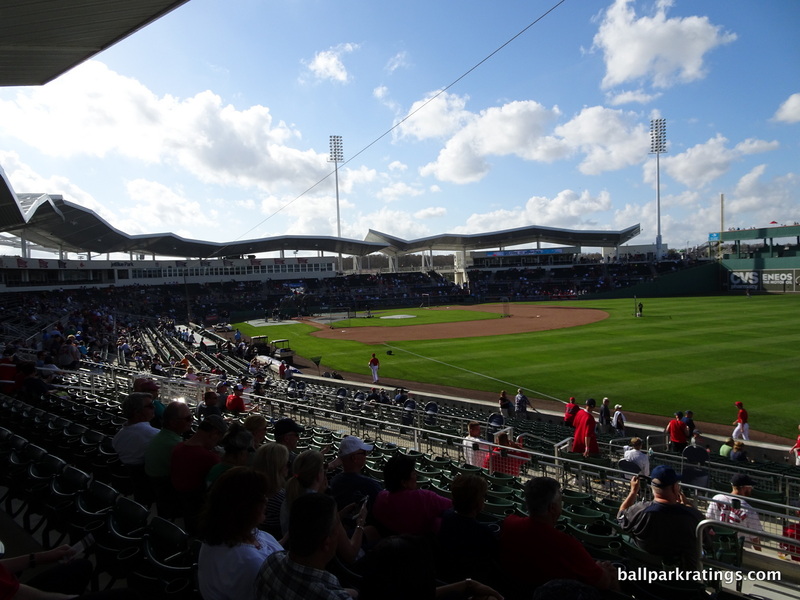 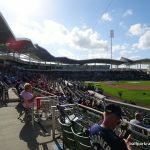 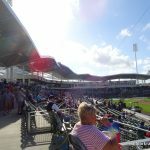 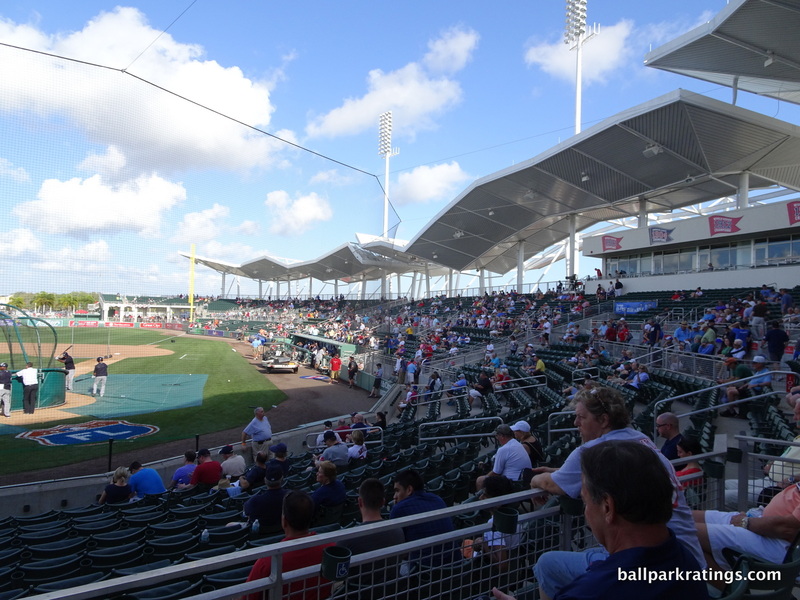 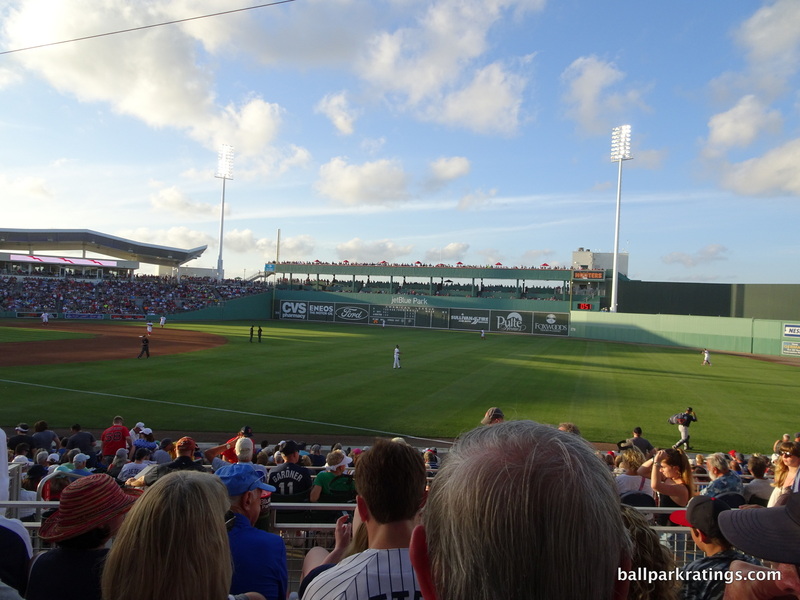 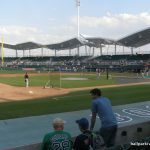 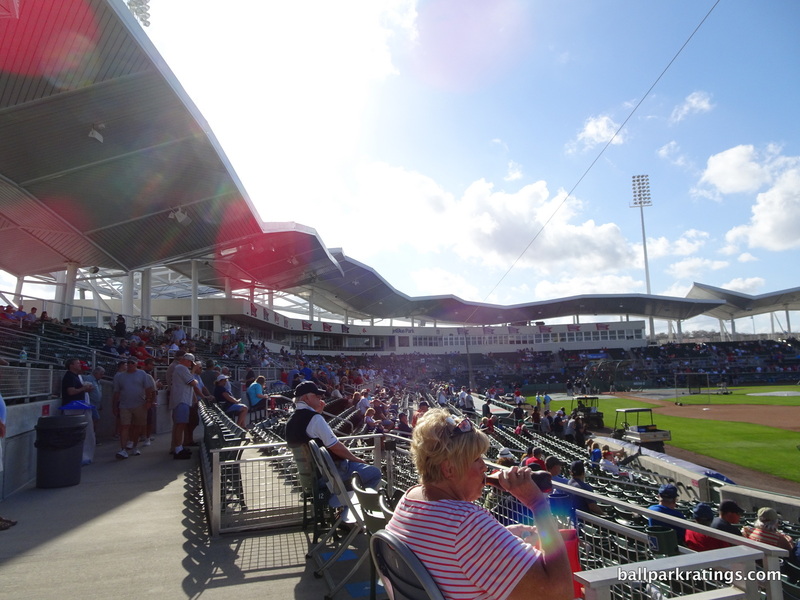 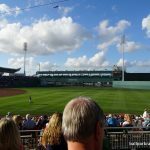 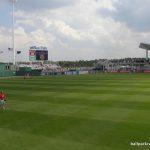 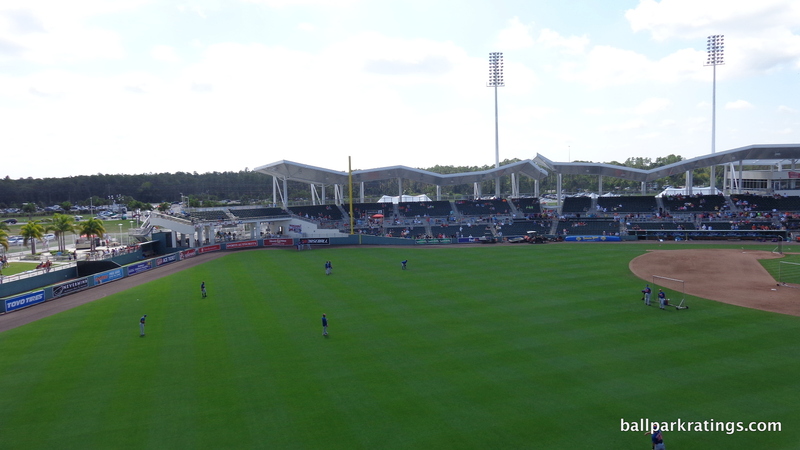 JetBlue Park possesses distinctive features like the undulating roof line mimicking the local landscape and integrates them with elements recalling Fenway Park like the Green Monster. 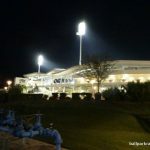 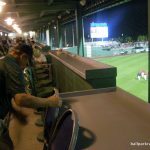 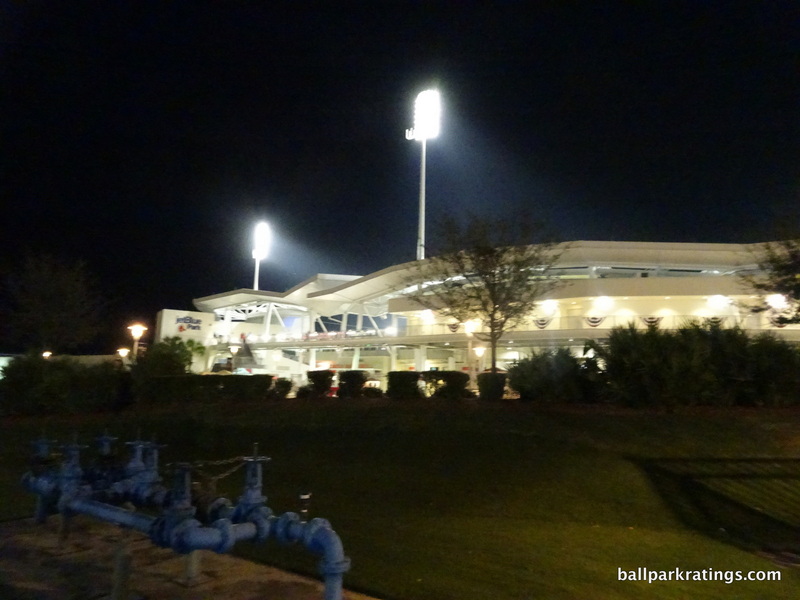 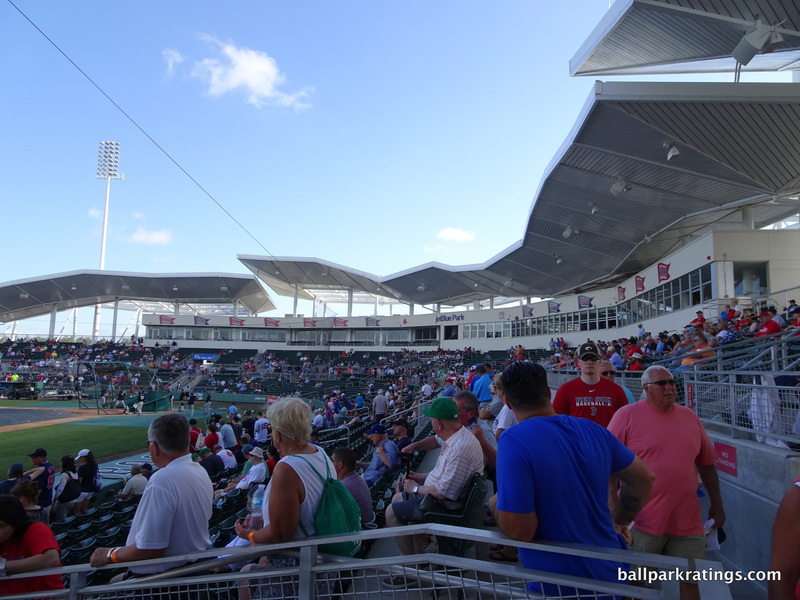 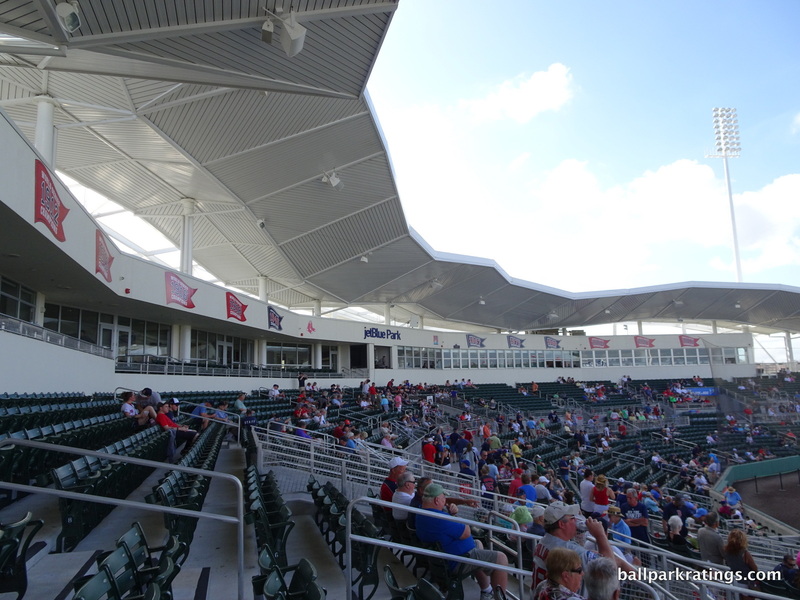 While some parks may be more subjectively attractive, JetBlue Park is perhaps the most architecturally and aesthetically focused in the Grapefruit League, possessing a consistent and ambitious aesthetic vision inside and out. 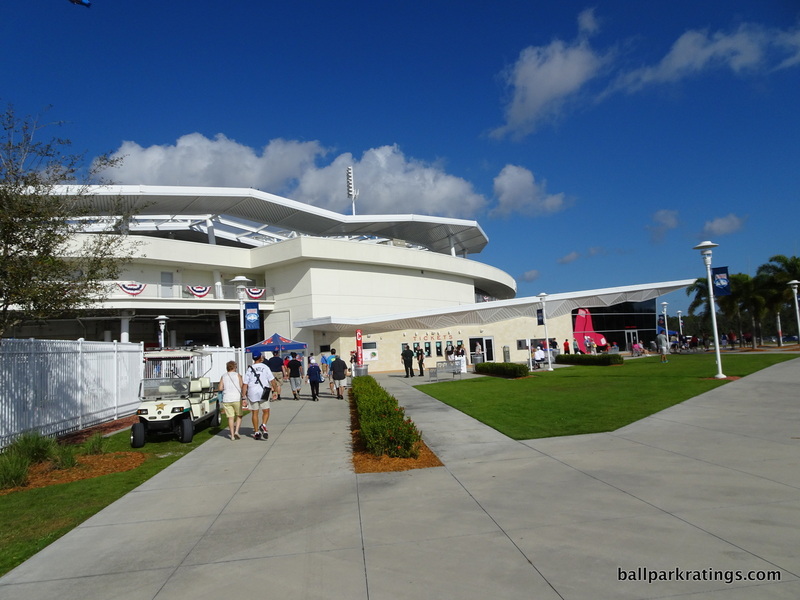 With its white concrete, deep blue glass, and distinctive undulating forms, the contemporary exterior architecture is nothing like Fenway Park, instead echoing the sensibility of Ft. Myers. 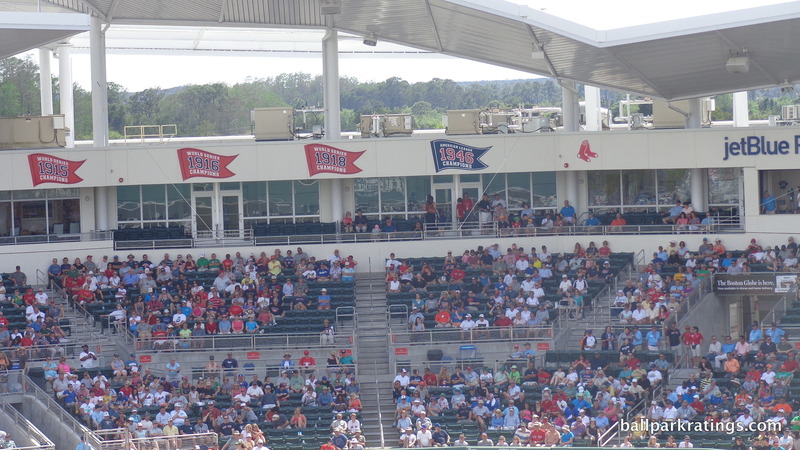 Not one red brick. 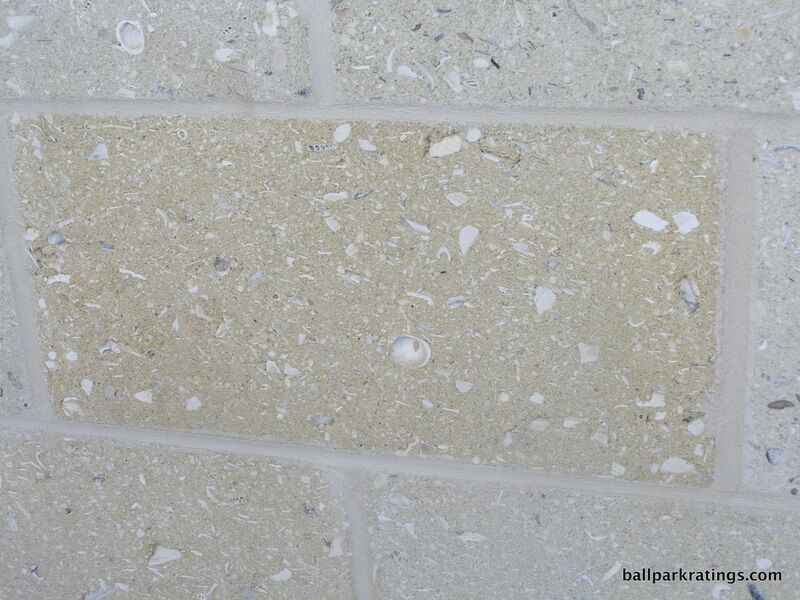 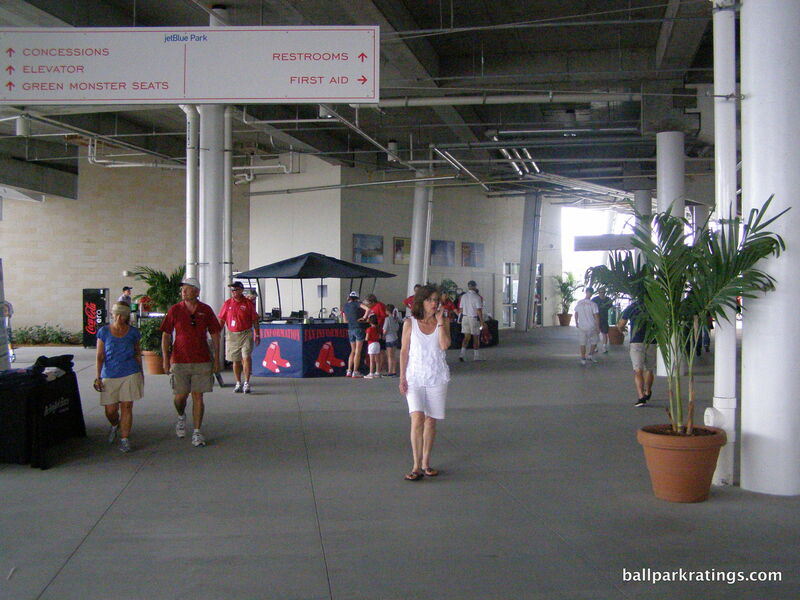 Concourse aesthetics are notable and attractive here, with walls of corals and seashells from Sanibel Island. 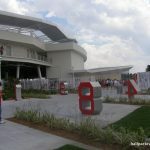 The forward-looking architectural forms are very much a part of the interior aesthetic, as the concepts of “exterior” and “interior” are less separated here. 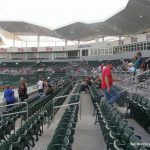 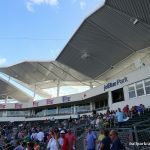 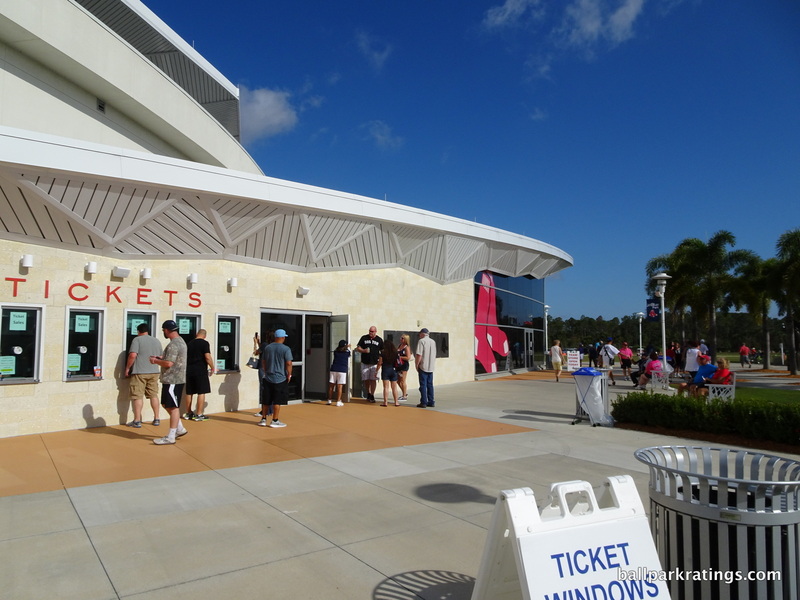 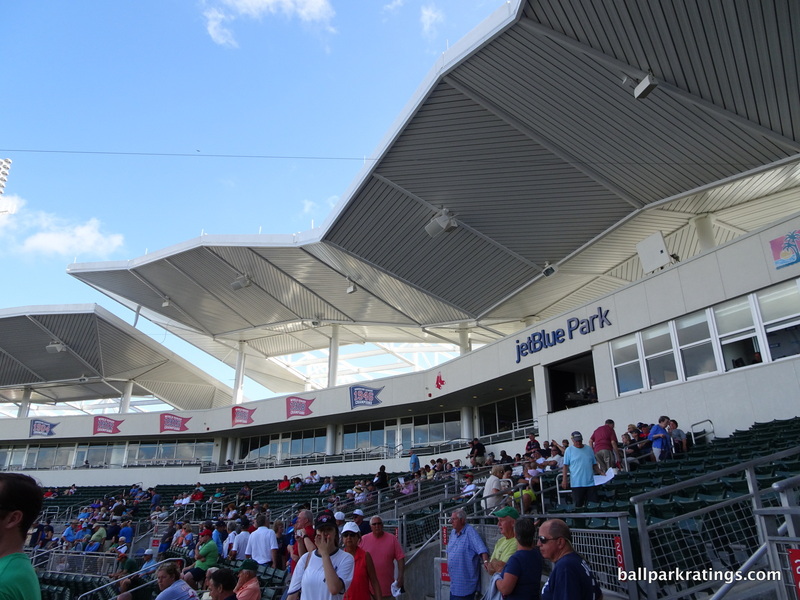 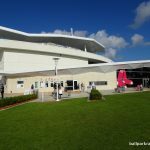 Intended to reflect the Cypress trees that surround the site, JetBlue Park’s modern white roof line is an iconic interior piece, instantly defining the park as one of the most distinctive in Florida. 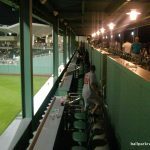 While the outside structure is all “Florida,” the inside is “Florida + Fenway,” tastefully incorporating Fenway’s numerous nooks and crannies in a manner that doesn’t seem contrived, perhaps because it feels like Florida’s authentic take on Fenway. 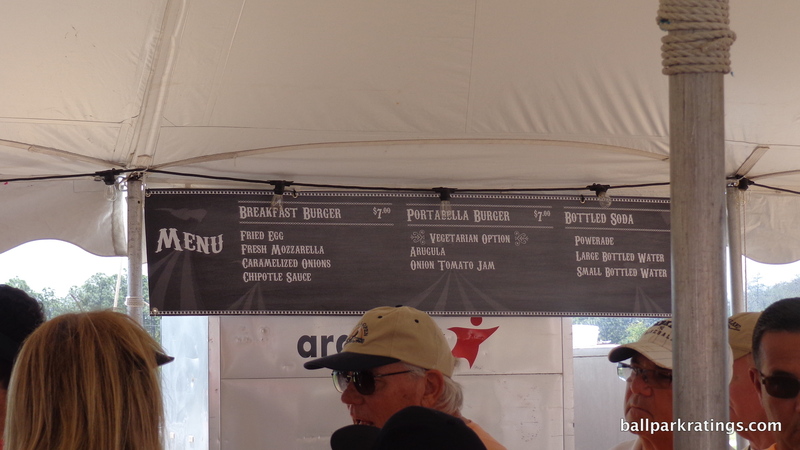 Overall, I think it’s a very flavorful amalgamation. 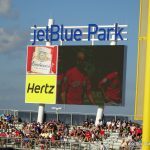 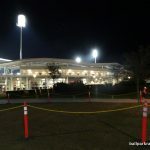 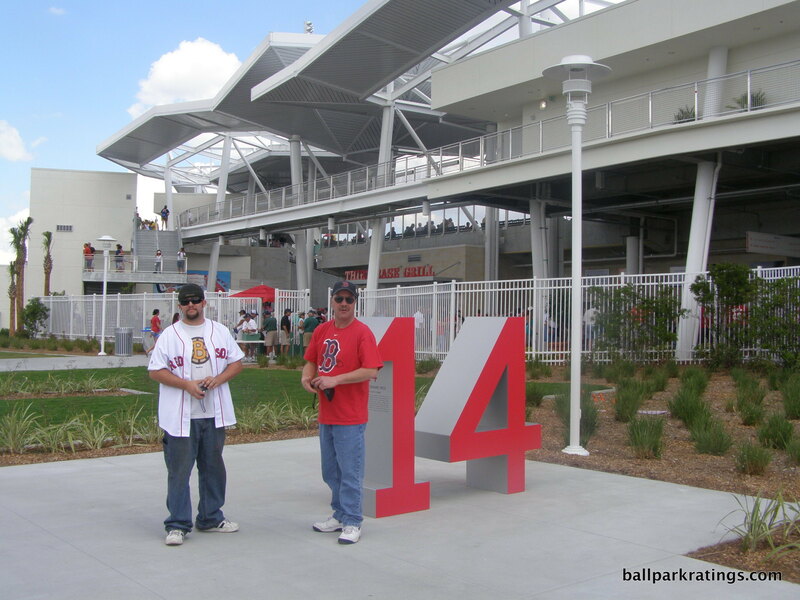 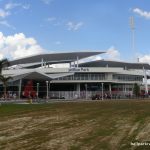 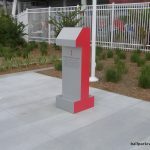 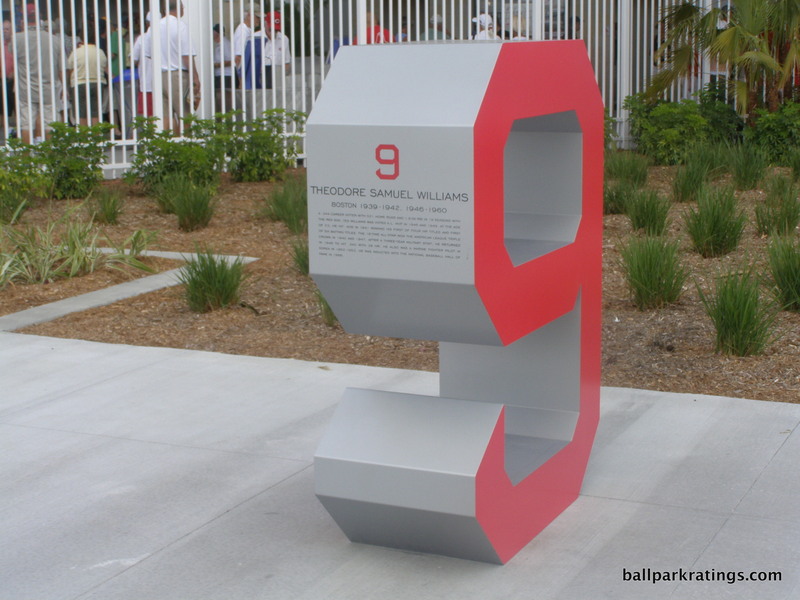 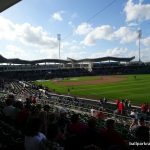 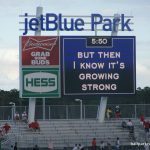 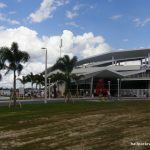 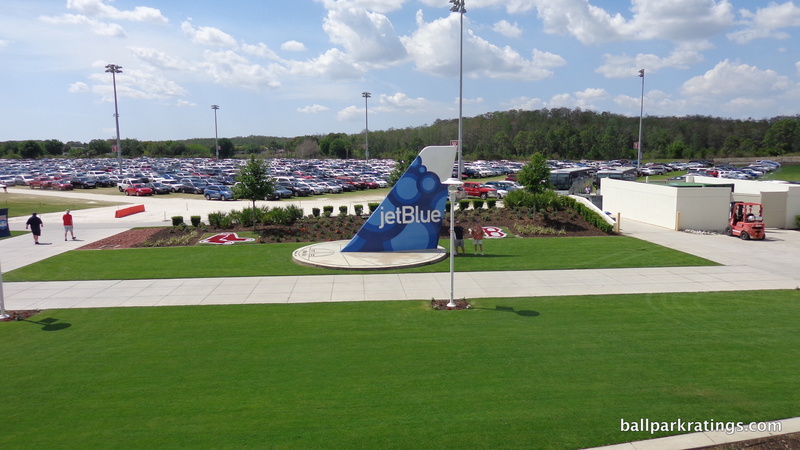 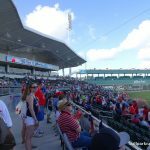 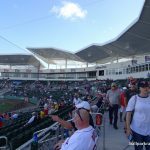 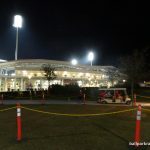 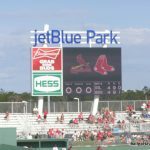 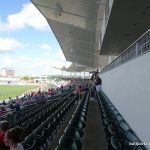 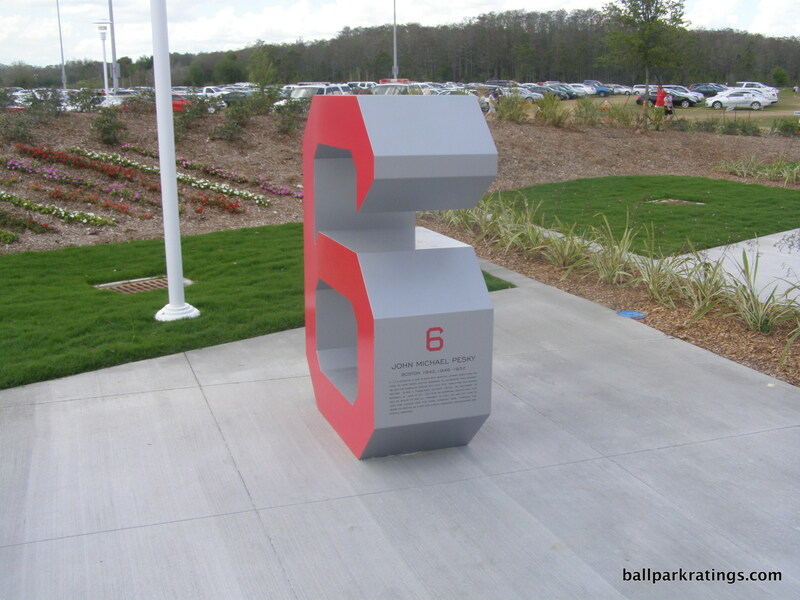 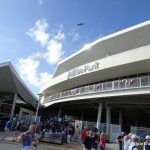 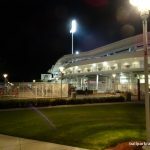 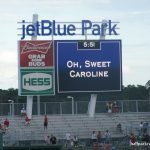 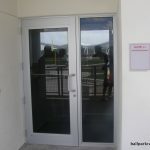 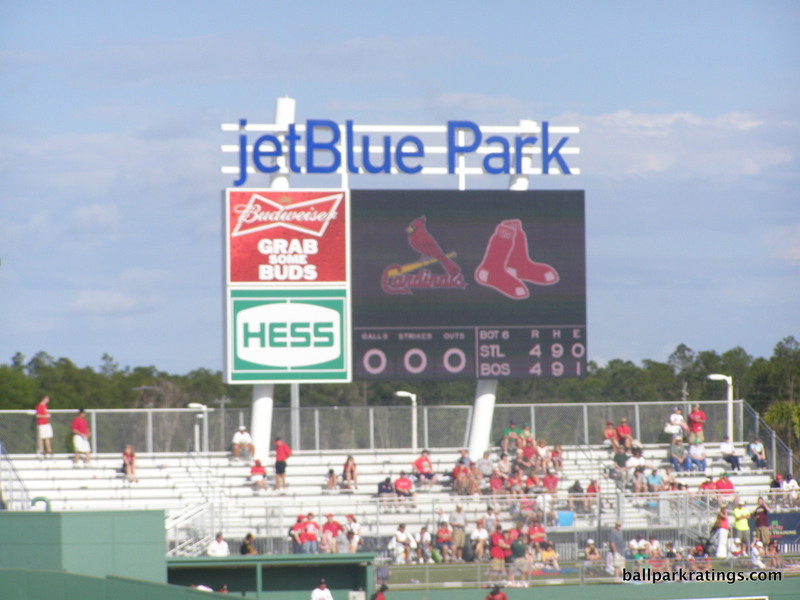 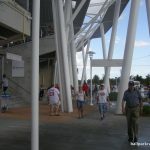 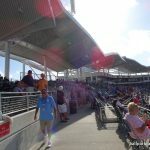 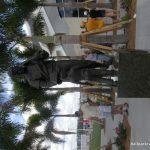 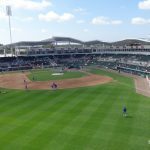 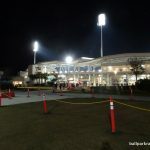 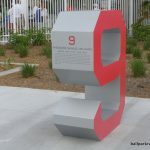 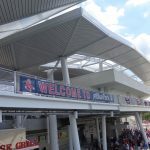 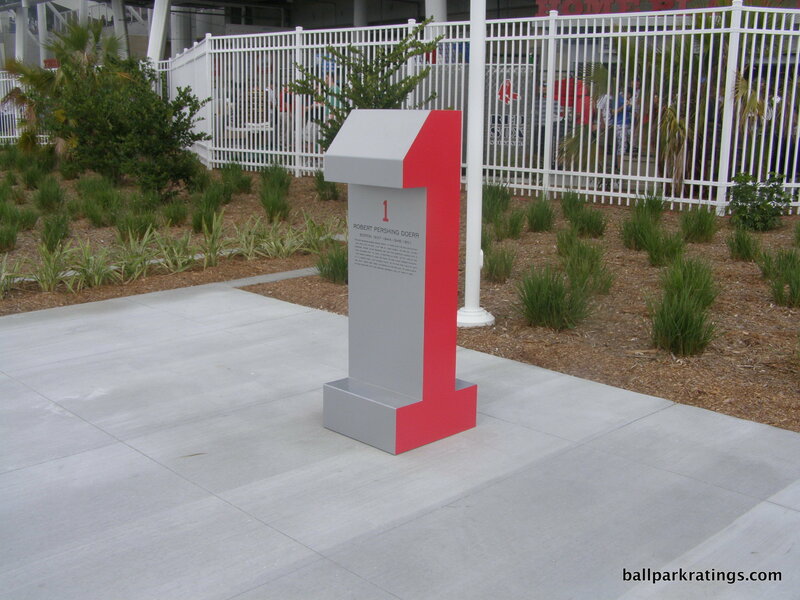 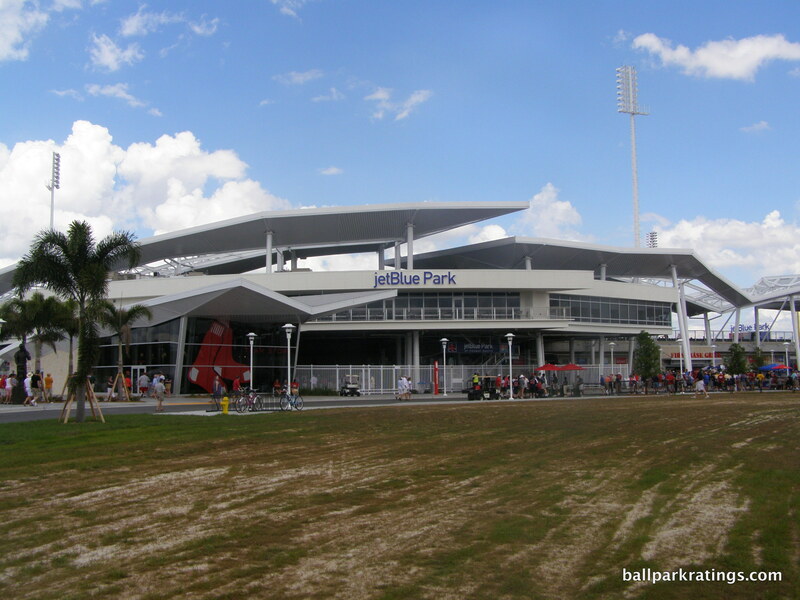 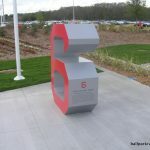 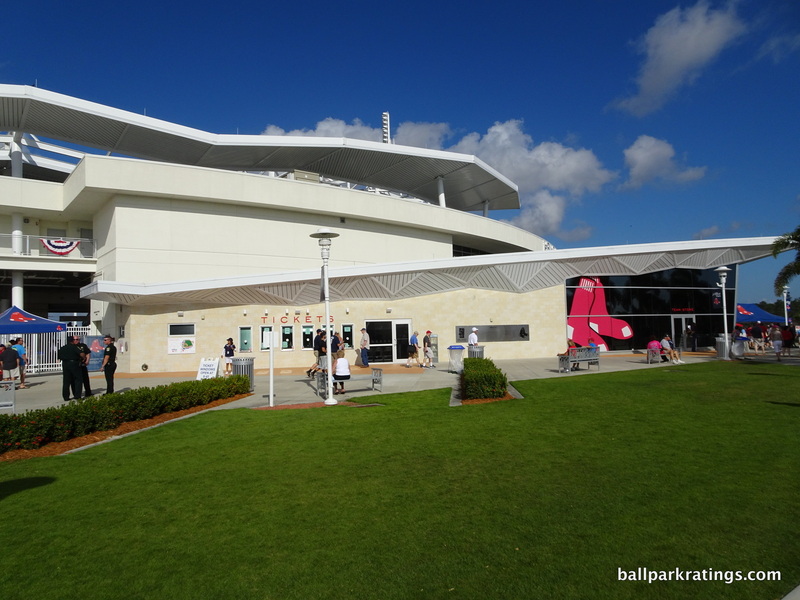 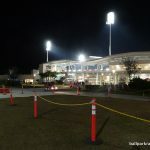 As a building that self-evidently reflects the team and an innovative structure on its own, JetBlue Park earns a perfect “10” in ballpark personality. 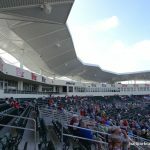 It’s only one of two spring ballparks that does a great job of simultaneously reflecting the architectural sensibility of the spring state and the home team. 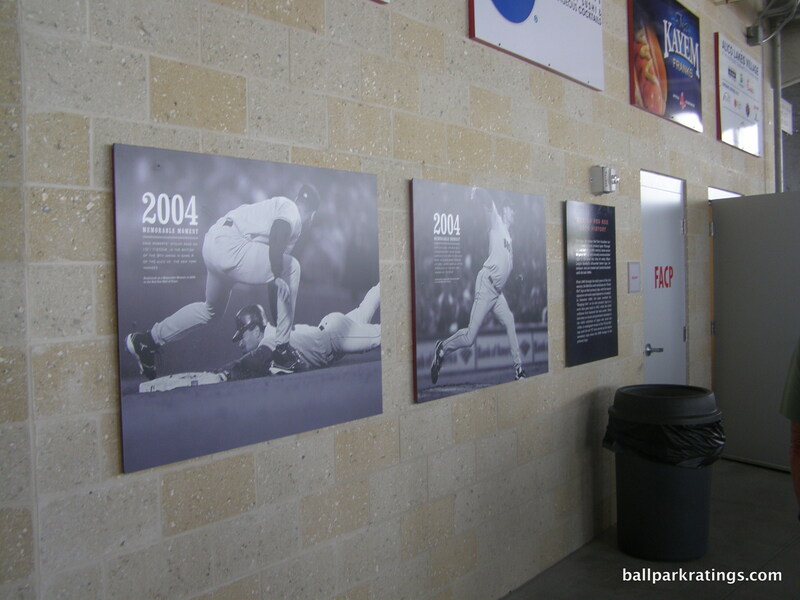 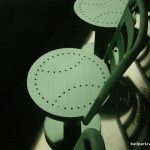 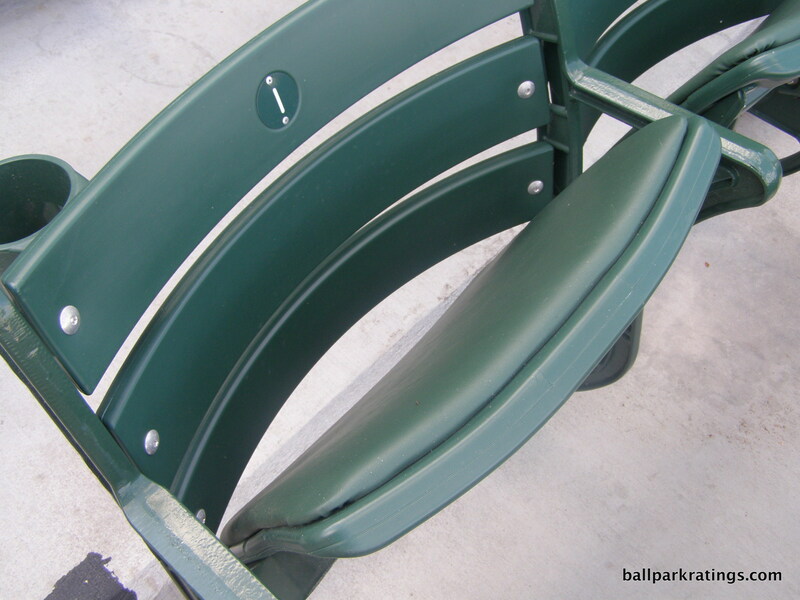 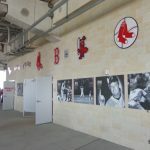 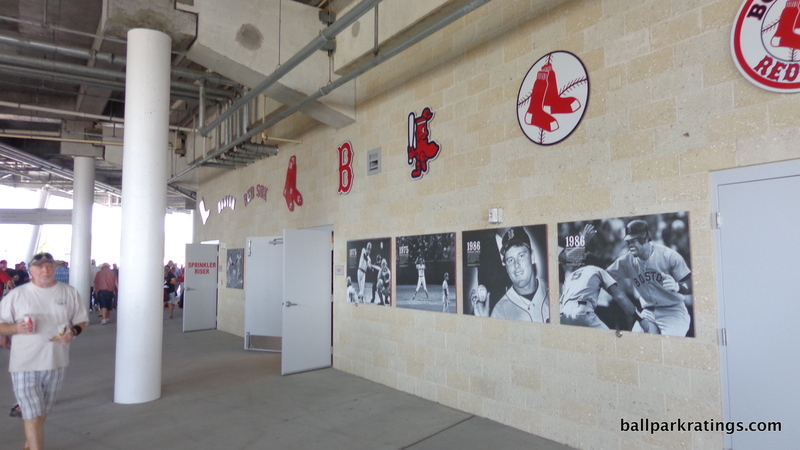 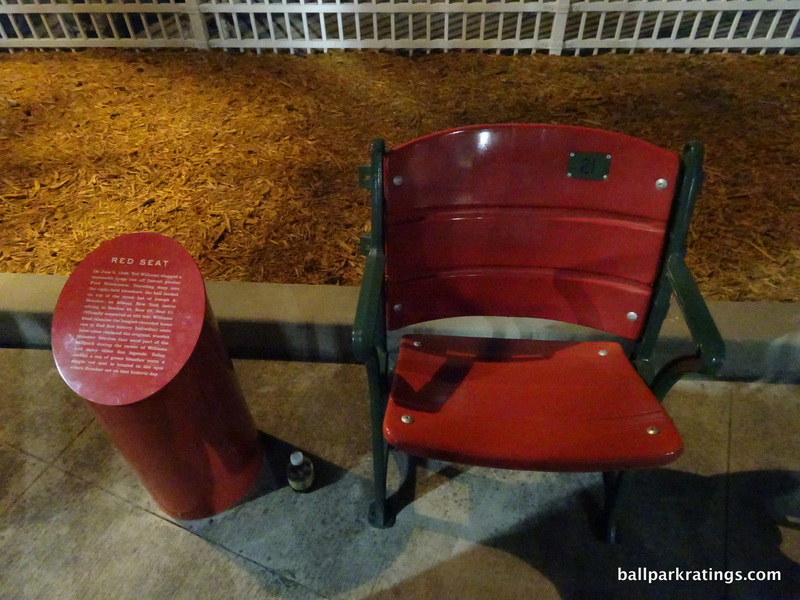 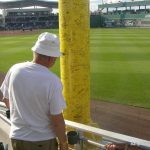 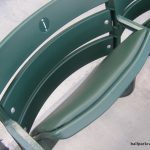 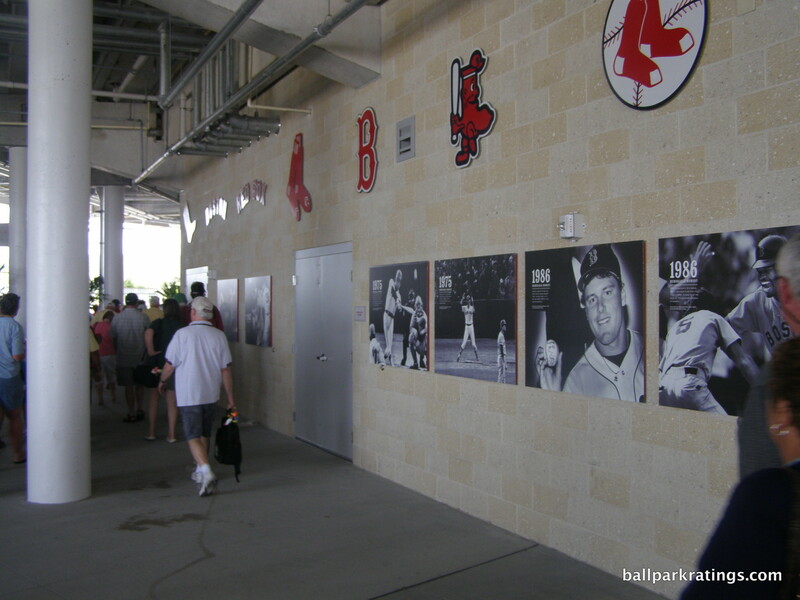 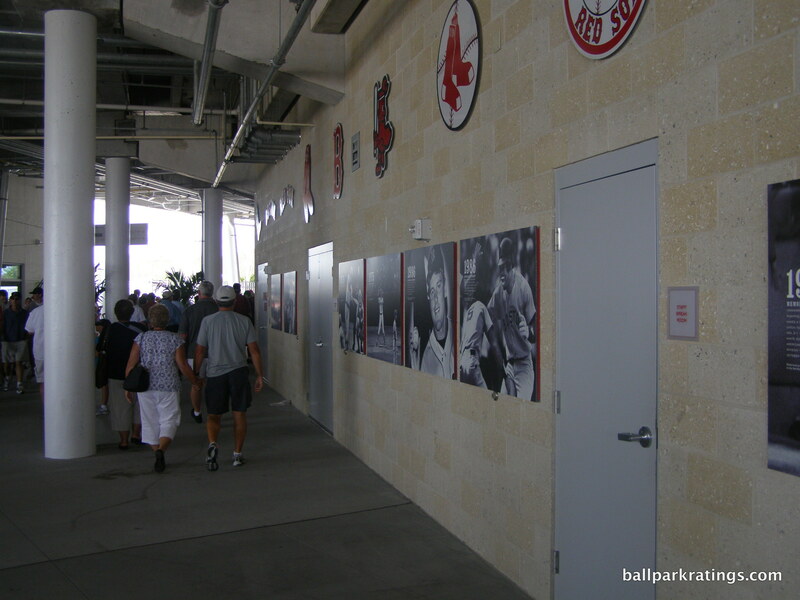 Notable features inside that remind fans of home include the Green Monster, Pesky’s Pole, identical dimensions, Fenway South Drive recalling a street festival atmosphere, a refurbished hand-operated scoreboard previously used at Fenway Park, the red seat marking Ted Williams’ home run on the right field concourse, historical posters on the concourse, retired numbers, and pennant banners. 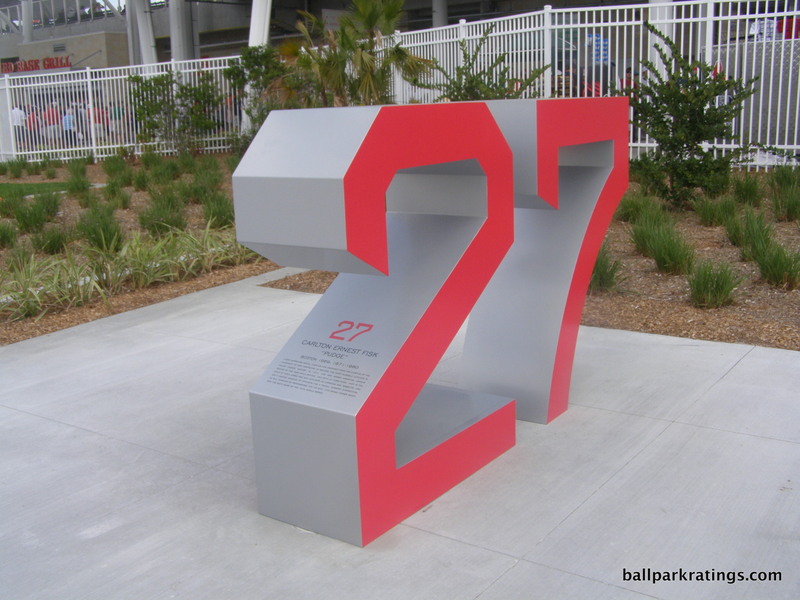 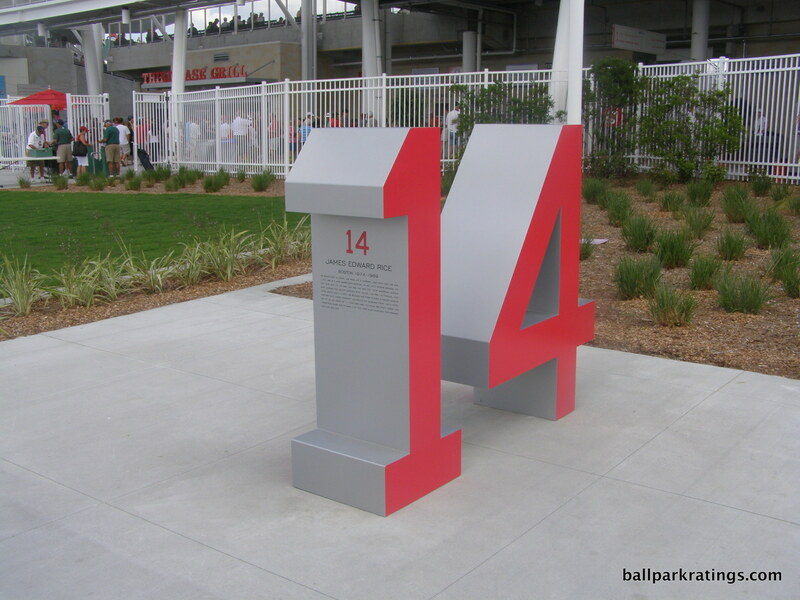 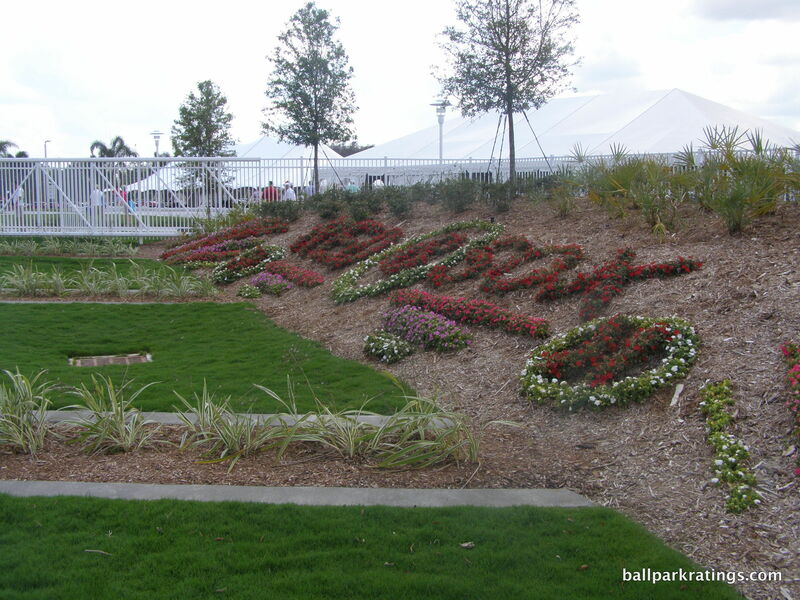 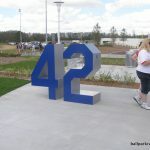 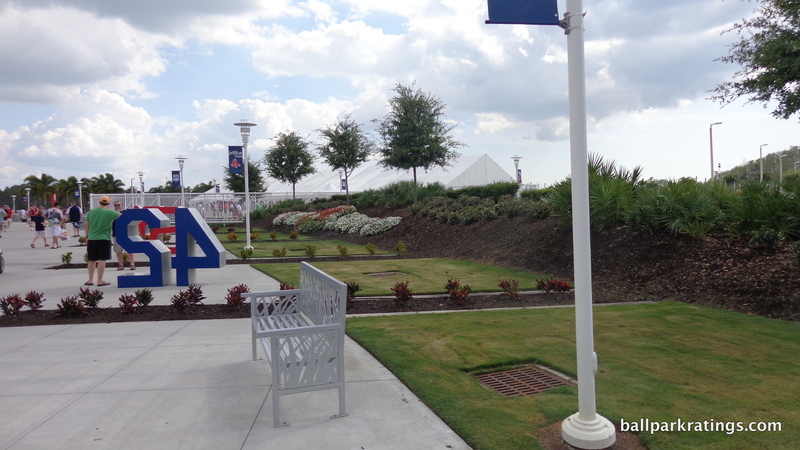 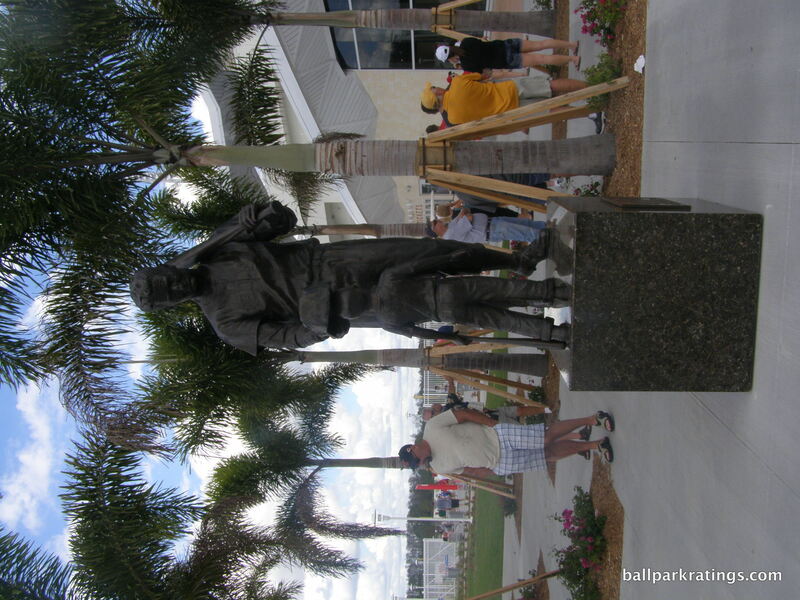 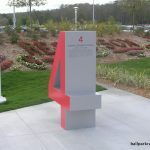 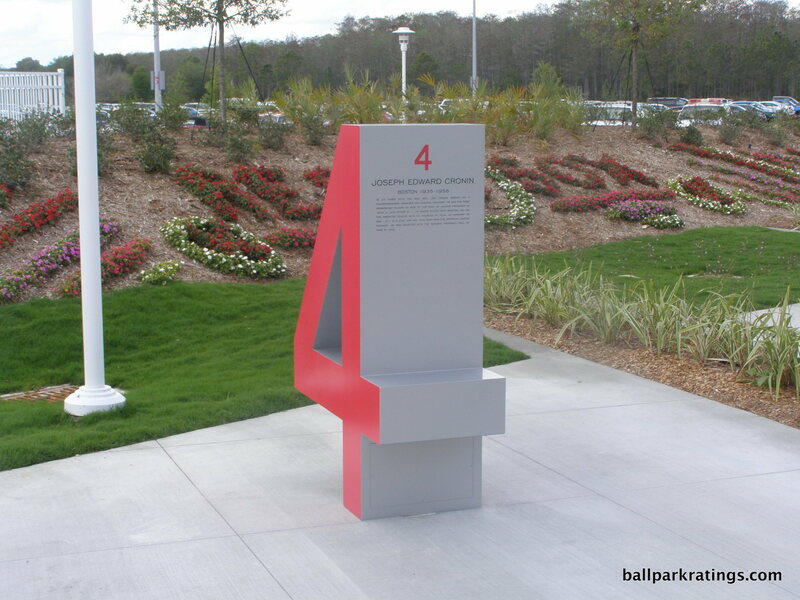 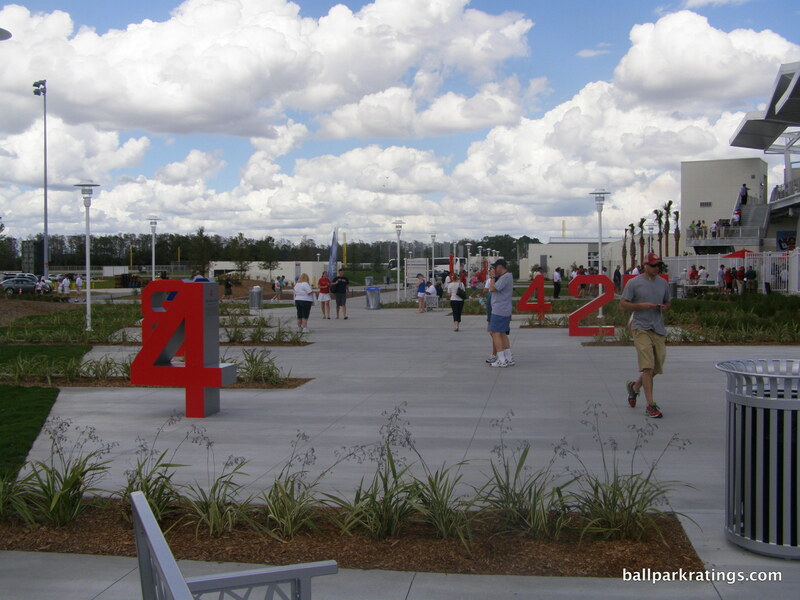 Outside, we have a Hall of Fame garden with enlarged retired numbers and a statue of Ted Williams. 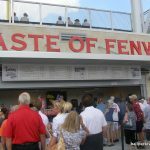 Elements of the ballpark presentation include Fenway Franks/Clam Chowder and Sweet Caroline in the middle of the eighth inning. 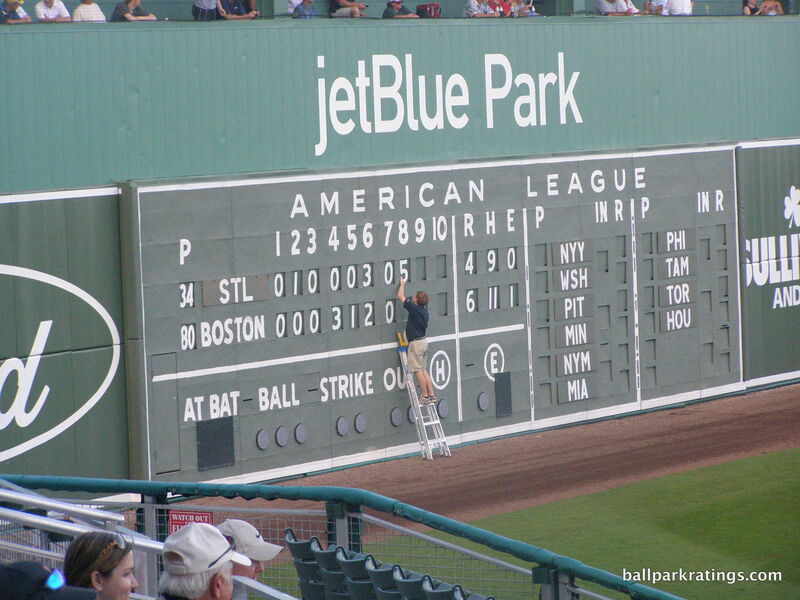 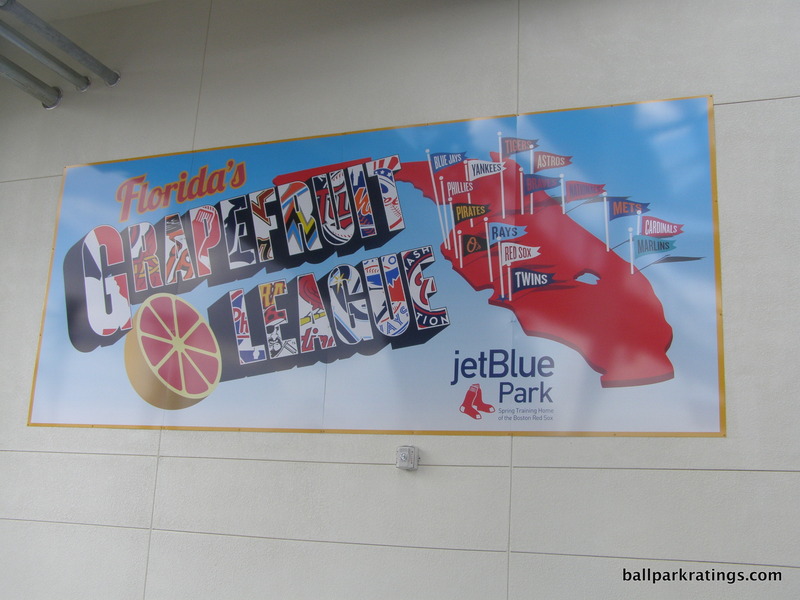 But again, JetBlue is a well-designed and memorable ballpark even without all of that. 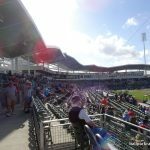 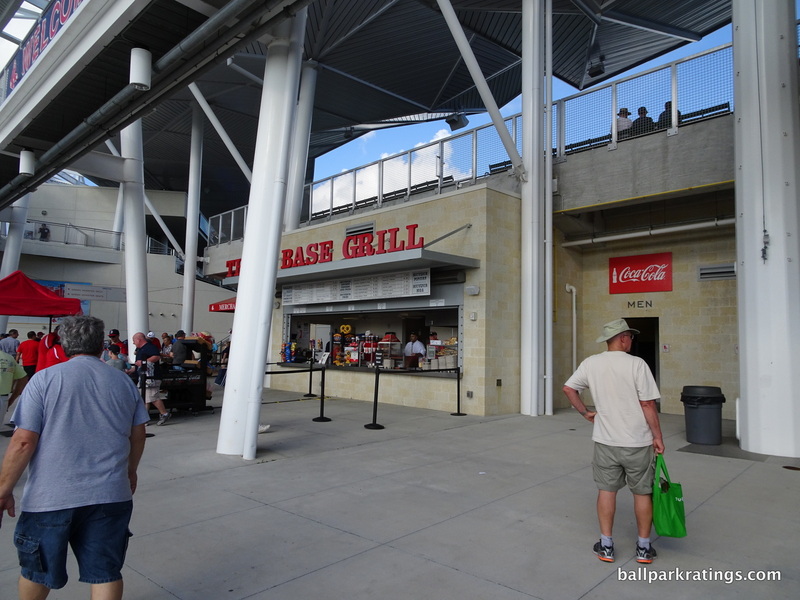 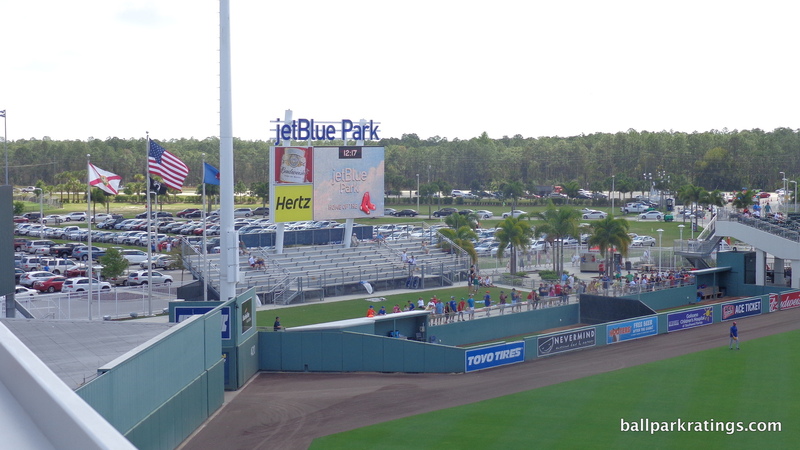 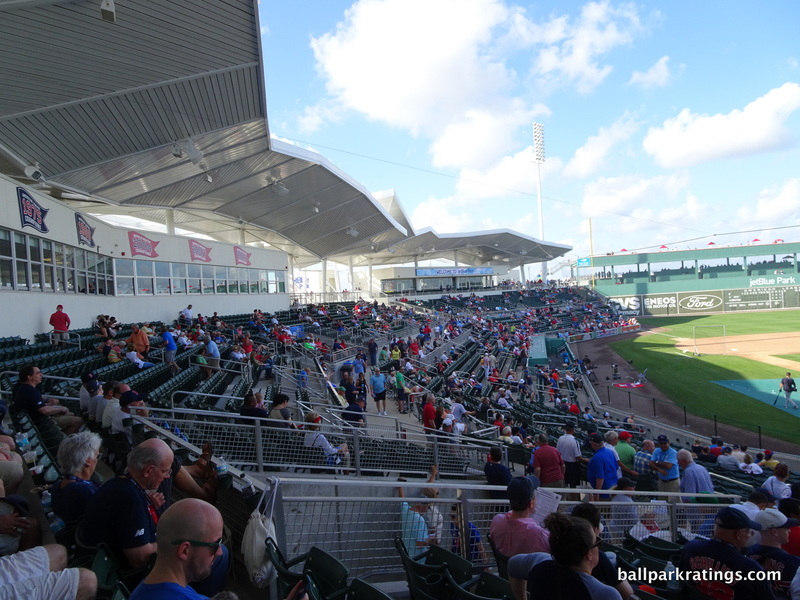 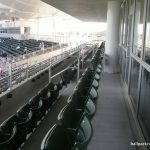 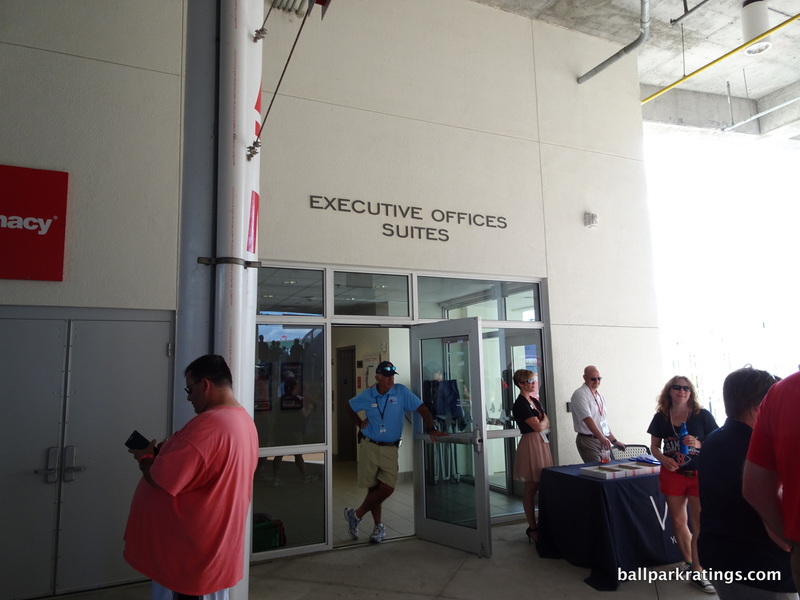 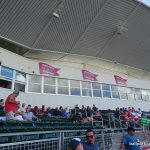 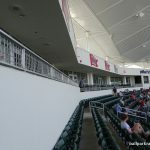 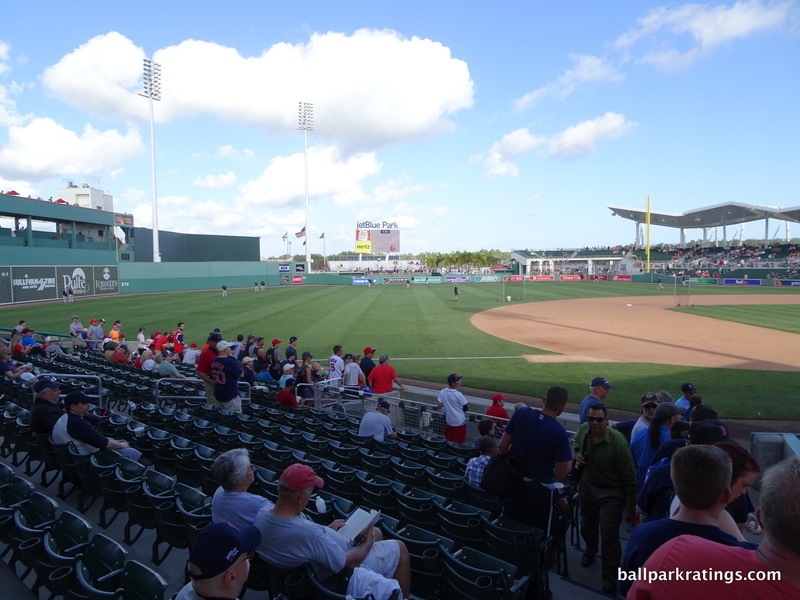 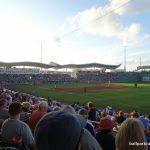 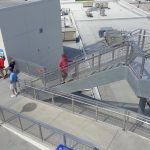 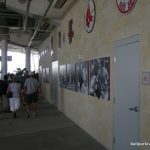 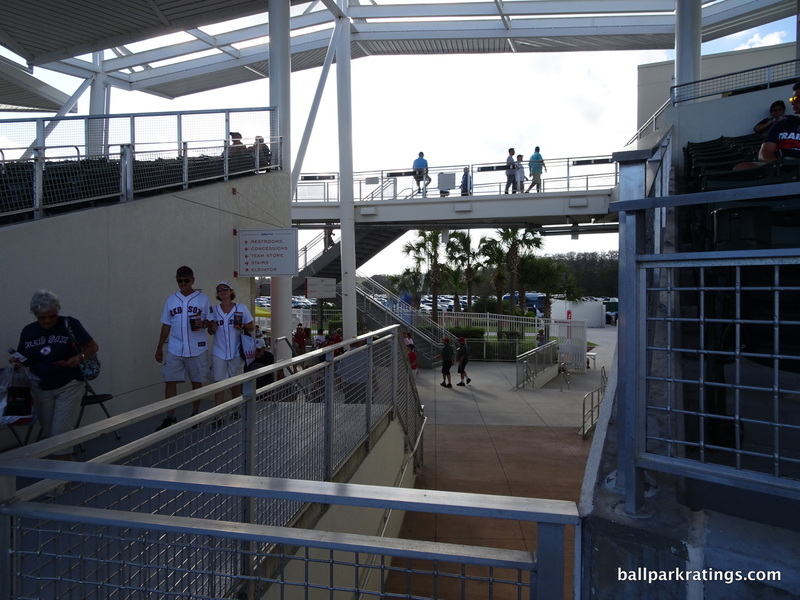 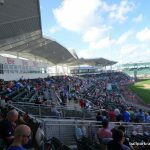 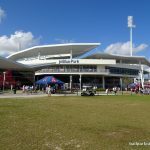 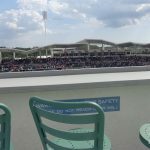 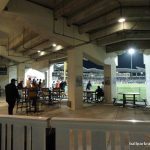 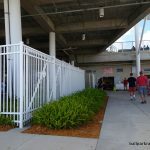 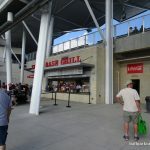 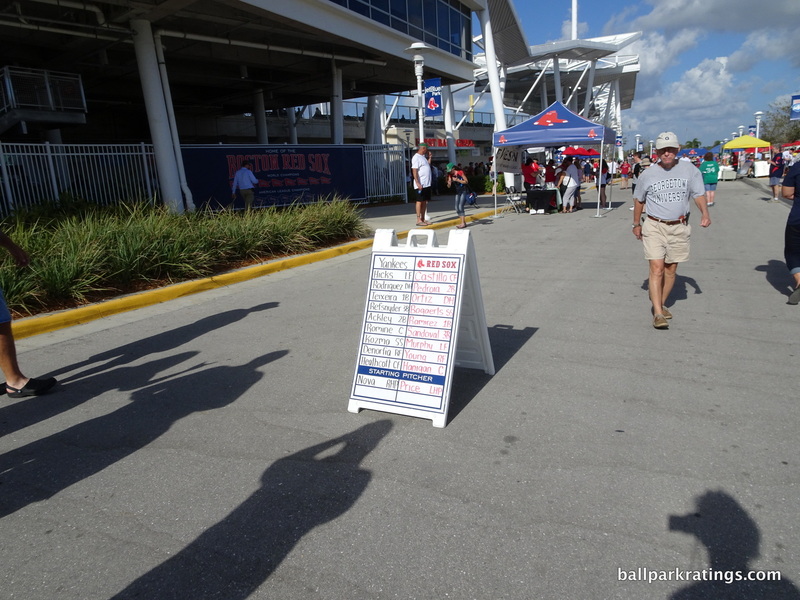 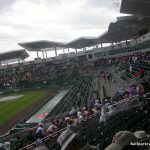 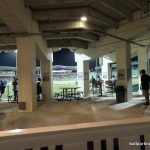 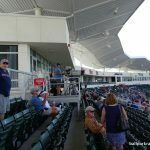 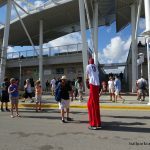 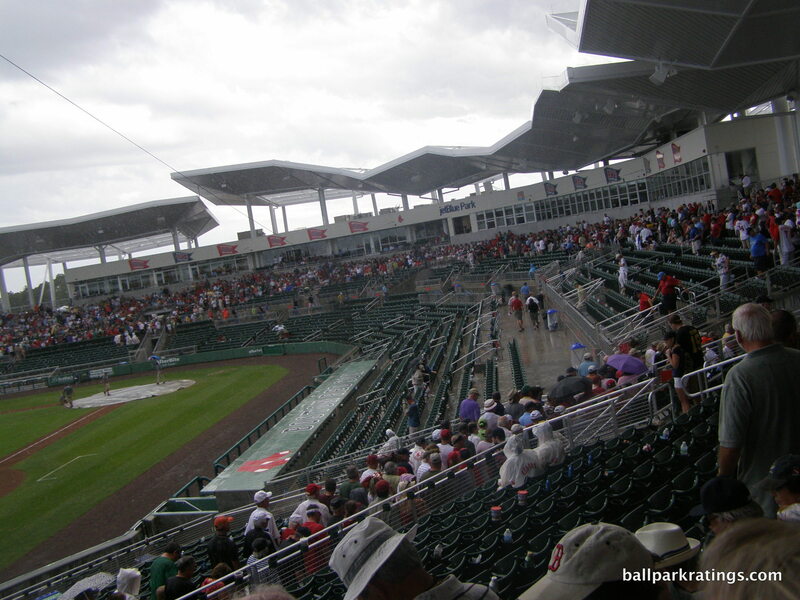 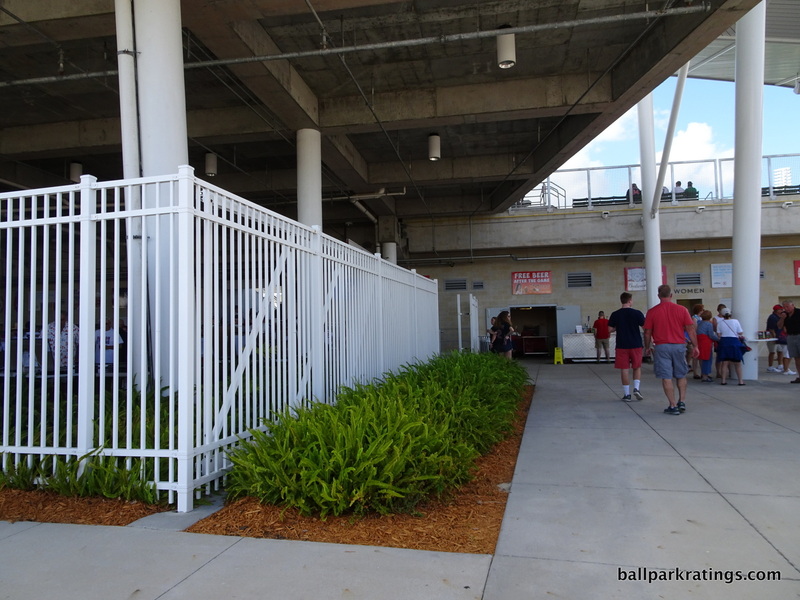 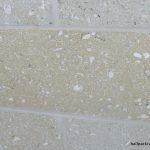 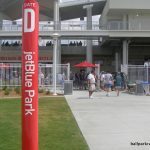 Nothing about the following is overtly poor or disqualifying, but JetBlue Park doesn’t perform as well in the essentials or fan-friendly amenities. 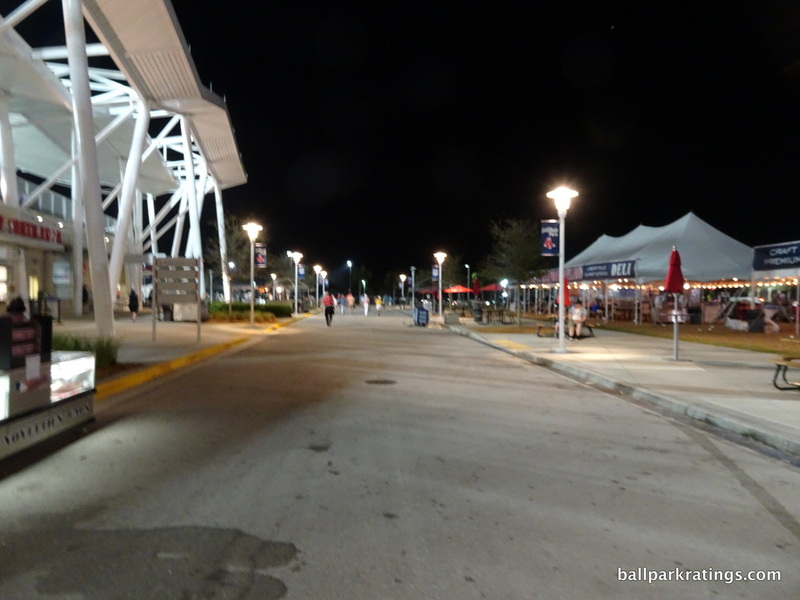 Functionally, the park has some serious drawbacks, most notably the absence of an open, 360-degree concourse that encircles the field. 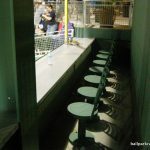 I understand the aim is to reflect Fenway Park, but this is an area where the Red Sox should have strived to depart from home. 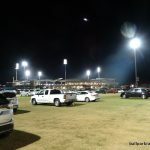 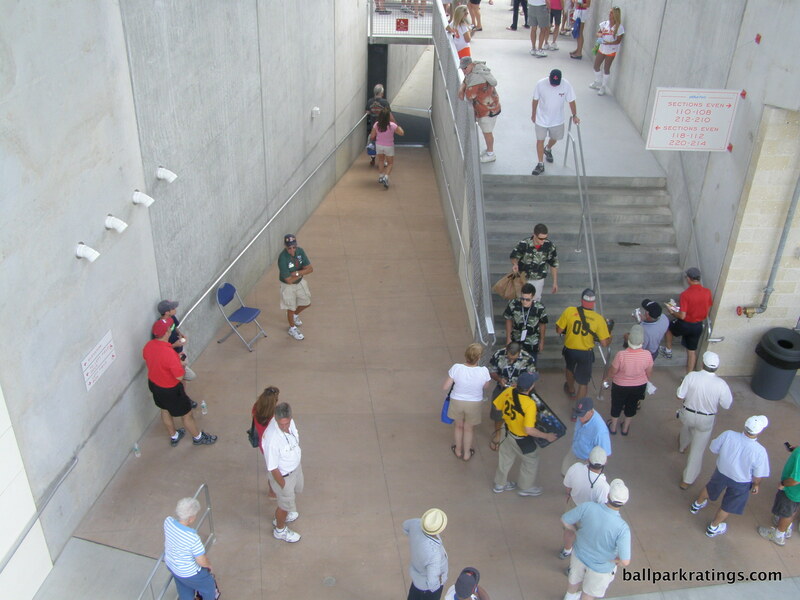 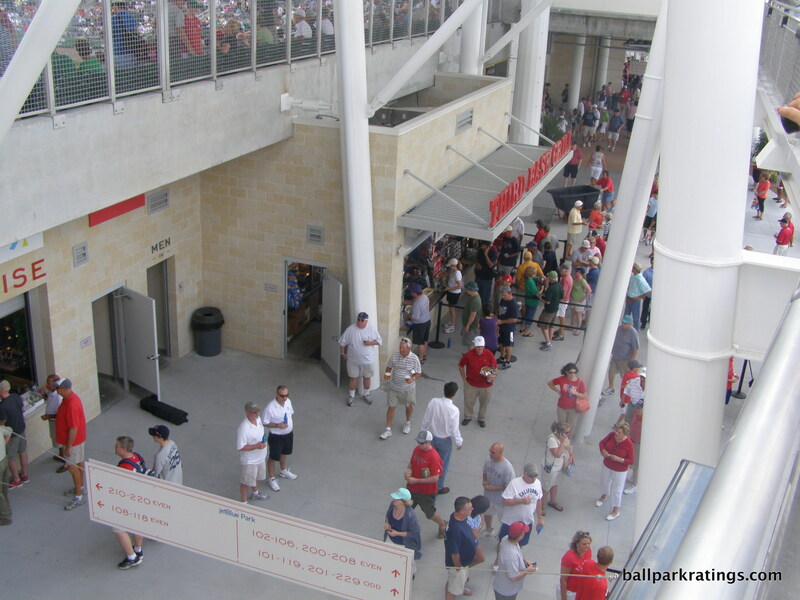 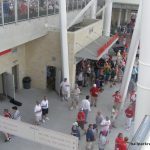 360-degree concourses were ubiquitous 10-15 years prior to opening and have been included in every other 21stcentury new or renovated spring ballpark except one other. 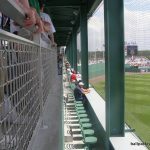 It’s especially annoying at JetBlue Park because fans will be expecting a wraparound system given the presence of outfield concourses. 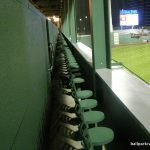 There is just no connection from right field to the Green Monster. 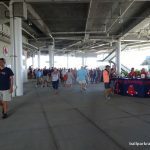 Despite being closed from the field, the concourse is spacious, expanding dramatically beyond the first base grandstand into Fenway South Drive. 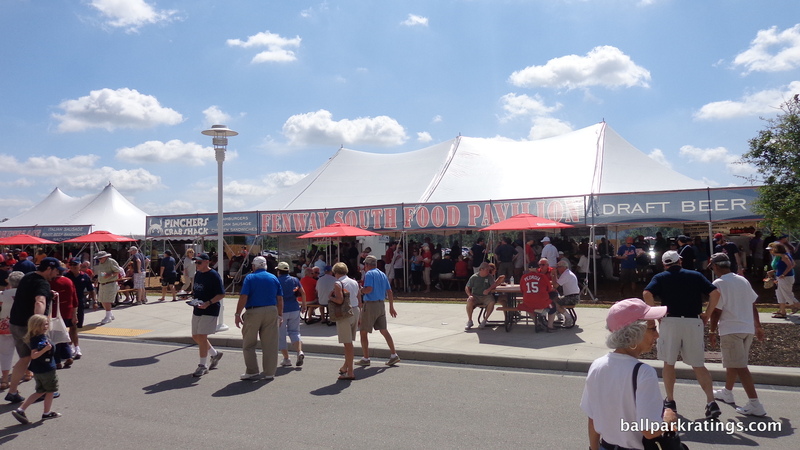 Fenway South Drive echoing the vibe back home. 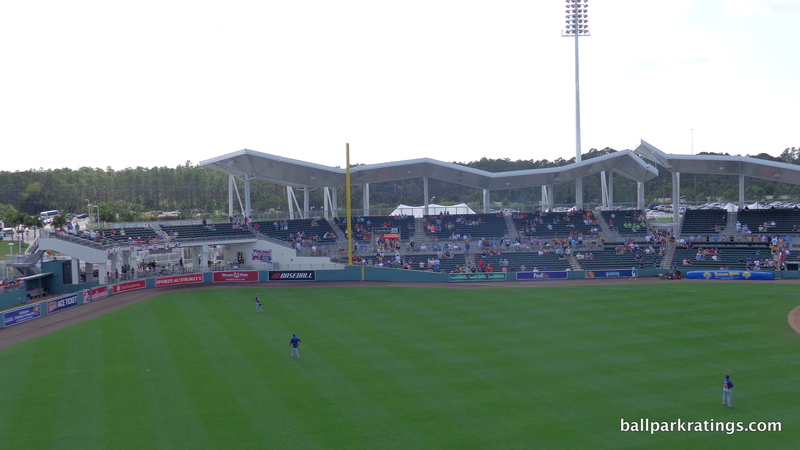 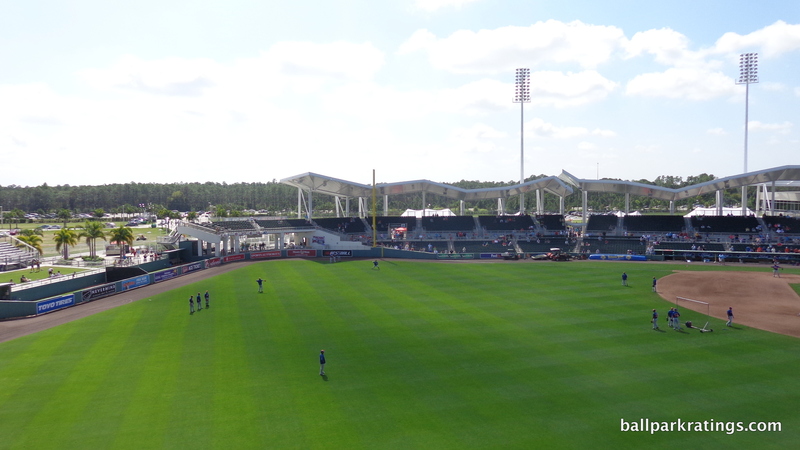 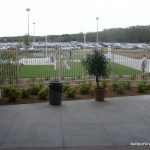 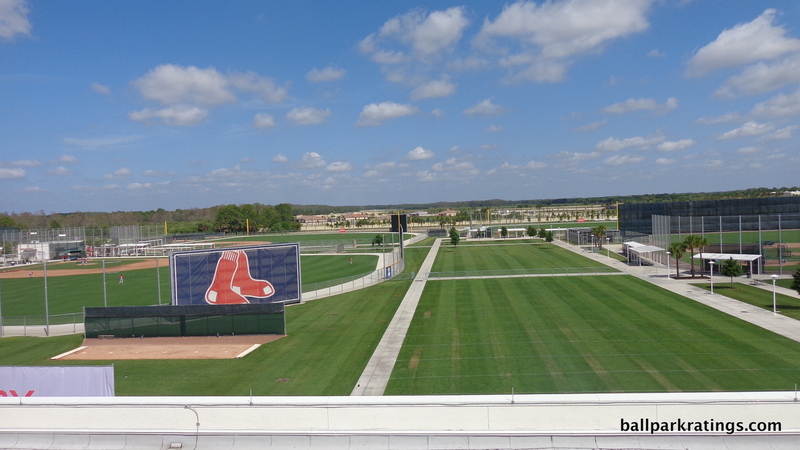 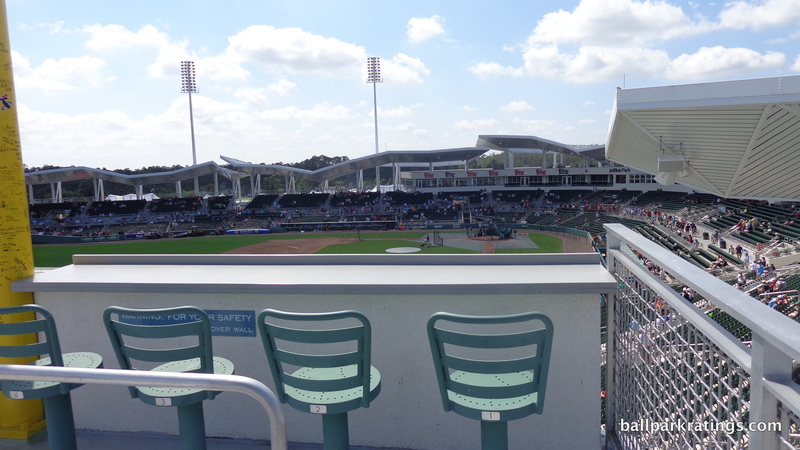 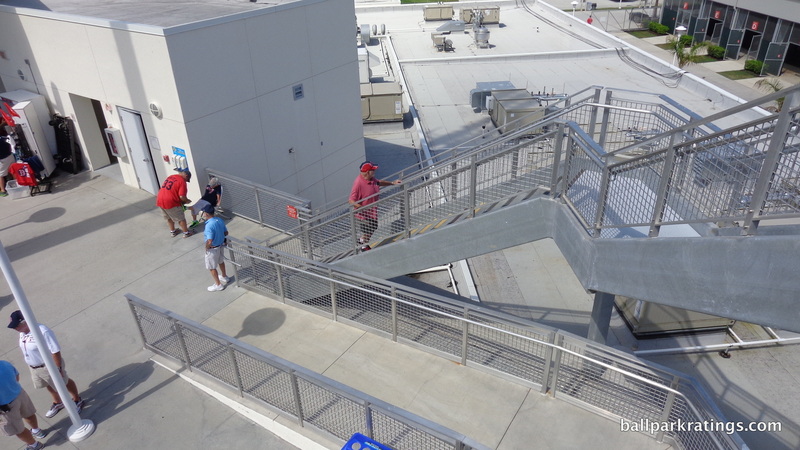 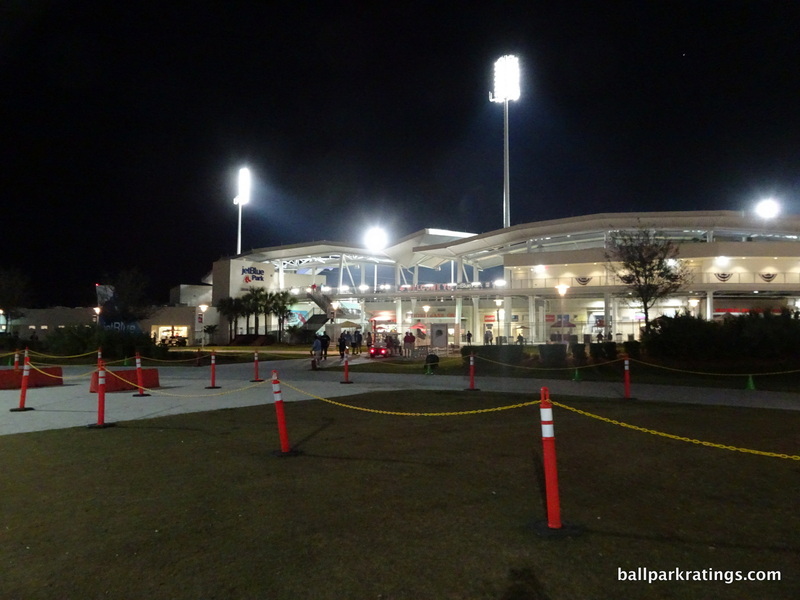 On the plus side, the rest of JetBlue Park’s functionality isn’t a duplication of Fenway Park. 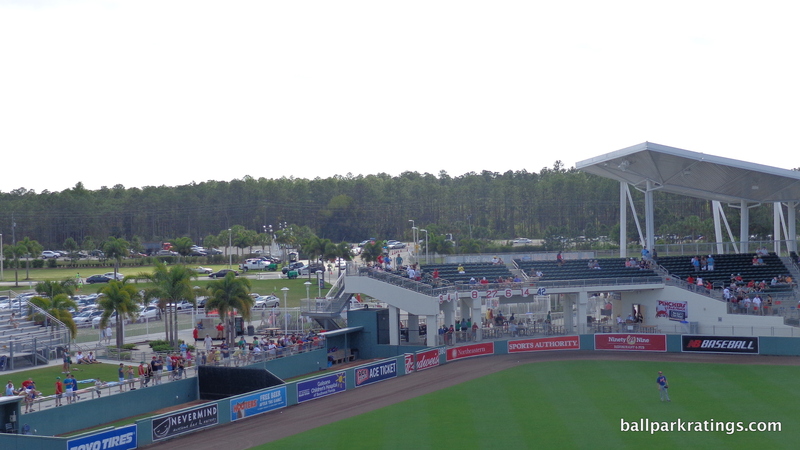 There are naturally some odd viewing angles, but the sightlines are fine. 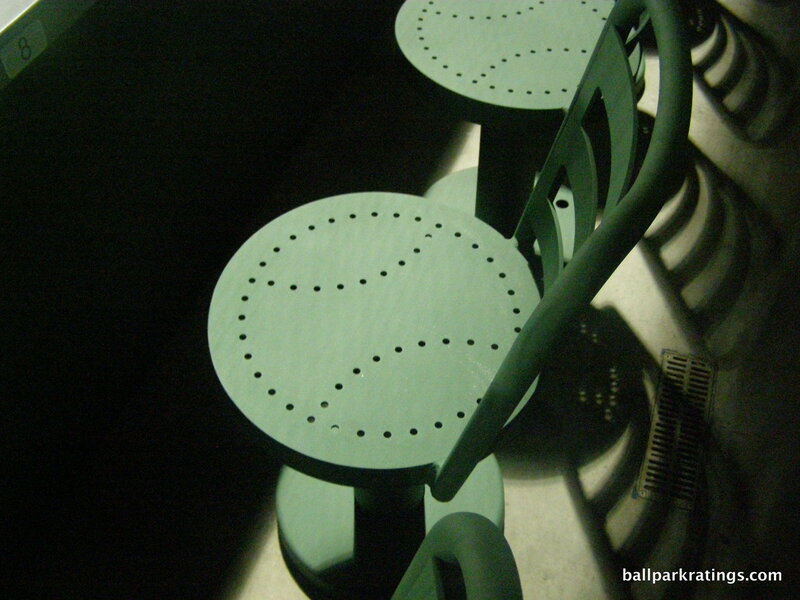 Although, they are not the best down the lines. 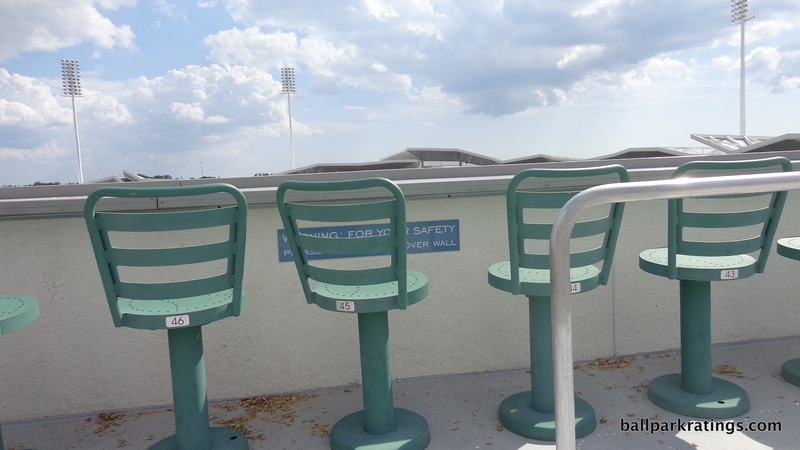 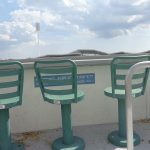 All seats in the main grandstand are of the fold-down variety and have cupholders. 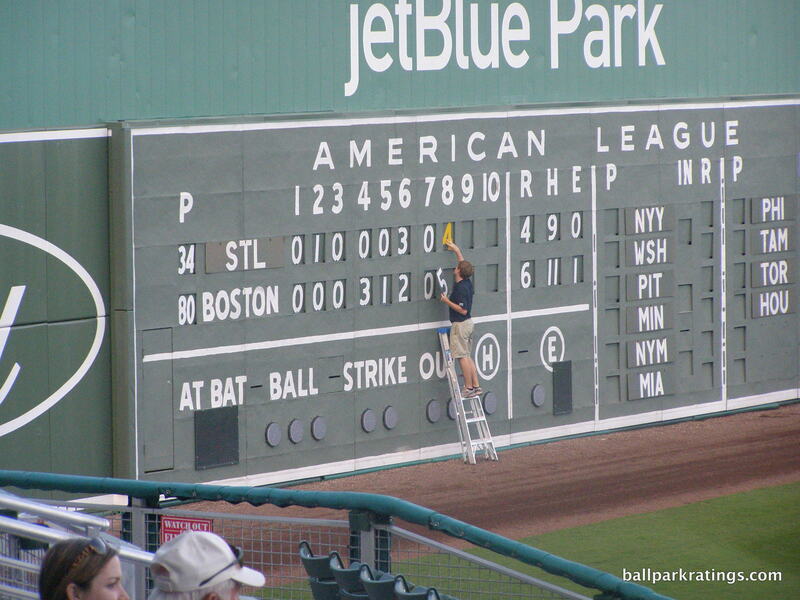 The videoboard isn’t the biggest or brightest today, but it is sufficient. 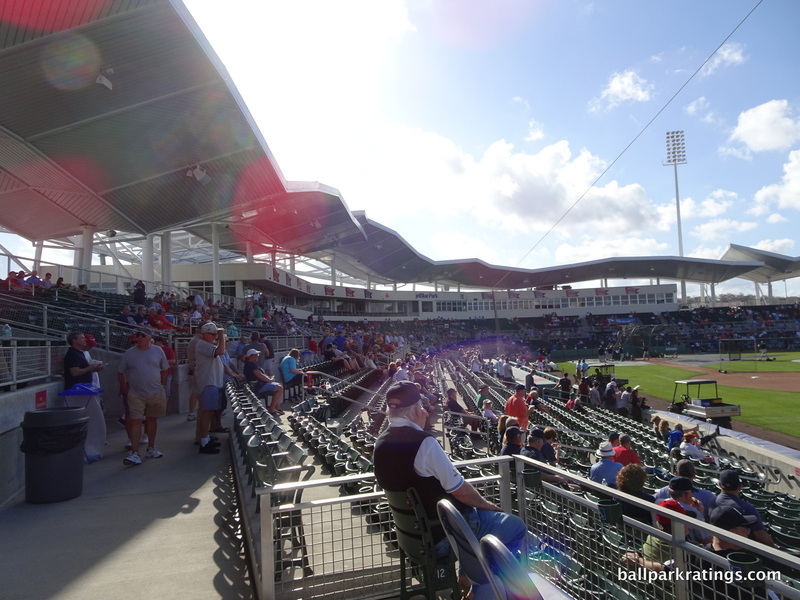 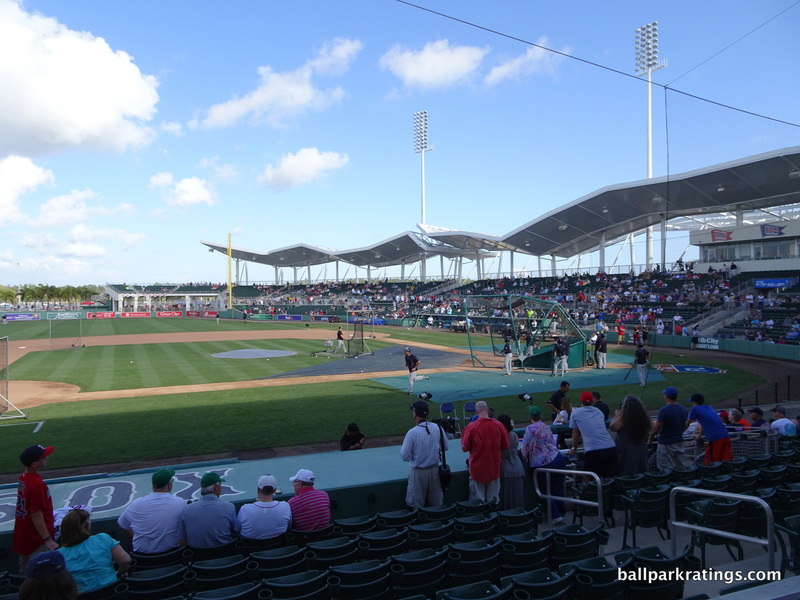 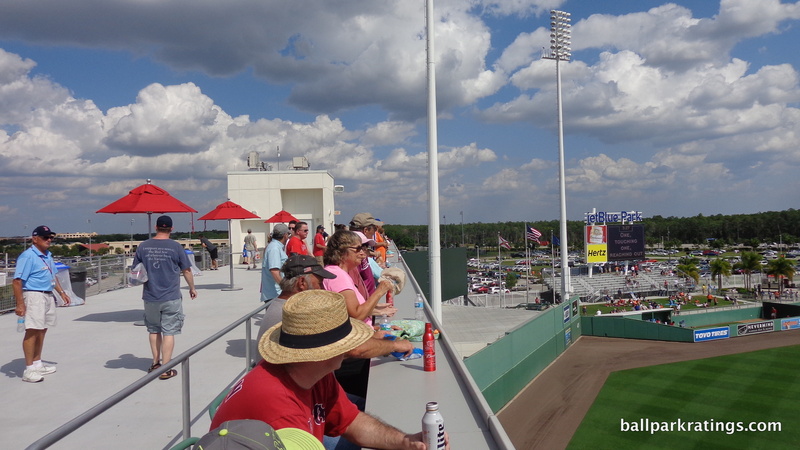 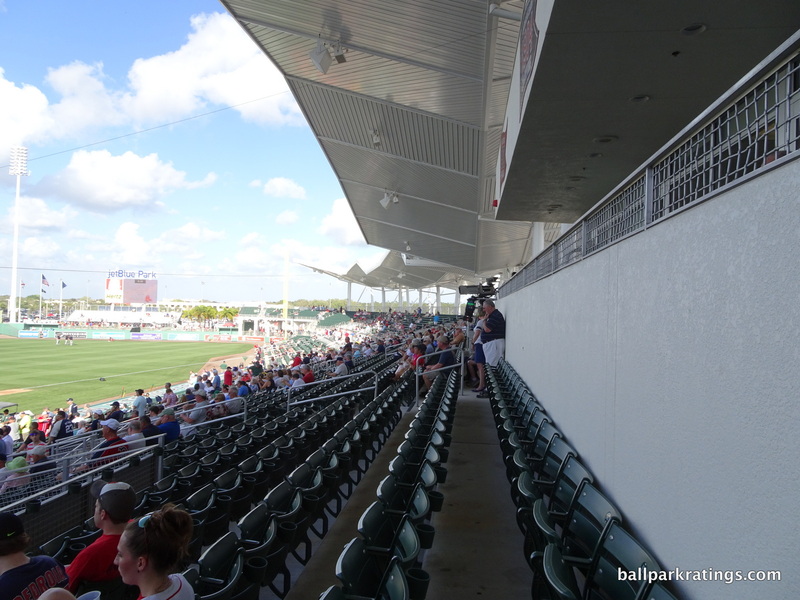 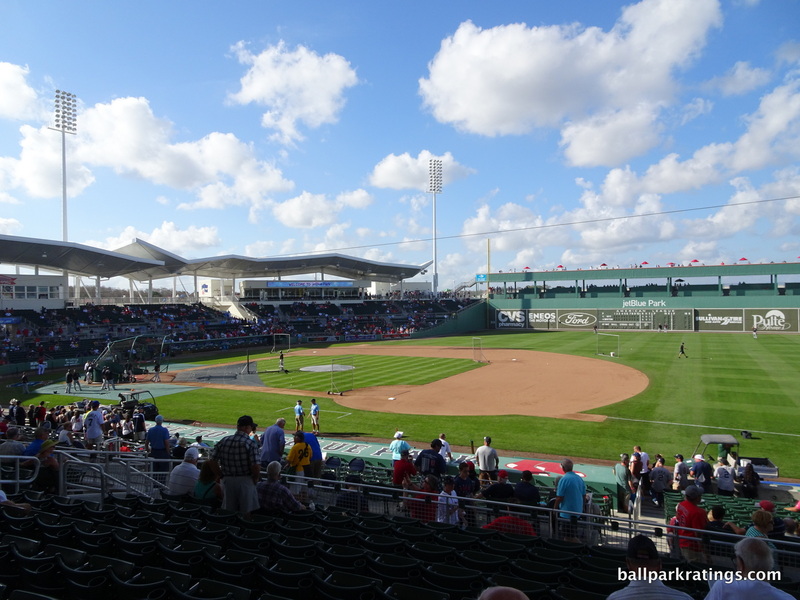 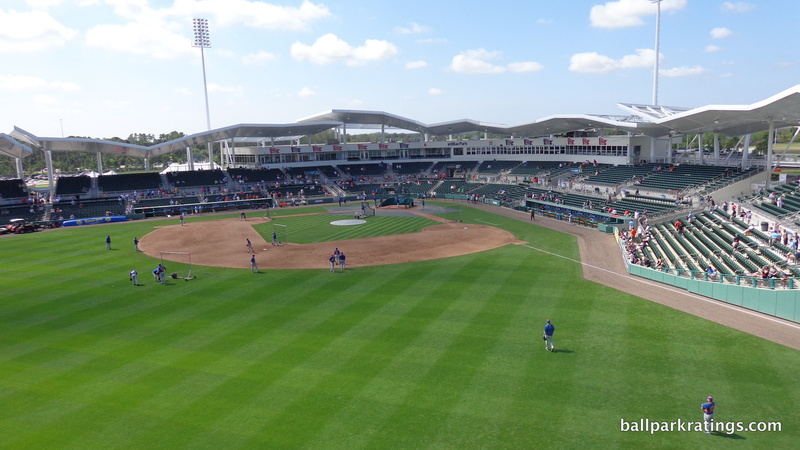 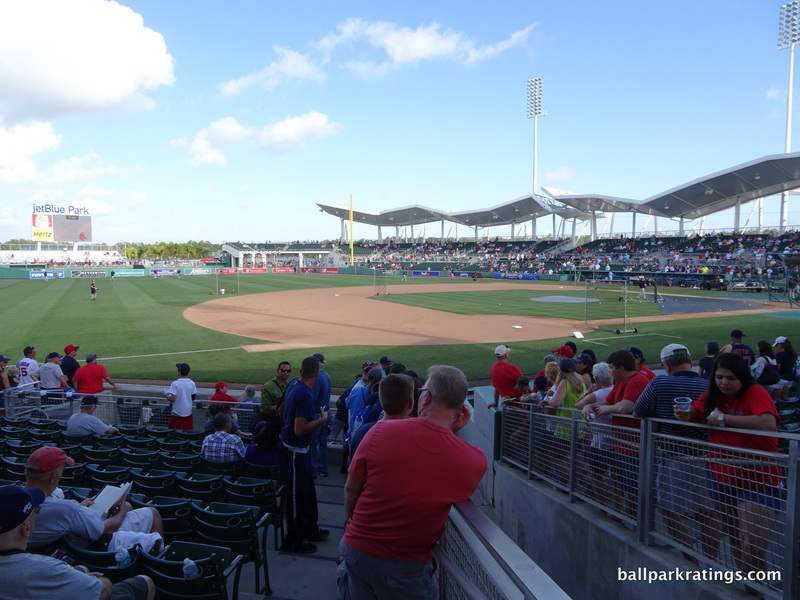 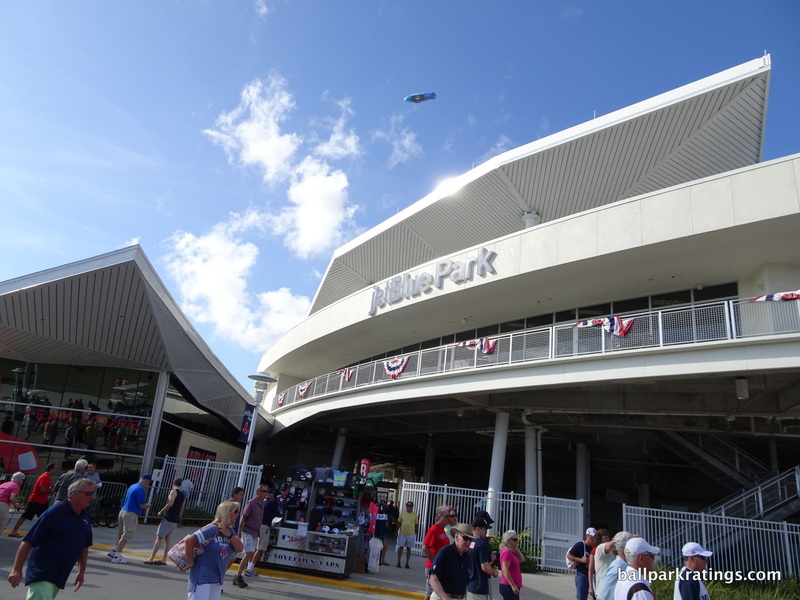 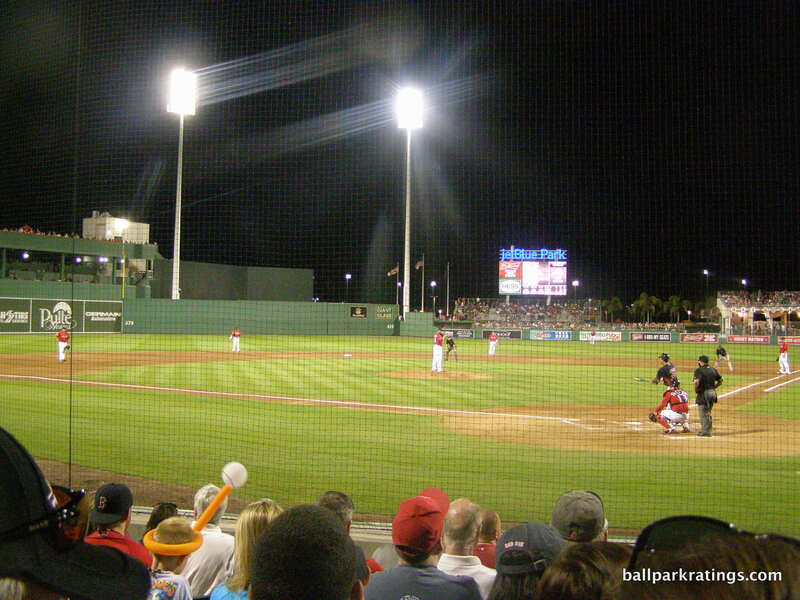 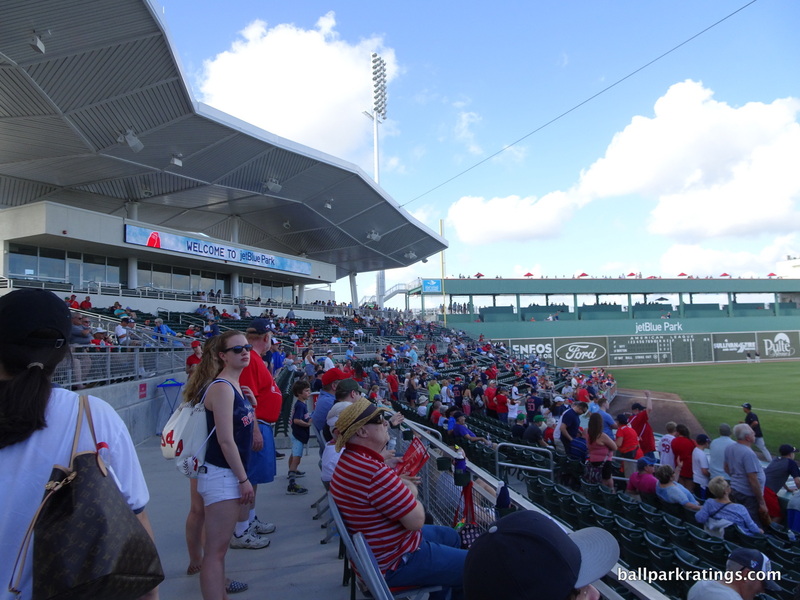 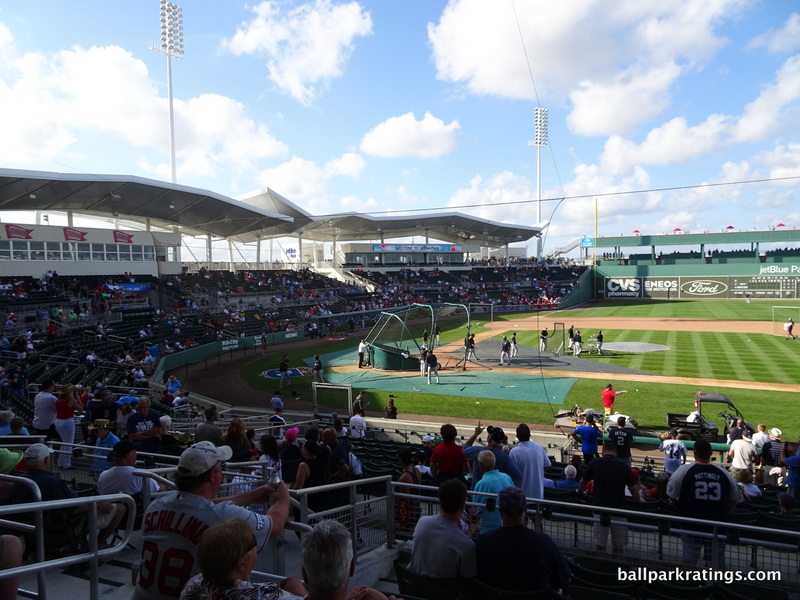 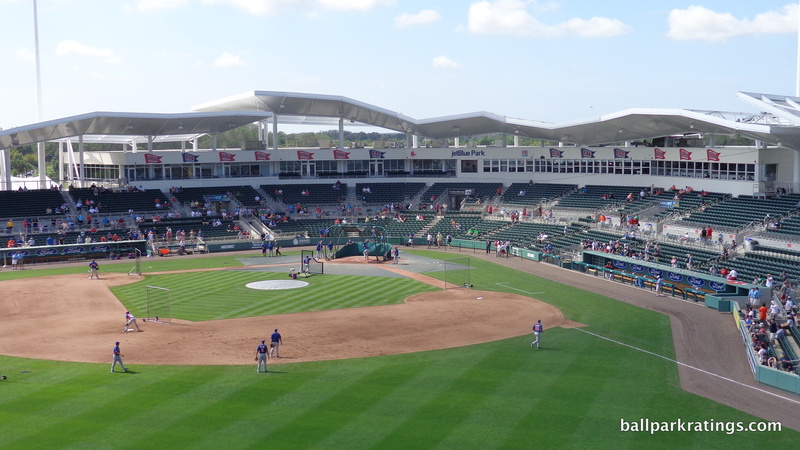 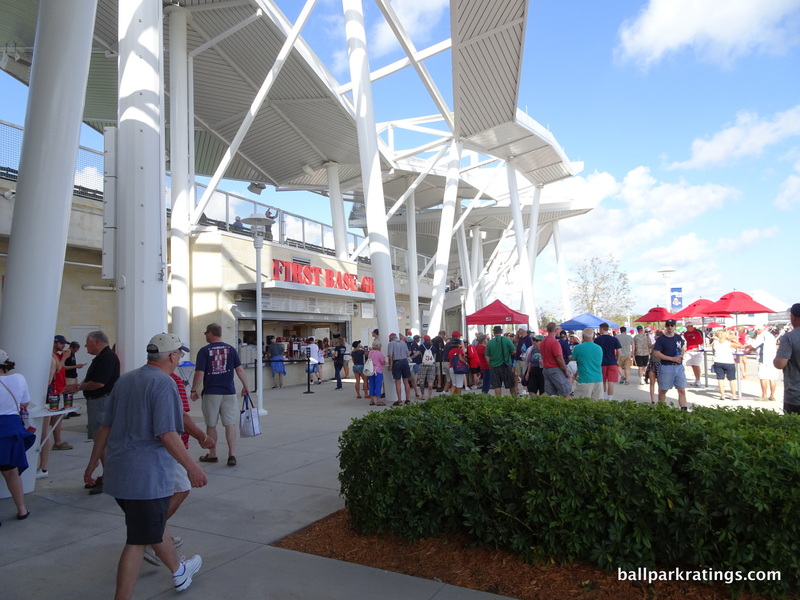 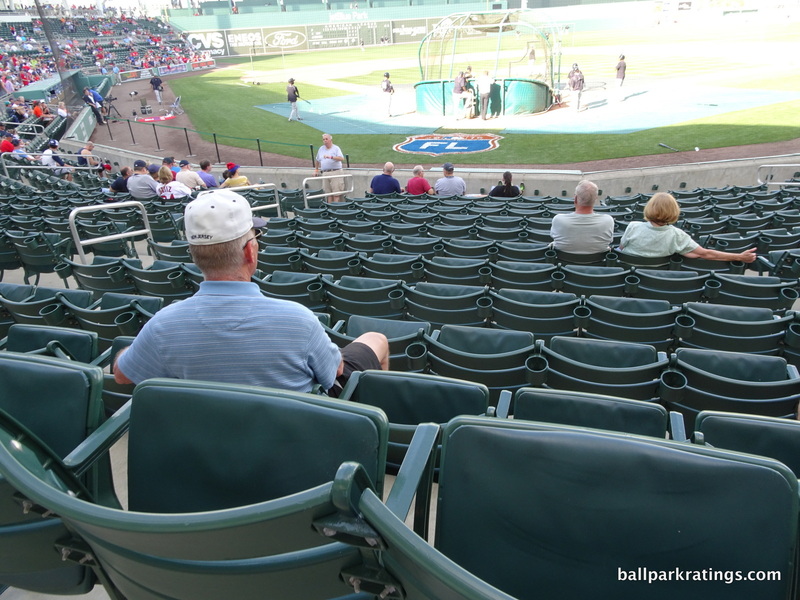 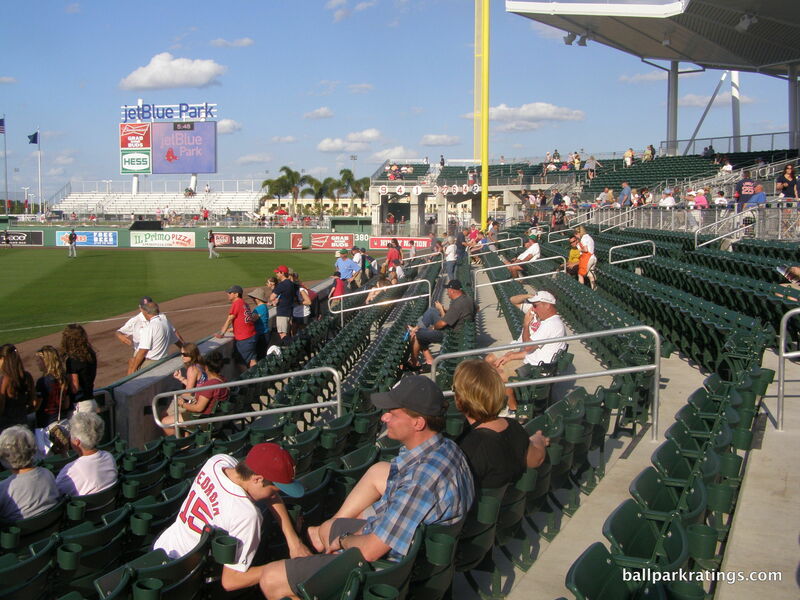 JetBlue Park’s amenities are average, but not great for a new park. 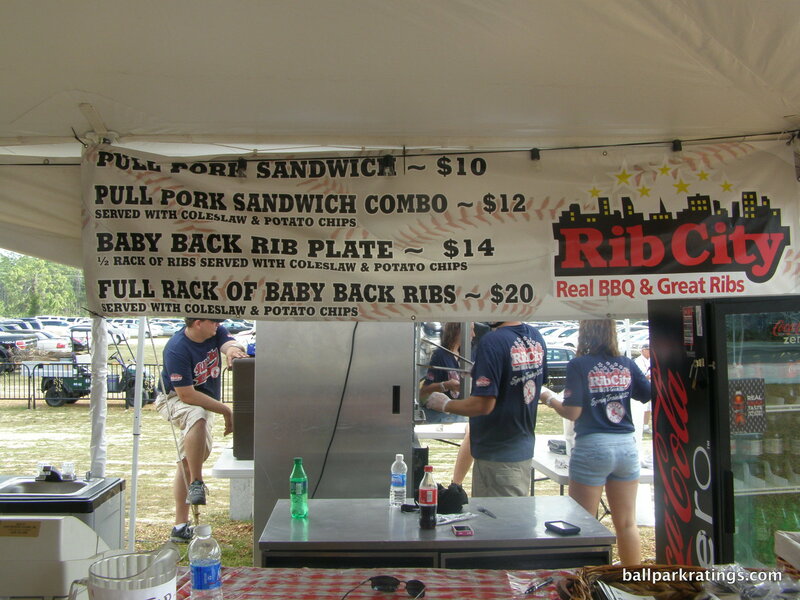 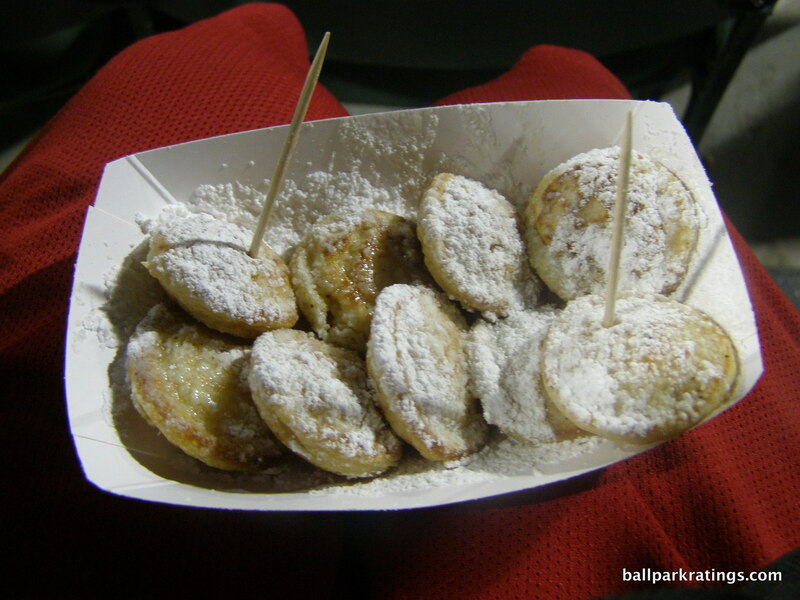 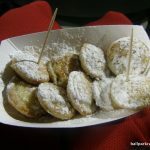 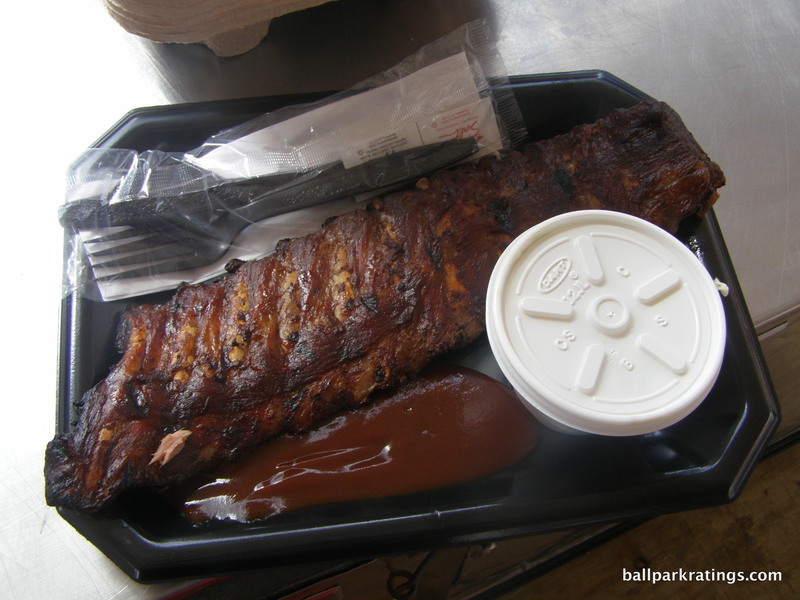 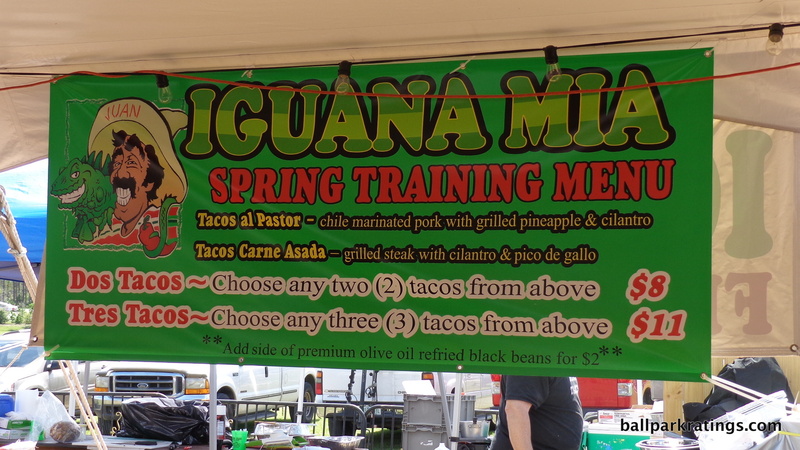 As one of the few Grapefruit League parks to import food from the local area, the concessions are the highlight. 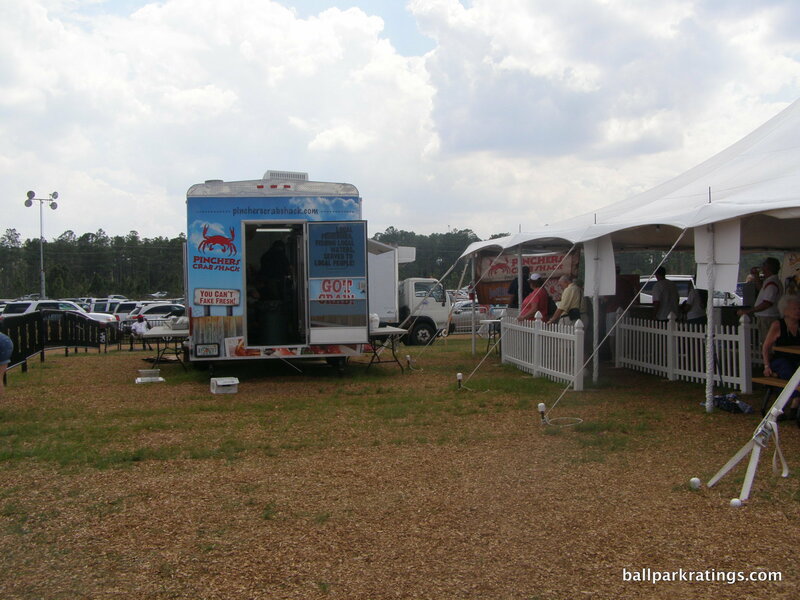 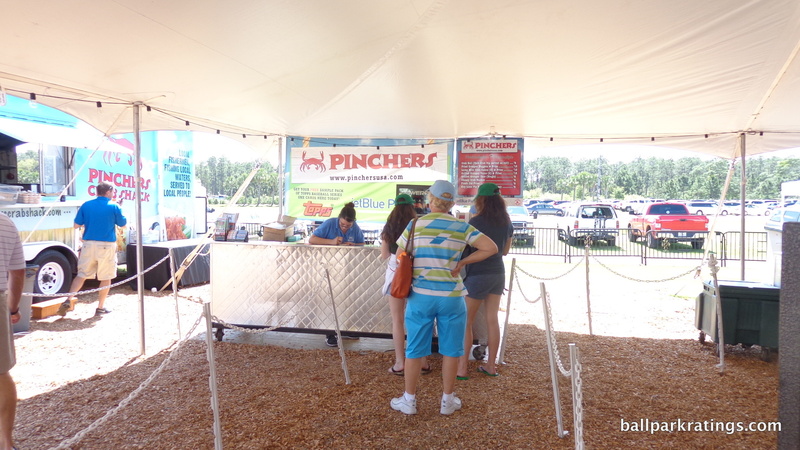 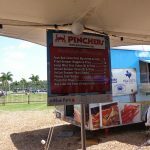 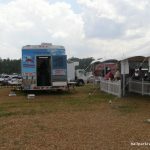 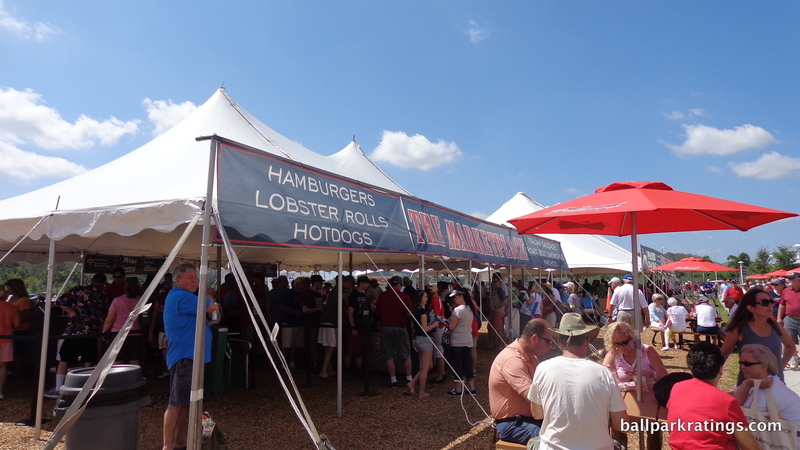 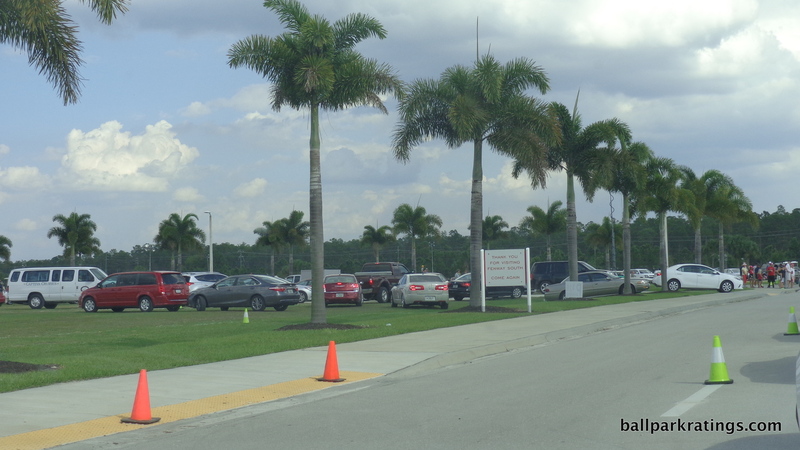 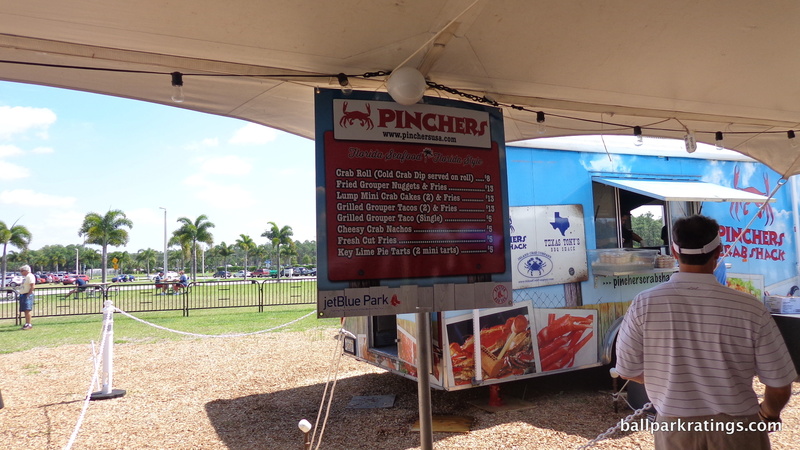 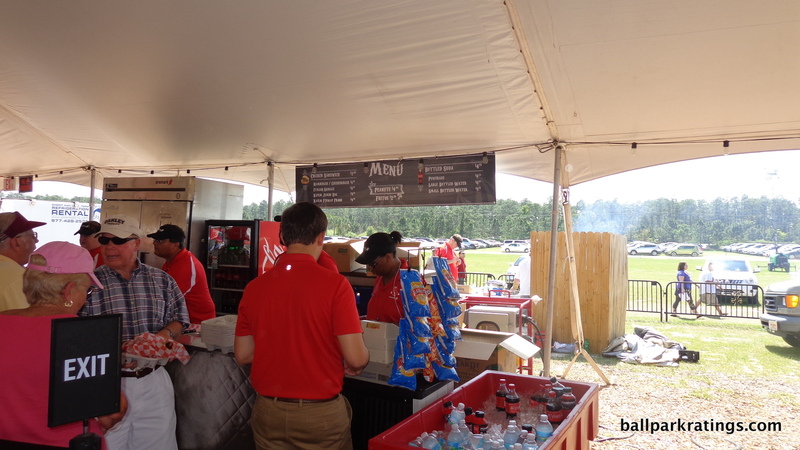 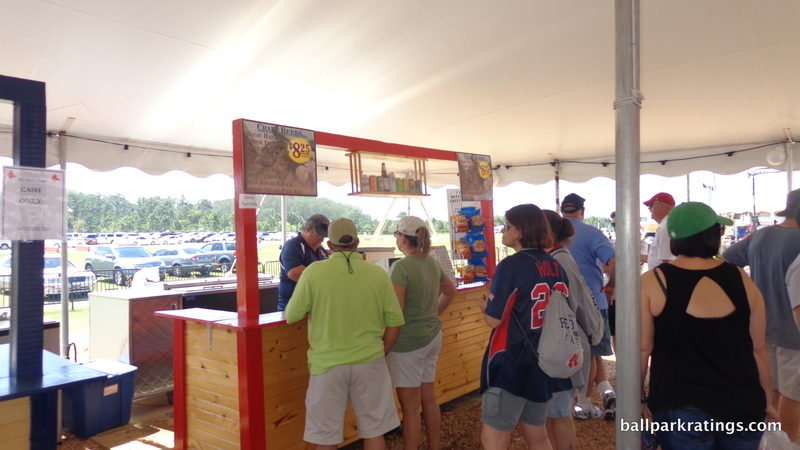 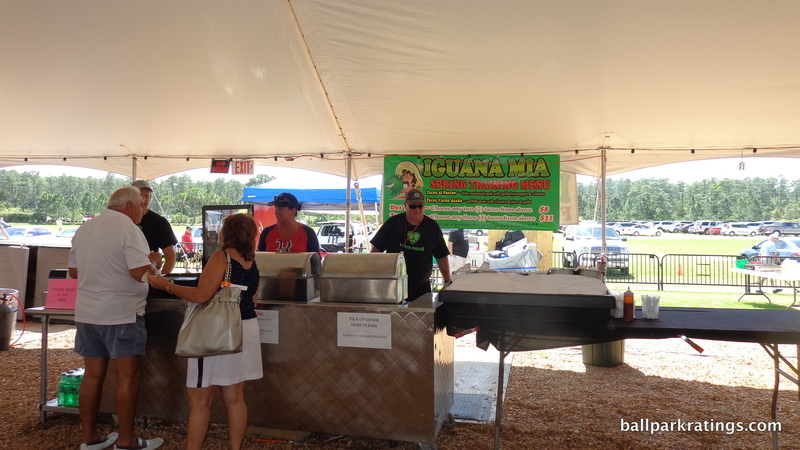 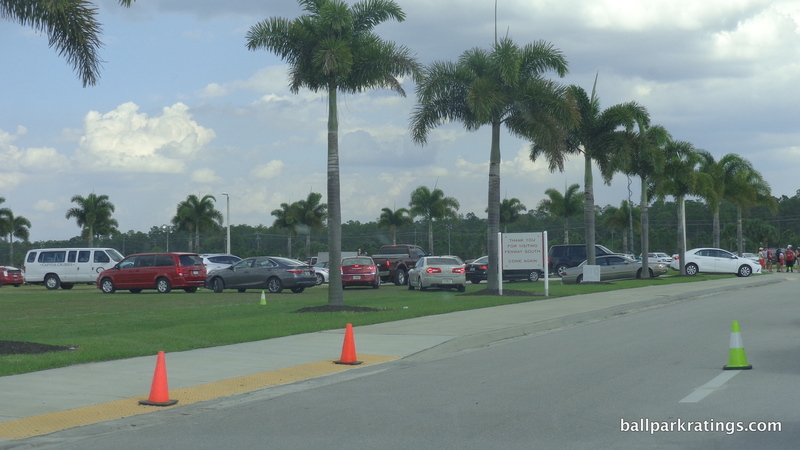 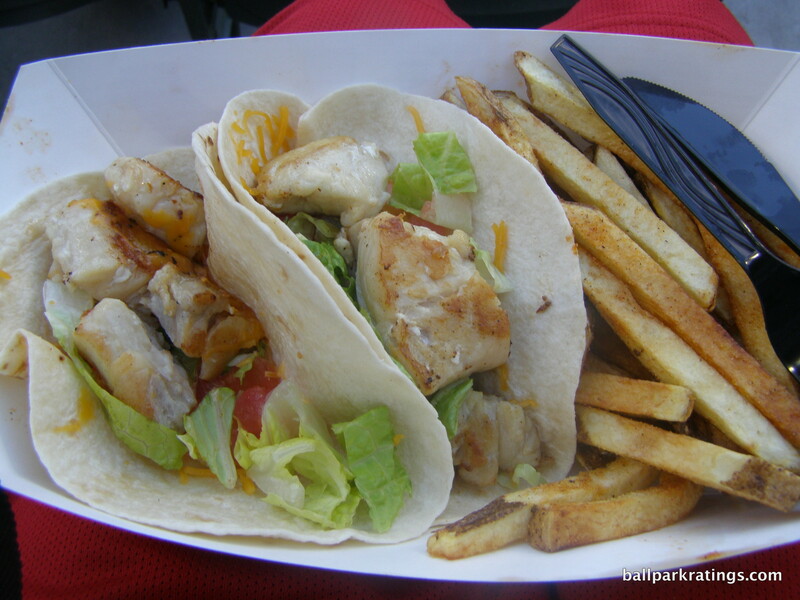 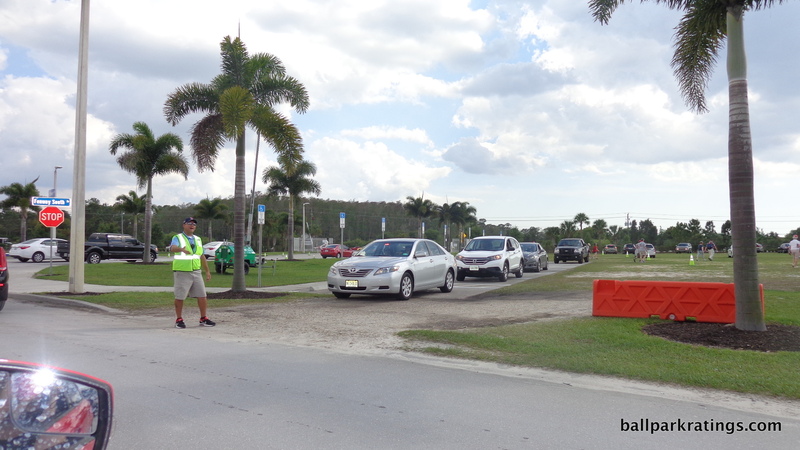 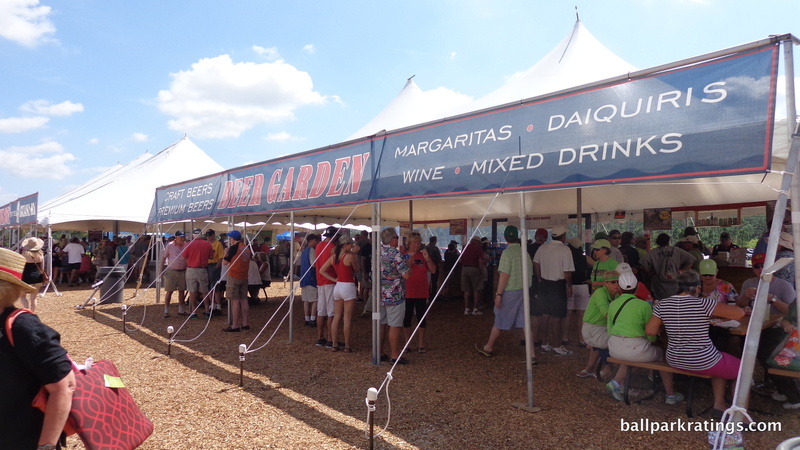 It varies from year-to-year, but food trucks are generally parked in the Food Pavilions on Fenway South Drive. 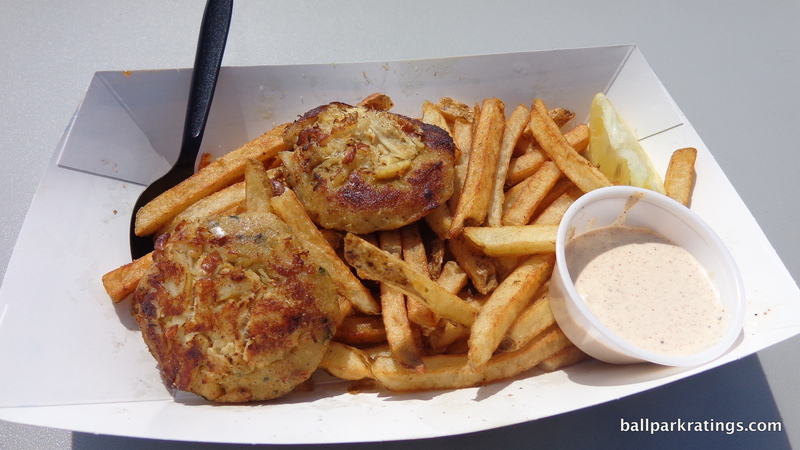 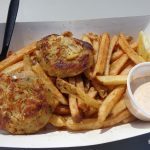 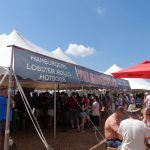 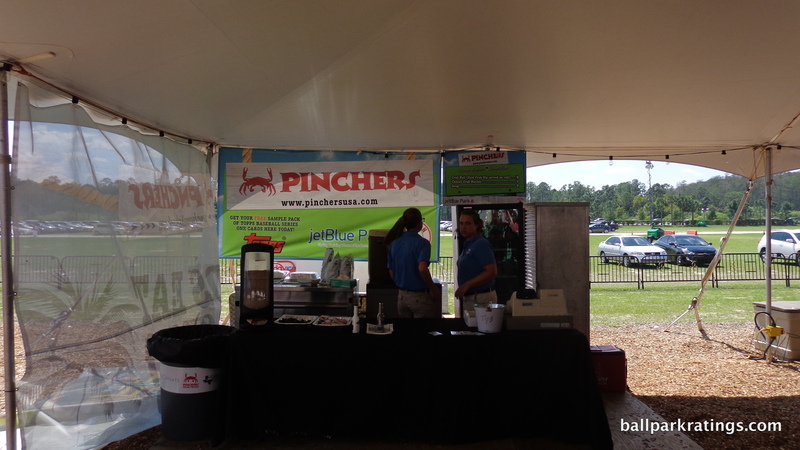 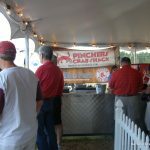 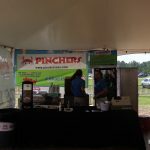 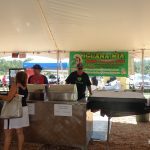 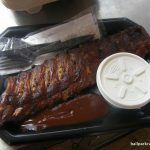 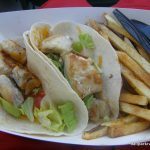 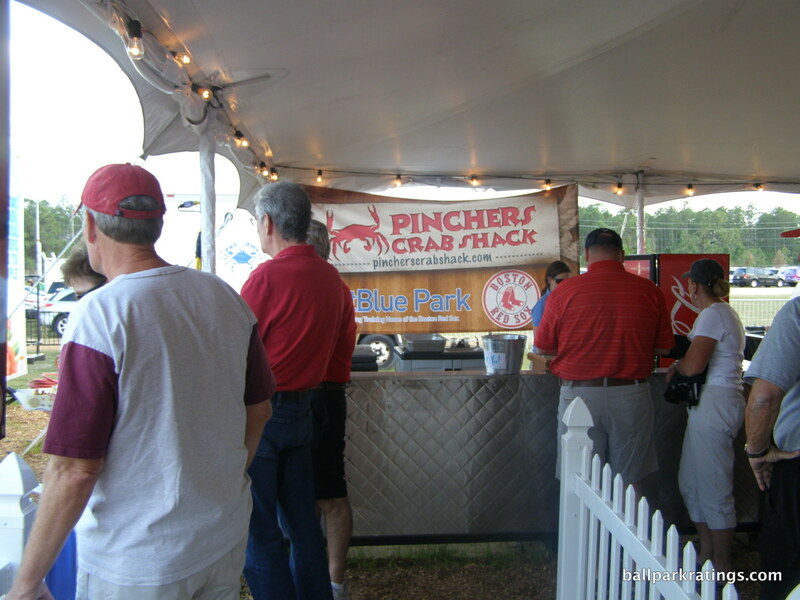 Along with wraps, chowder, and lobster rolls, past delicacies include seafood from Pinchers Crab Shack, BBQ from Rib City, and Mexican from Iguana Mia. 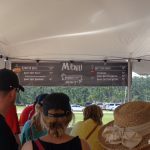 Local food was dramatically scaled back in 2017, which I hope was an aberration. 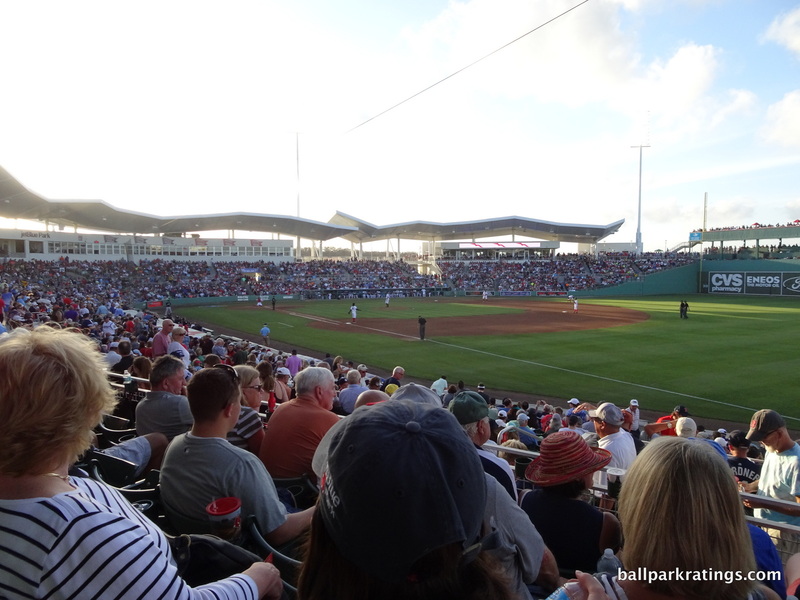 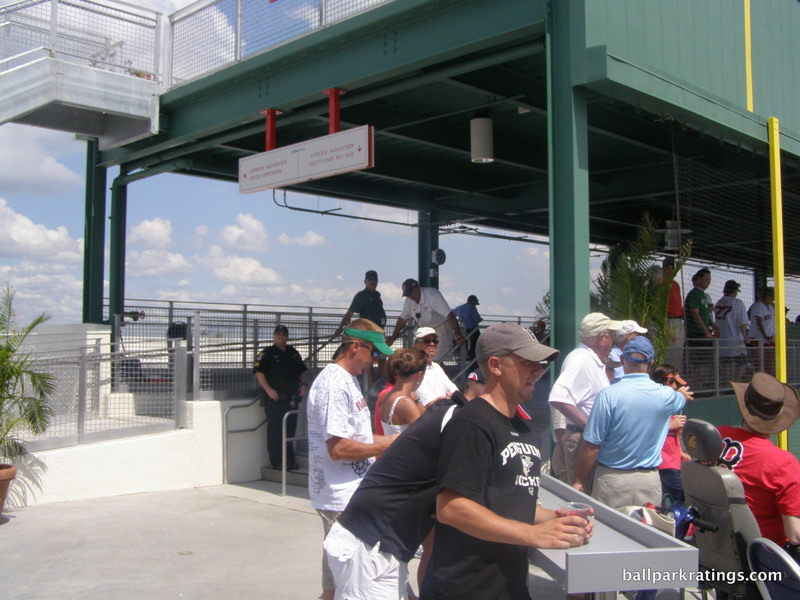 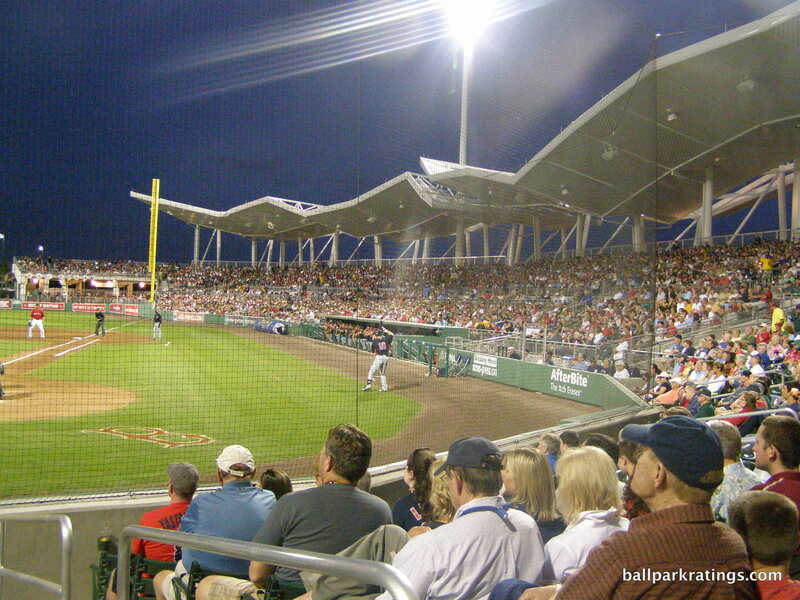 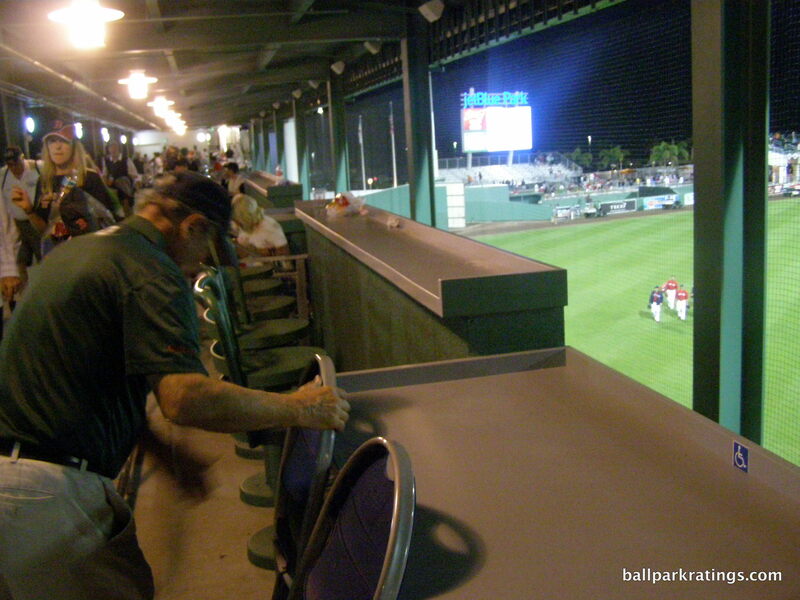 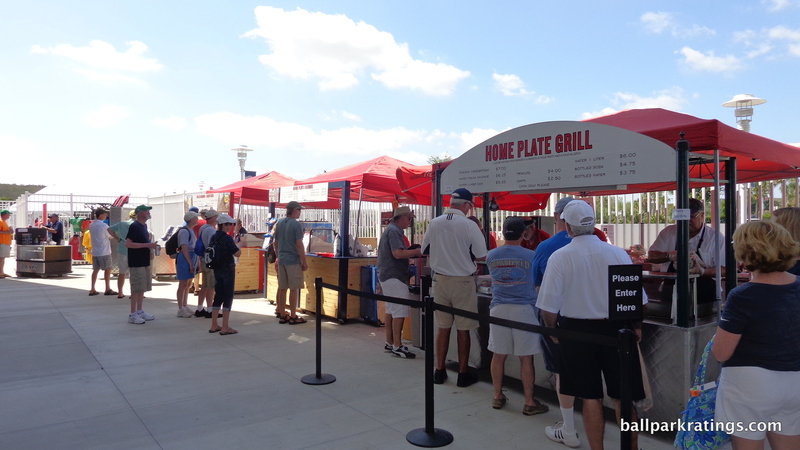 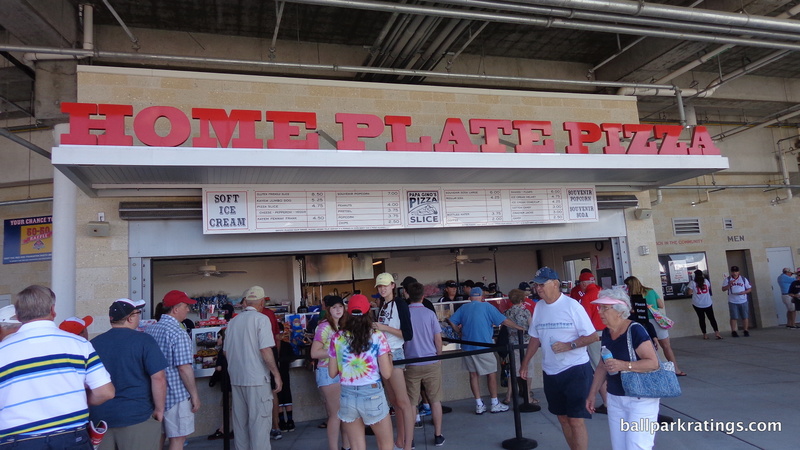 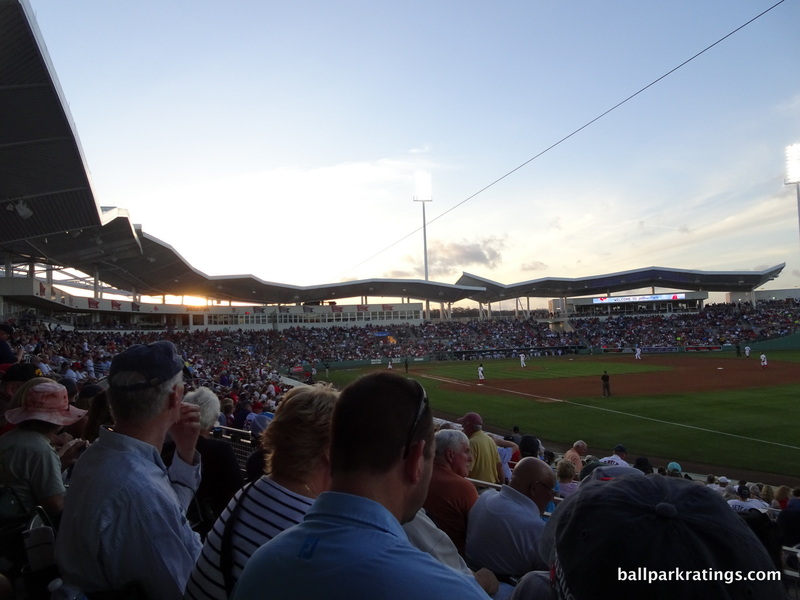 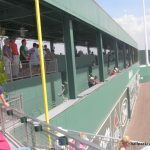 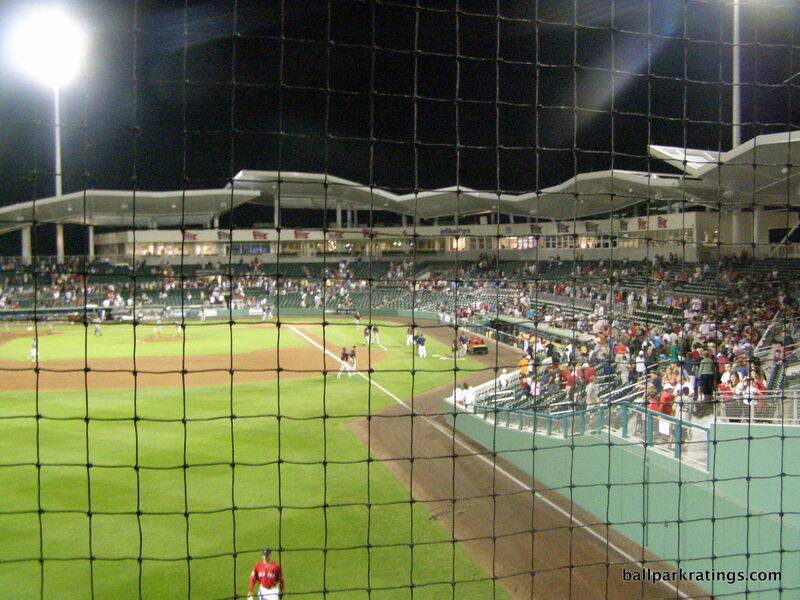 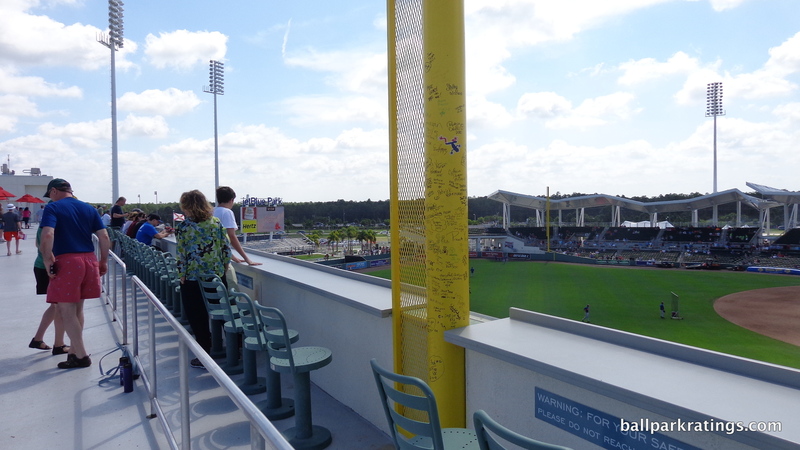 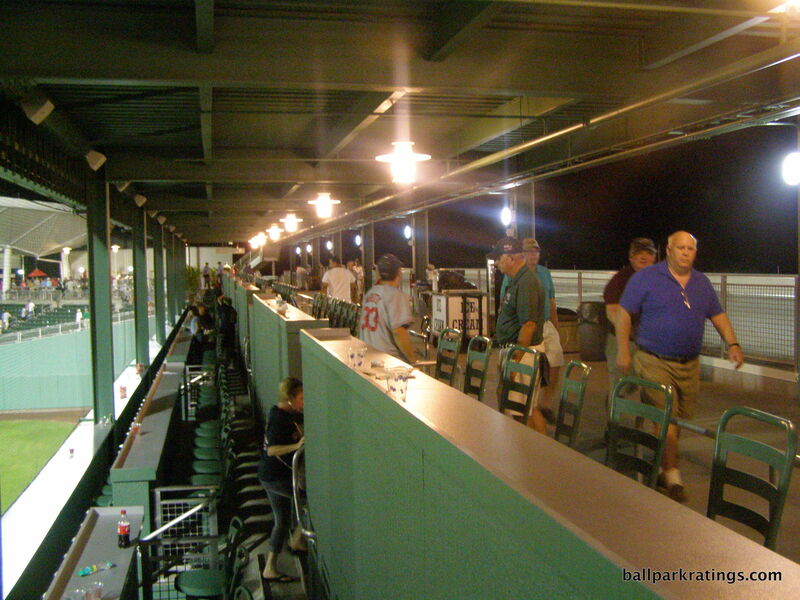 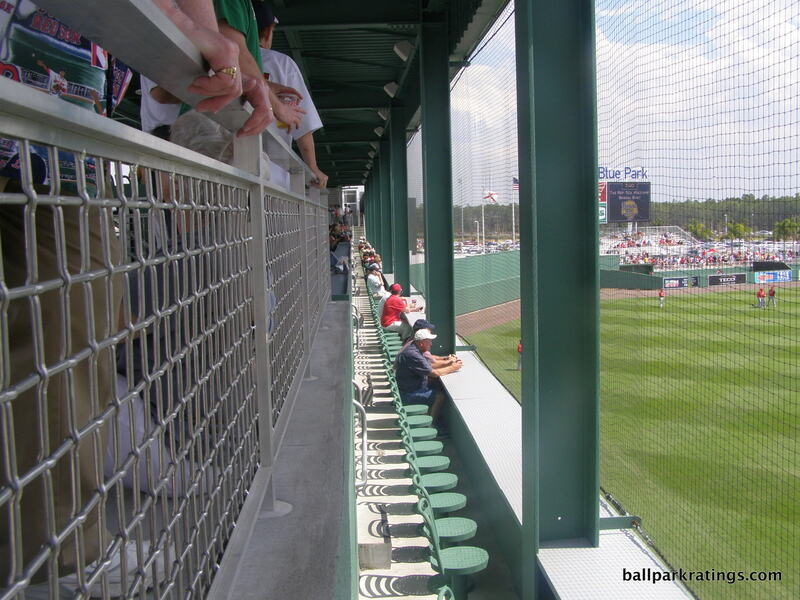 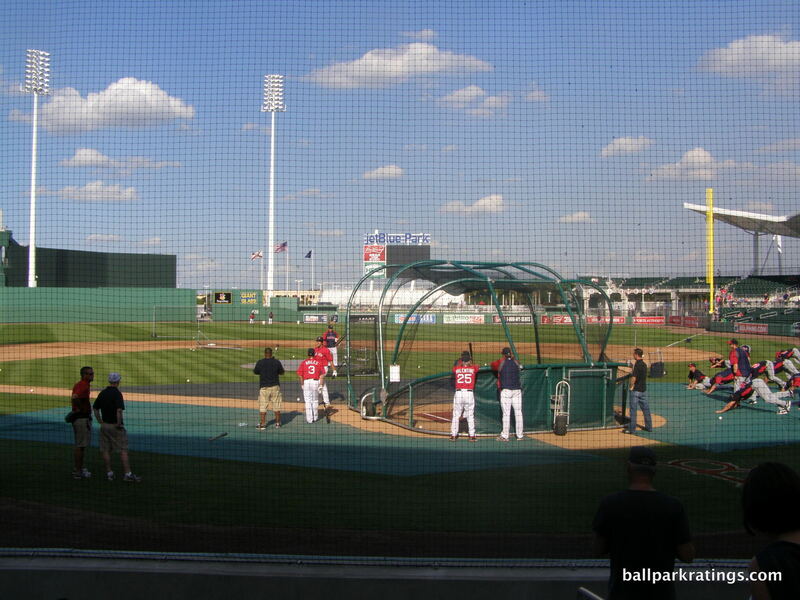 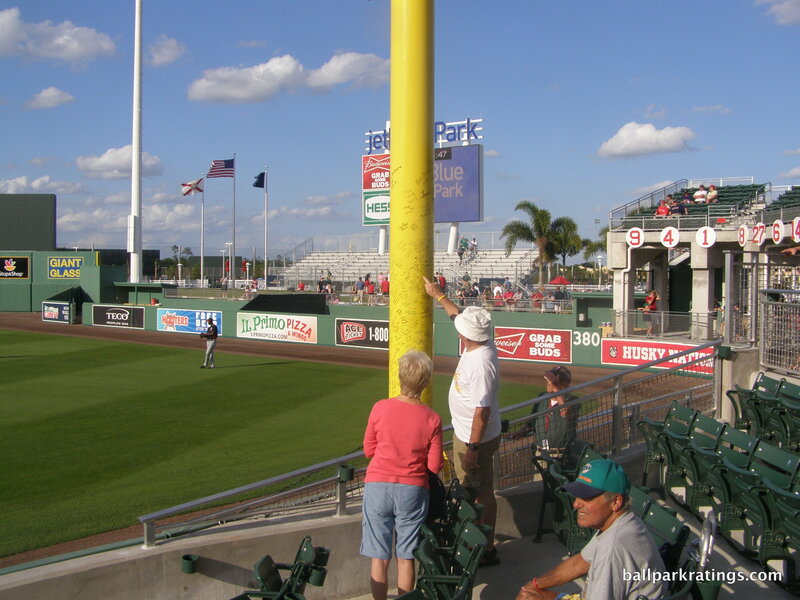 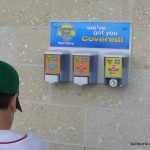 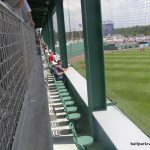 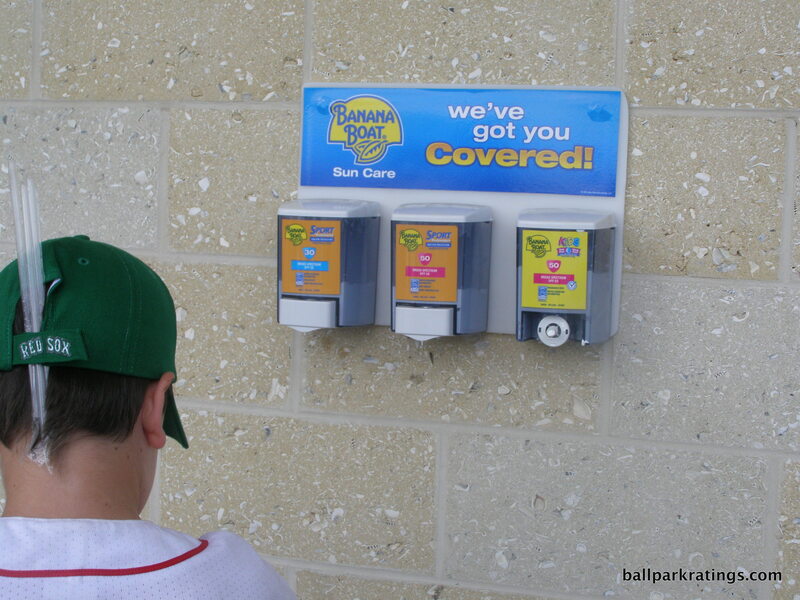 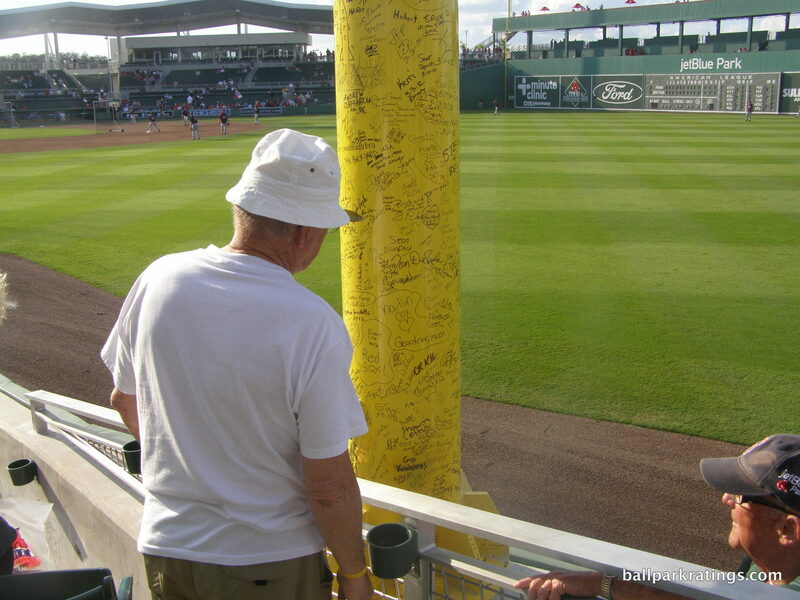 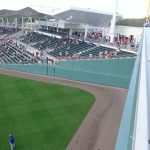 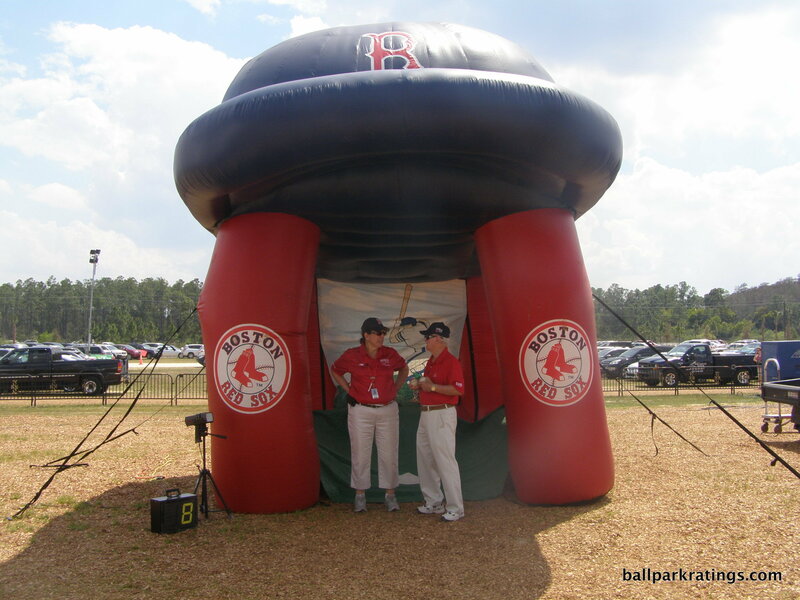 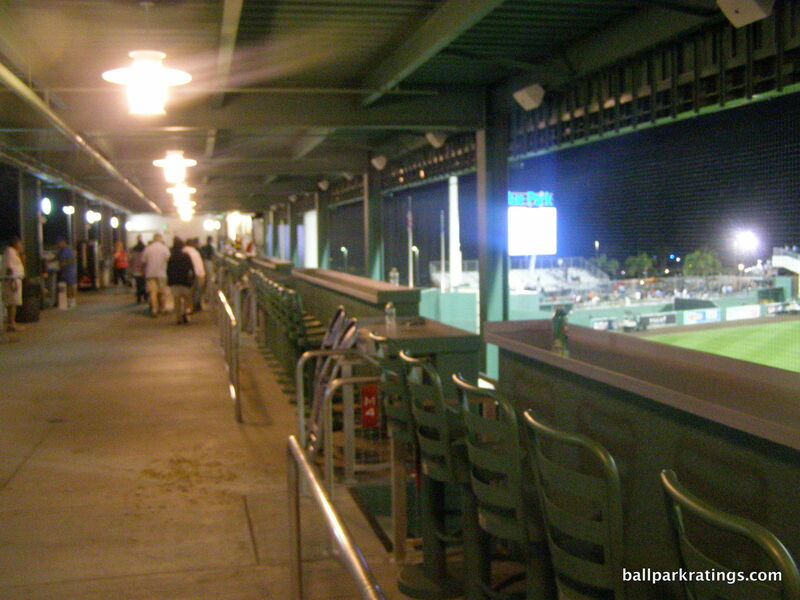 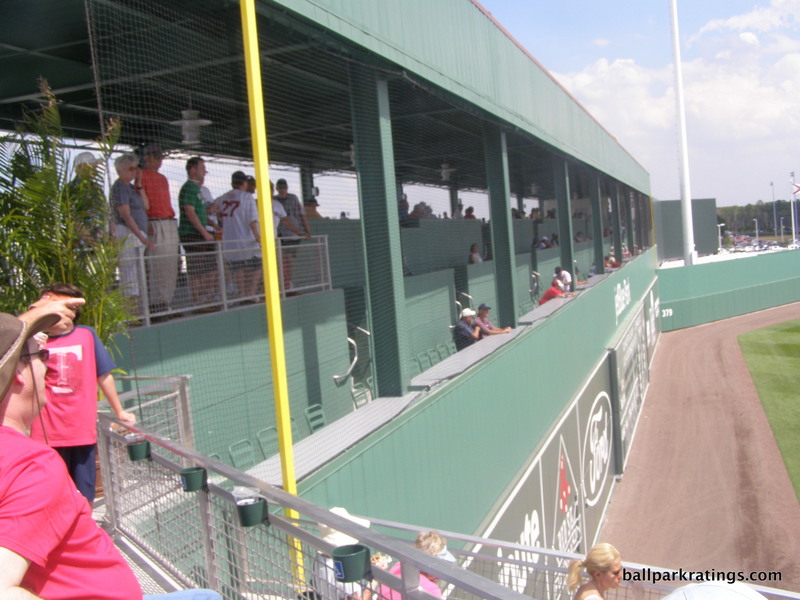 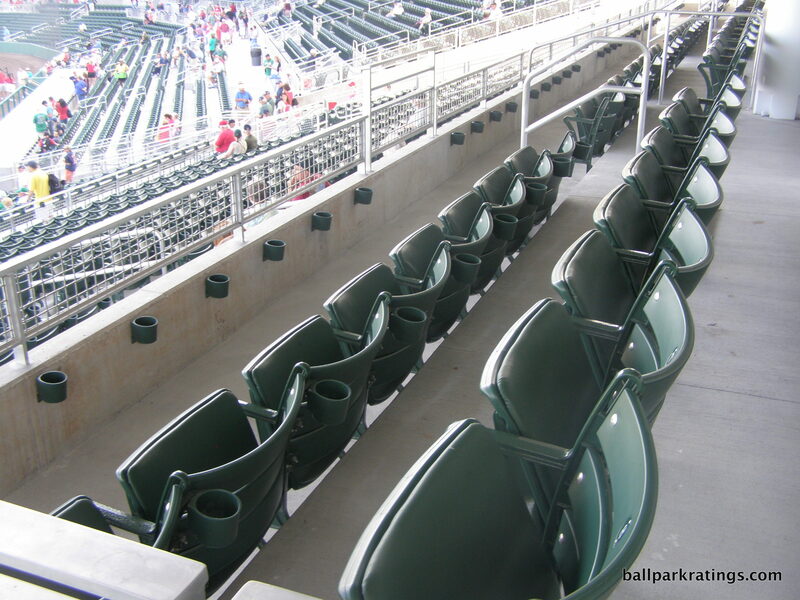 Red Sox spring training doesn’t possess those extra fan amenities of other new ballparks that go above and beyond. 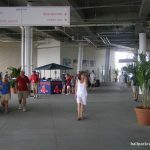 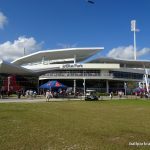 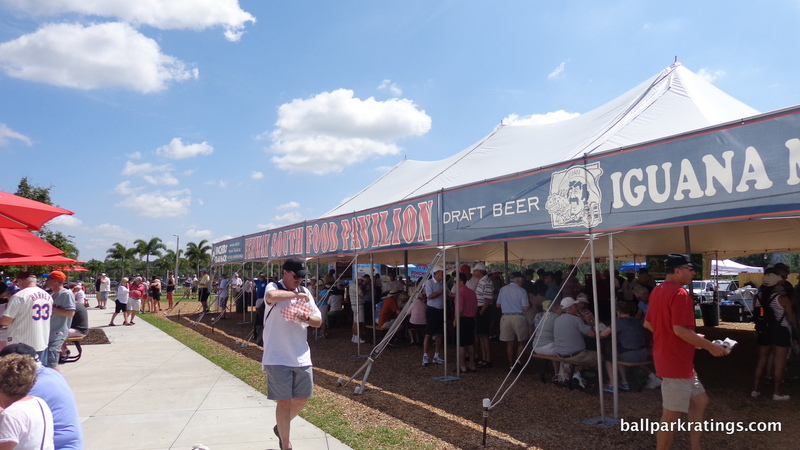 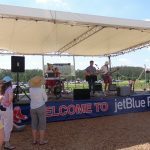 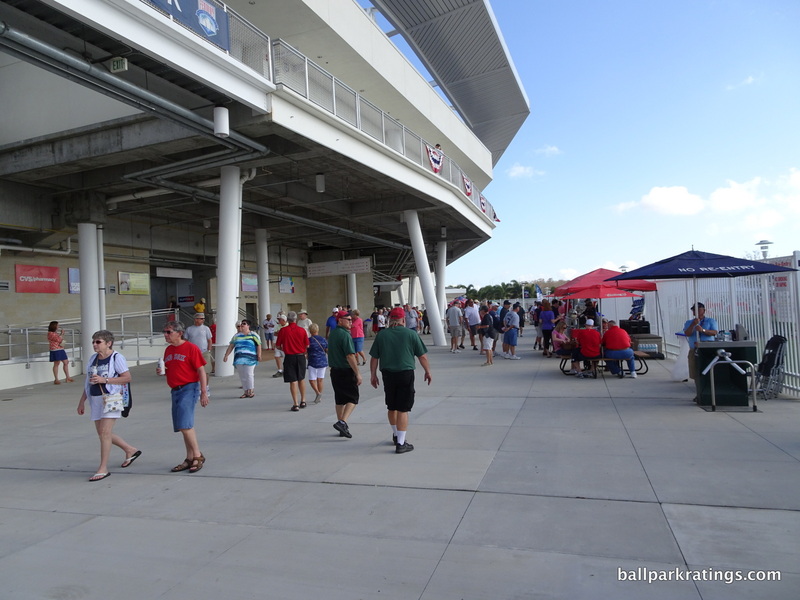 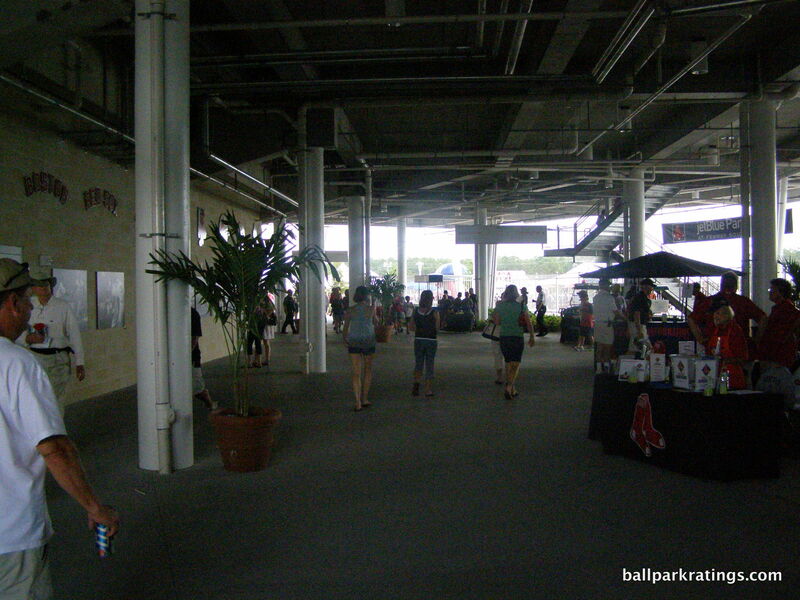 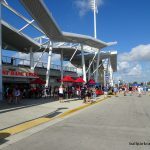 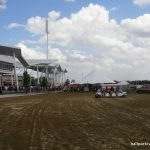 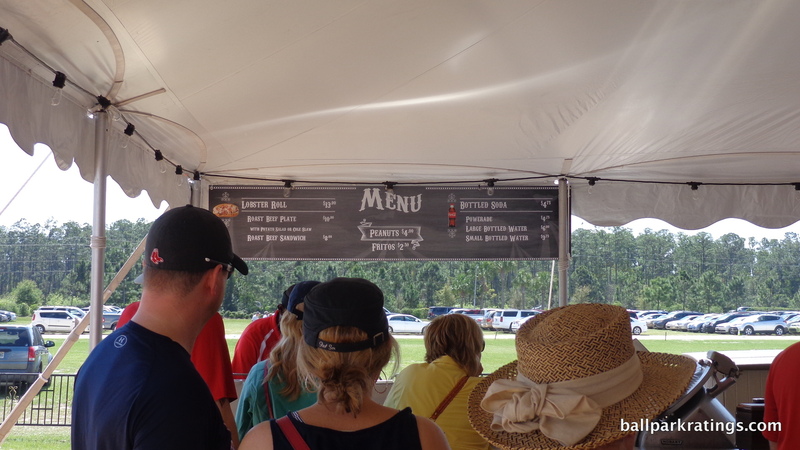 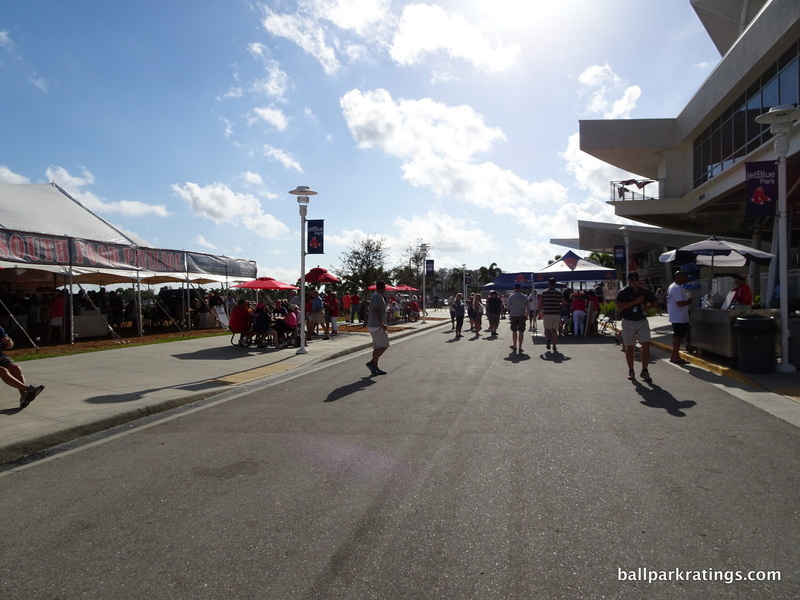 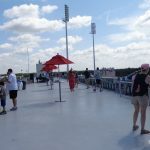 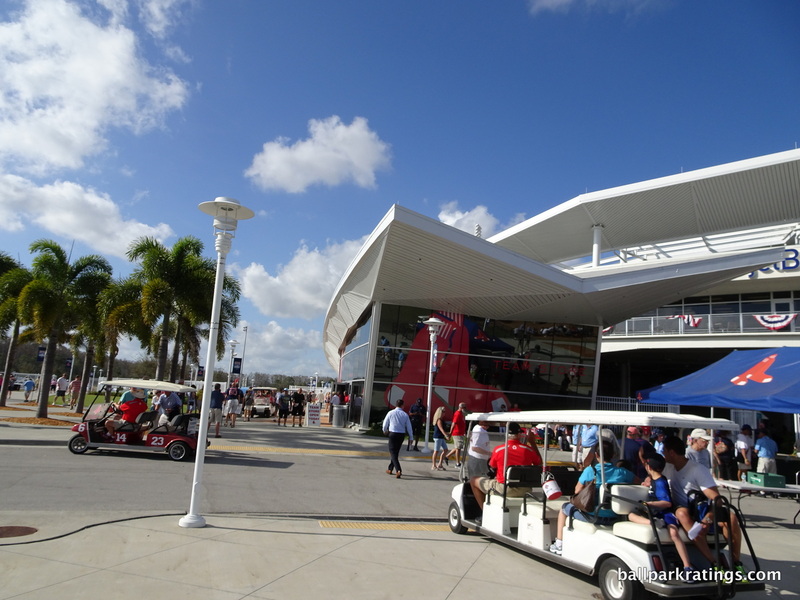 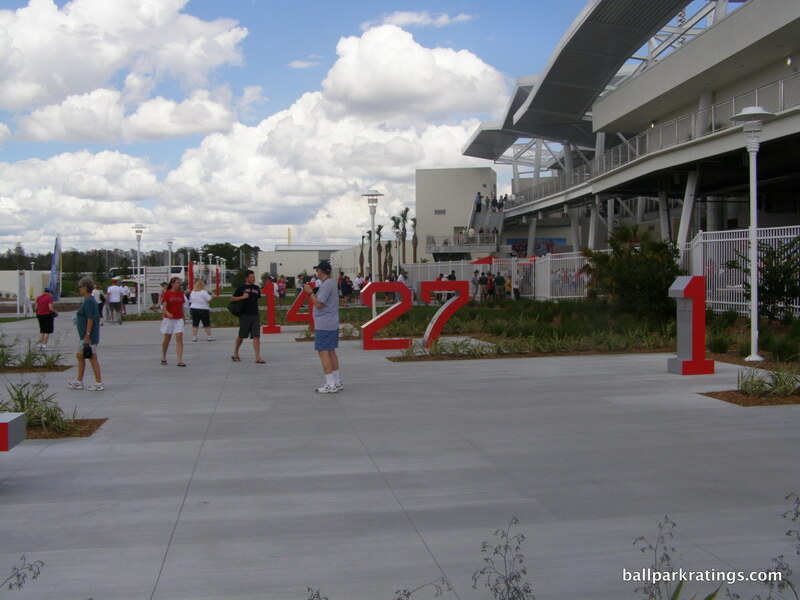 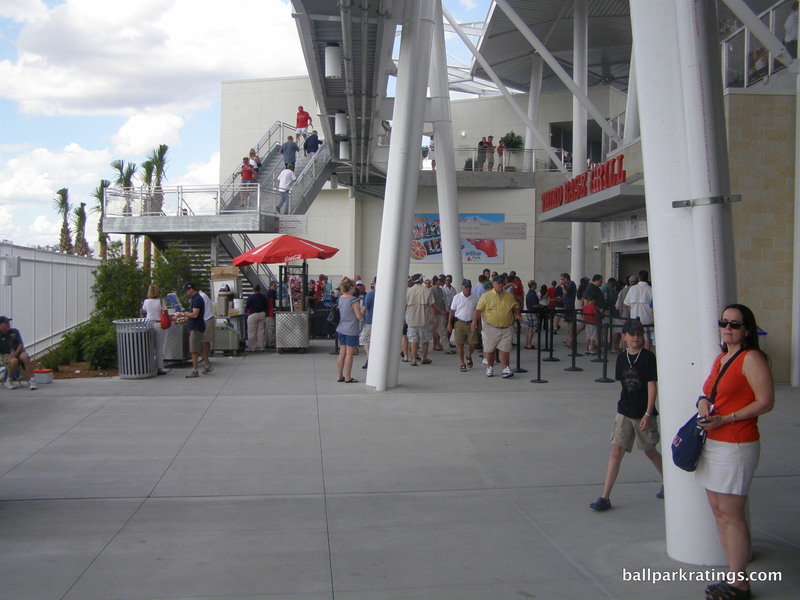 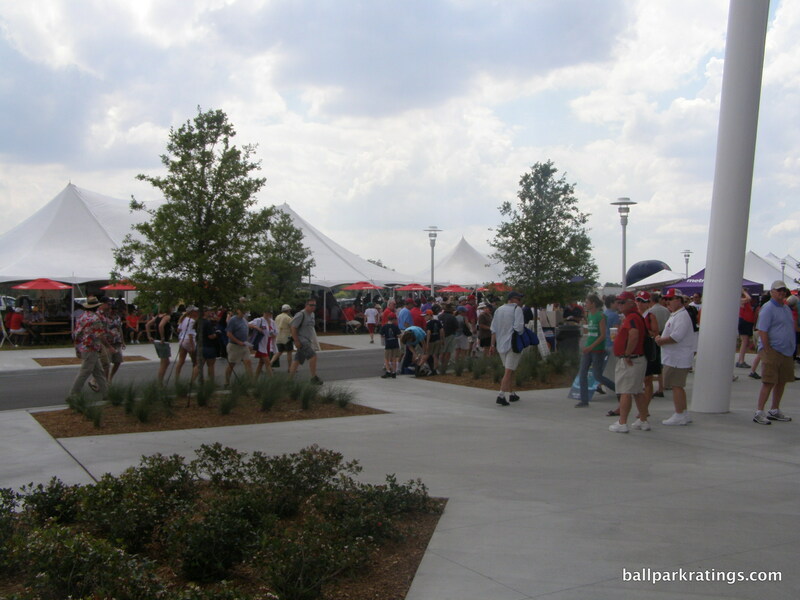 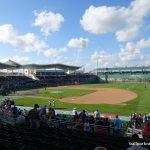 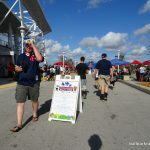 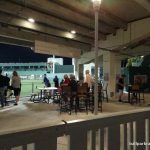 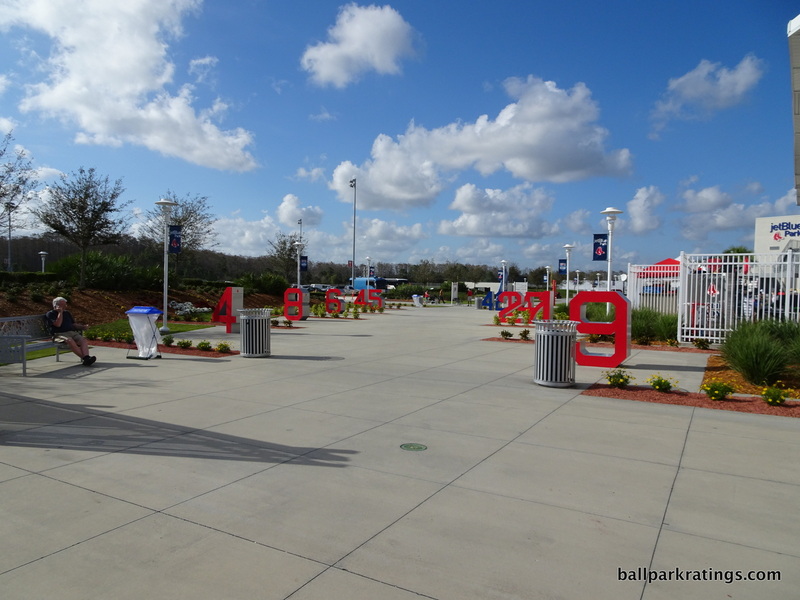 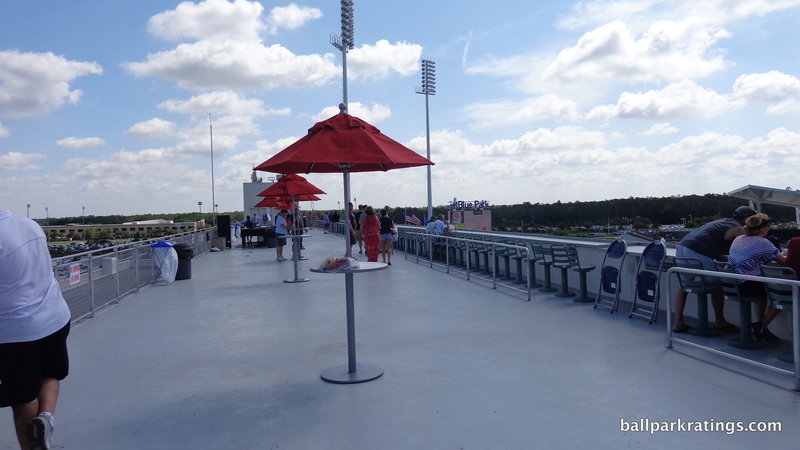 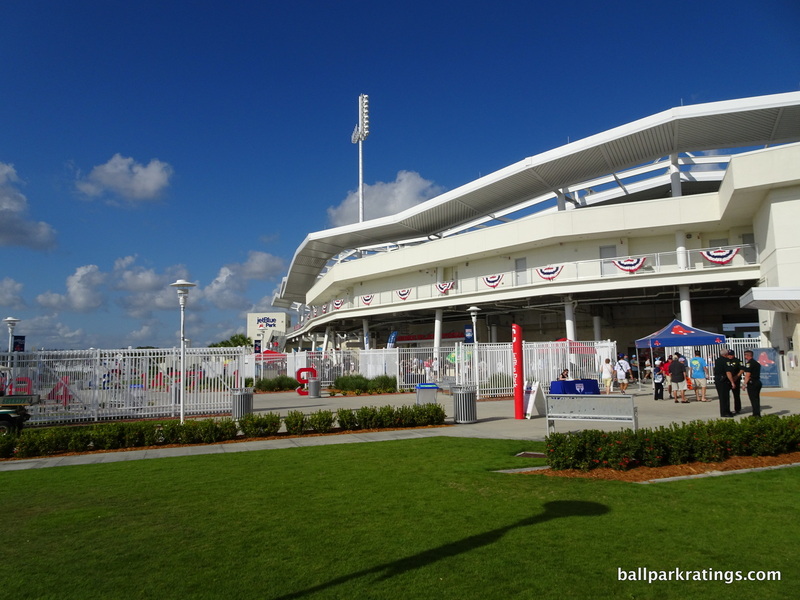 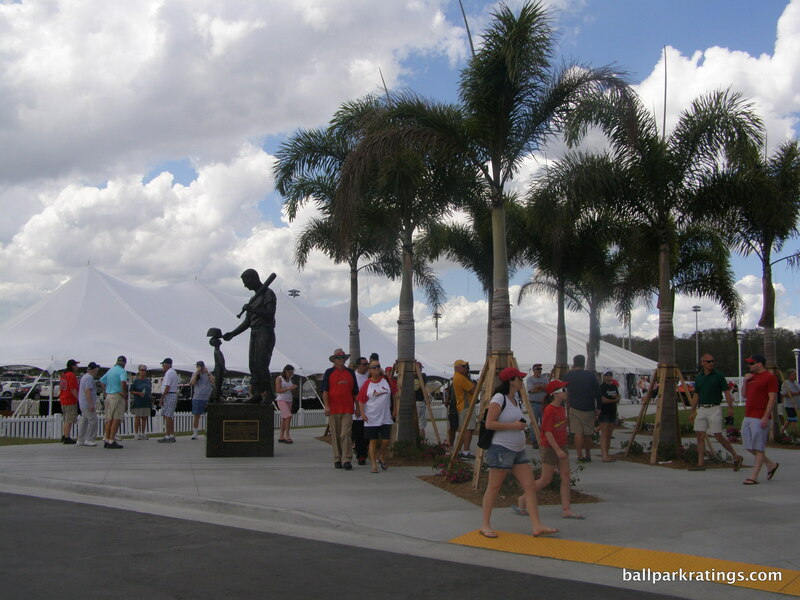 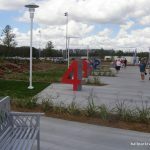 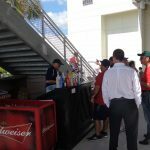 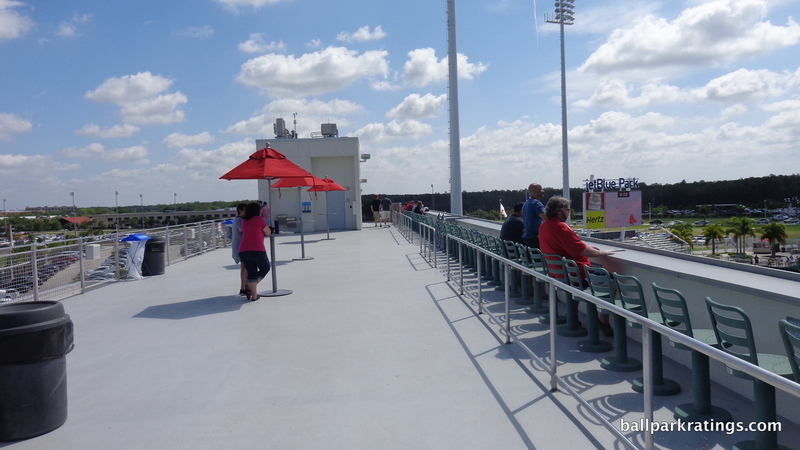 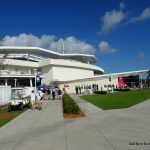 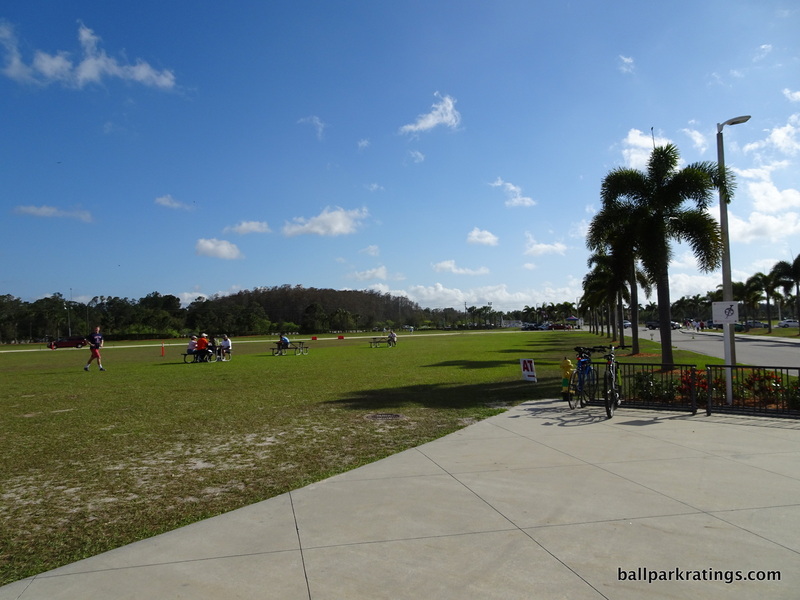 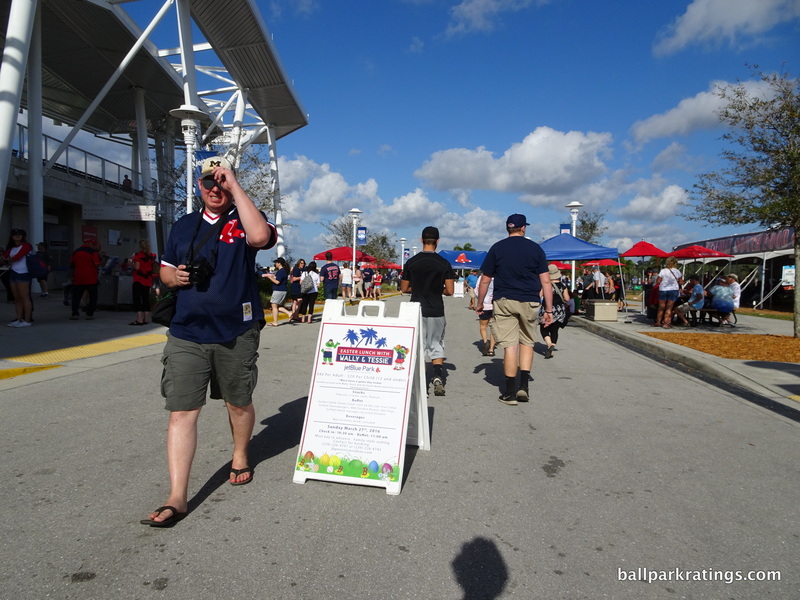 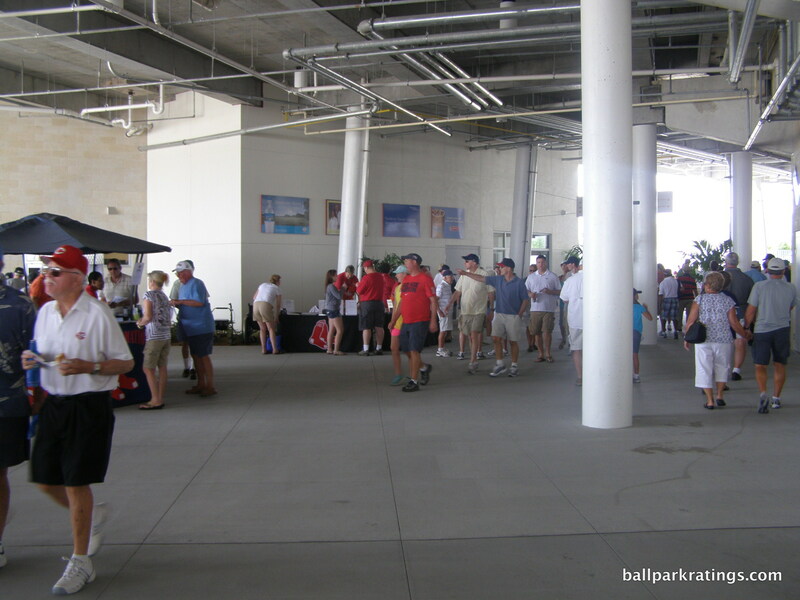 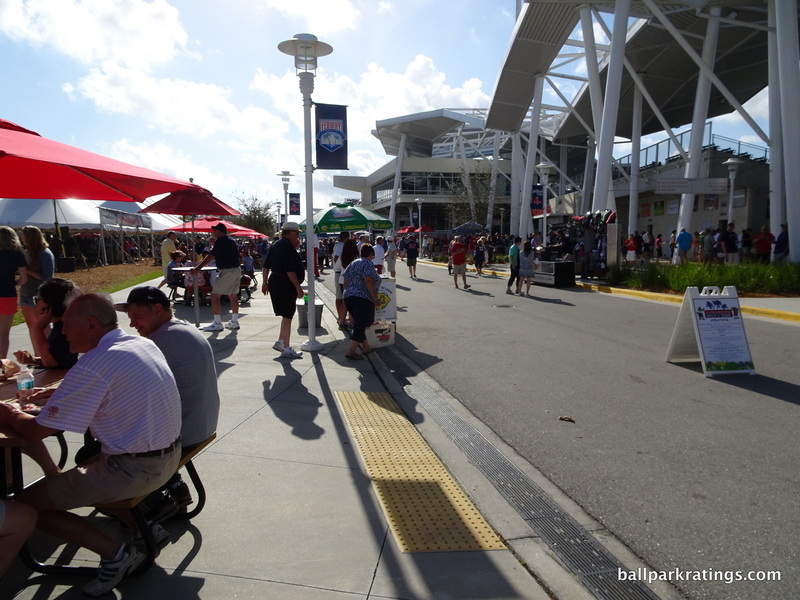 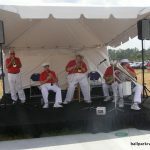 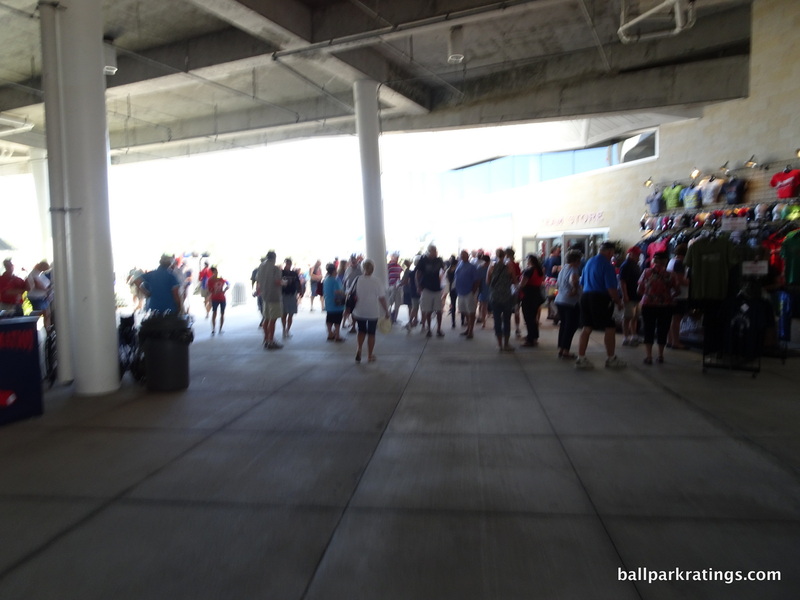 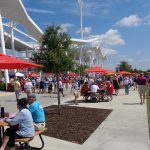 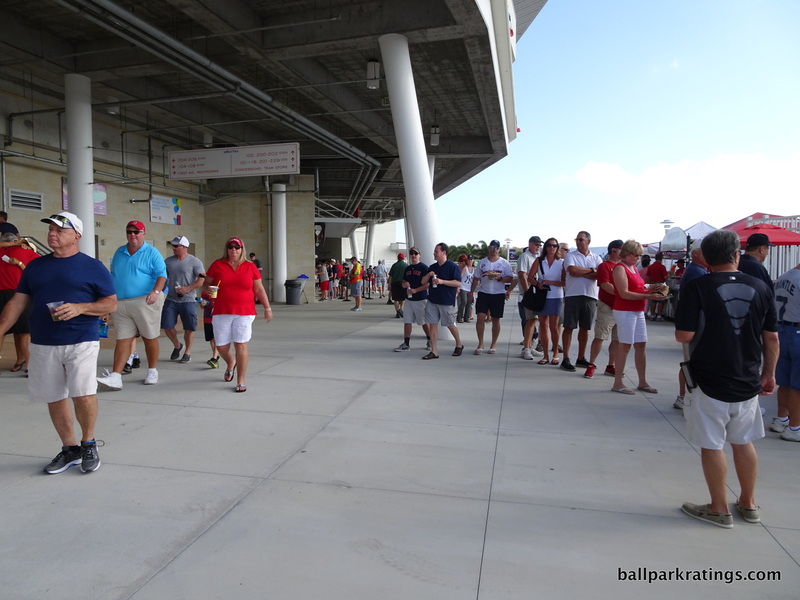 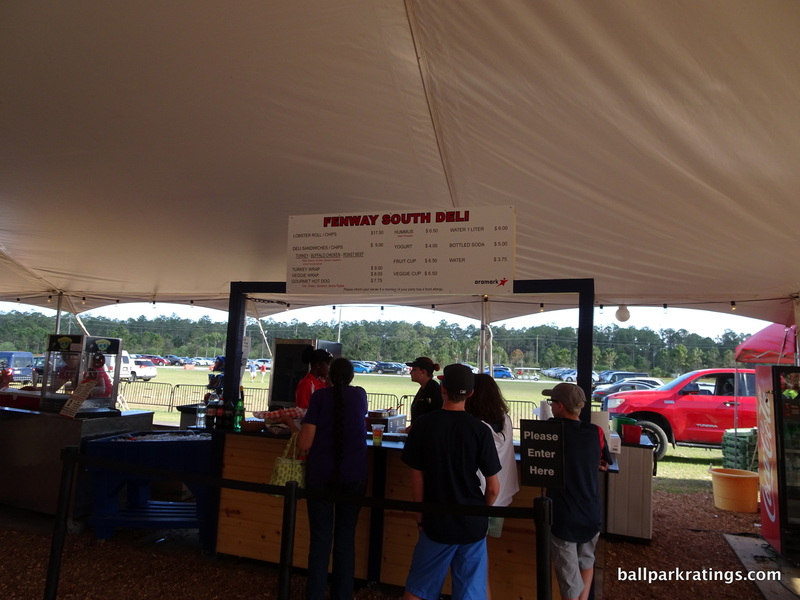 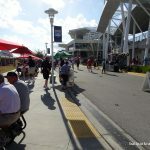 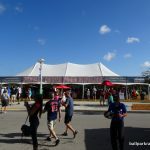 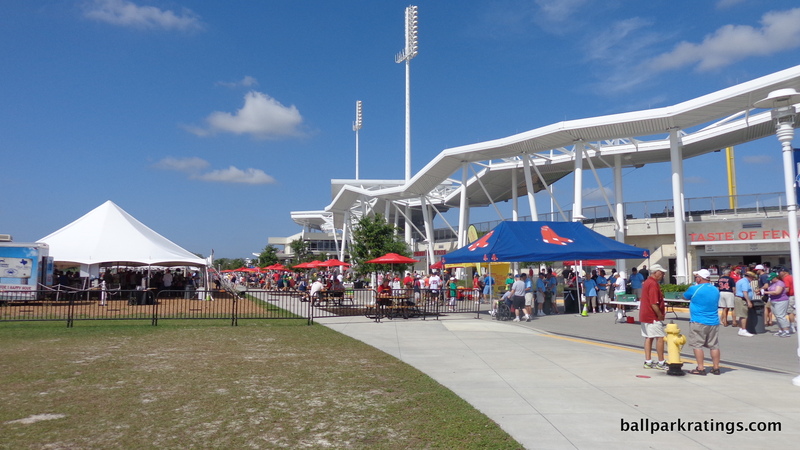 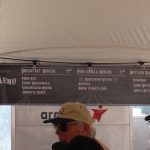 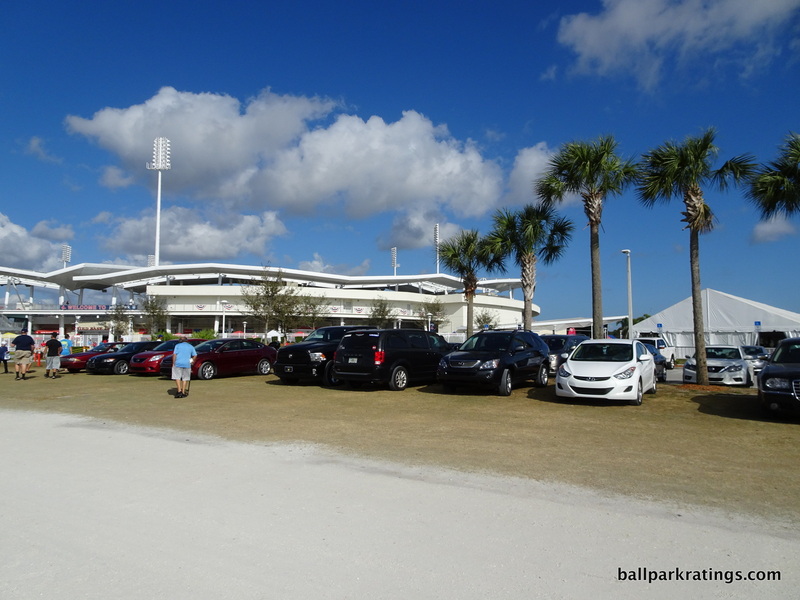 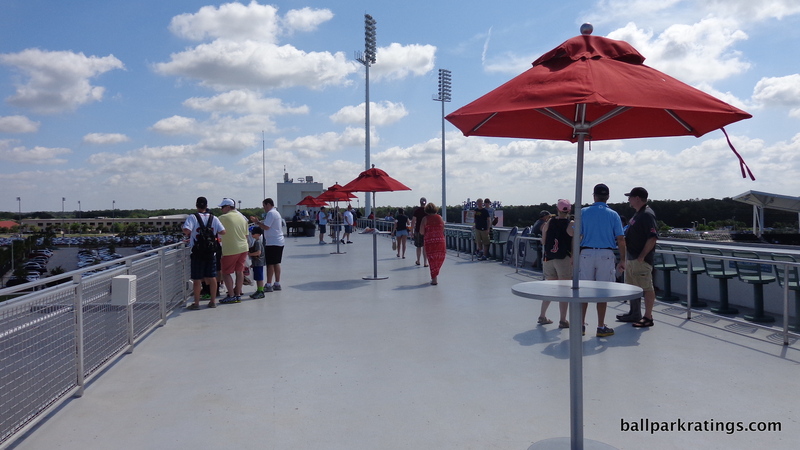 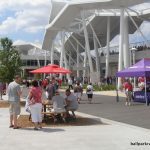 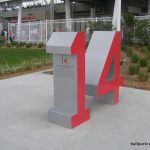 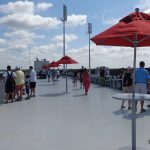 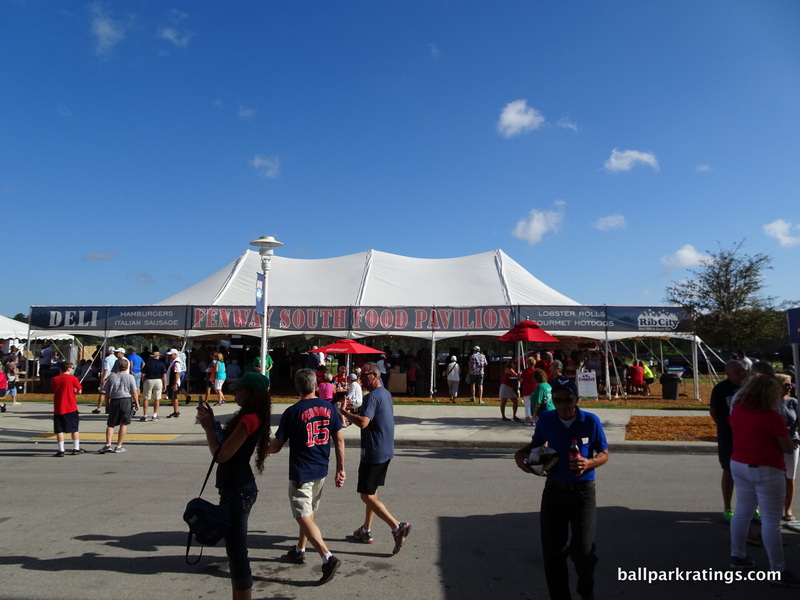 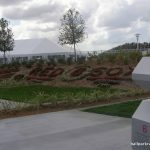 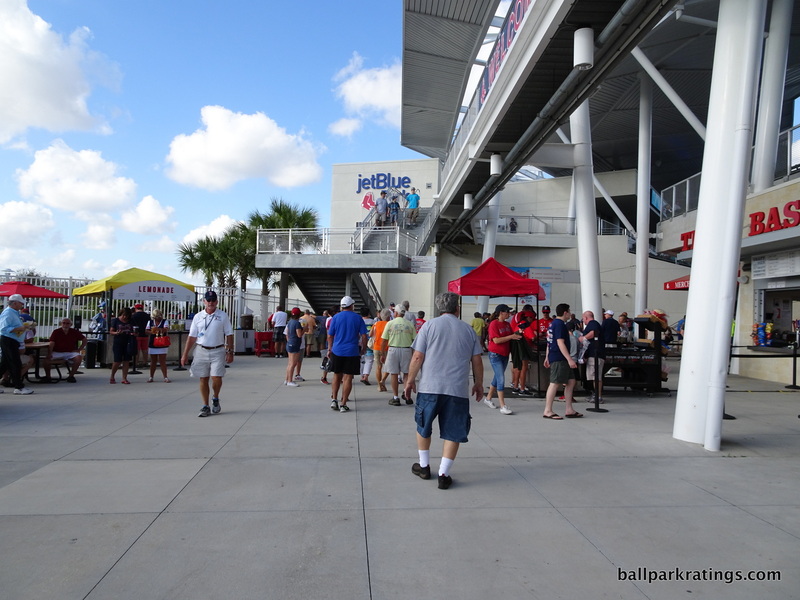 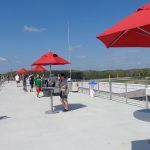 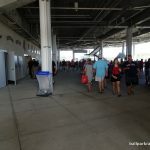 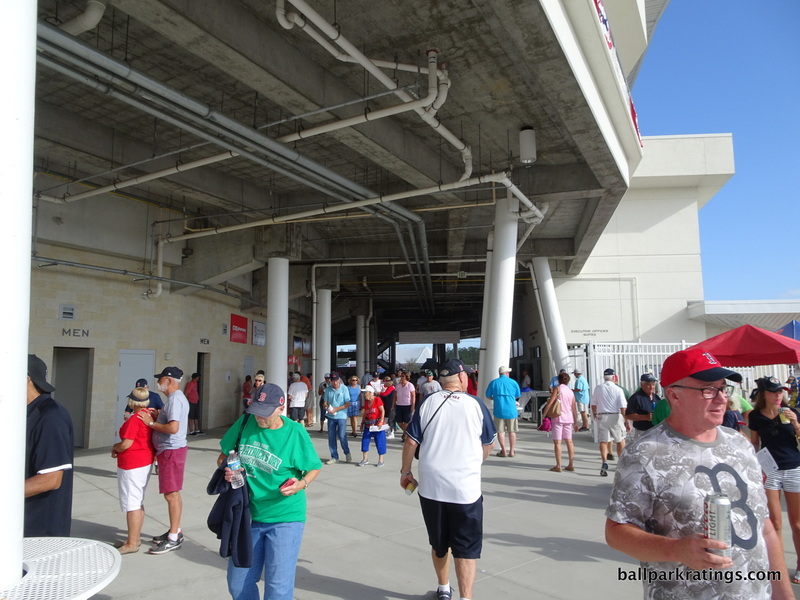 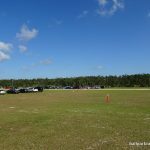 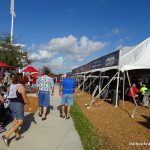 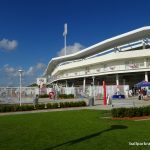 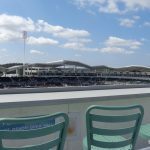 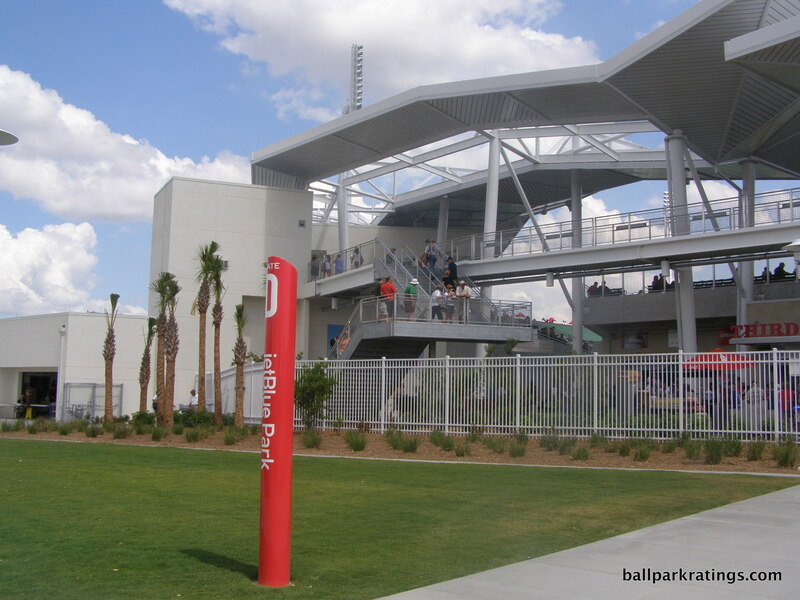 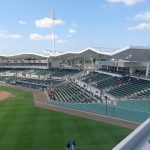 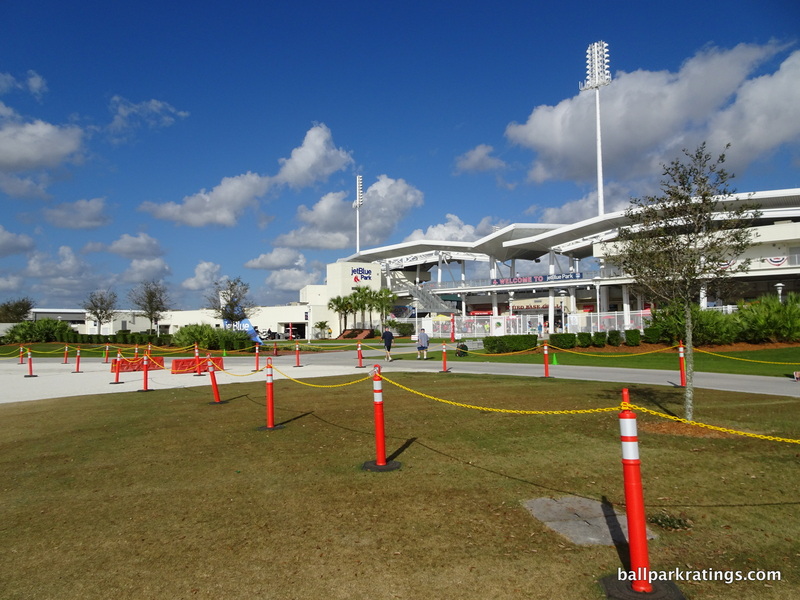 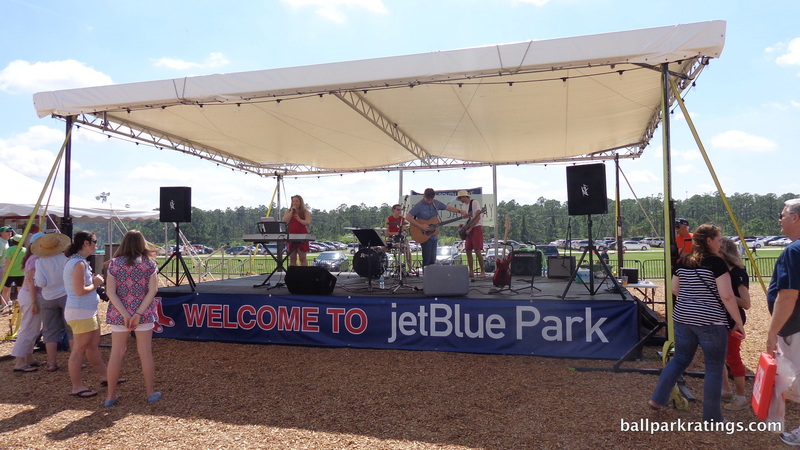 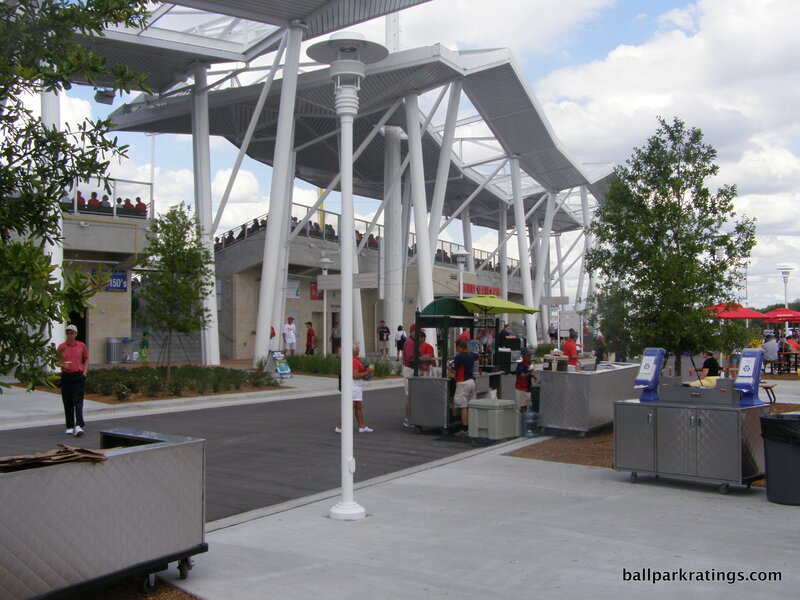 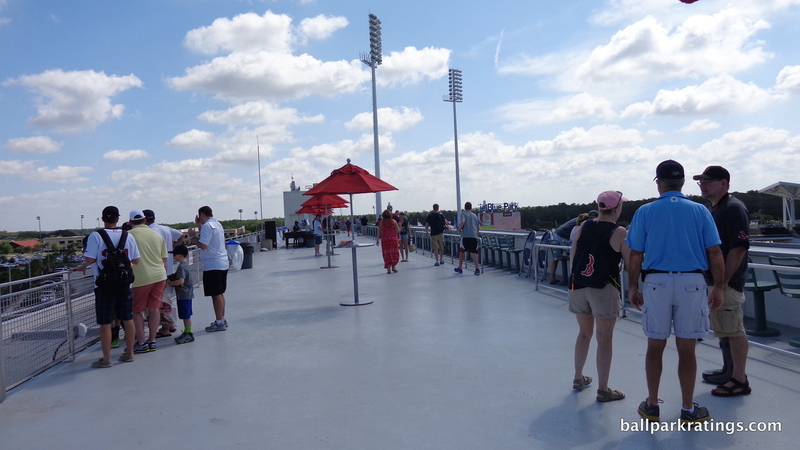 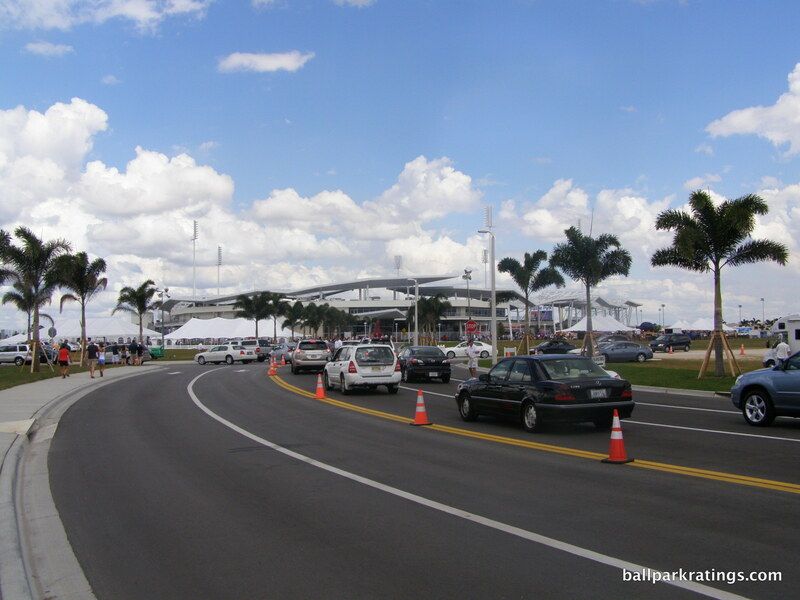 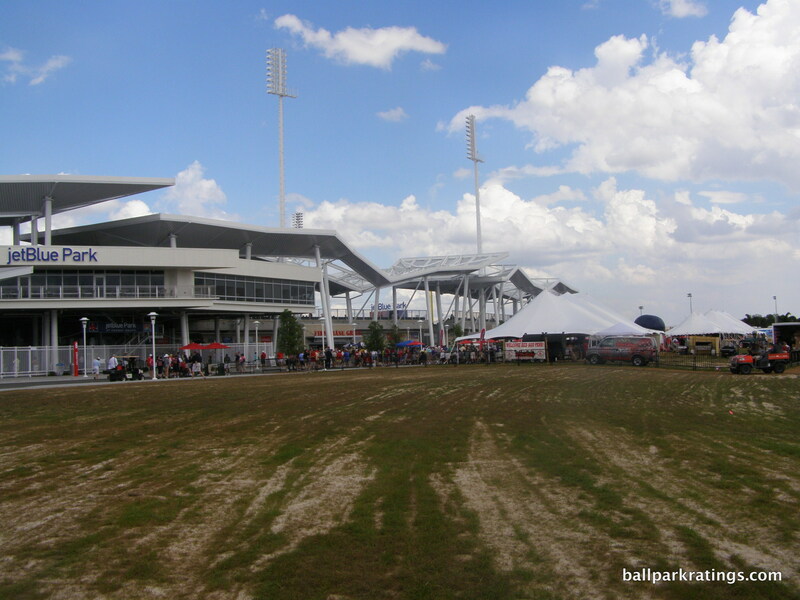 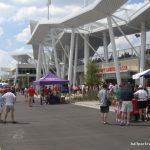 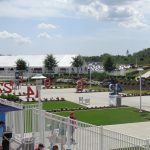 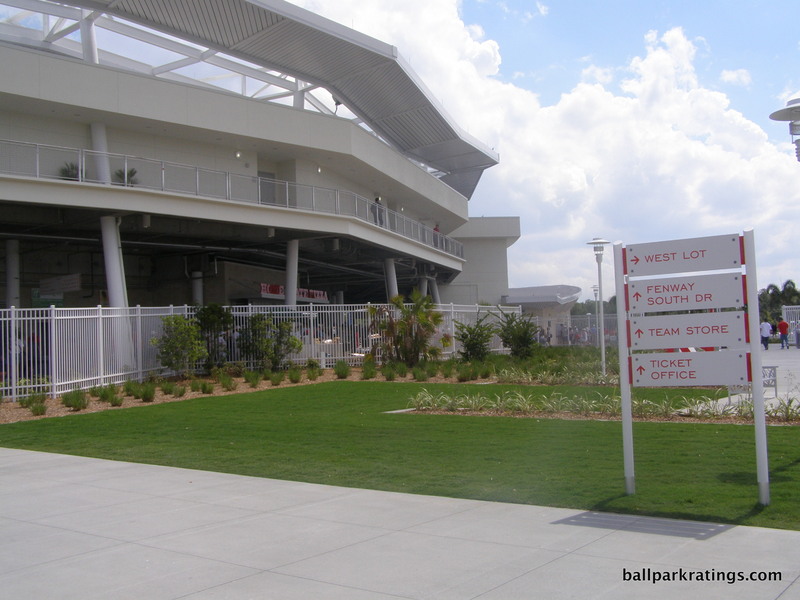 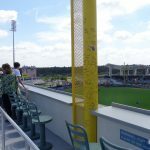 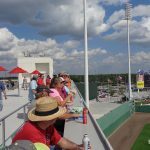 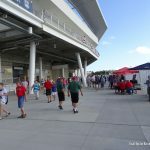 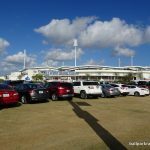 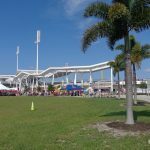 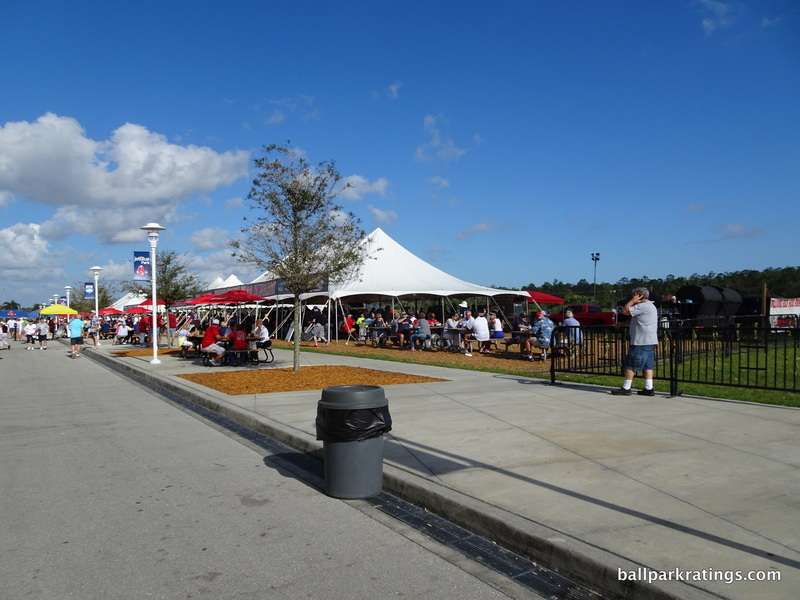 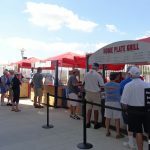 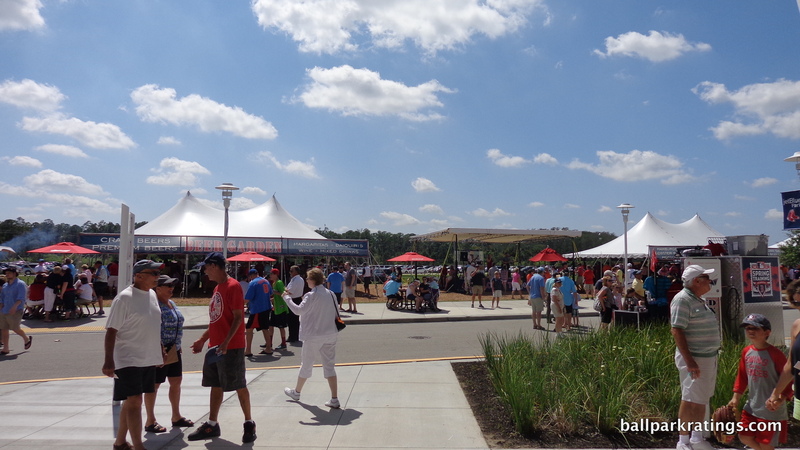 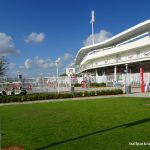 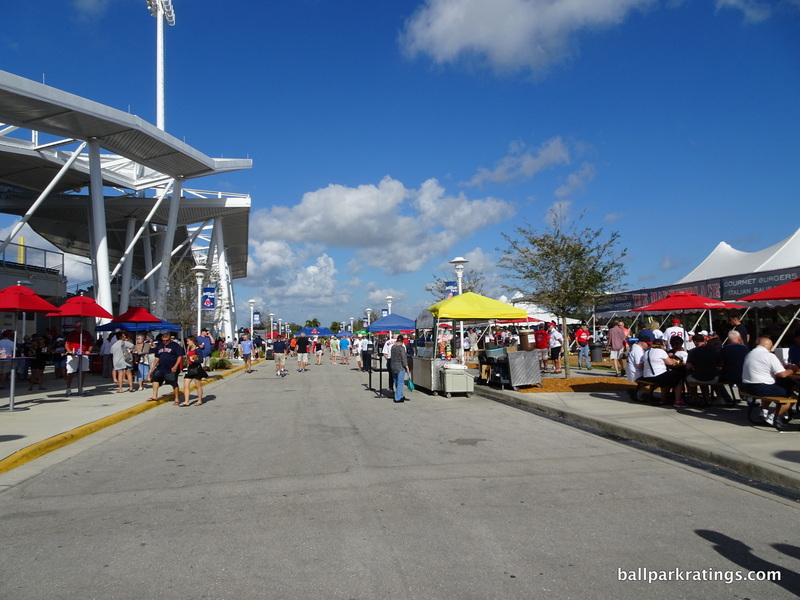 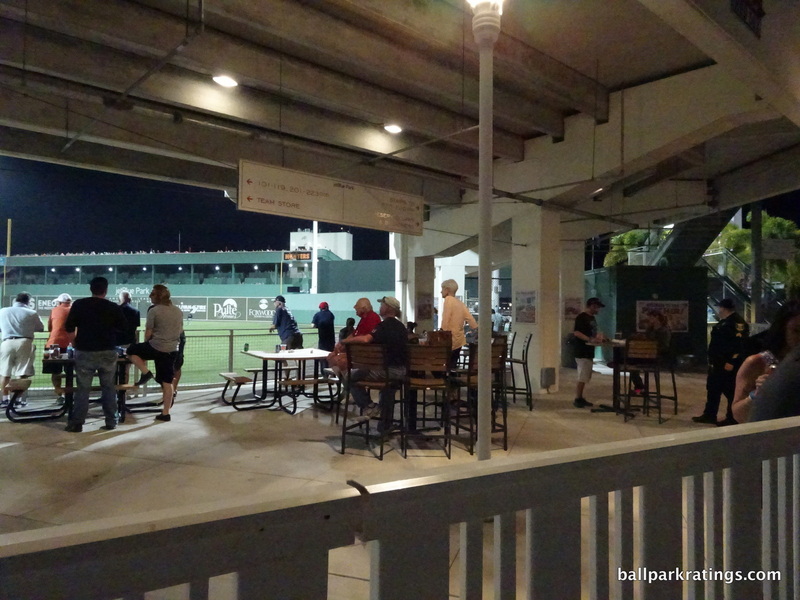 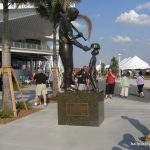 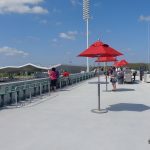 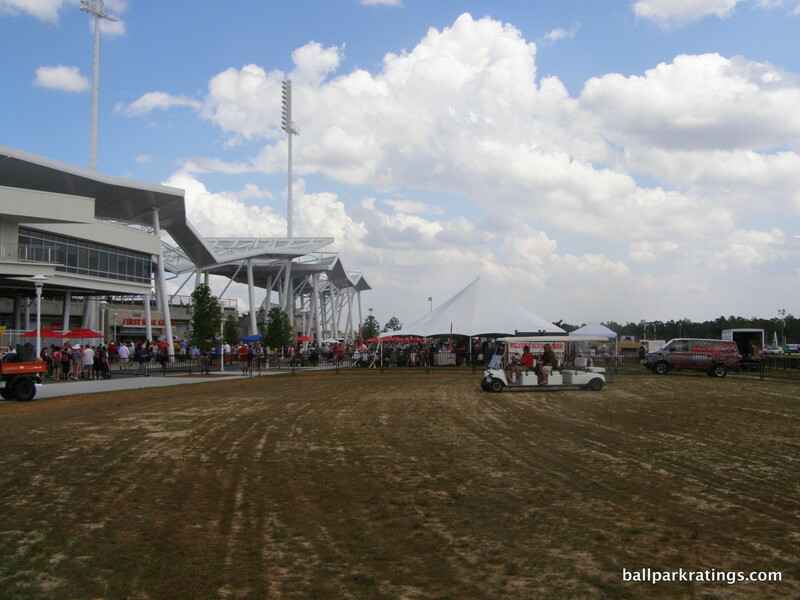 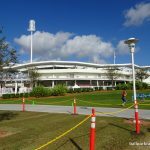 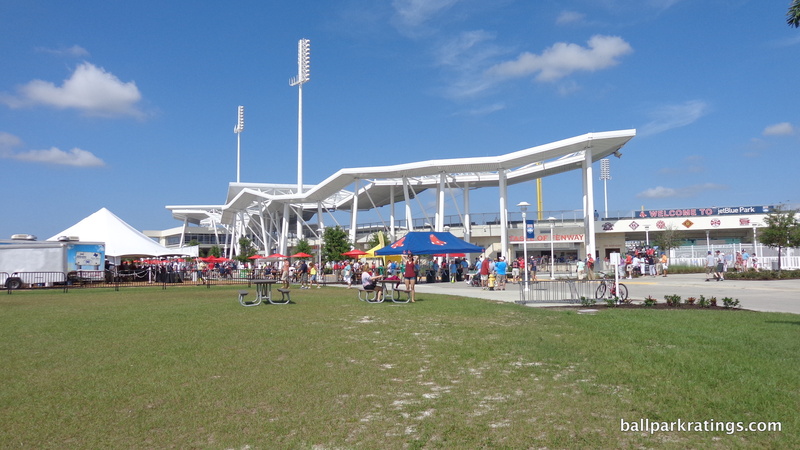 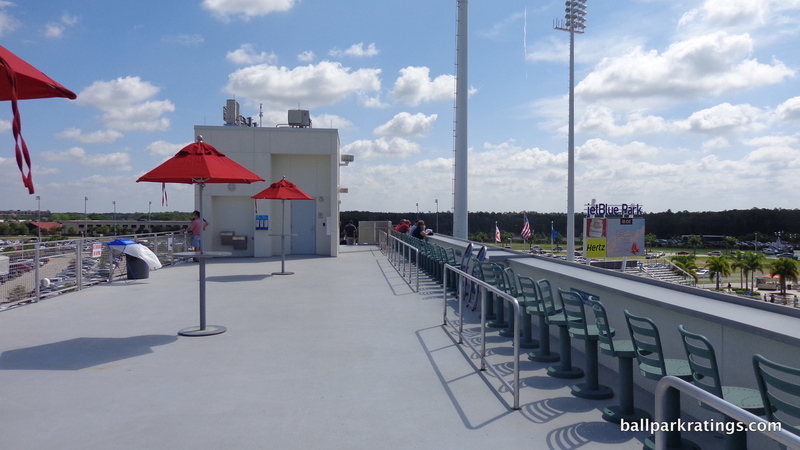 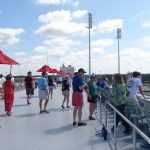 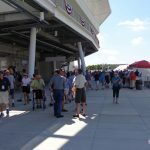 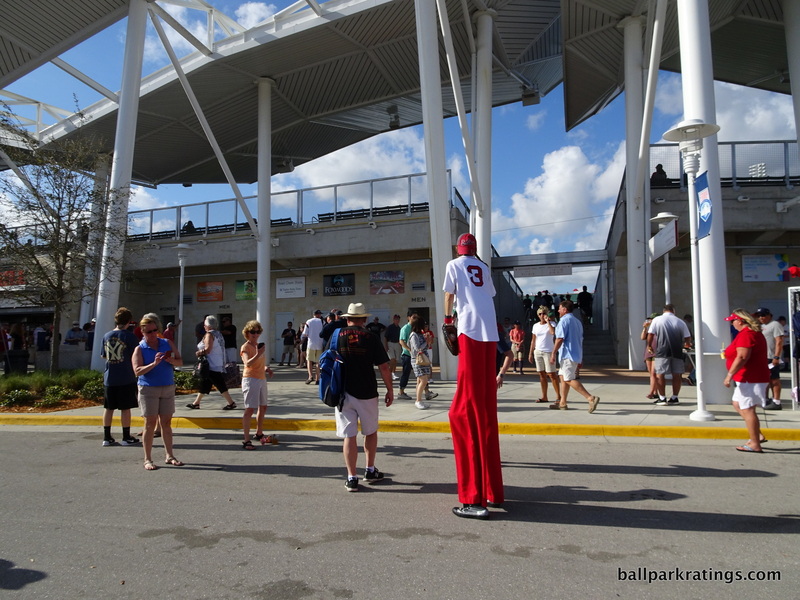 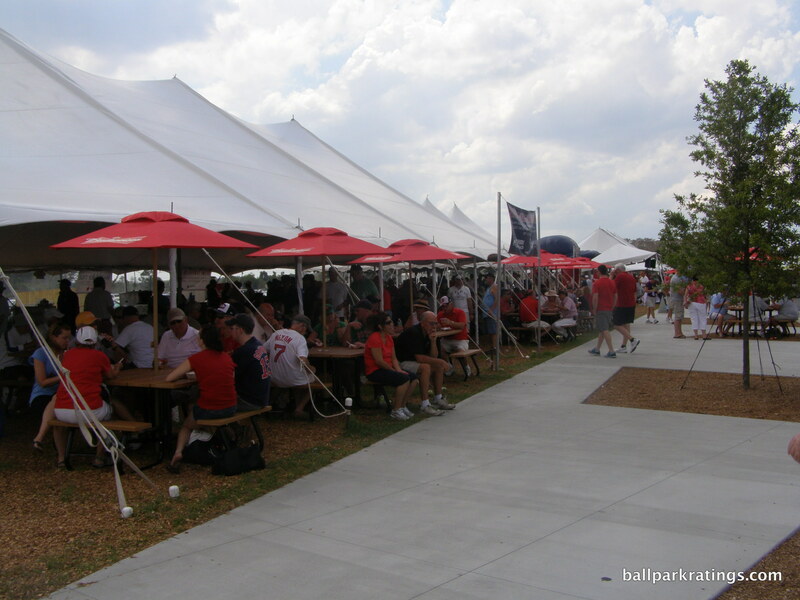 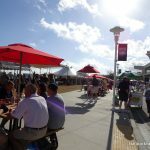 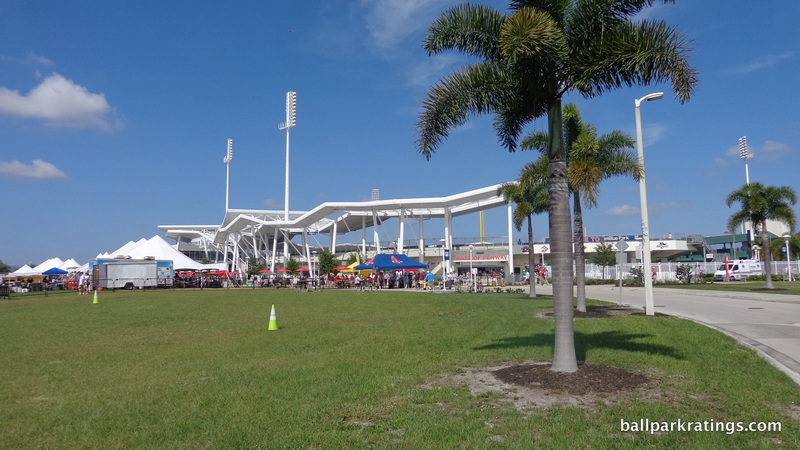 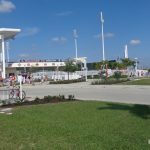 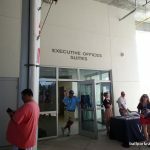 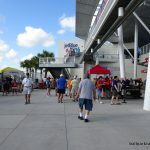 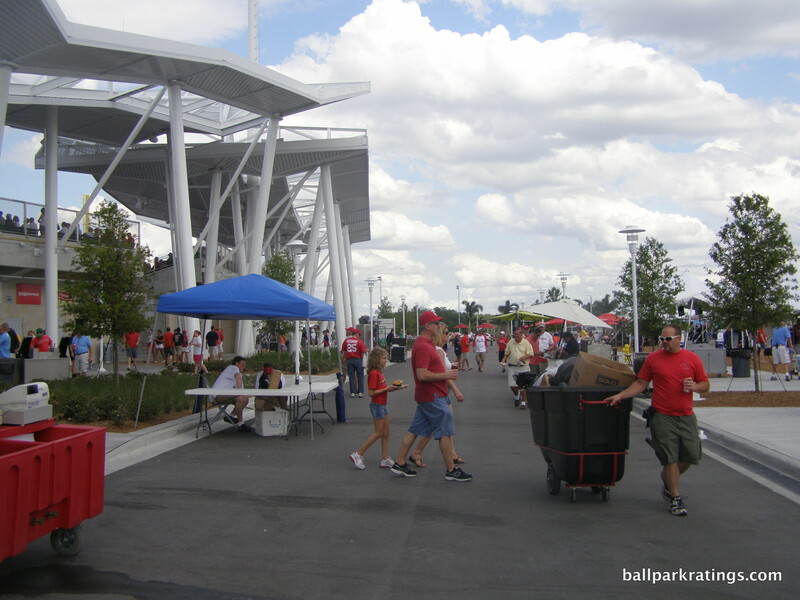 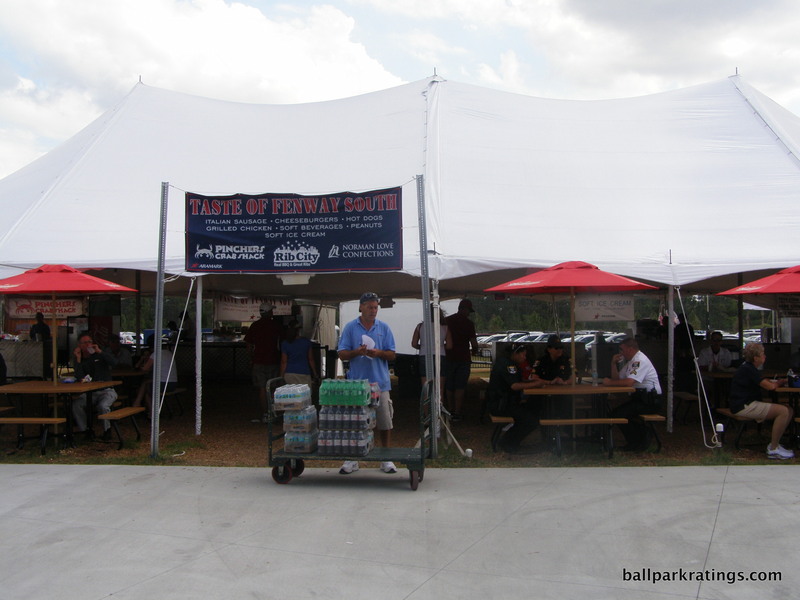 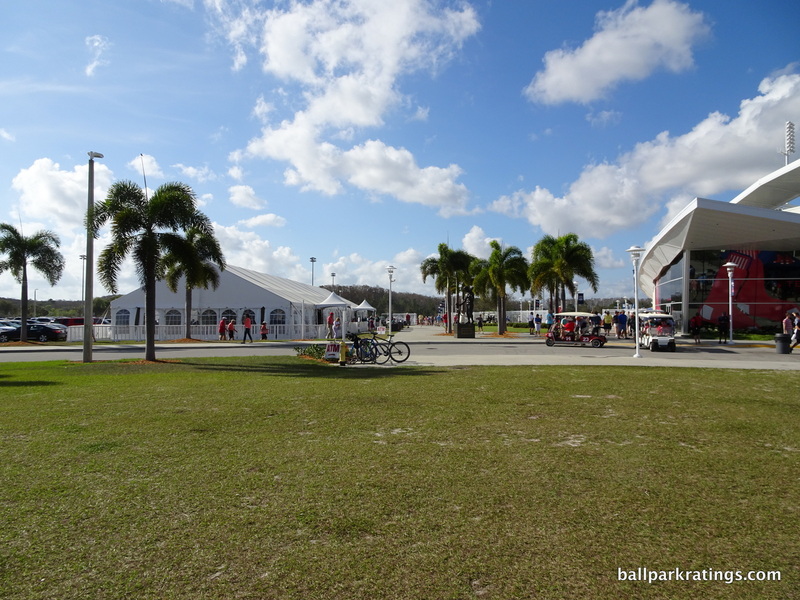 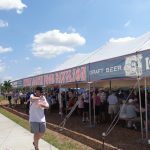 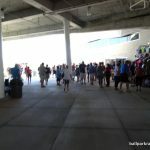 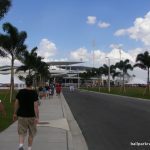 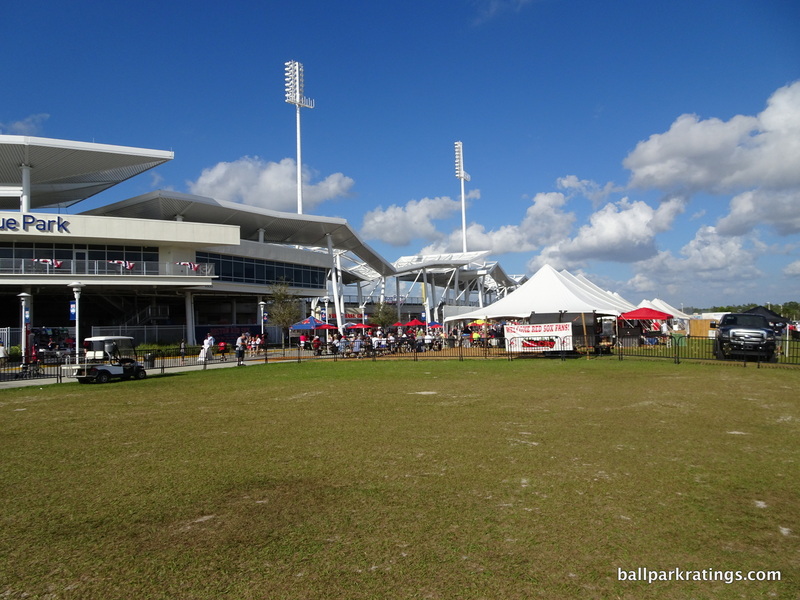 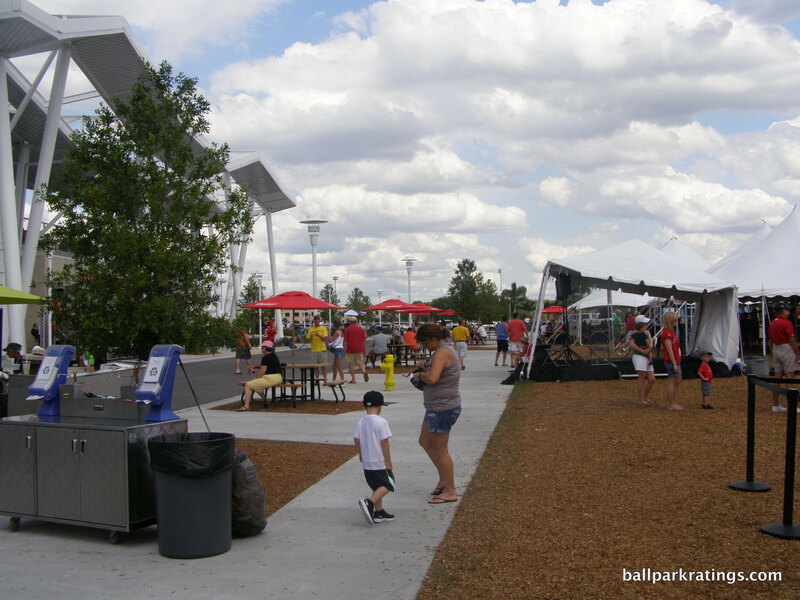 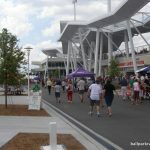 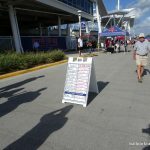 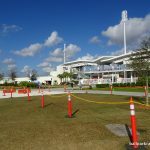 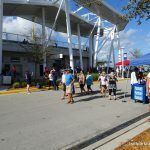 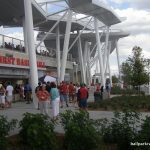 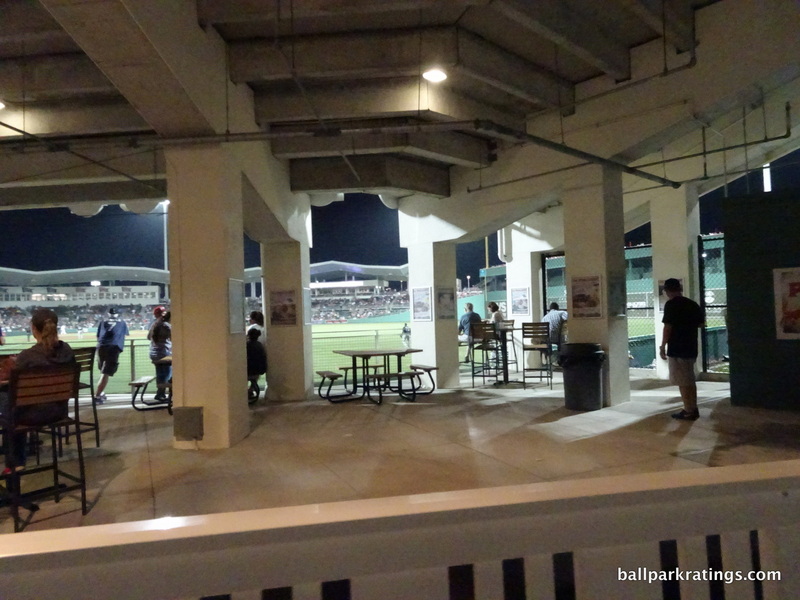 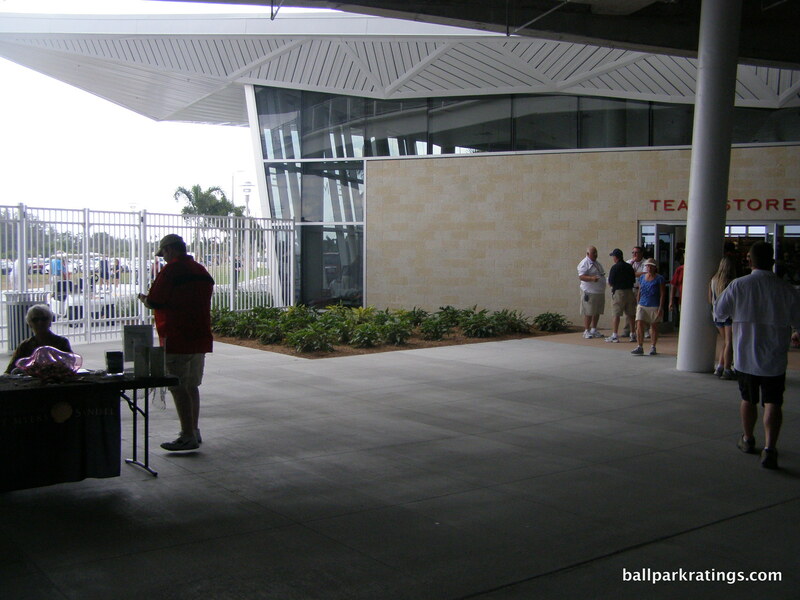 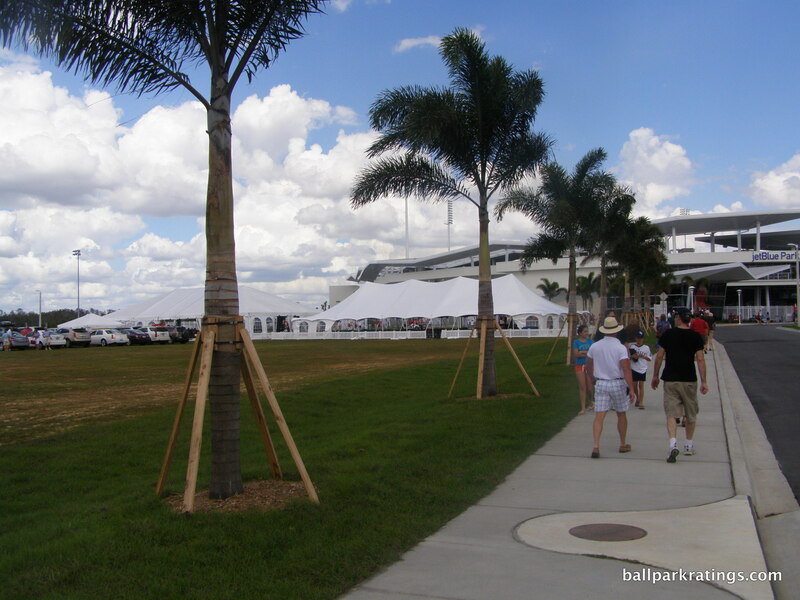 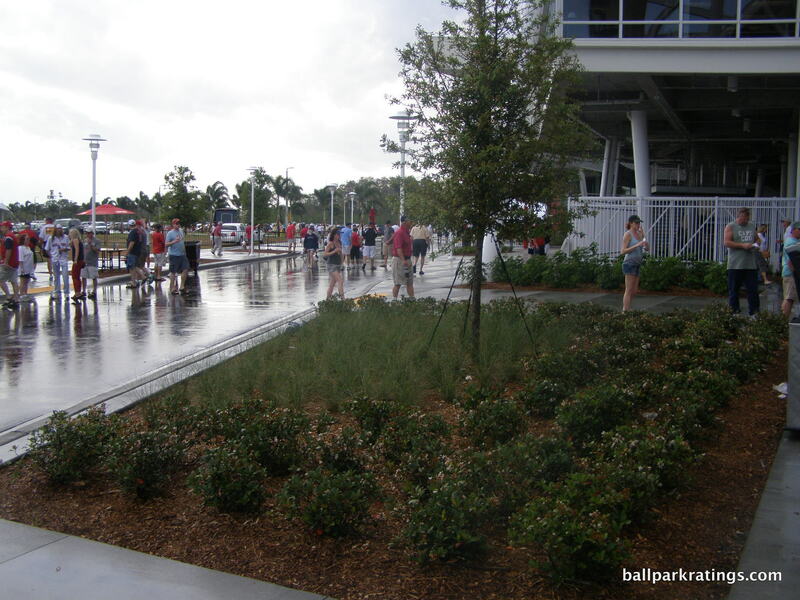 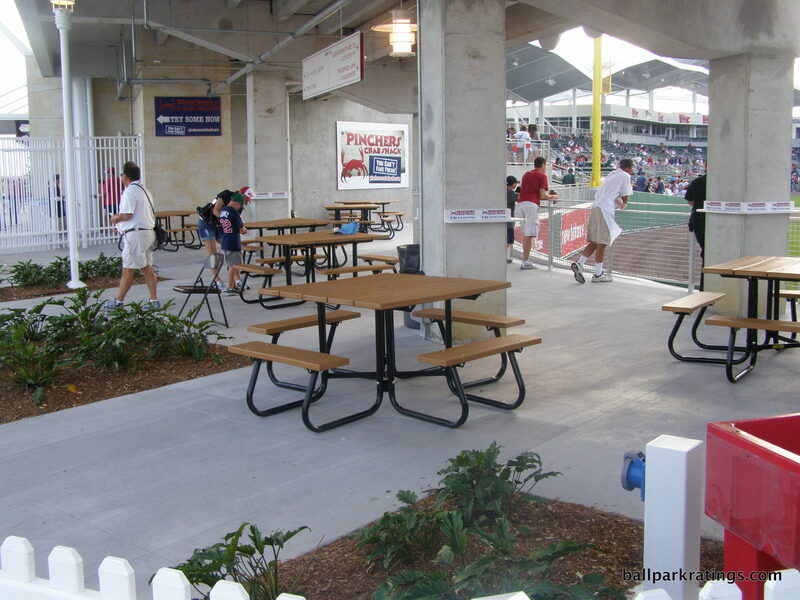 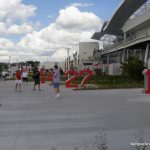 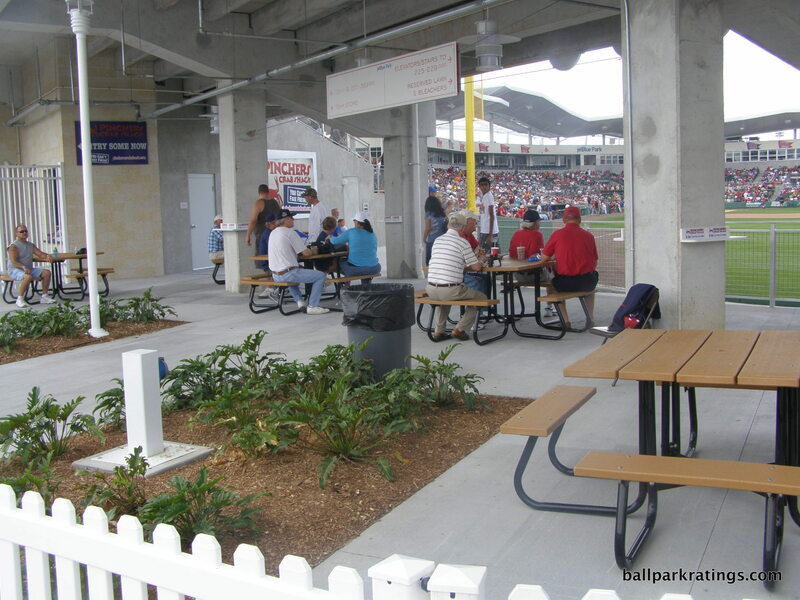 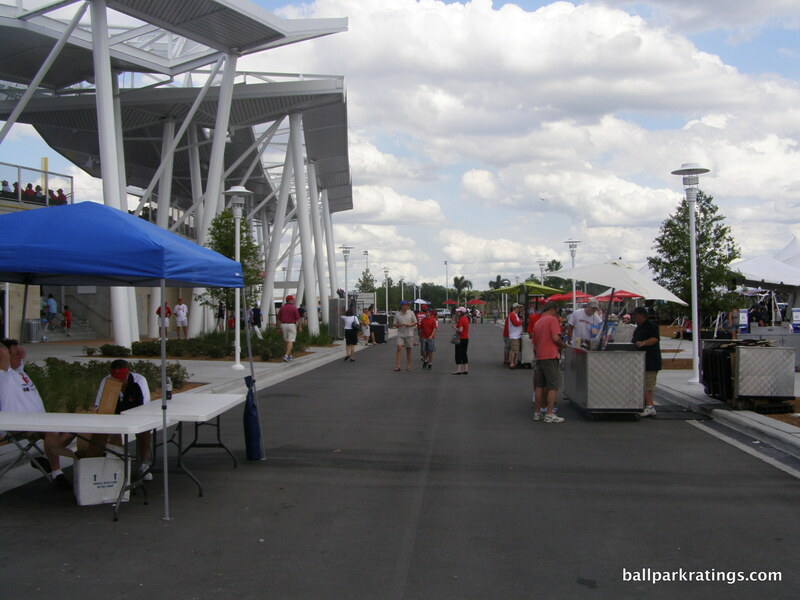 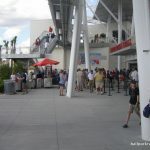 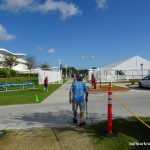 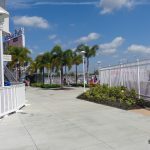 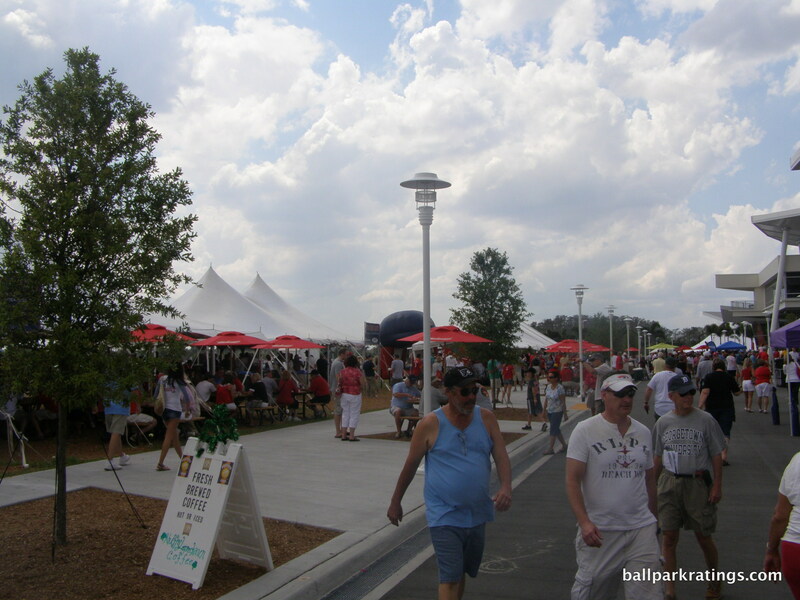 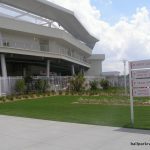 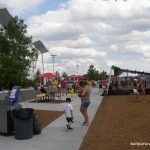 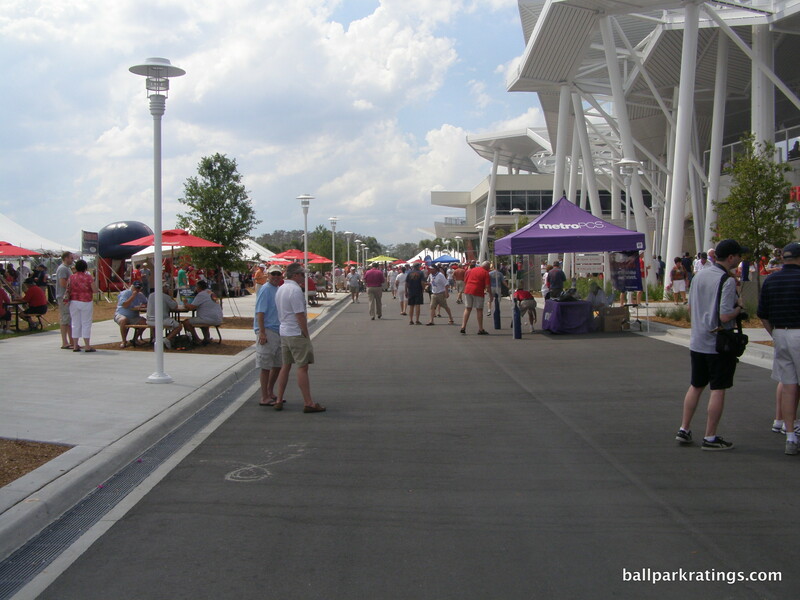 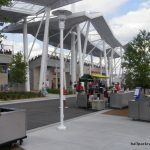 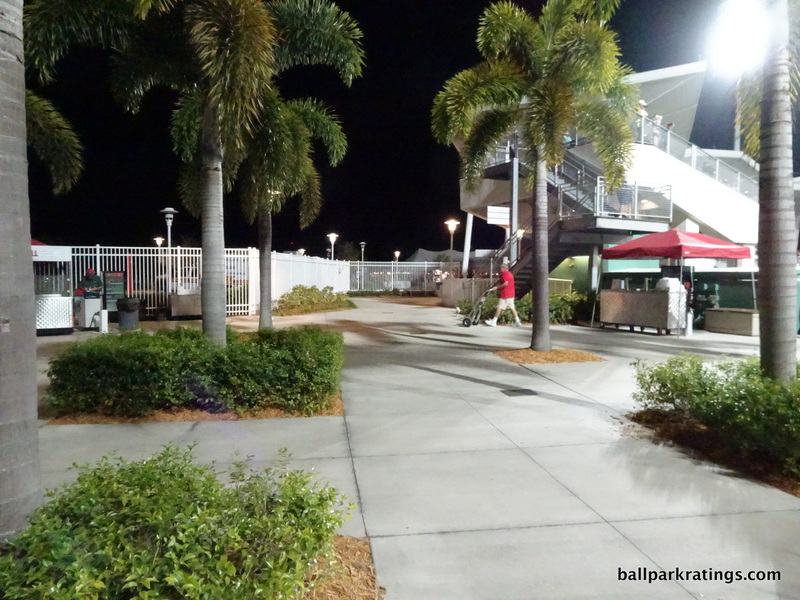 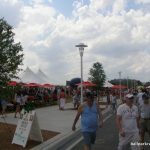 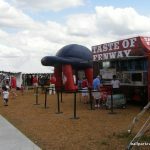 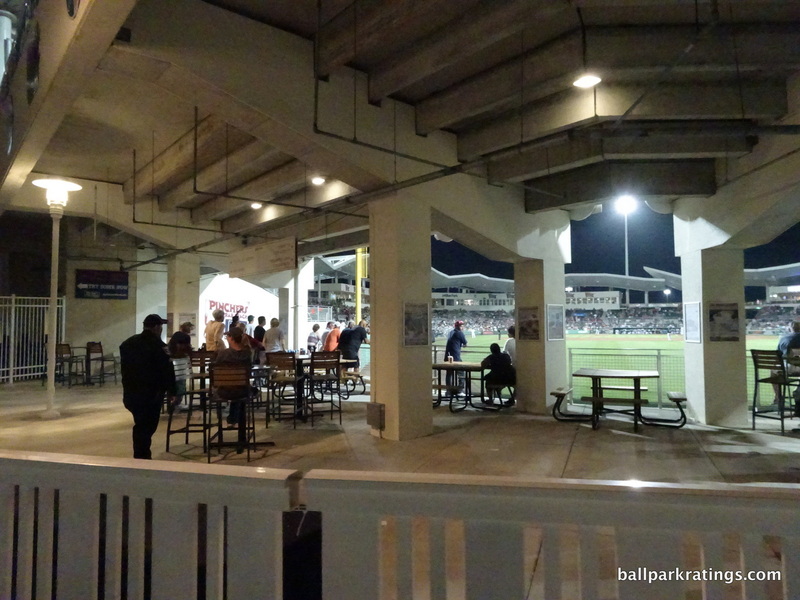 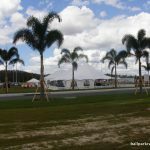 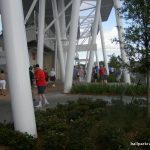 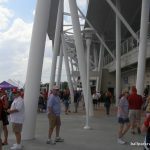 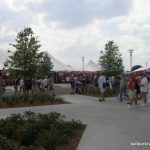 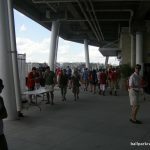 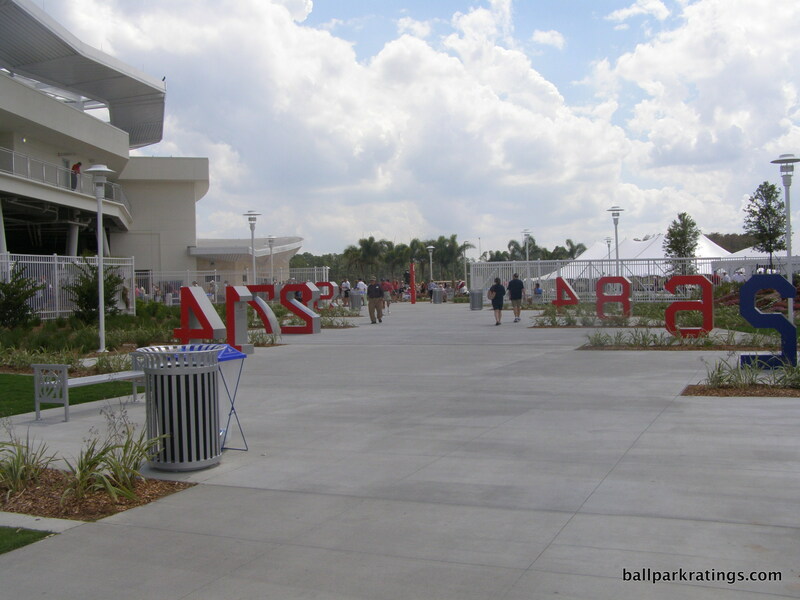 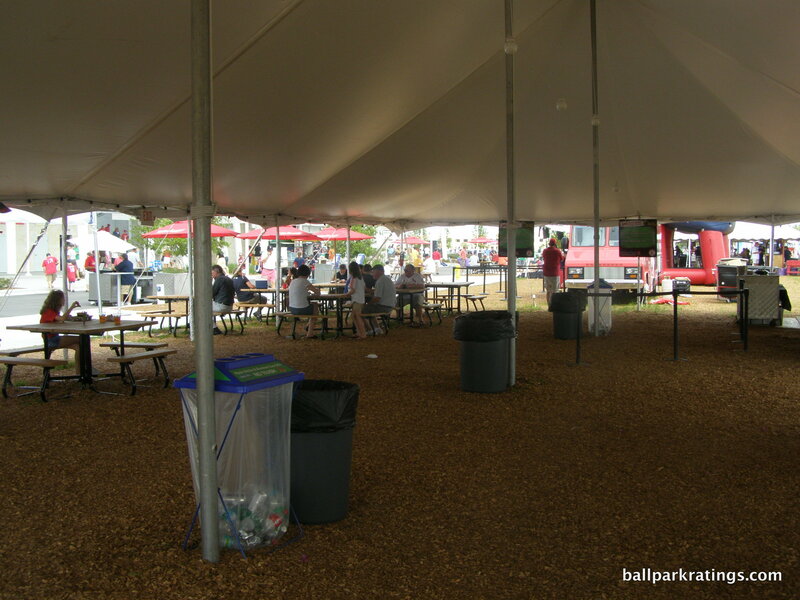 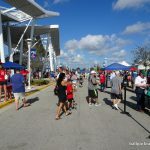 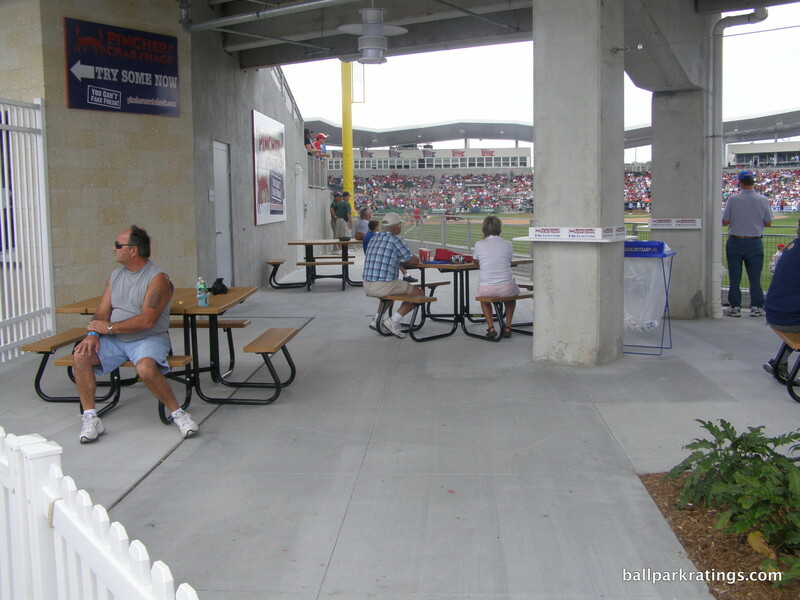 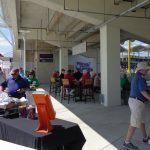 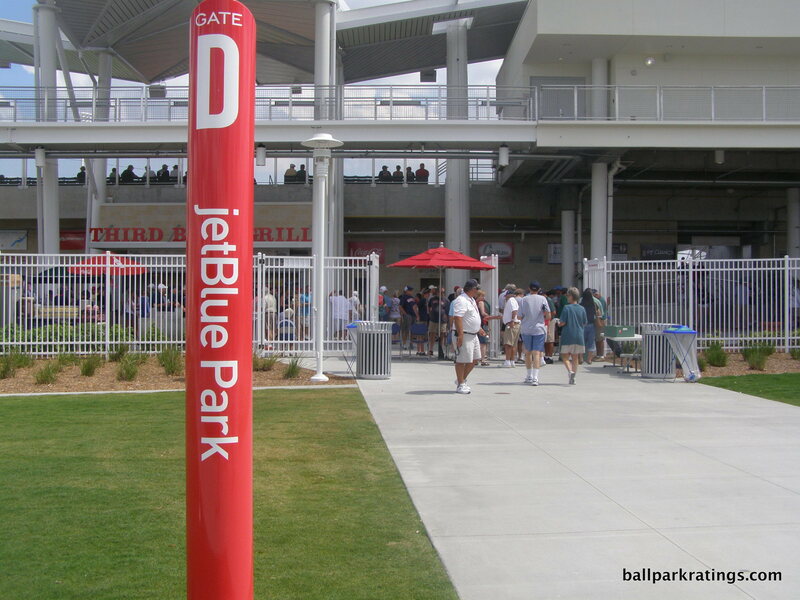 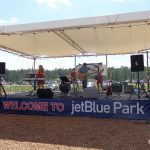 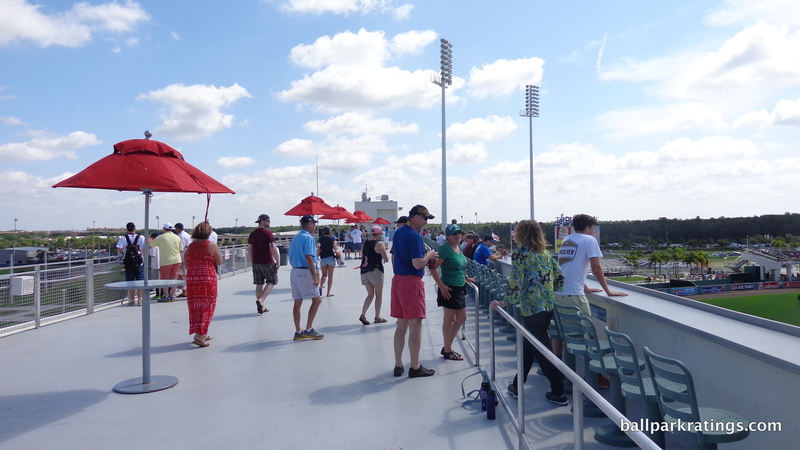 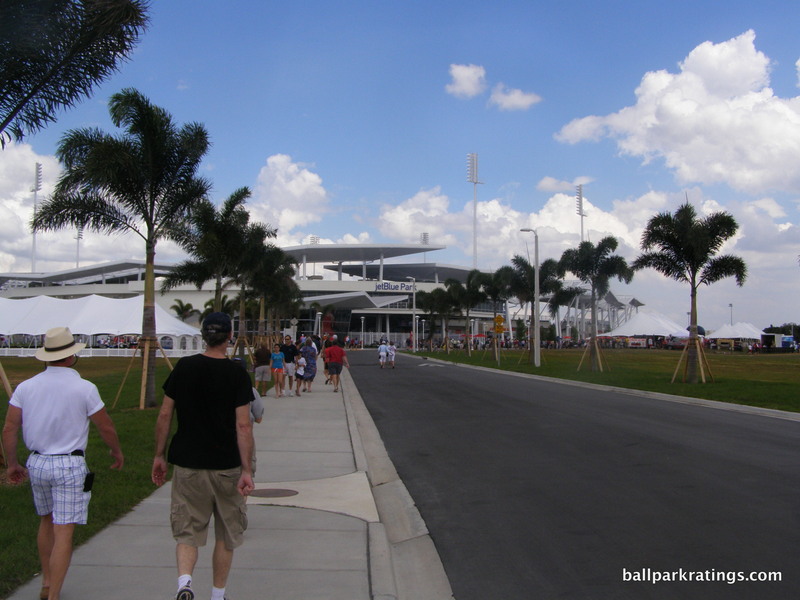 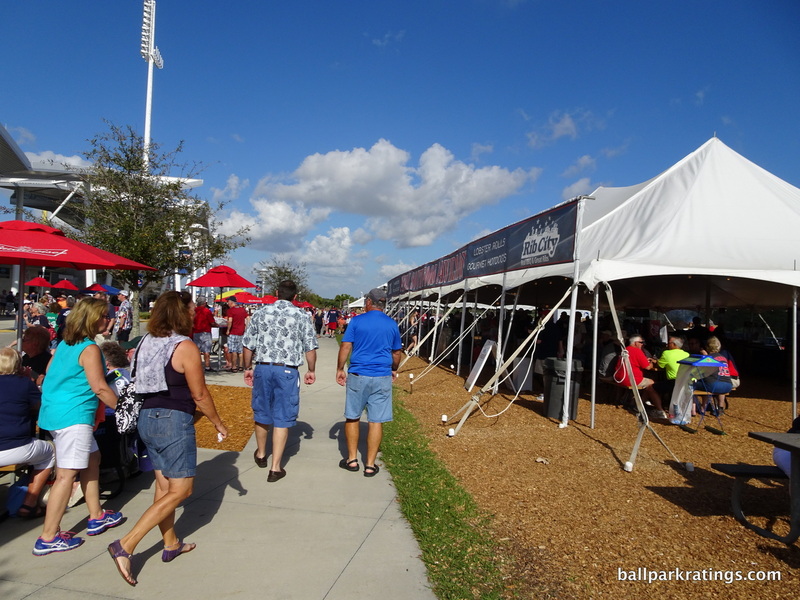 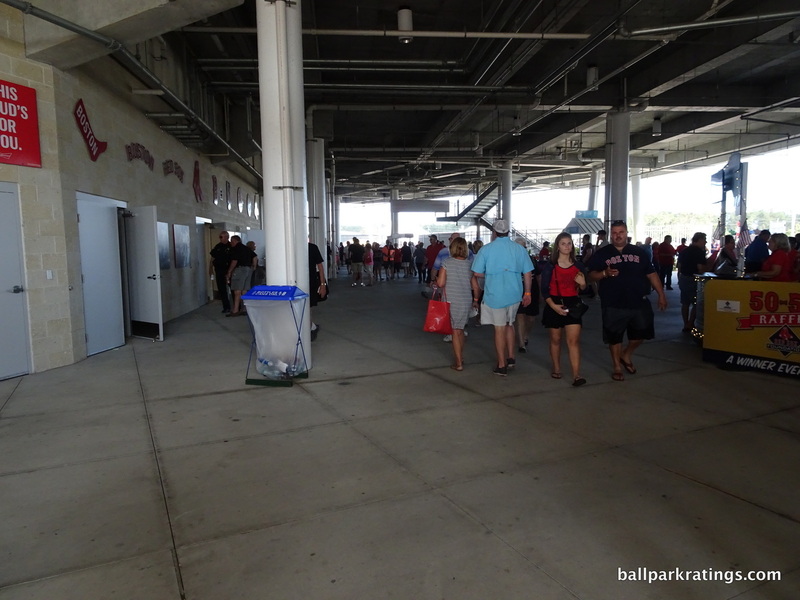 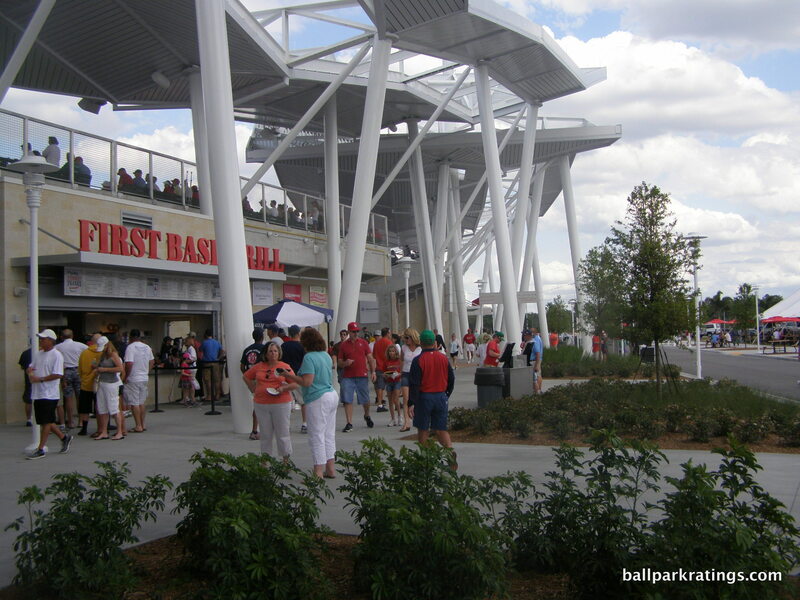 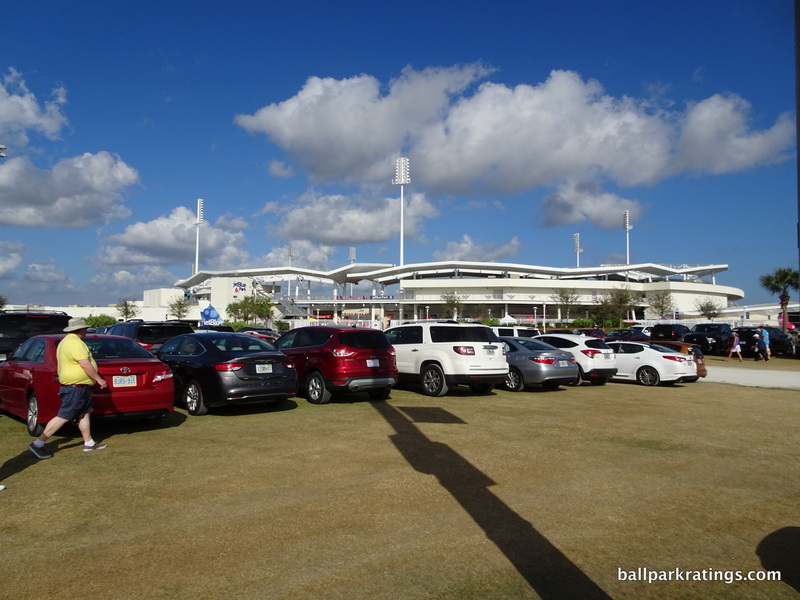 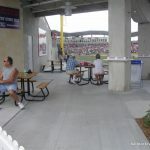 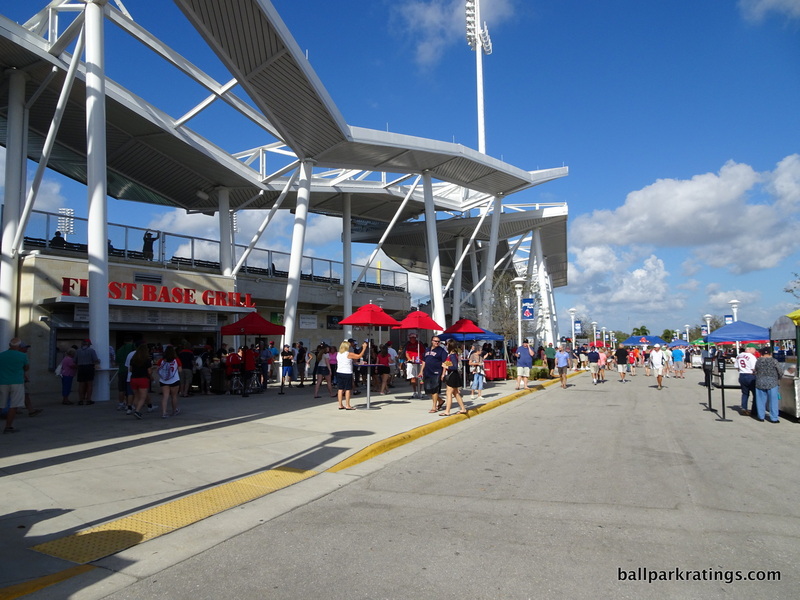 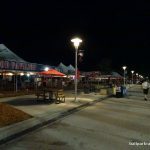 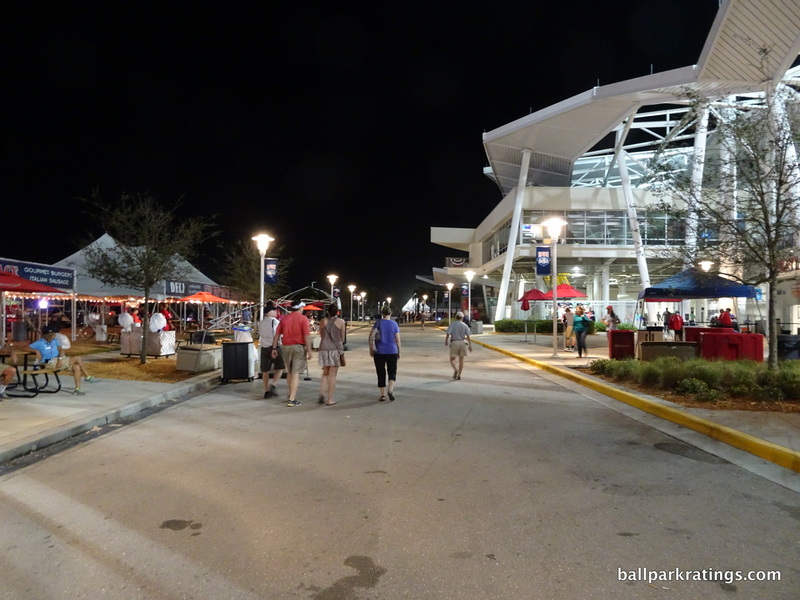 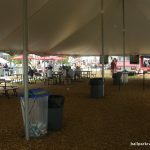 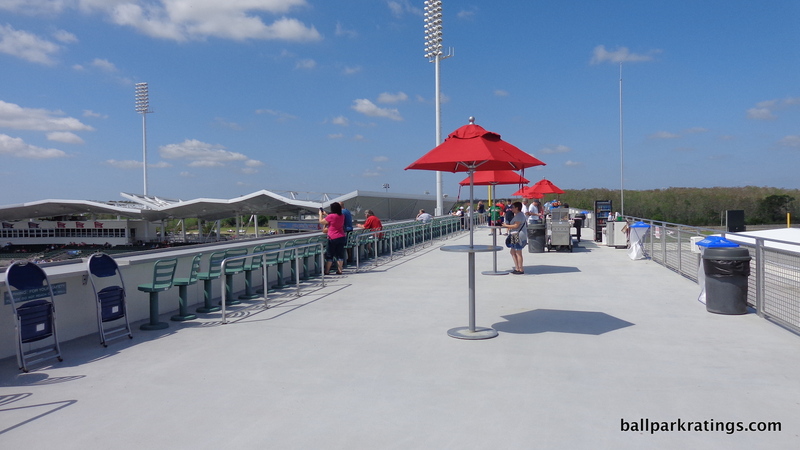 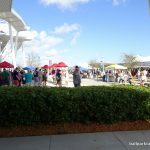 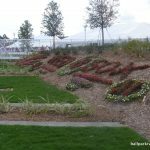 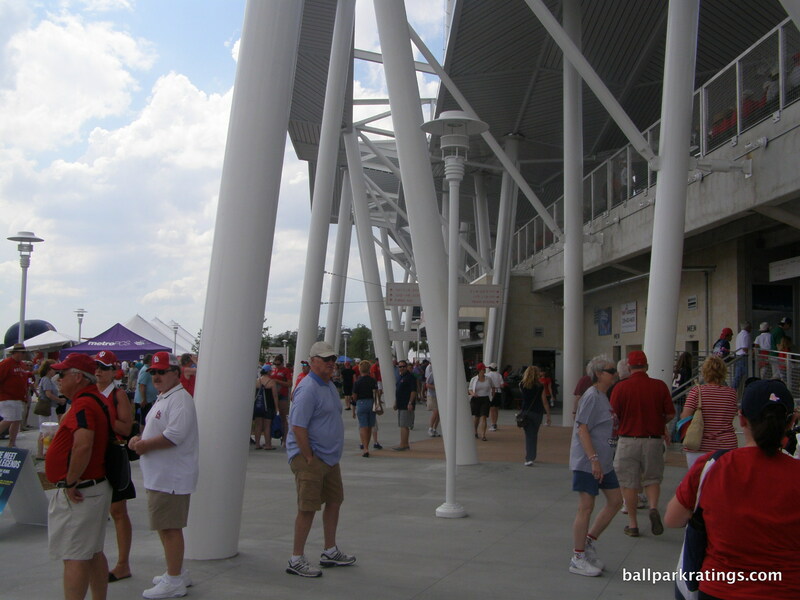 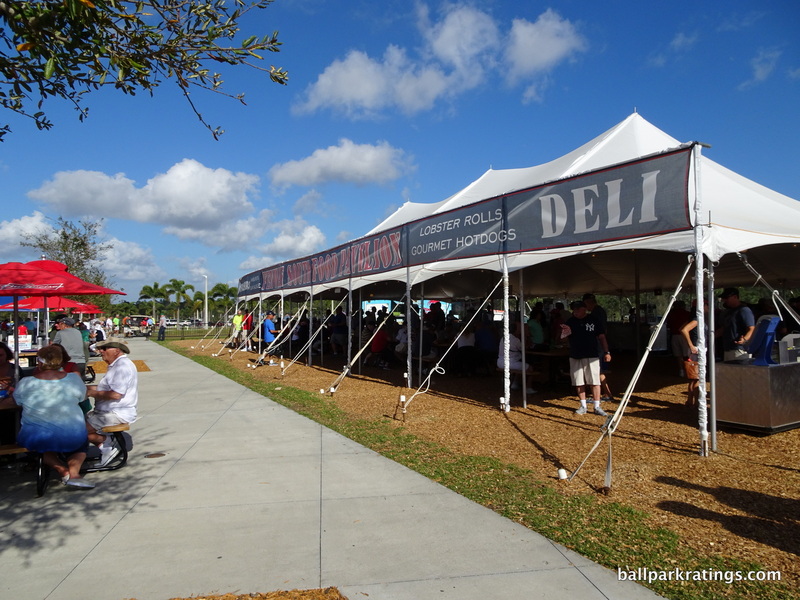 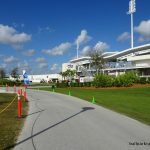 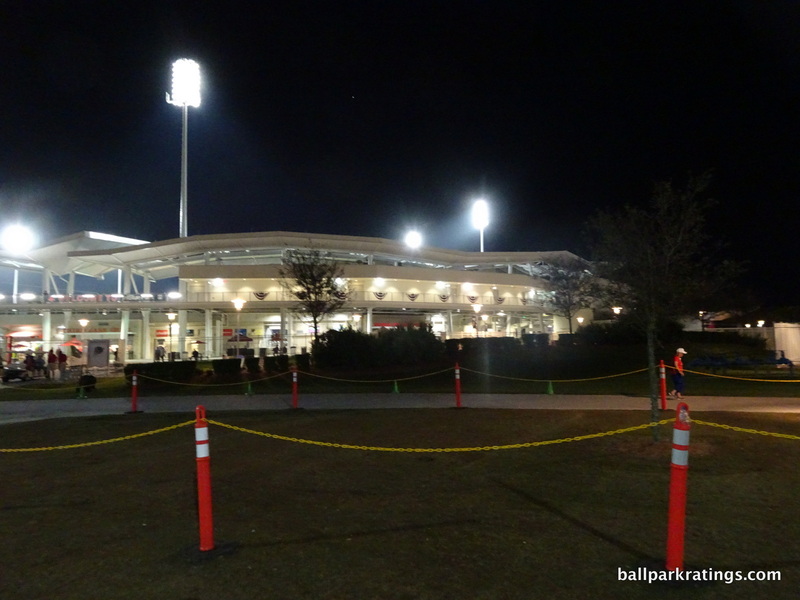 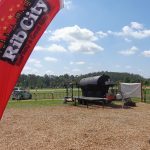 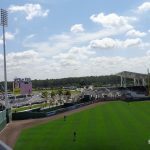 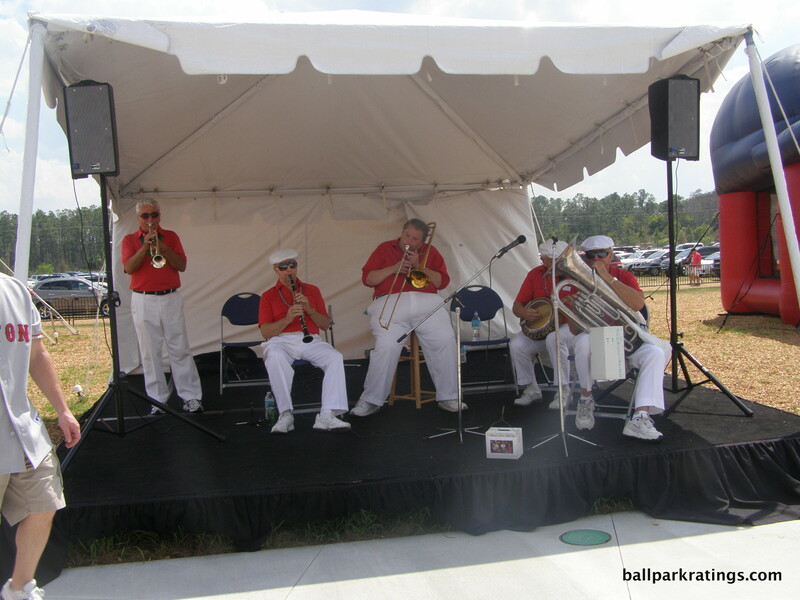 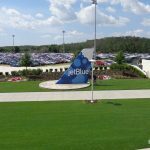 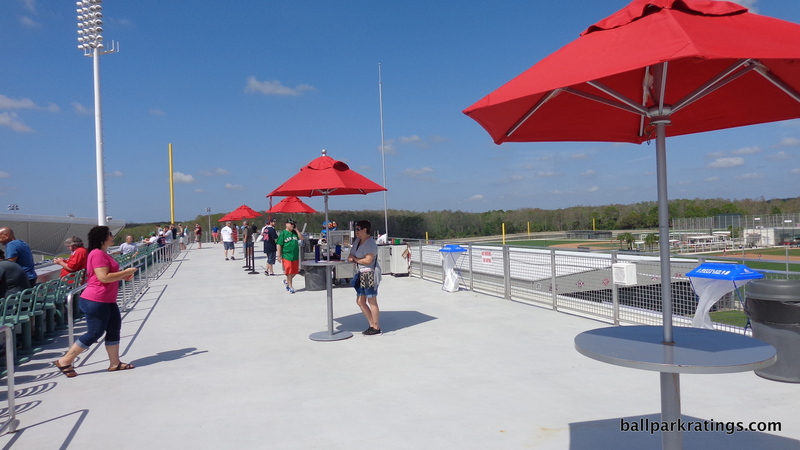 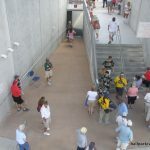 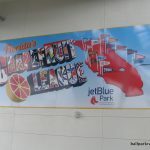 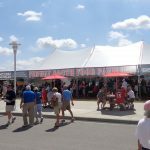 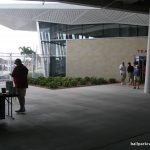 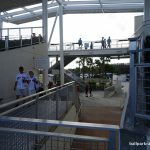 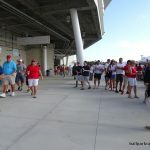 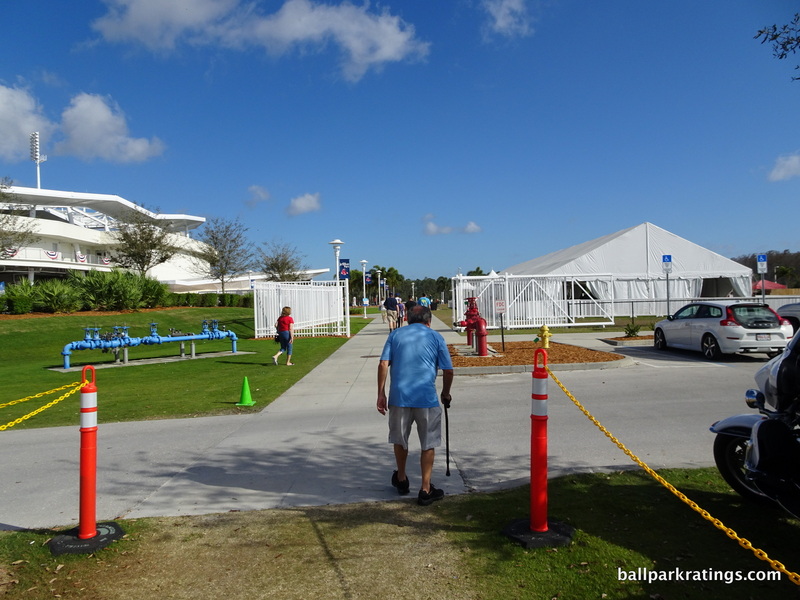 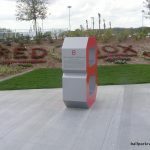 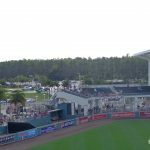 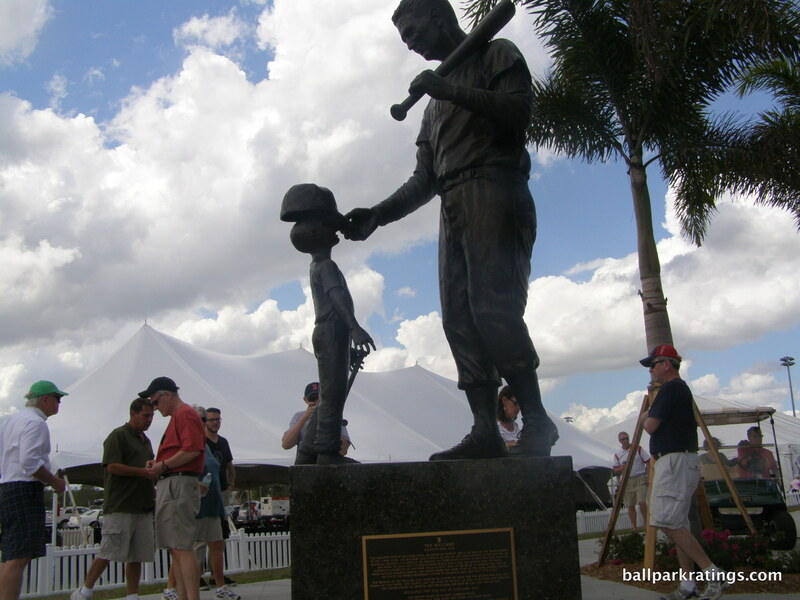 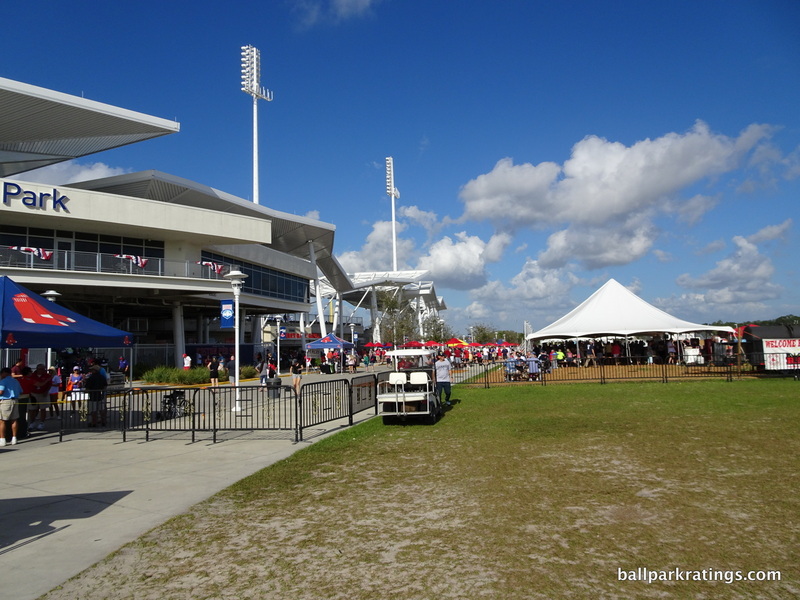 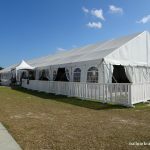 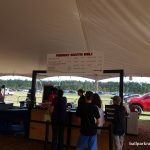 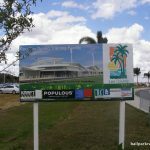 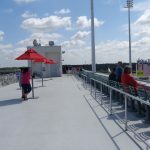 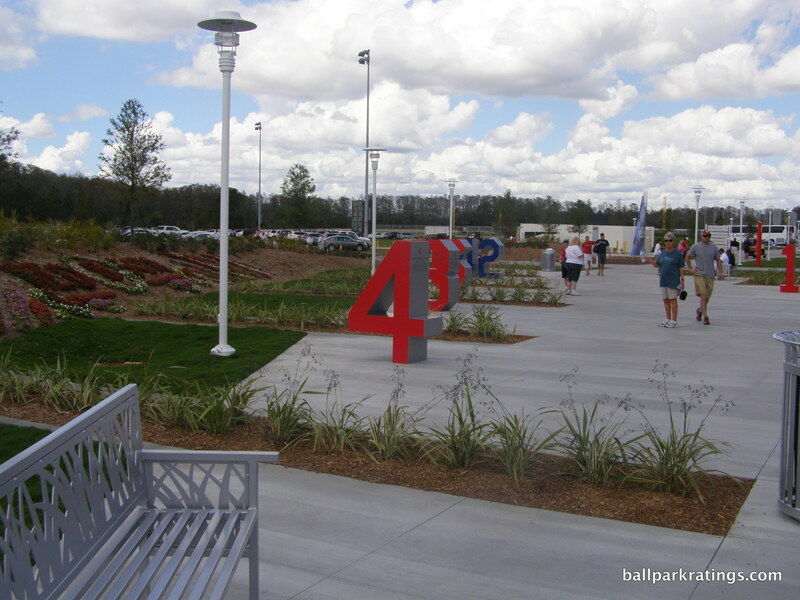 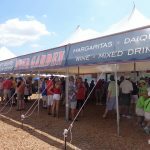 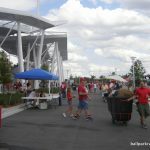 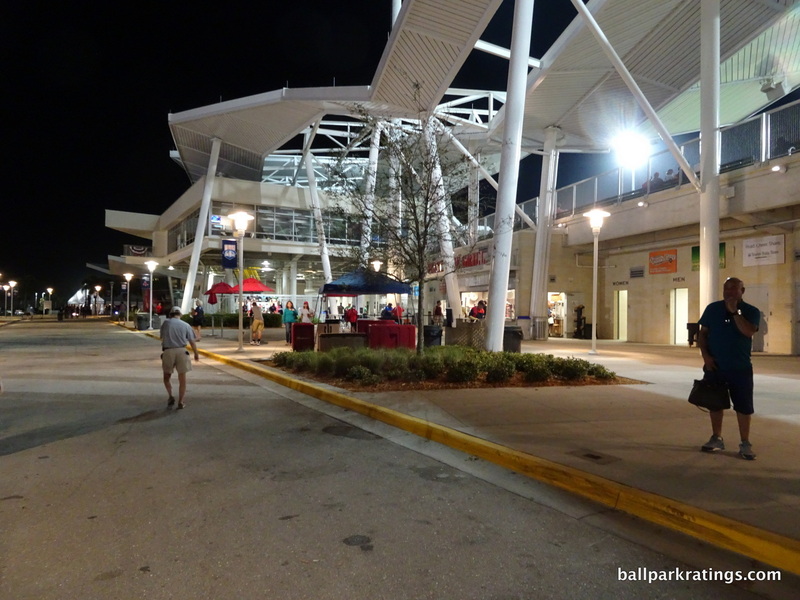 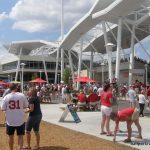 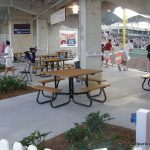 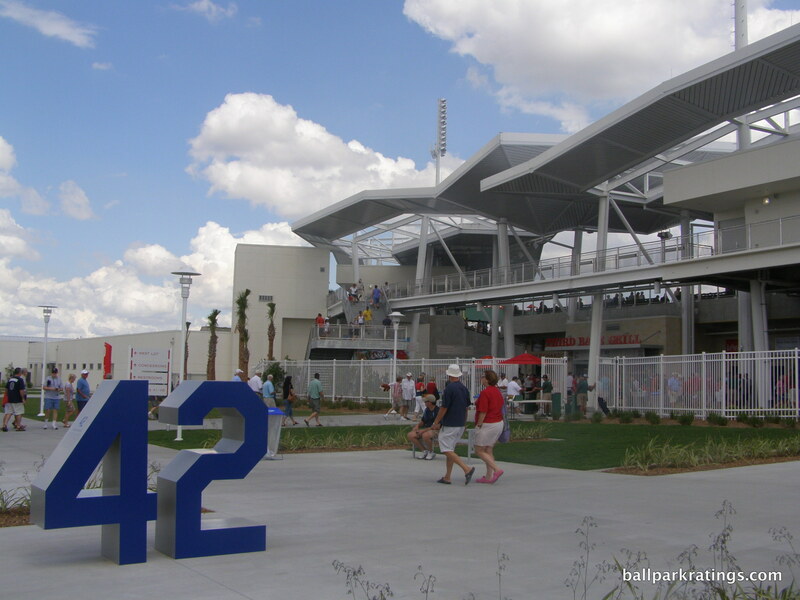 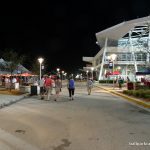 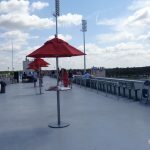 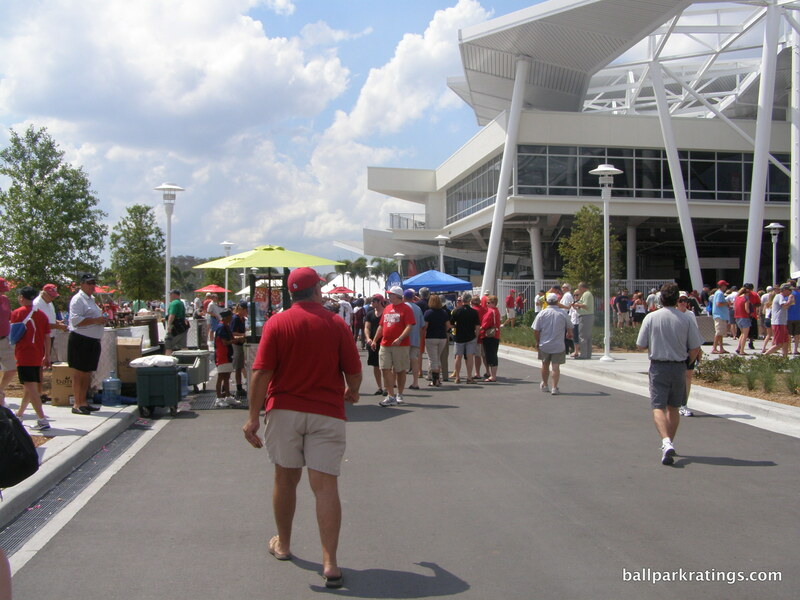 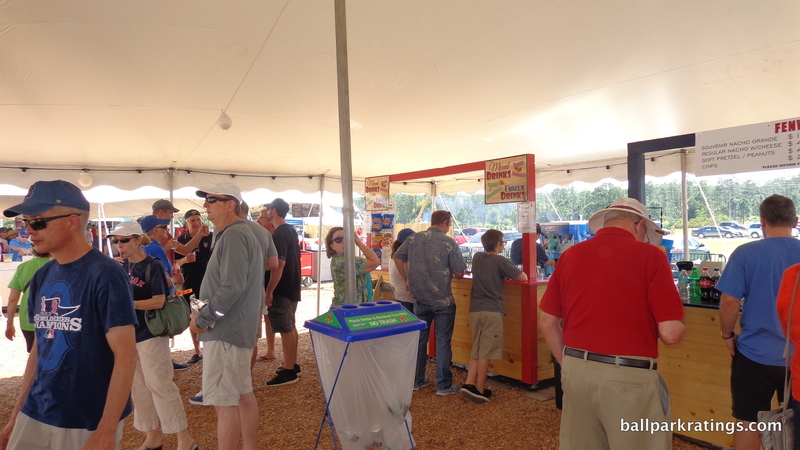 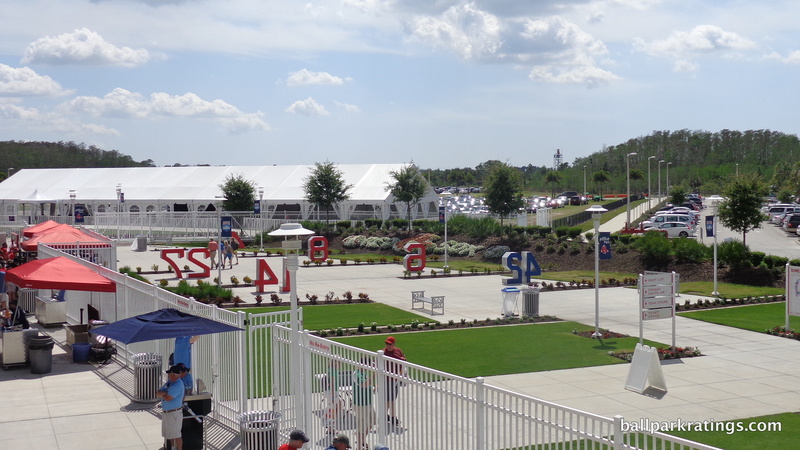 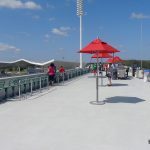 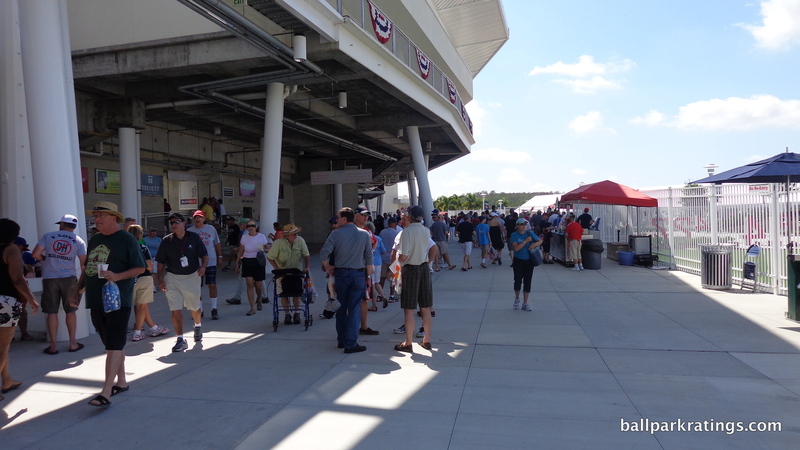 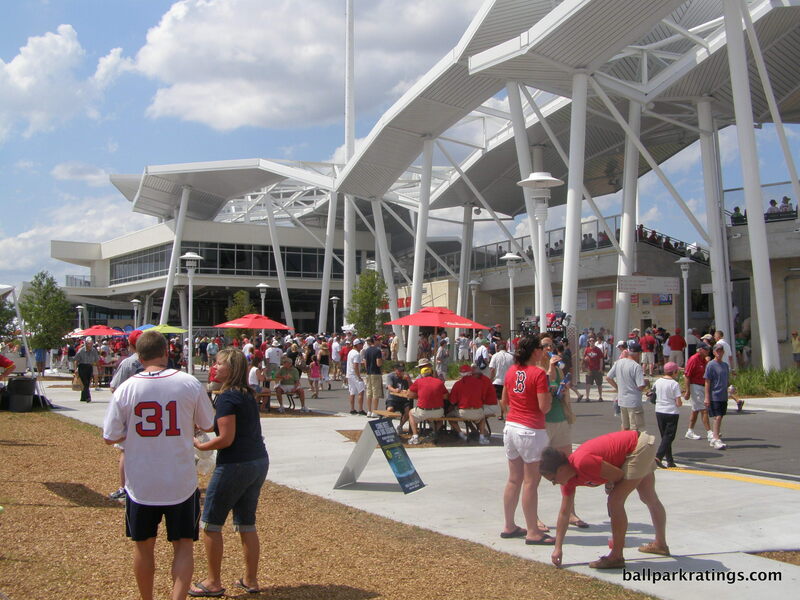 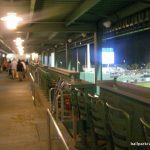 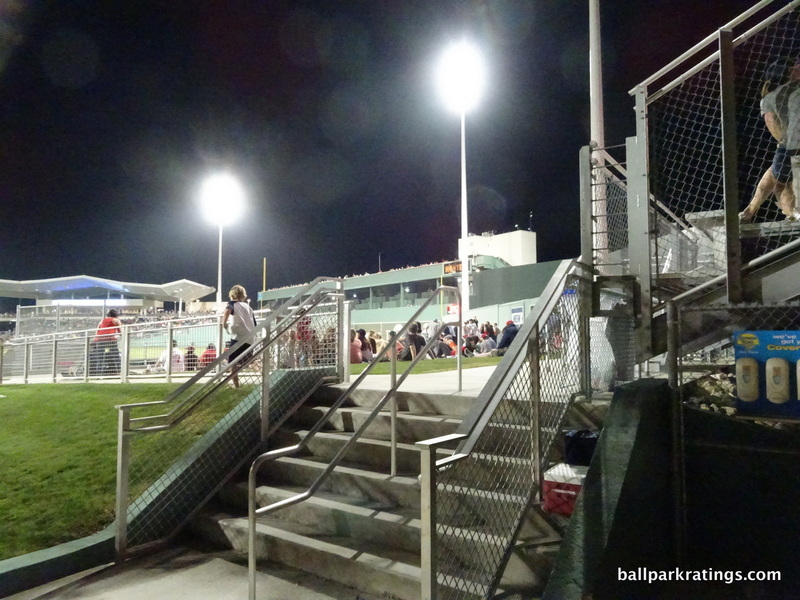 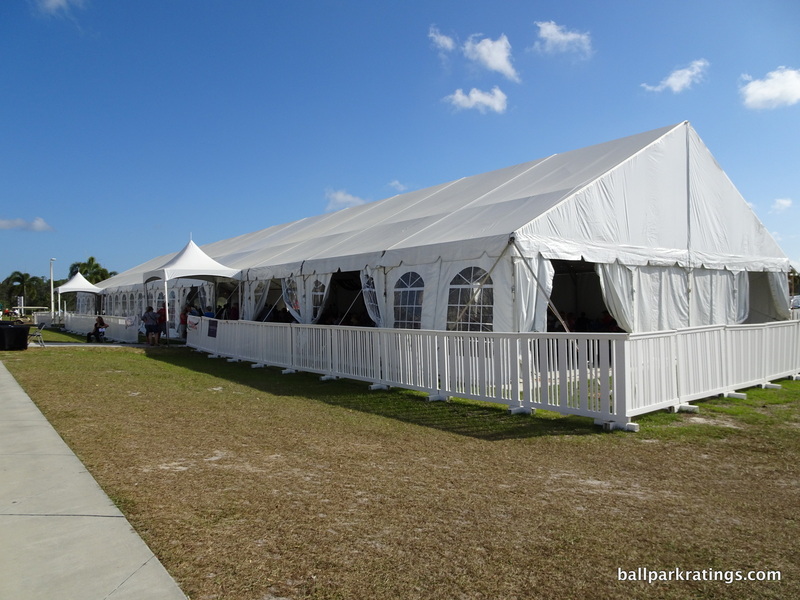 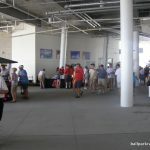 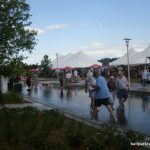 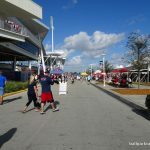 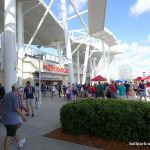 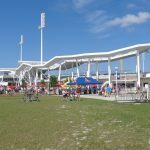 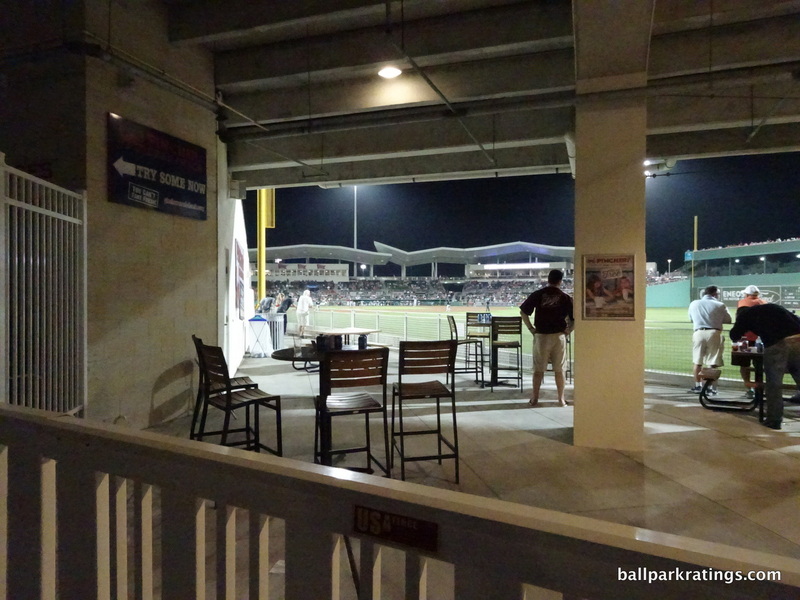 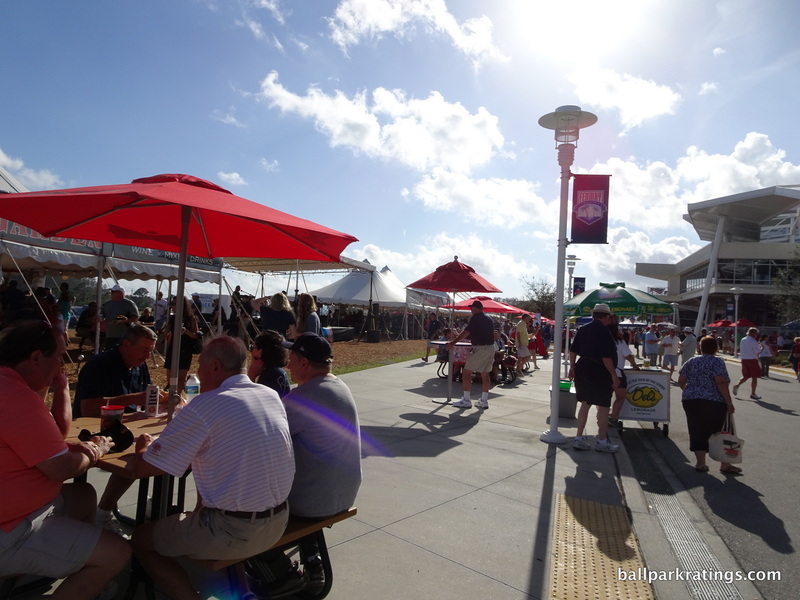 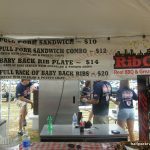 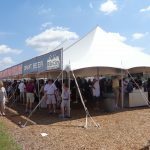 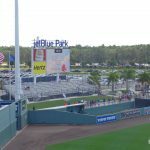 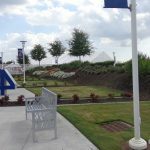 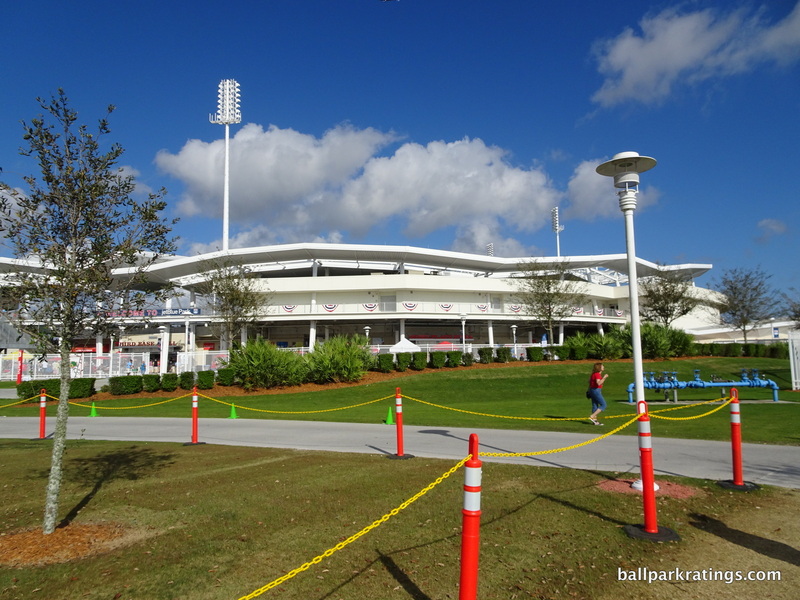 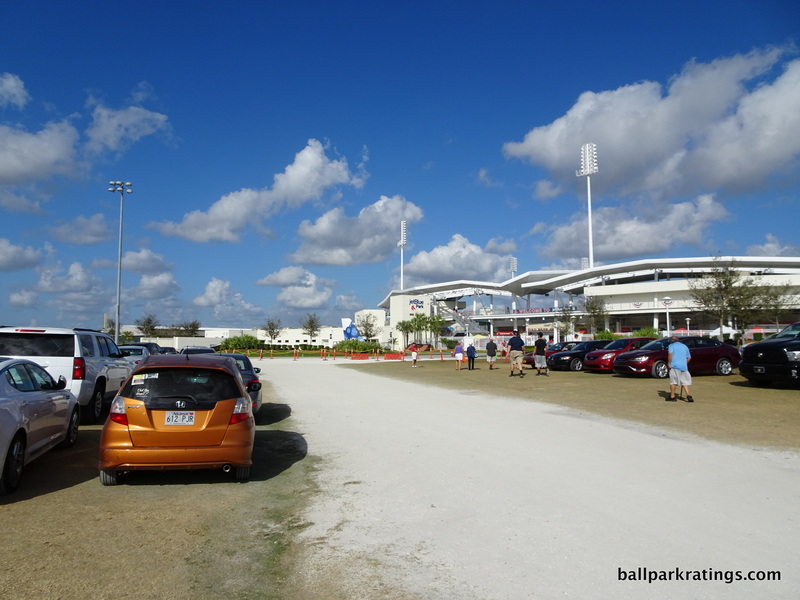 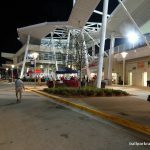 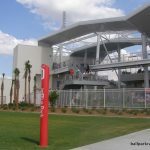 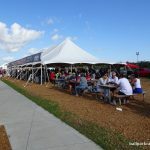 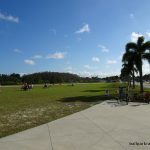 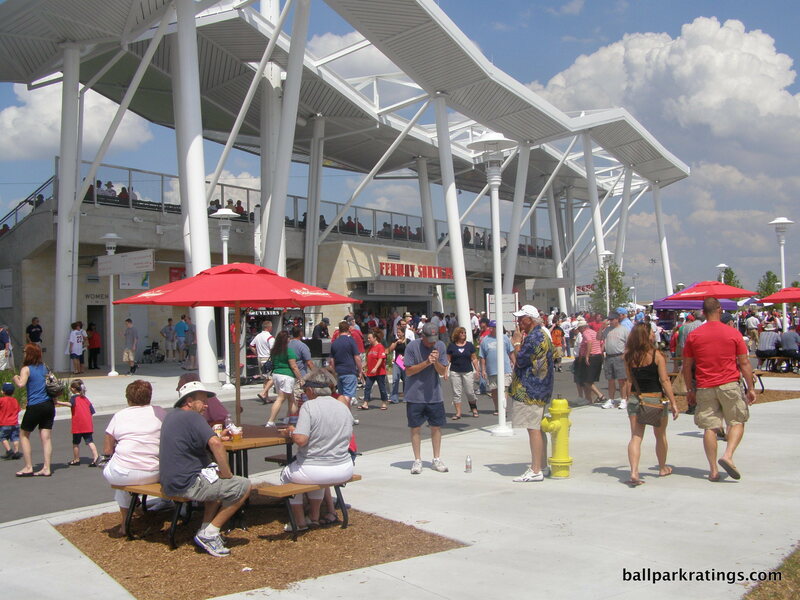 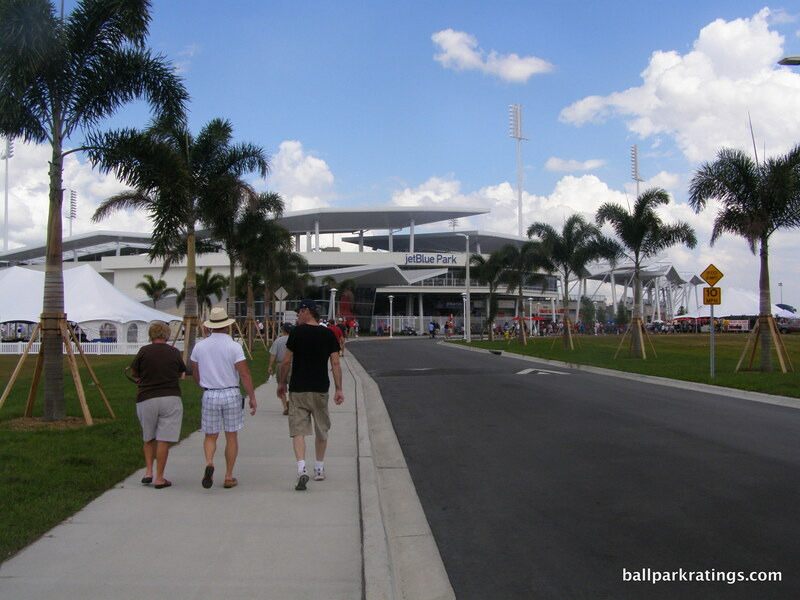 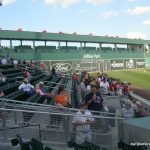 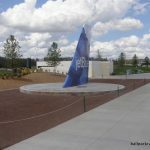 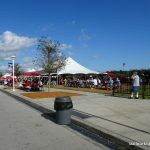 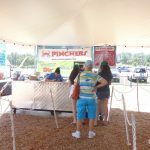 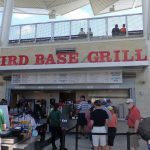 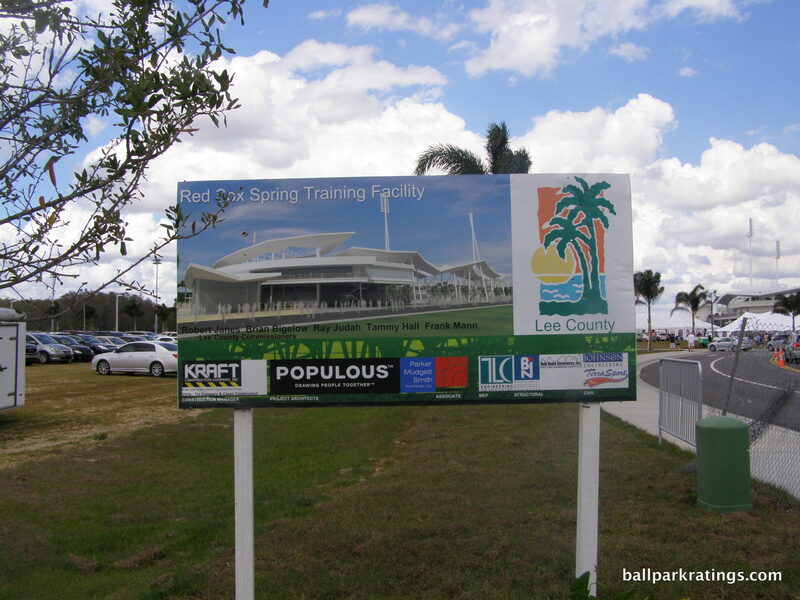 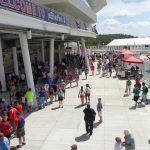 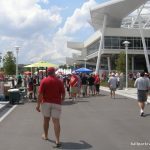 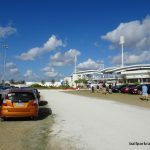 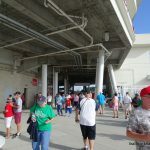 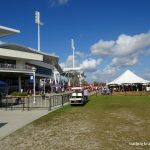 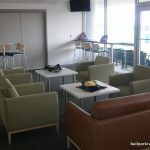 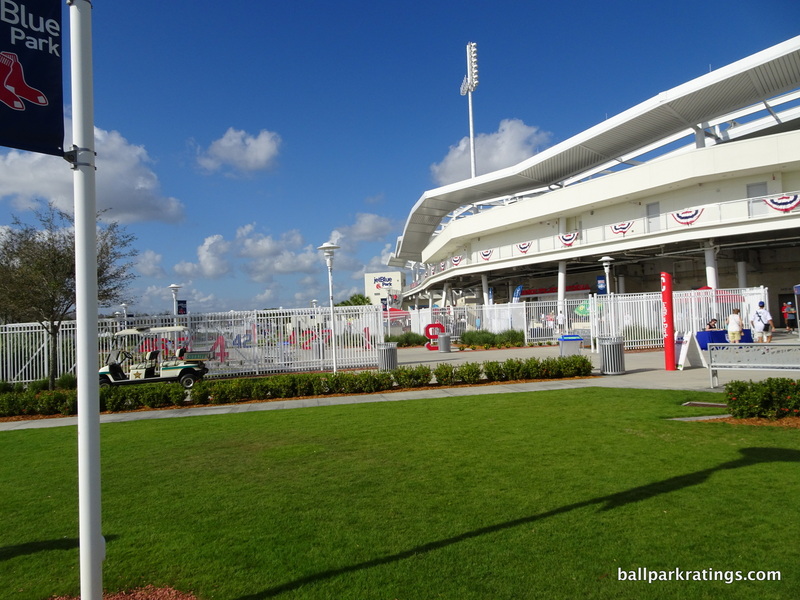 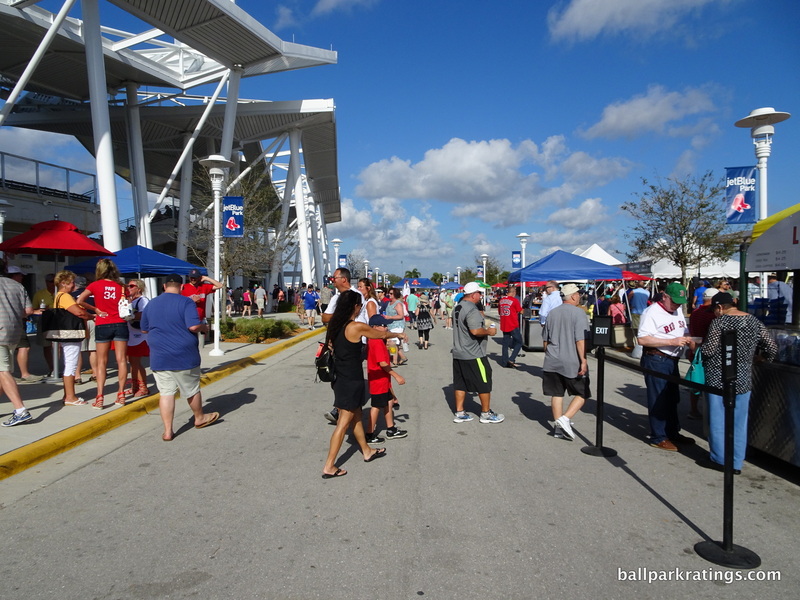 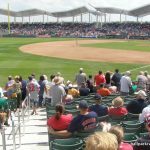 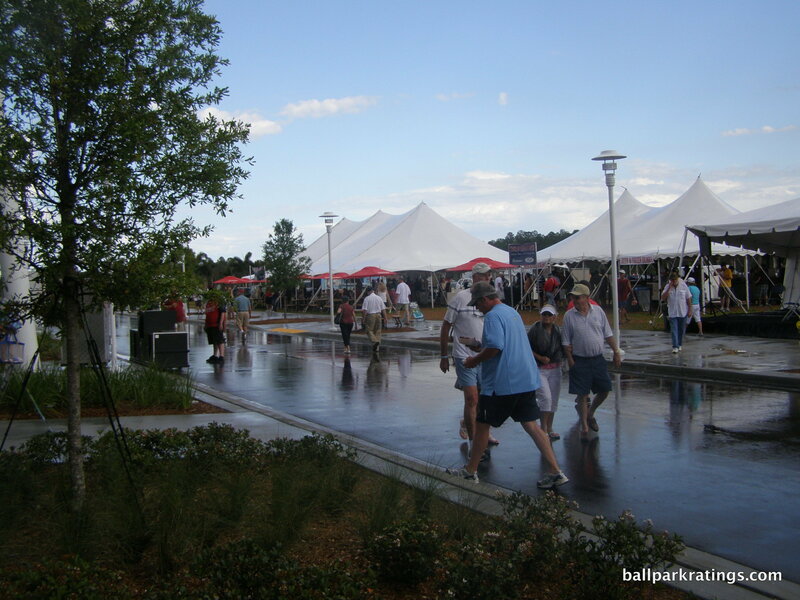 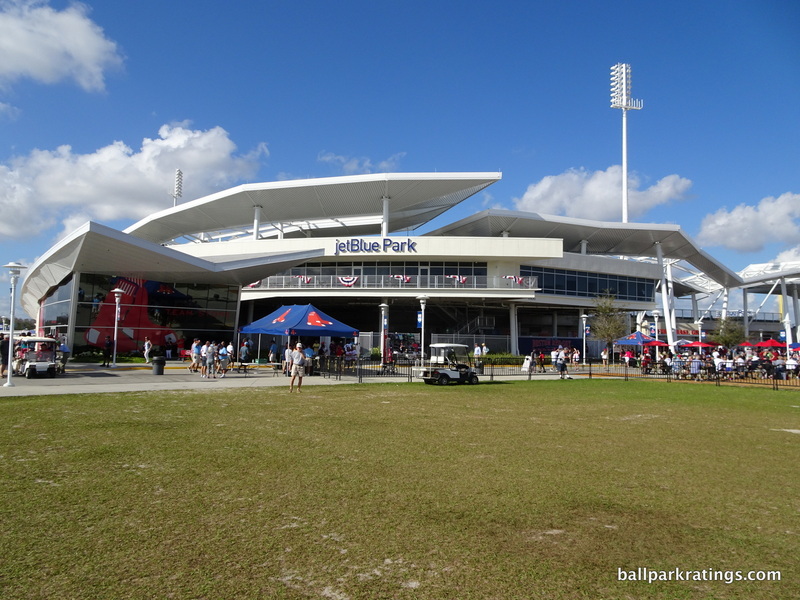 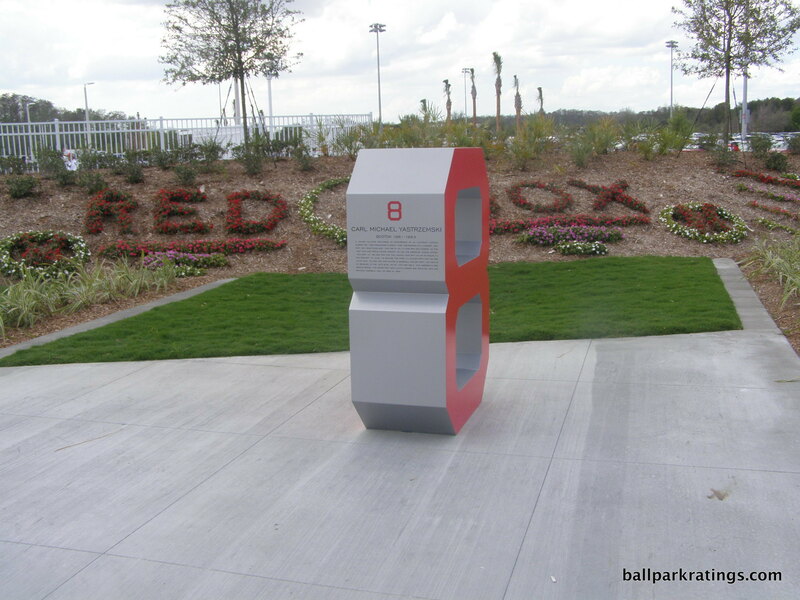 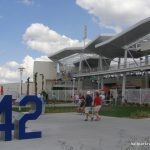 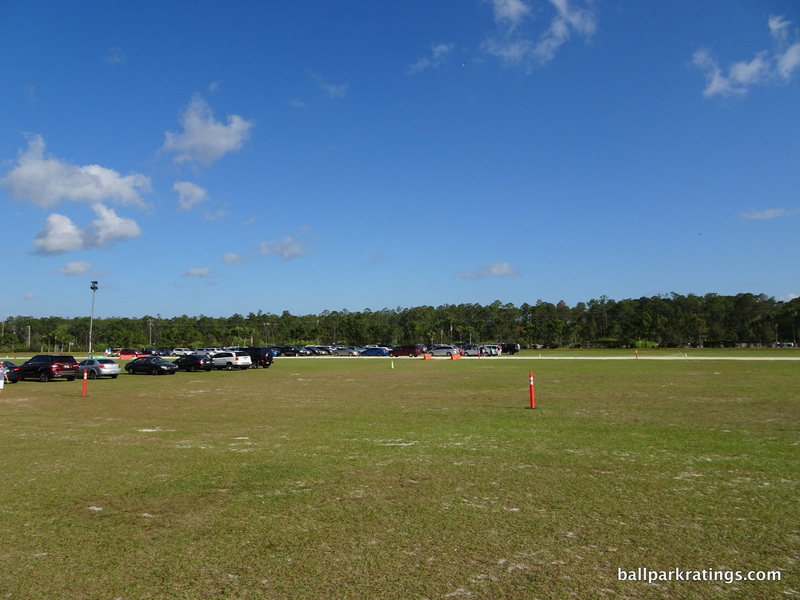 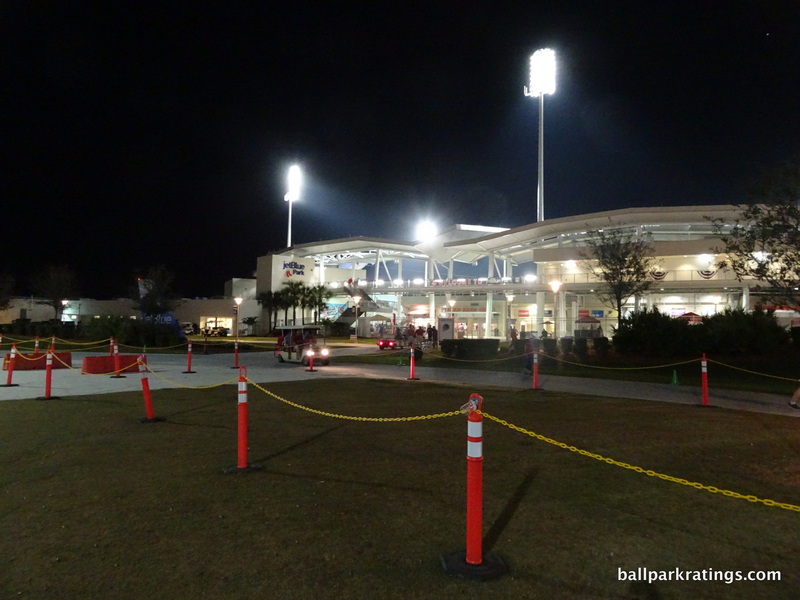 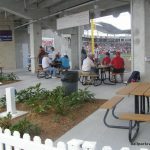 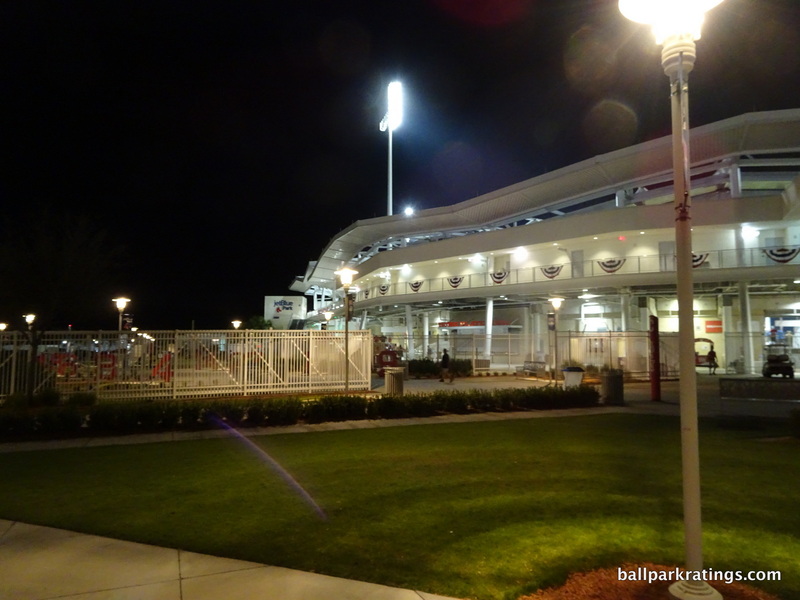 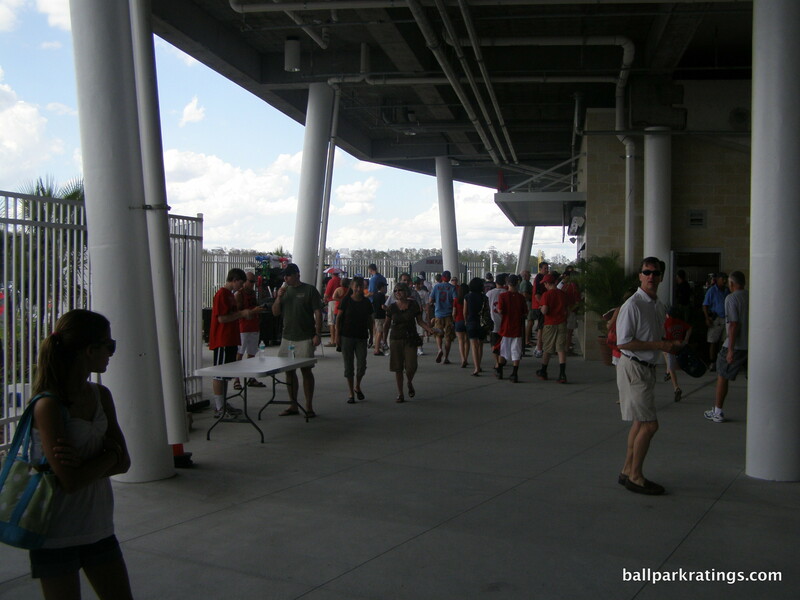 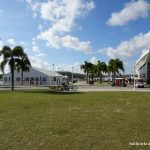 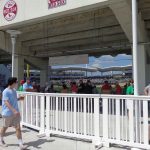 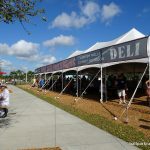 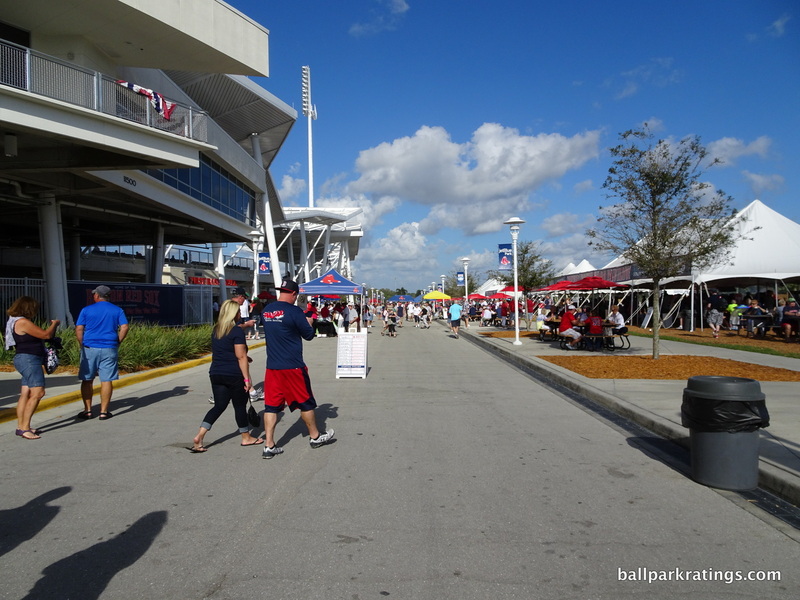 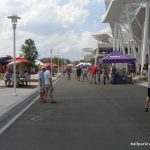 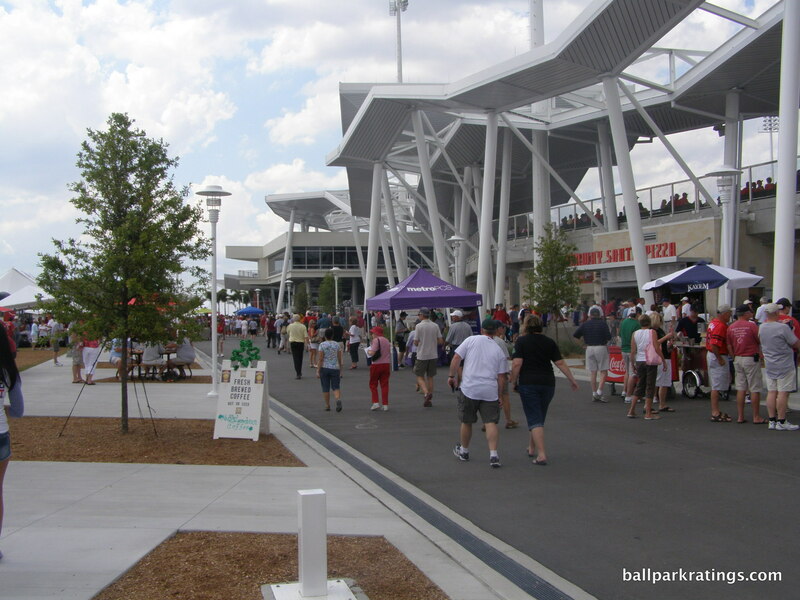 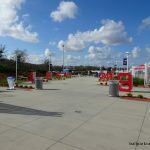 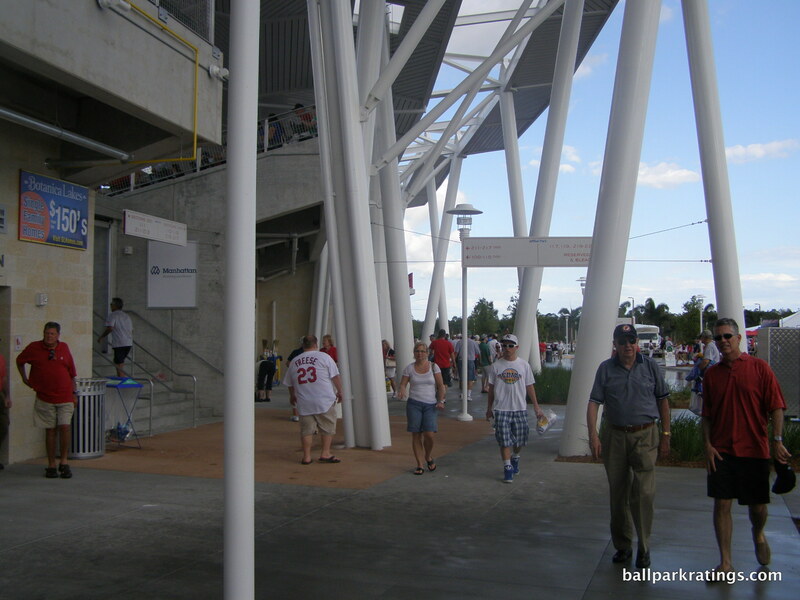 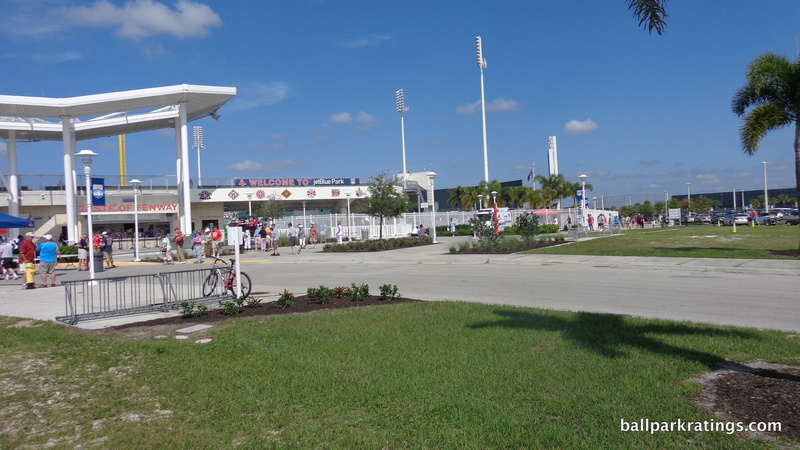 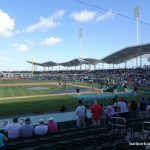 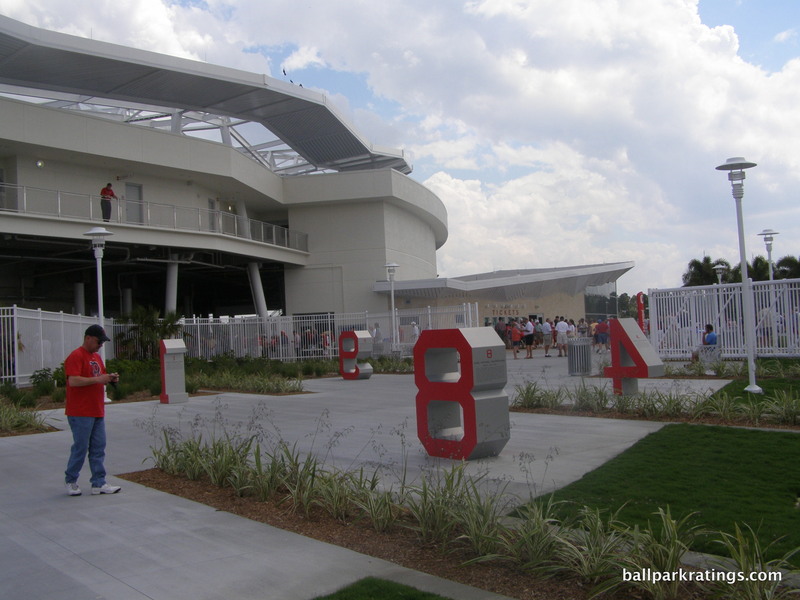 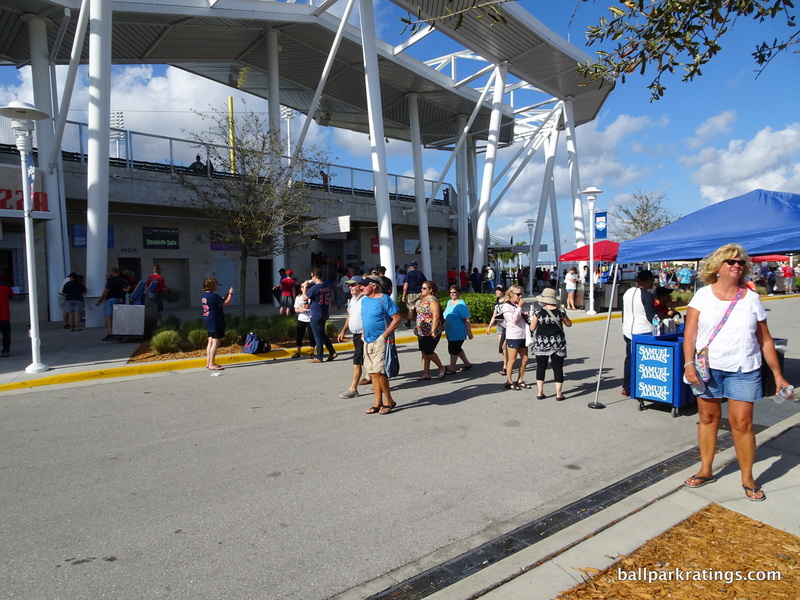 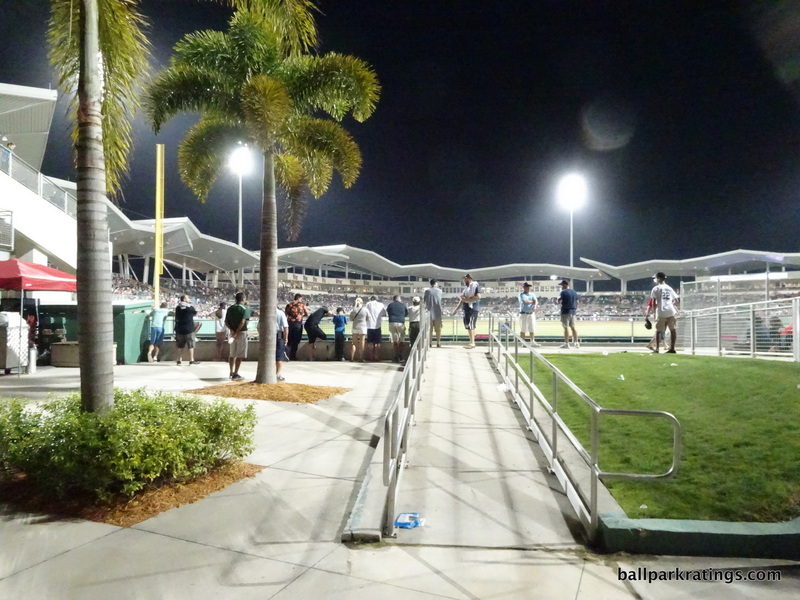 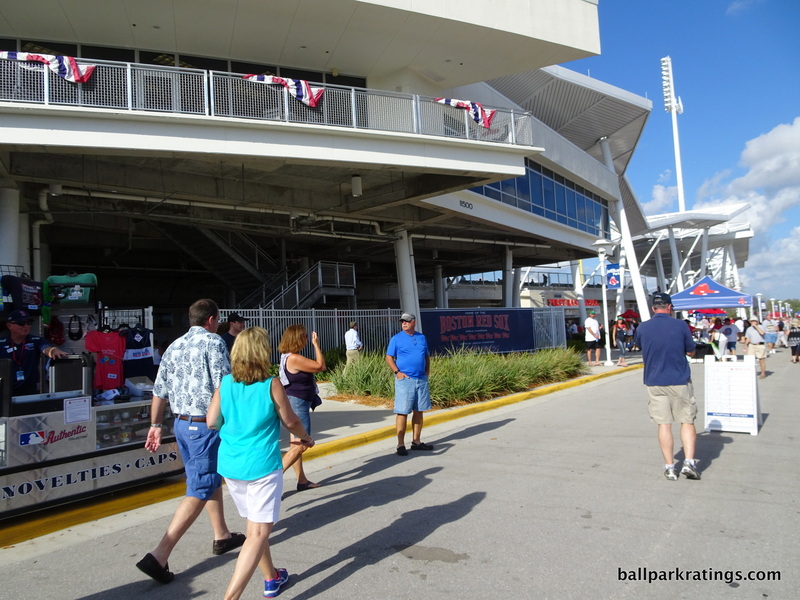 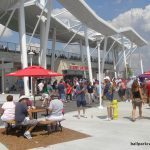 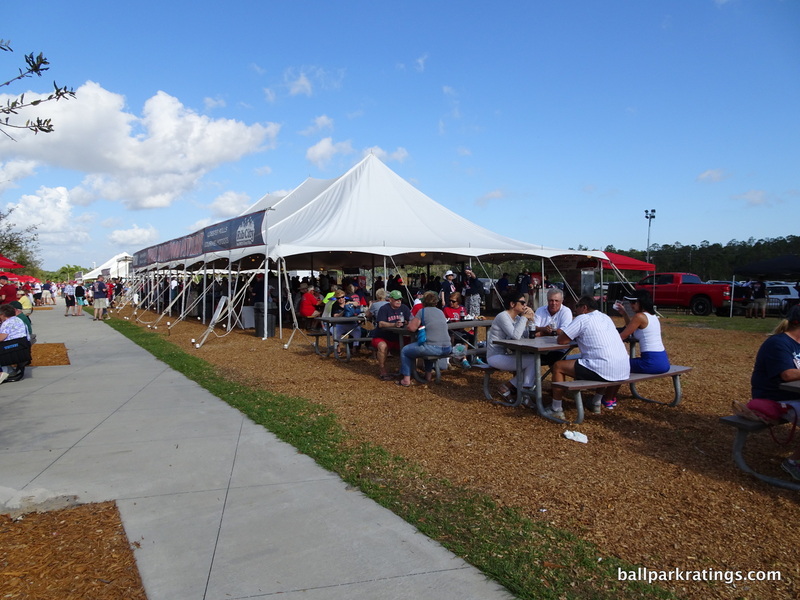 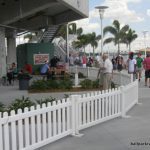 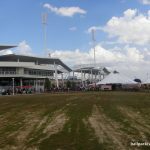 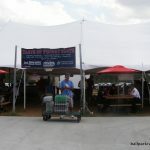 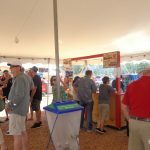 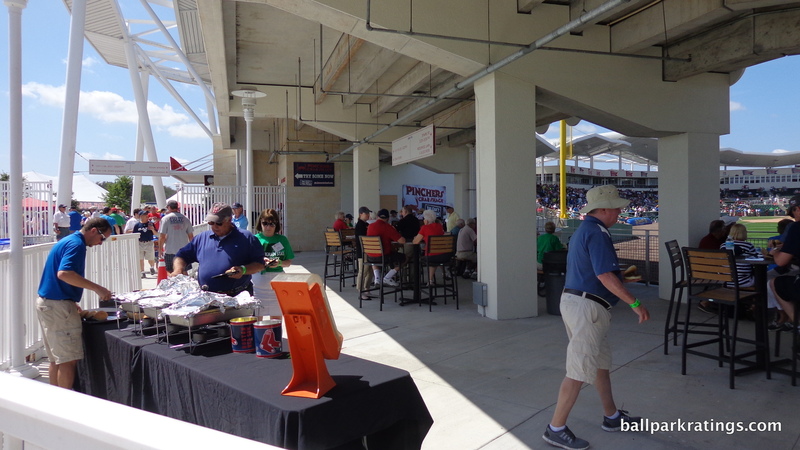 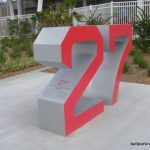 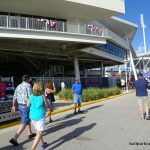 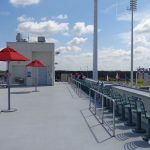 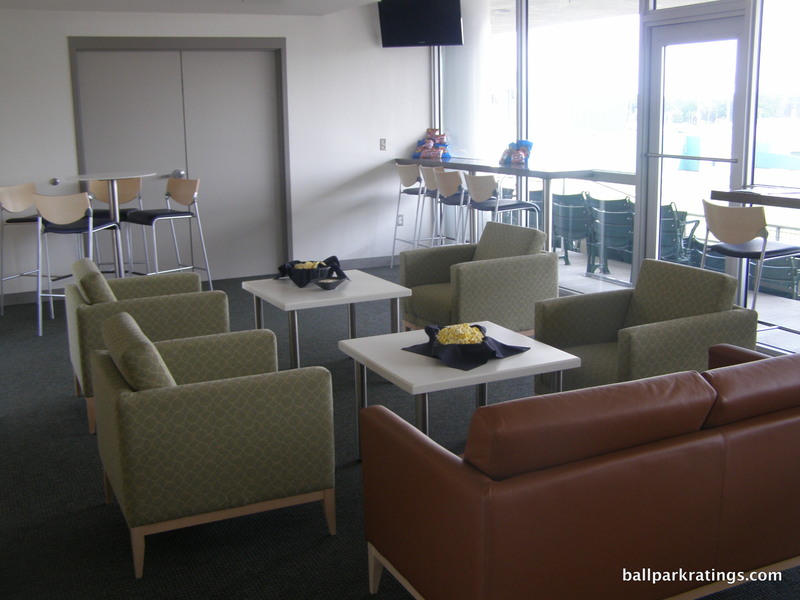 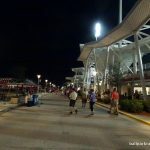 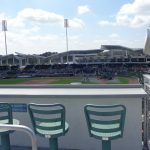 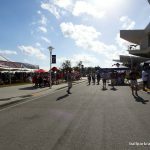 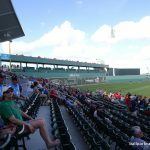 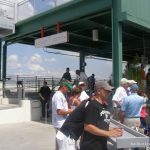 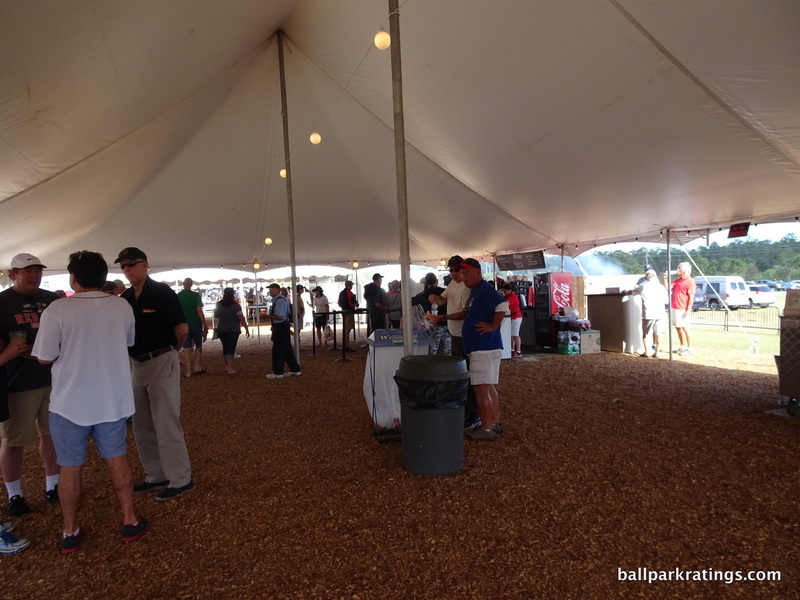 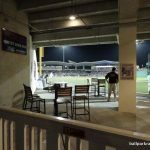 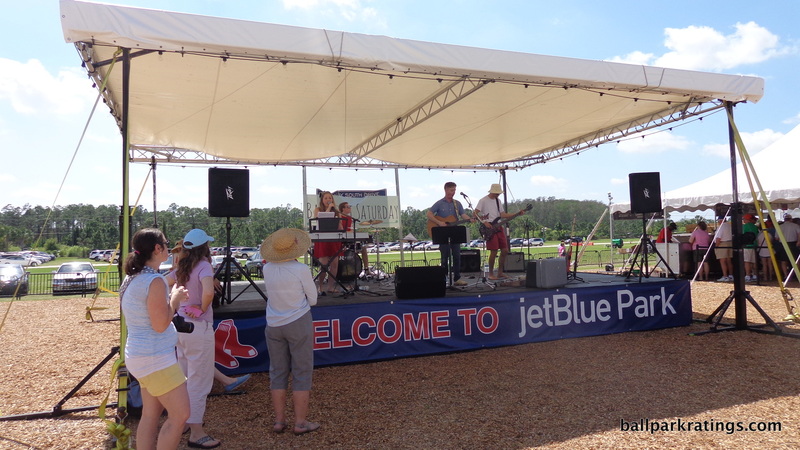 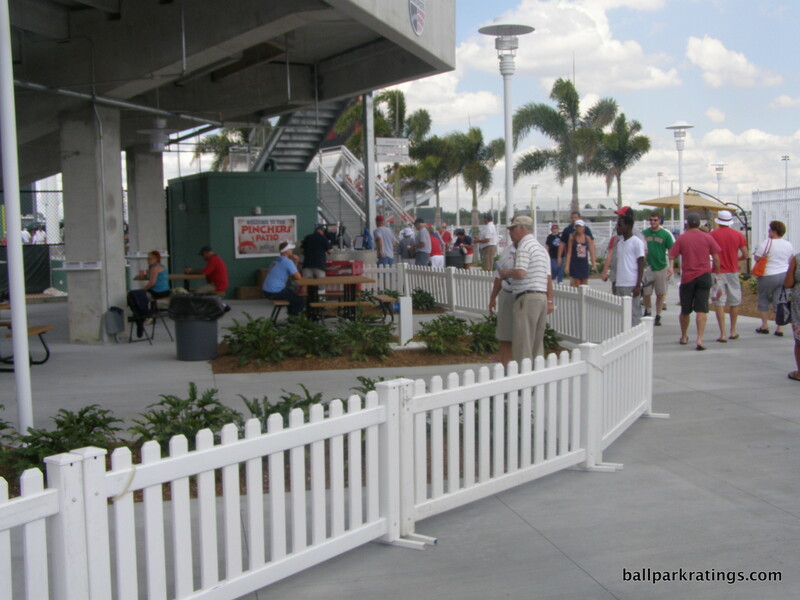 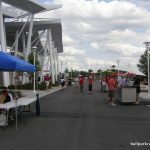 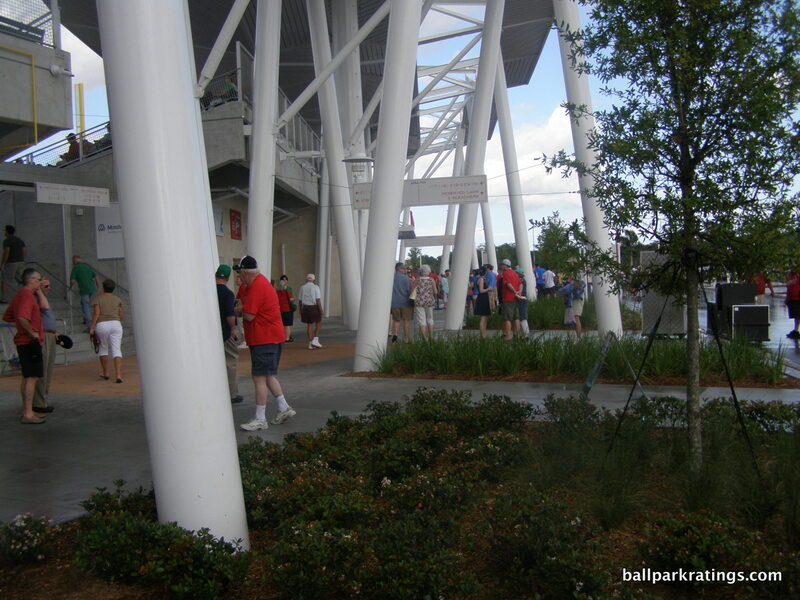 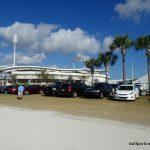 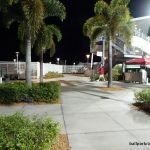 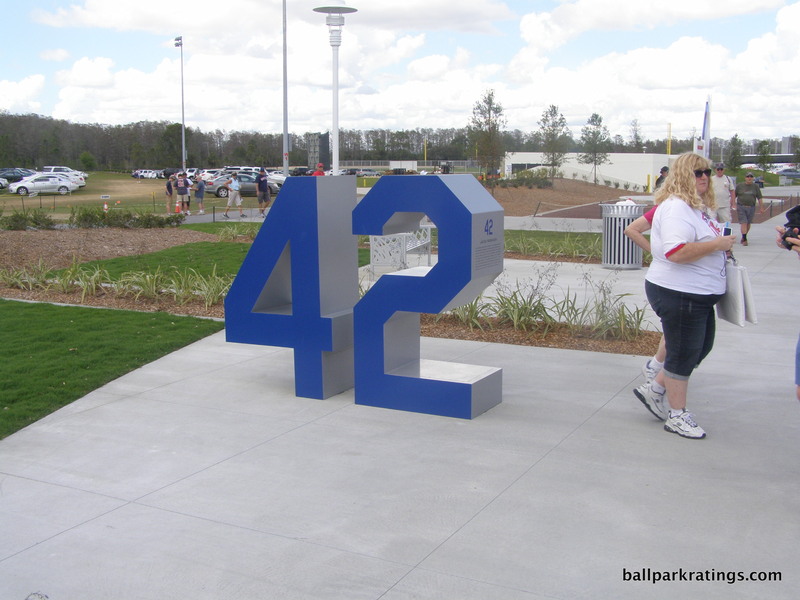 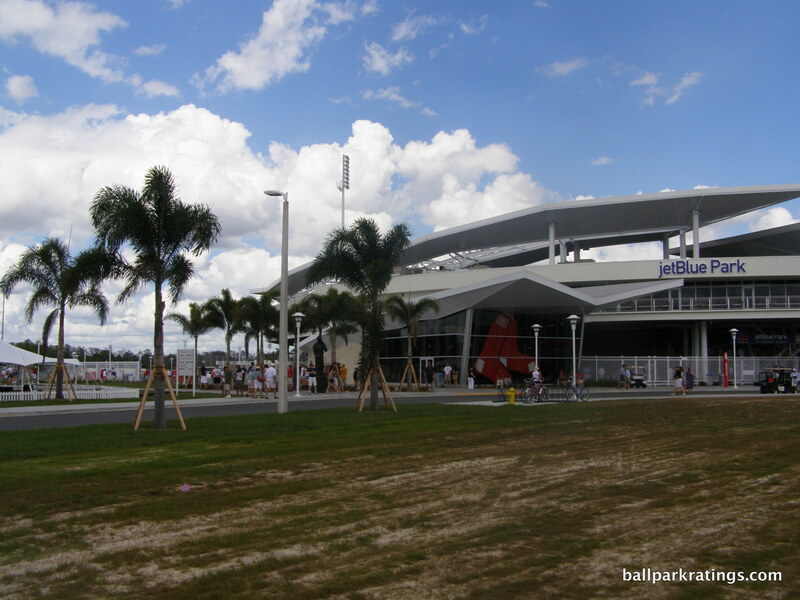 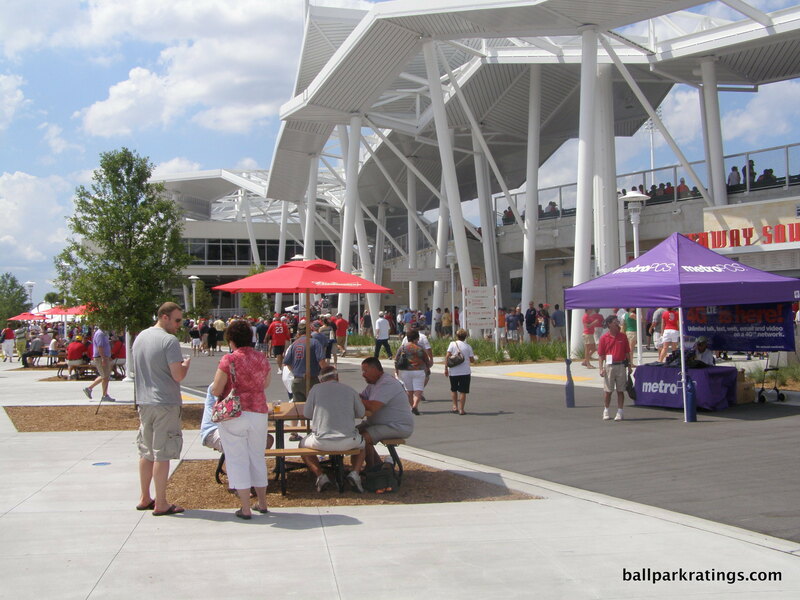 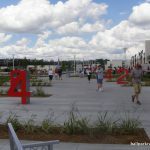 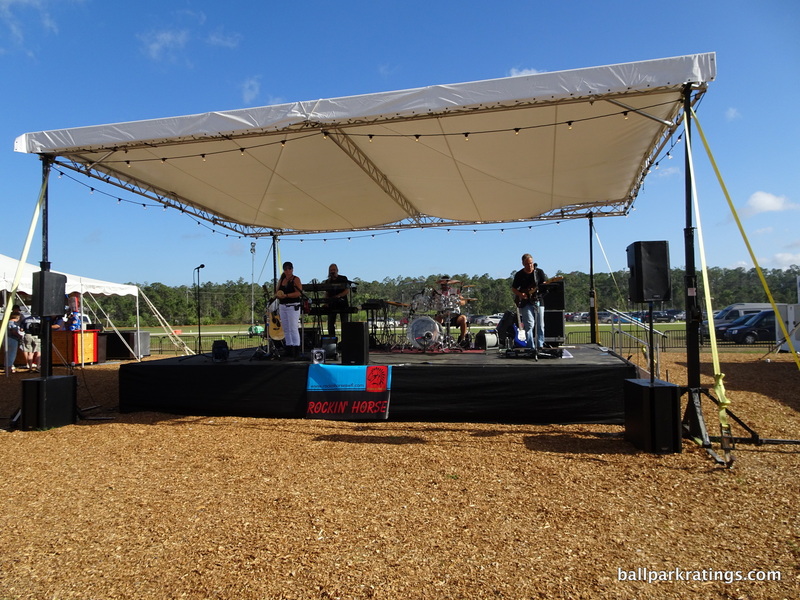 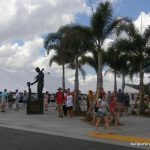 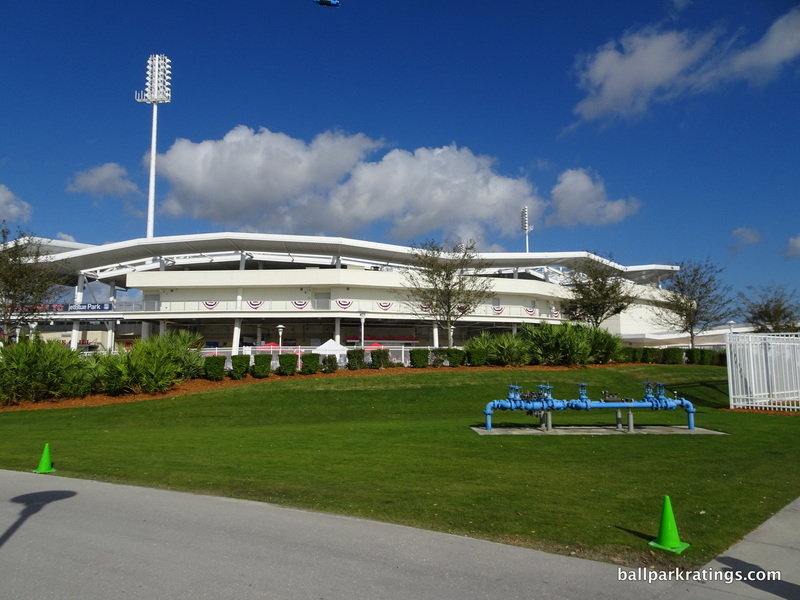 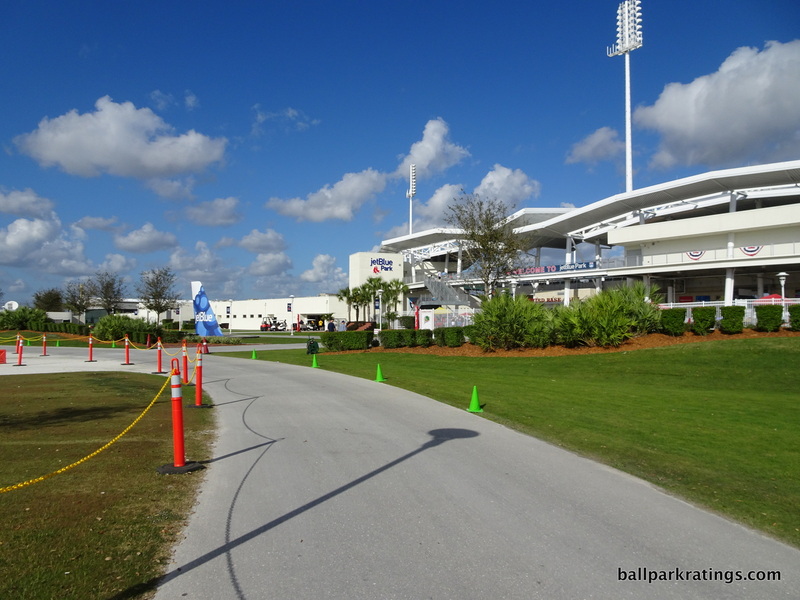 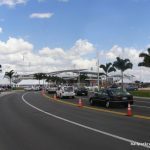 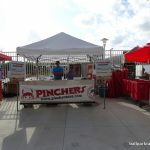 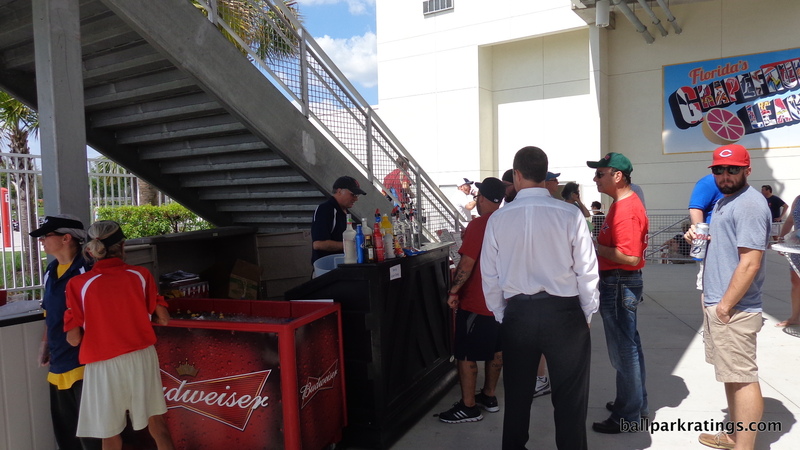 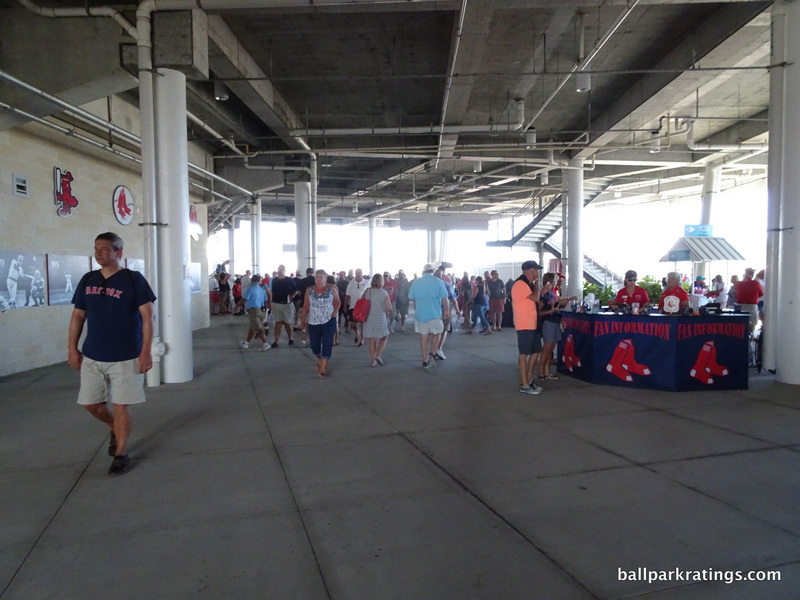 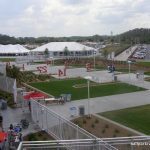 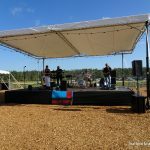 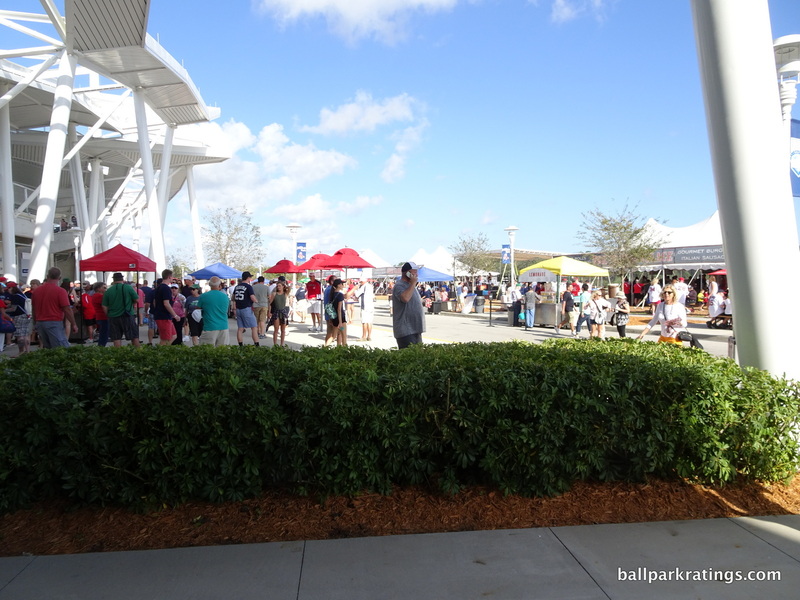 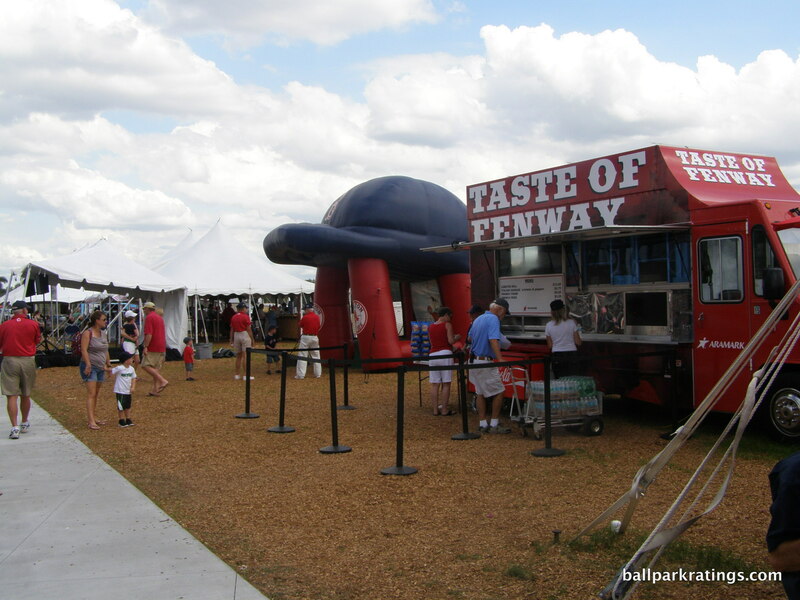 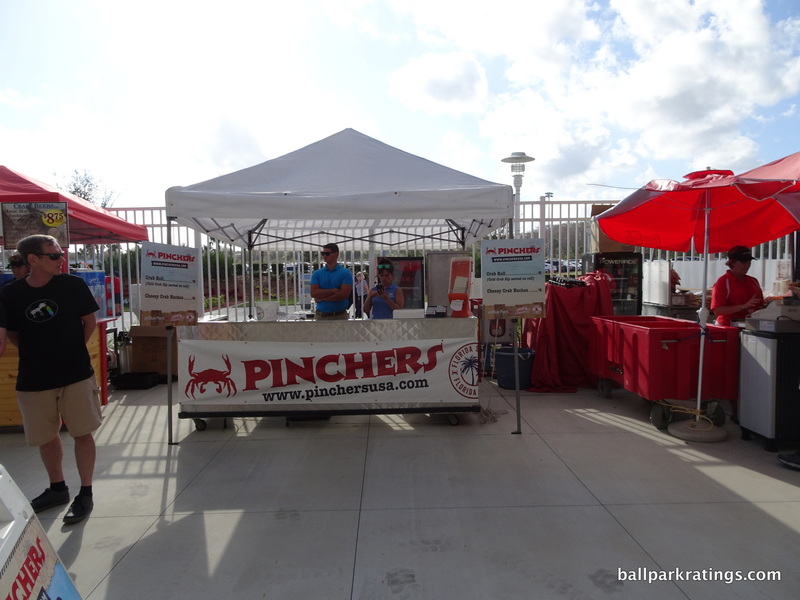 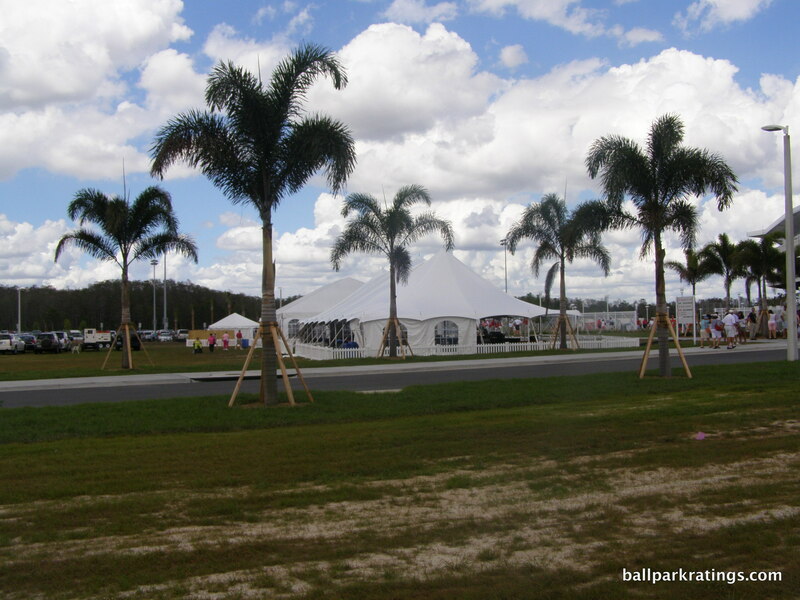 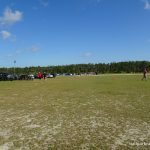 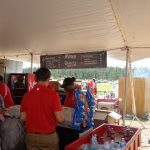 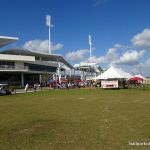 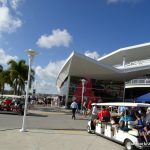 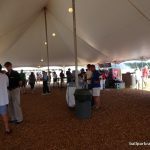 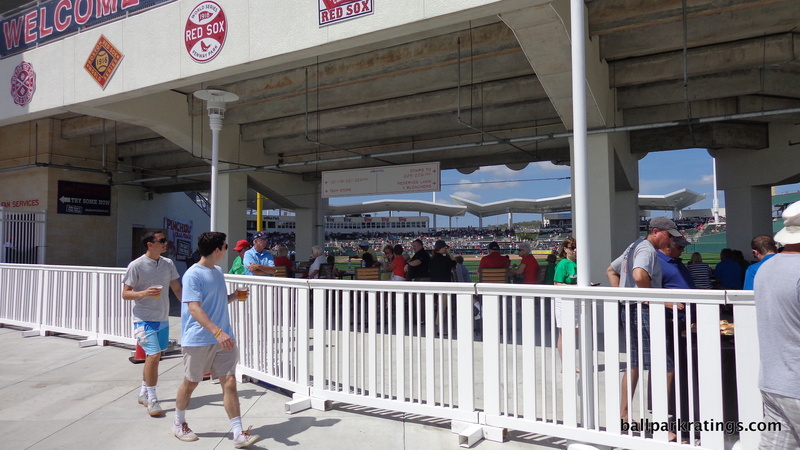 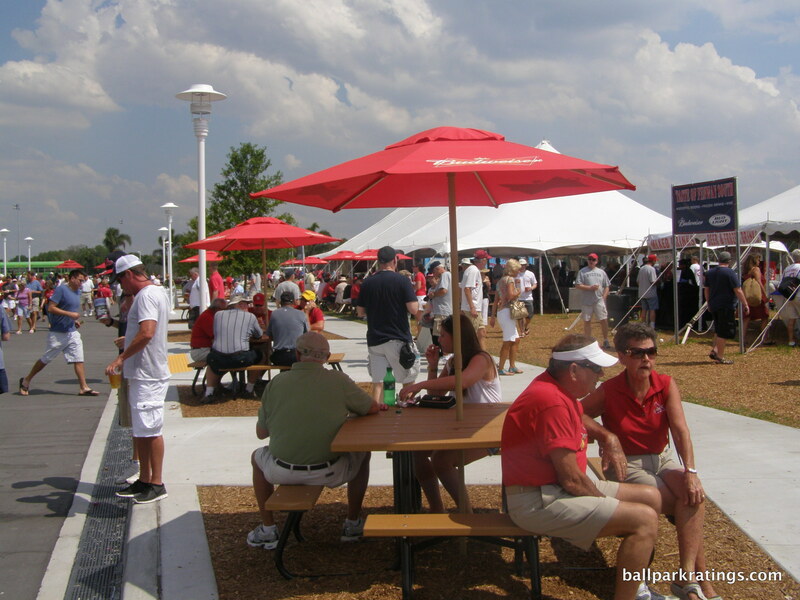 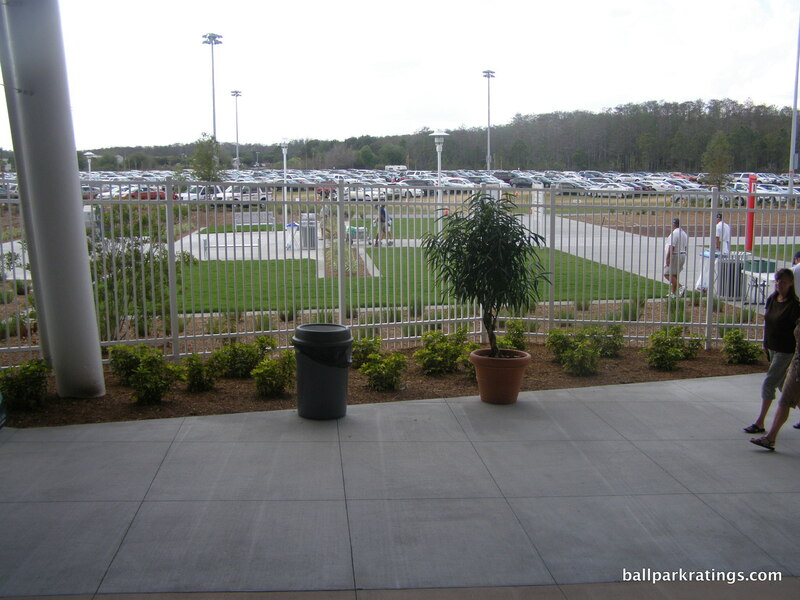 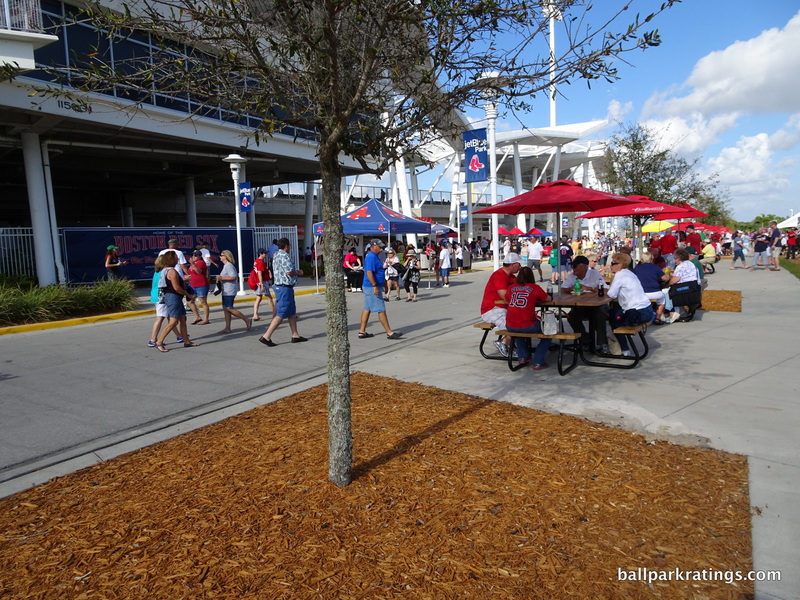 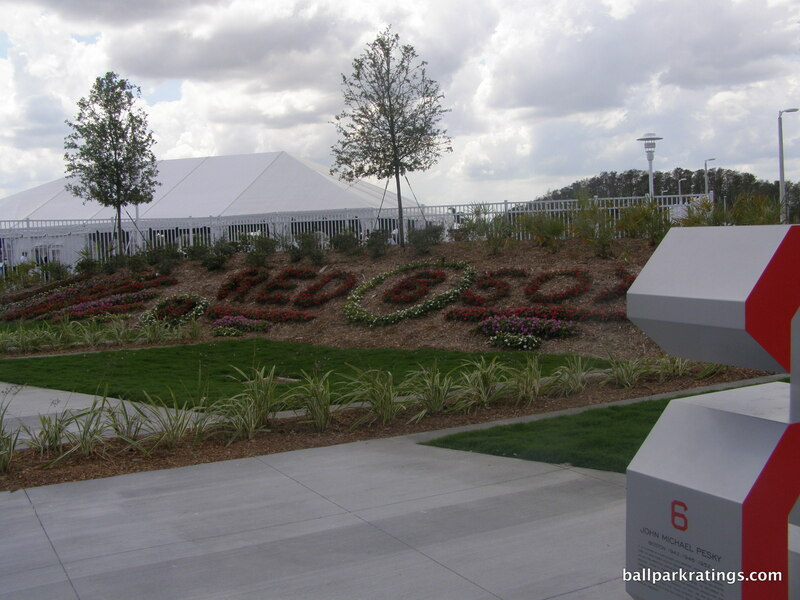 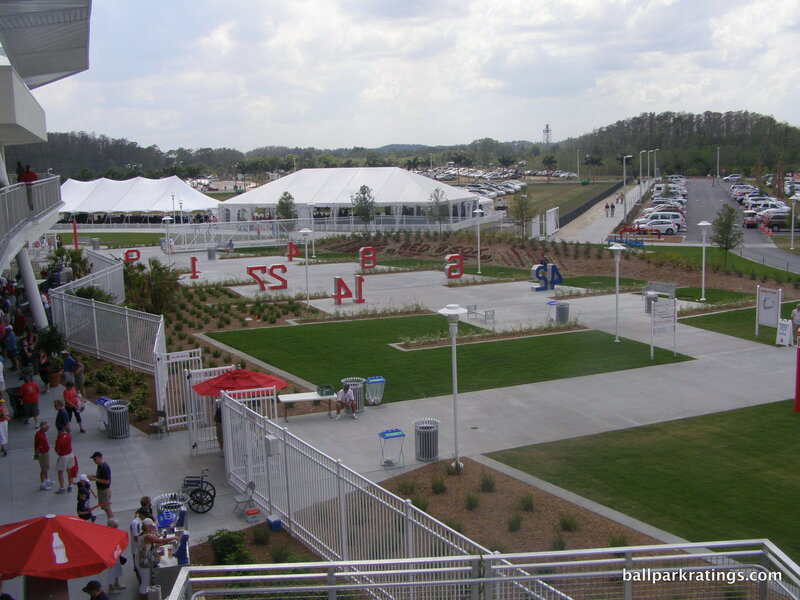 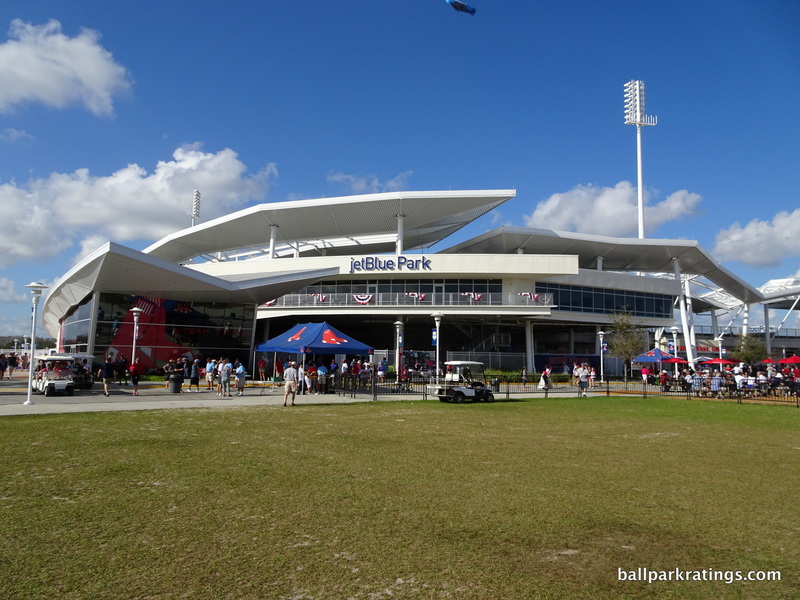 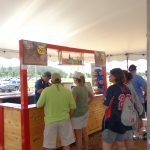 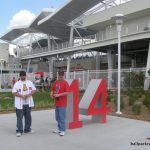 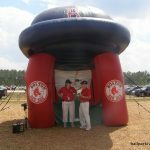 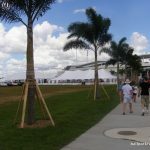 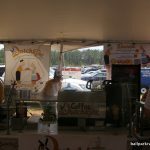 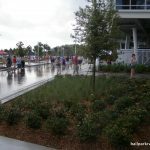 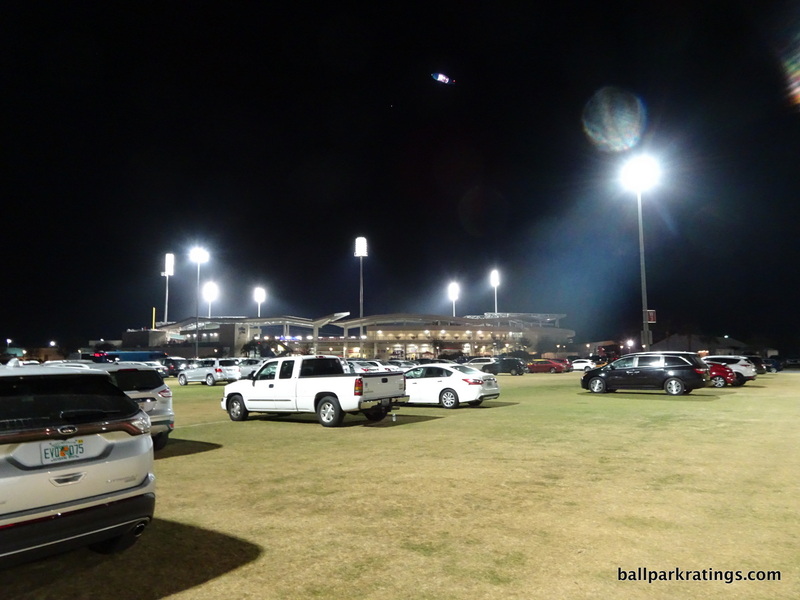 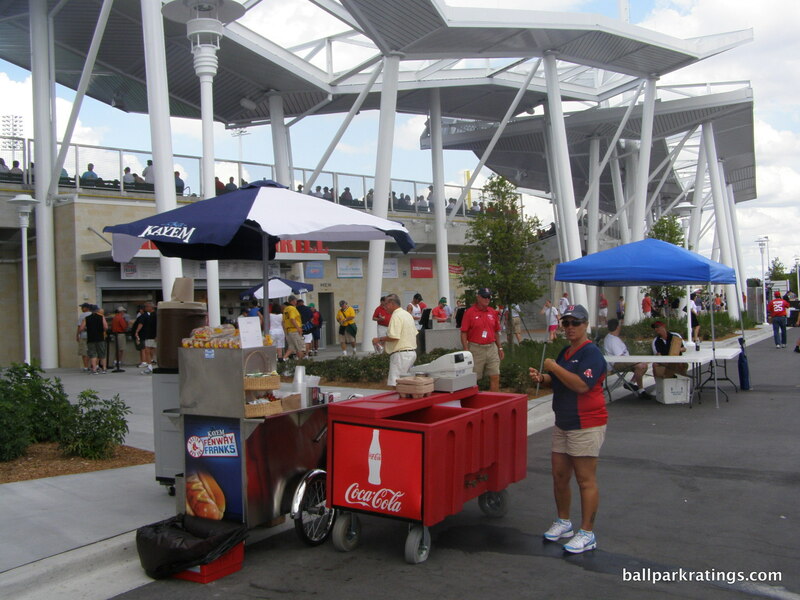 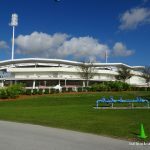 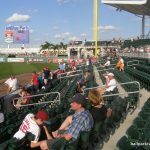 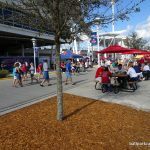 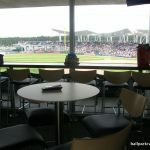 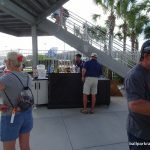 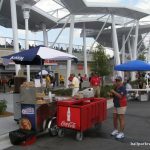 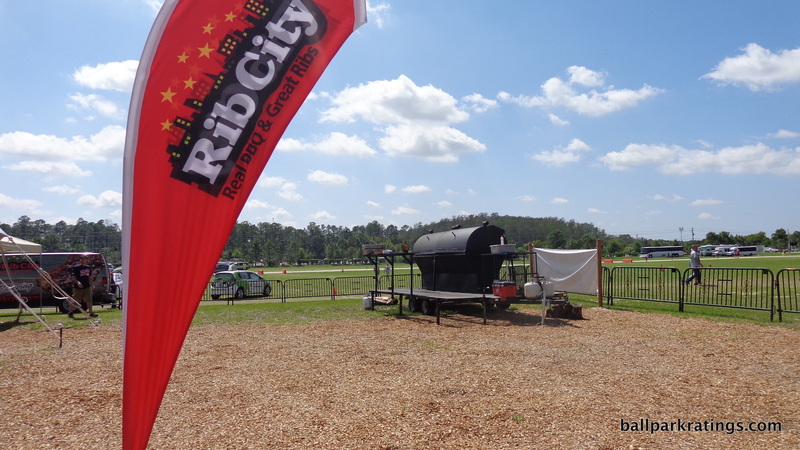 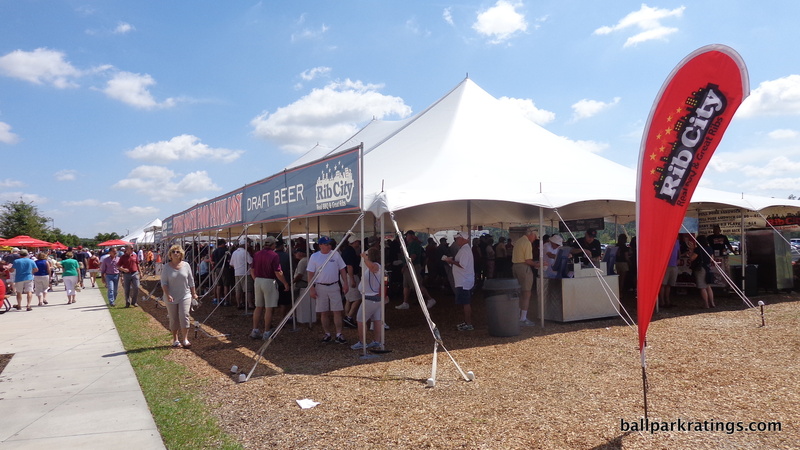 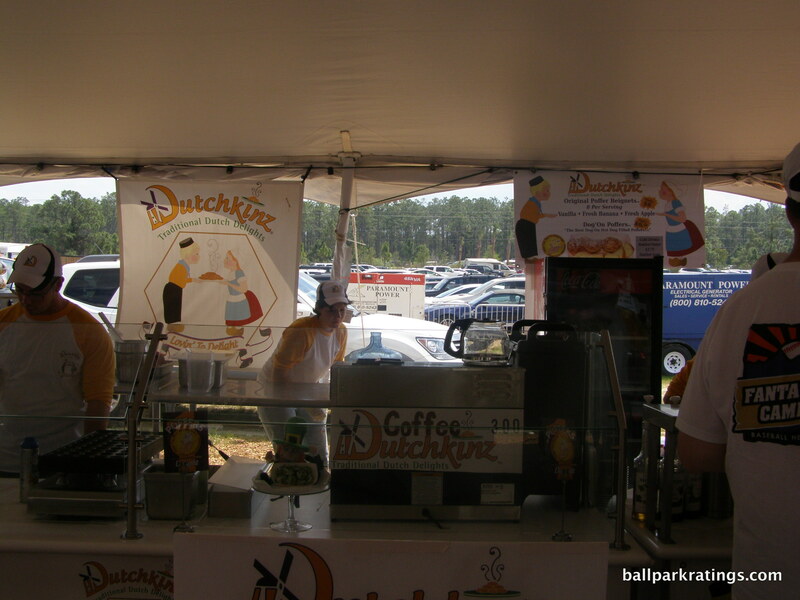 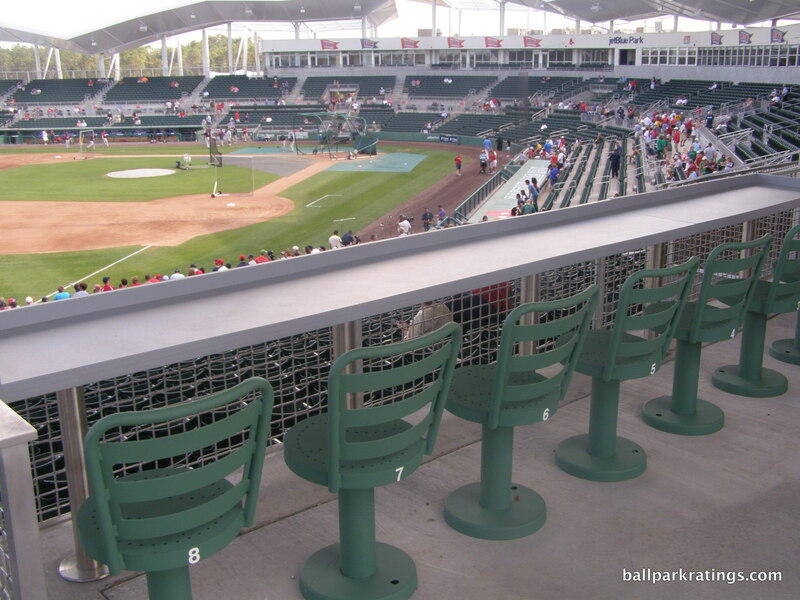 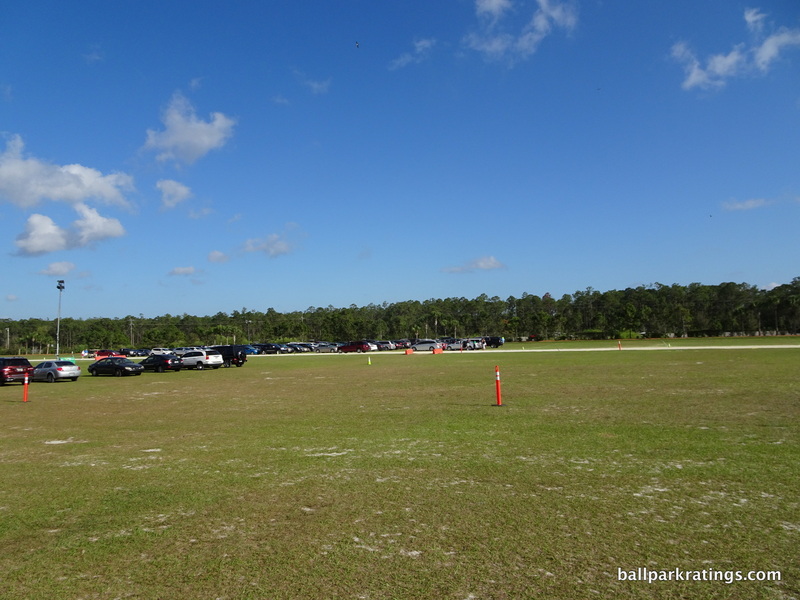 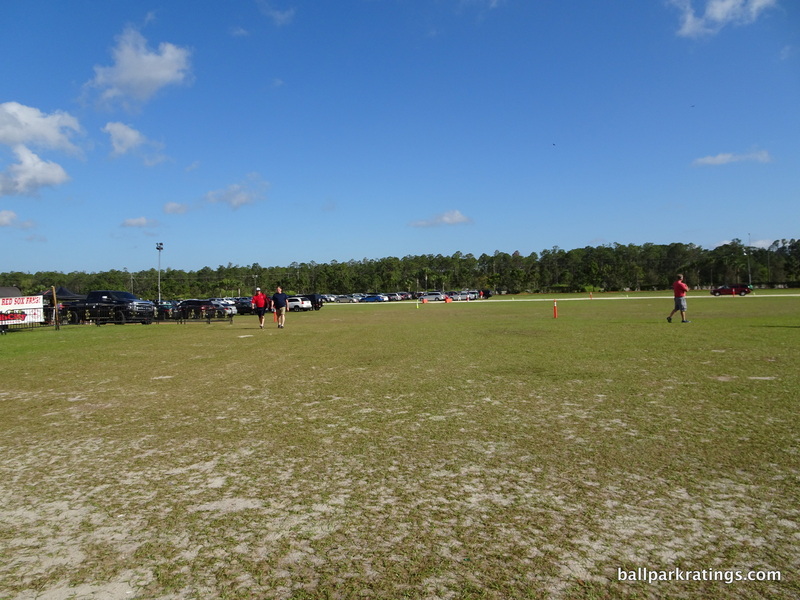 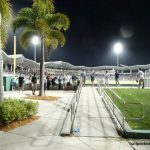 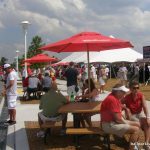 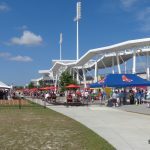 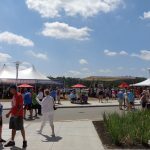 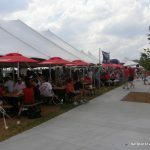 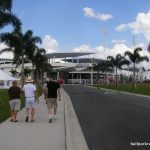 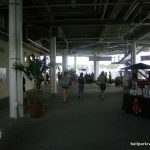 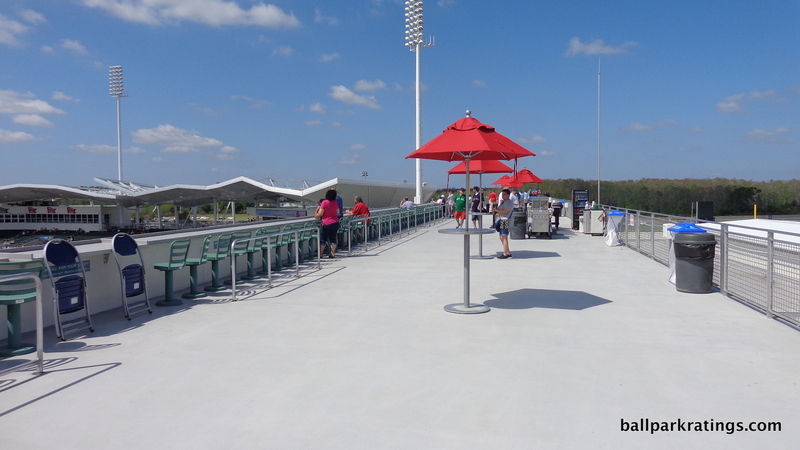 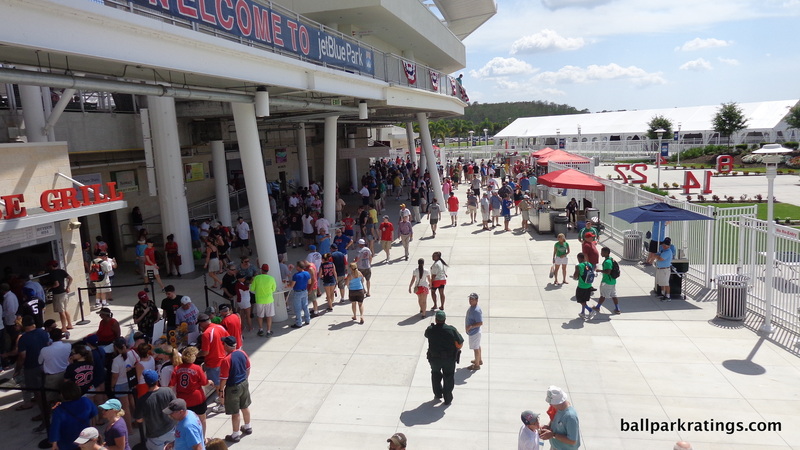 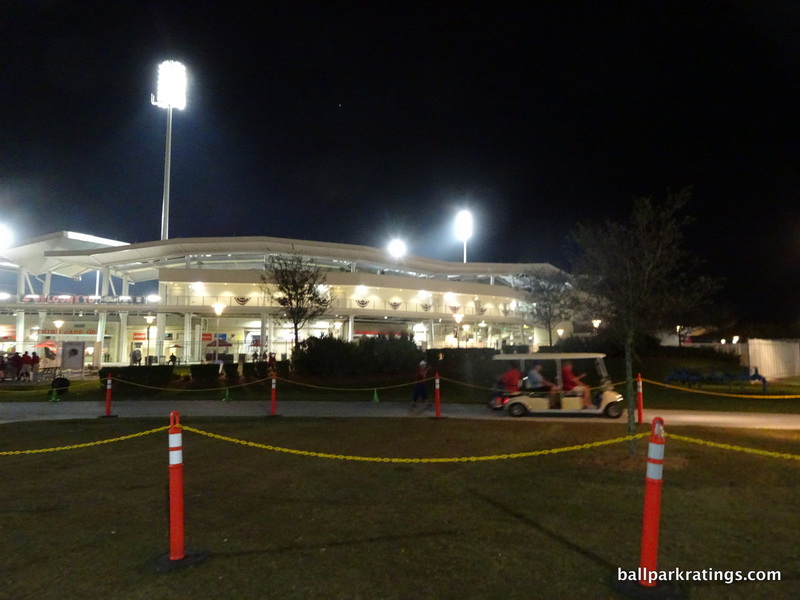 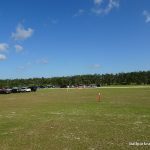 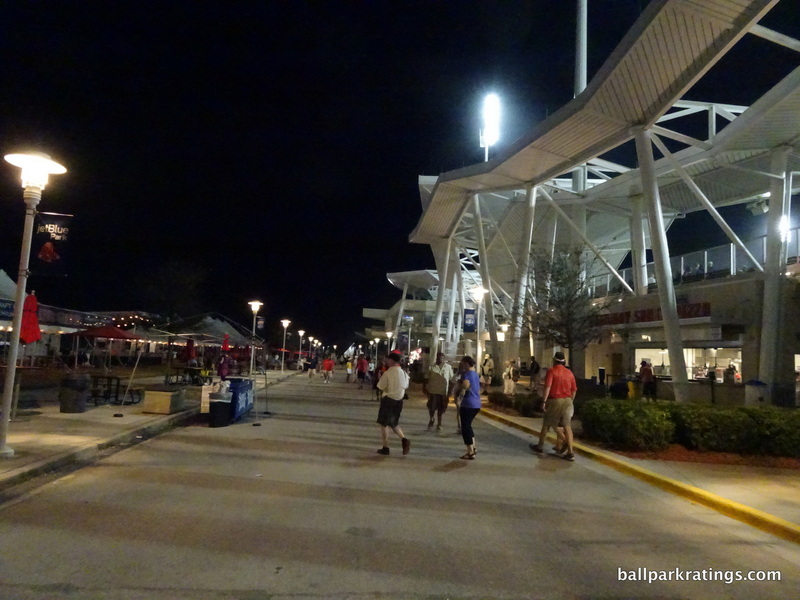 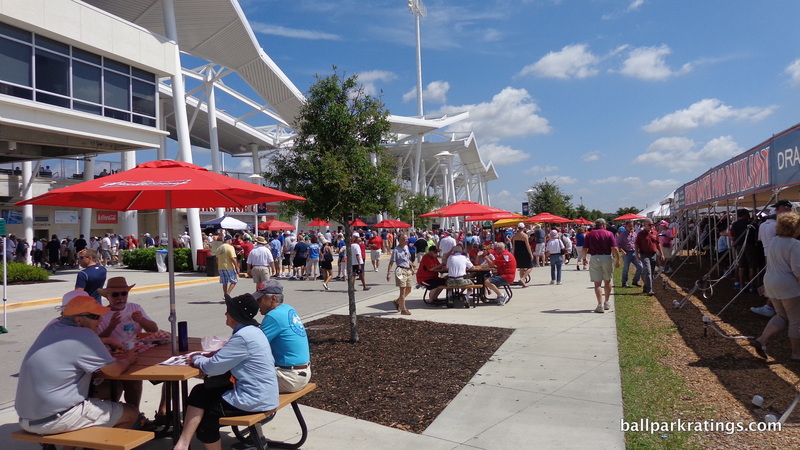 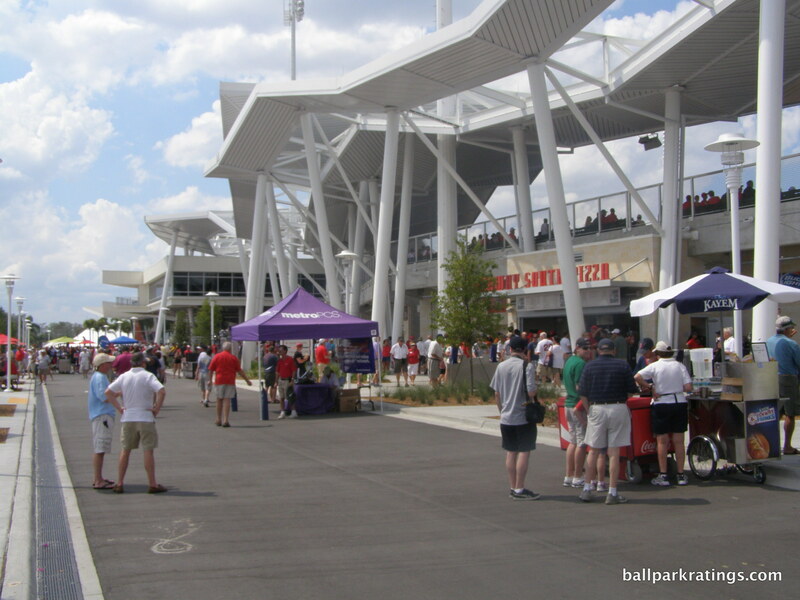 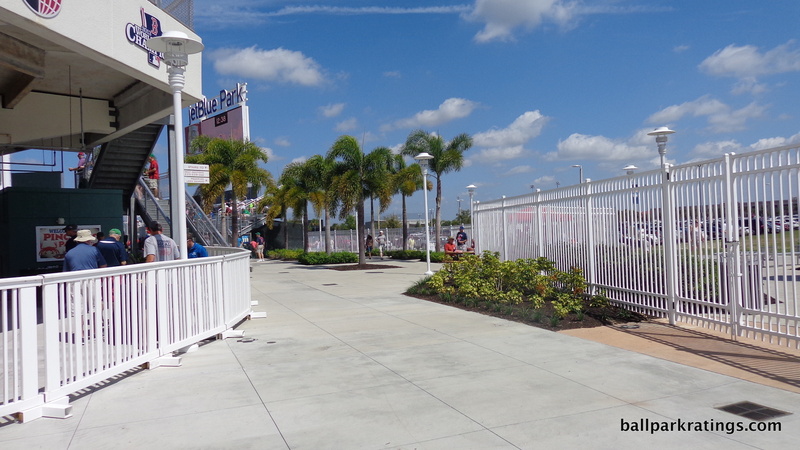 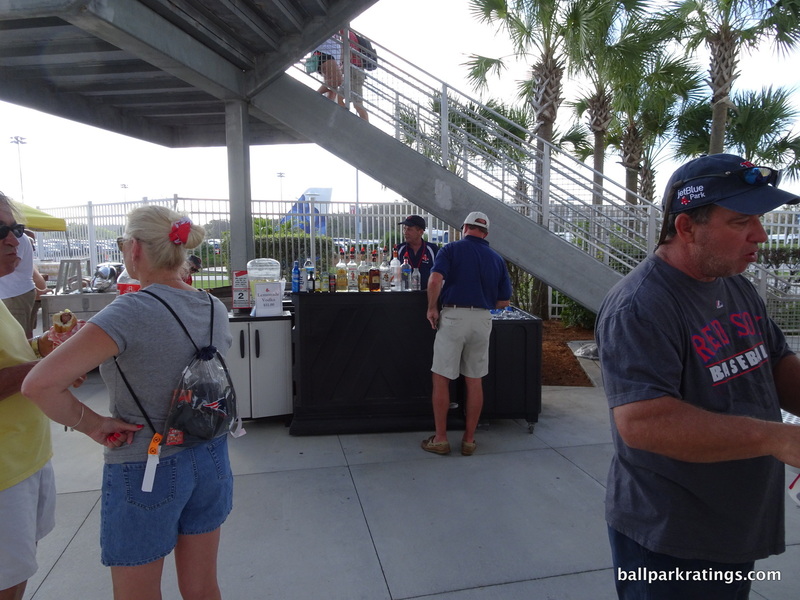 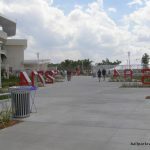 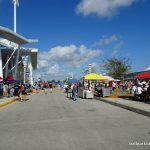 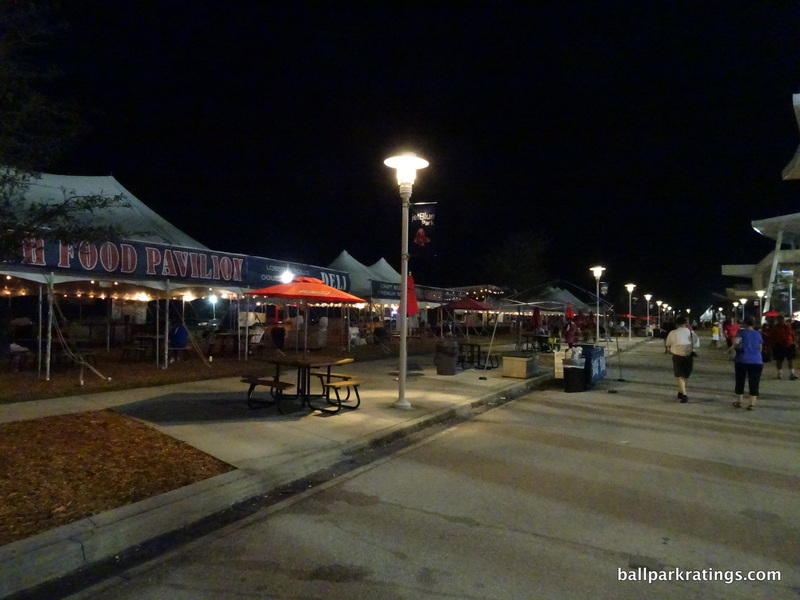 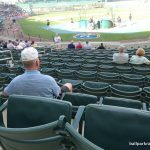 While the picnic areas on Fenway South Drive are a festive place to gather, there are no destination bars or other vibrant social spaces at JetBlue Park, nor are there many other places to sit down/hang out on the main concourse. 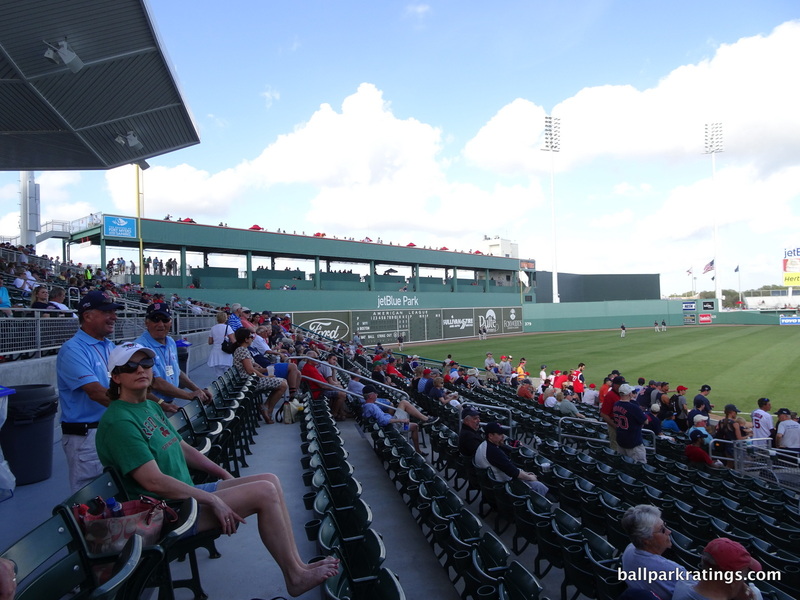 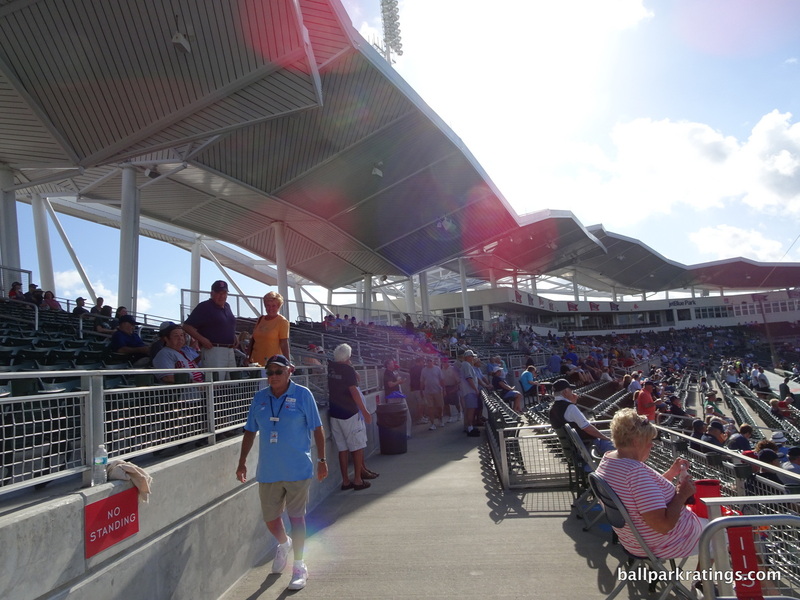 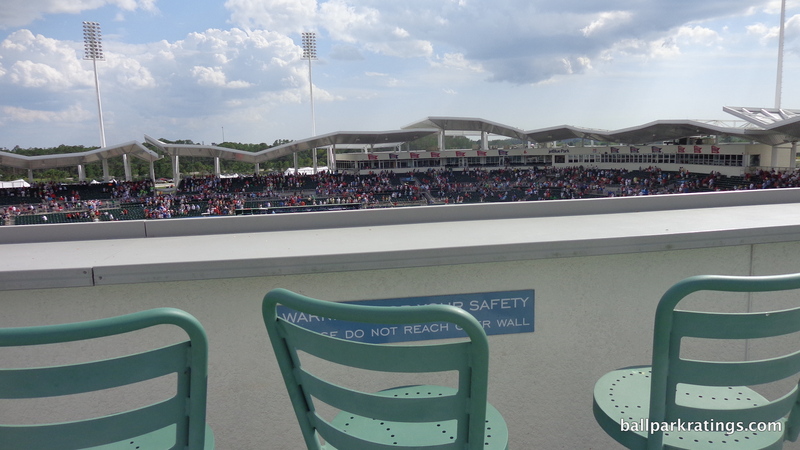 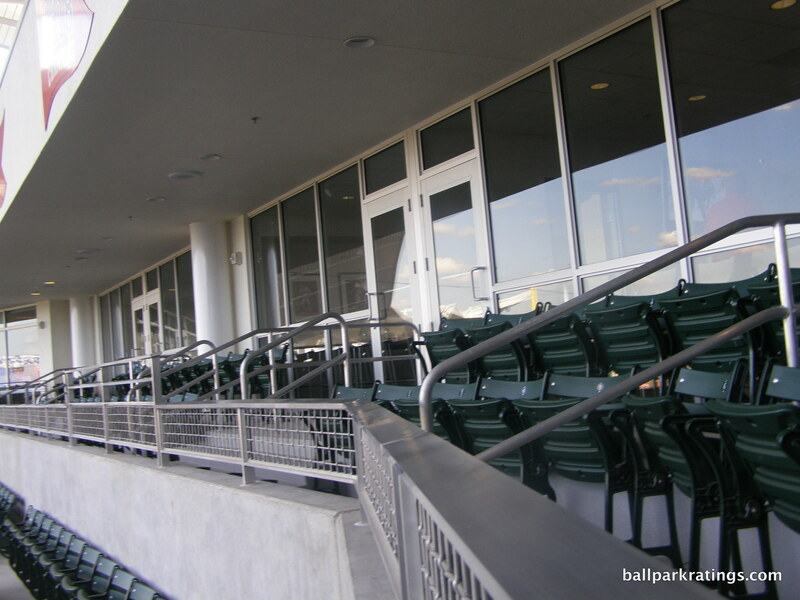 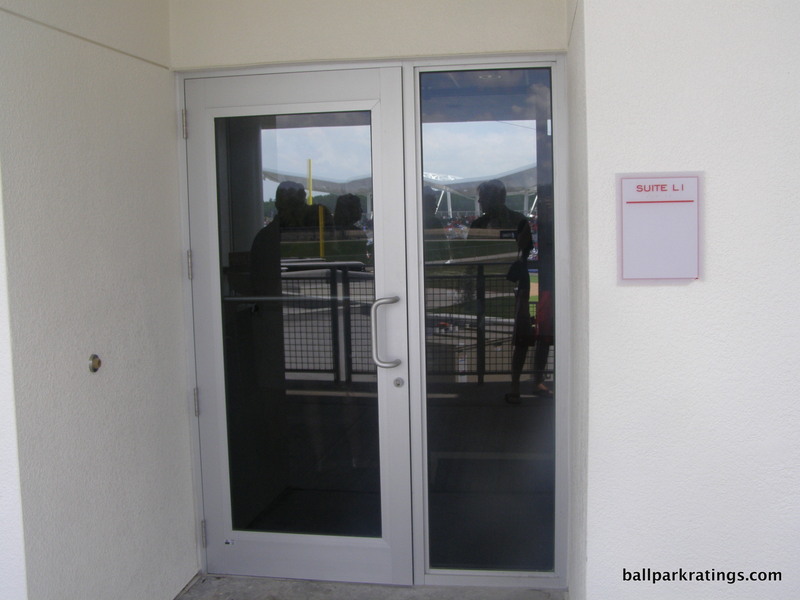 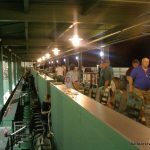 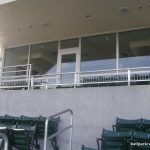 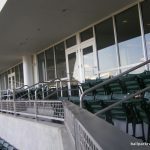 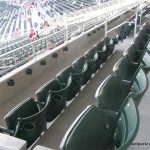 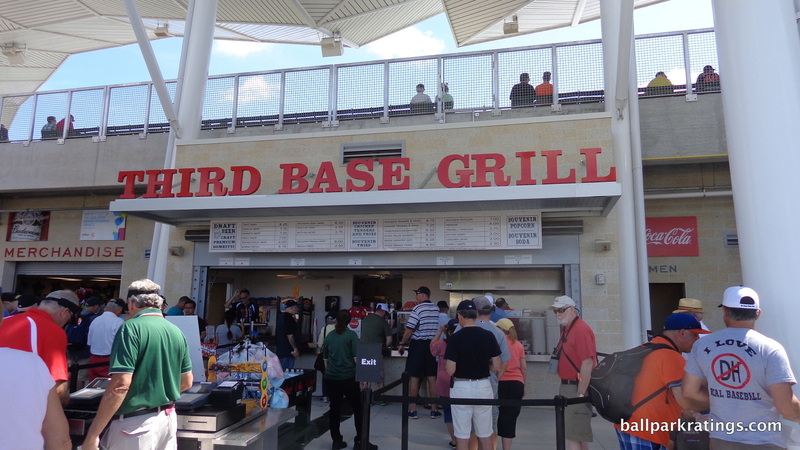 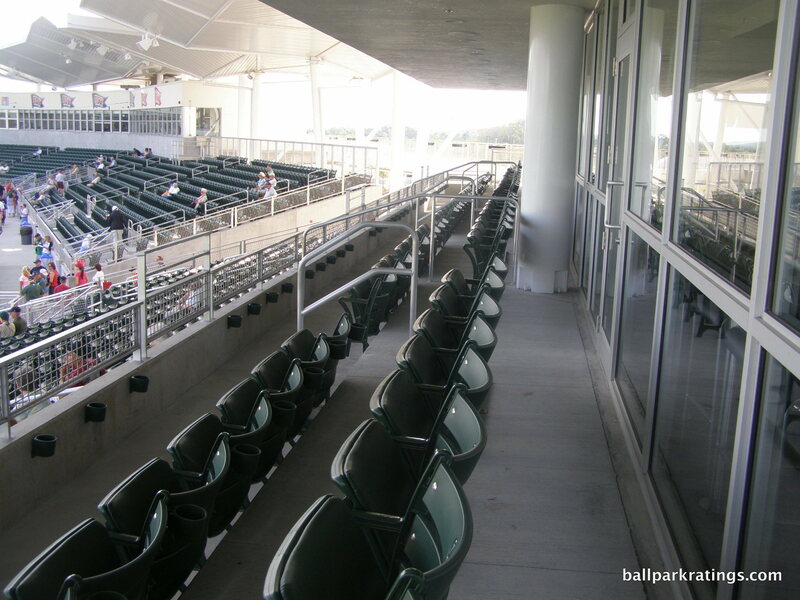 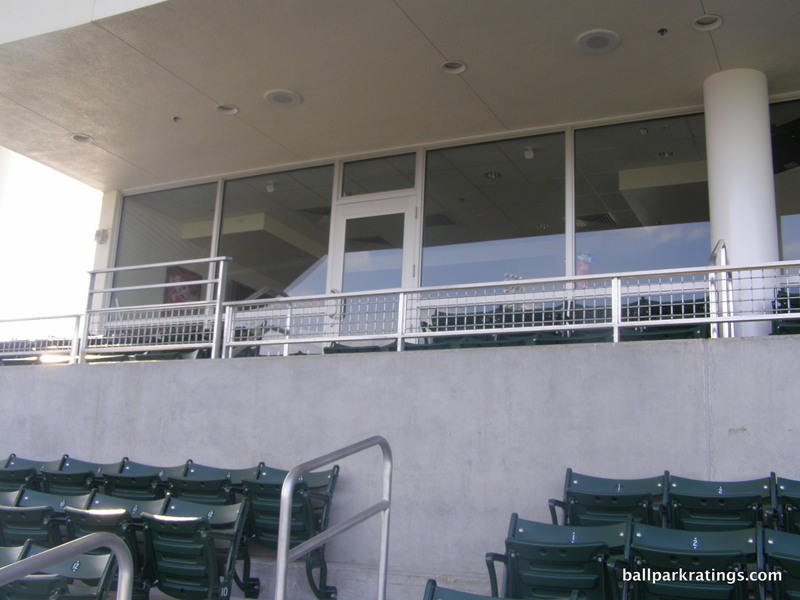 Other than the rudimentary right field Pinchers Patio and the eight luxury suites, JetBlue Park doesn’t possess great premium or group options. 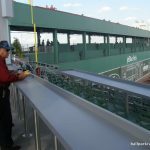 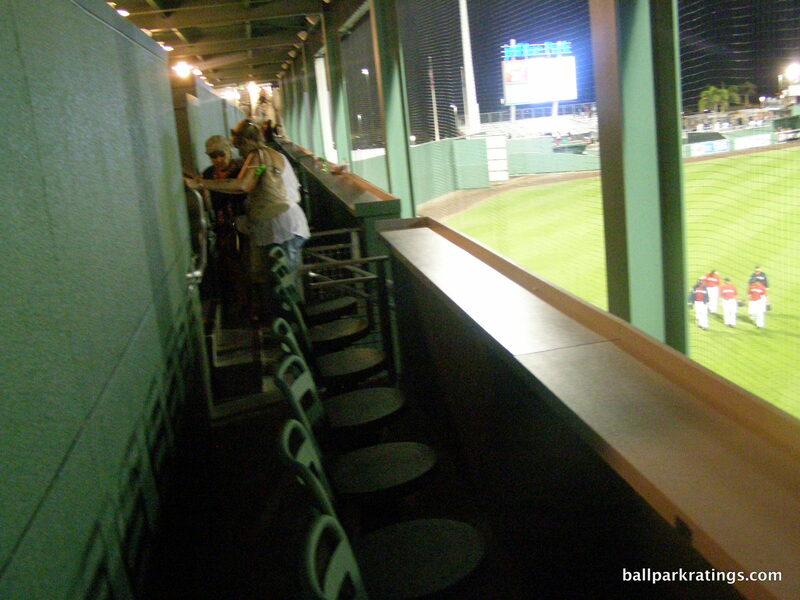 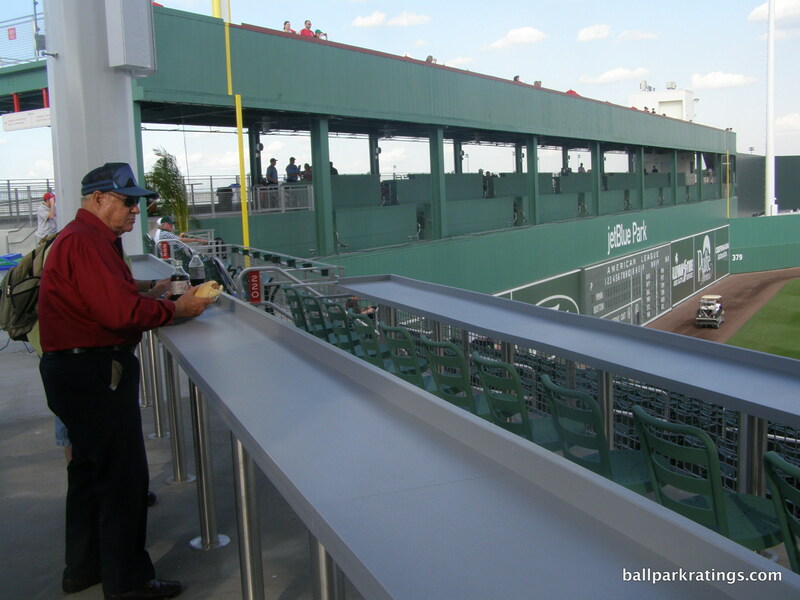 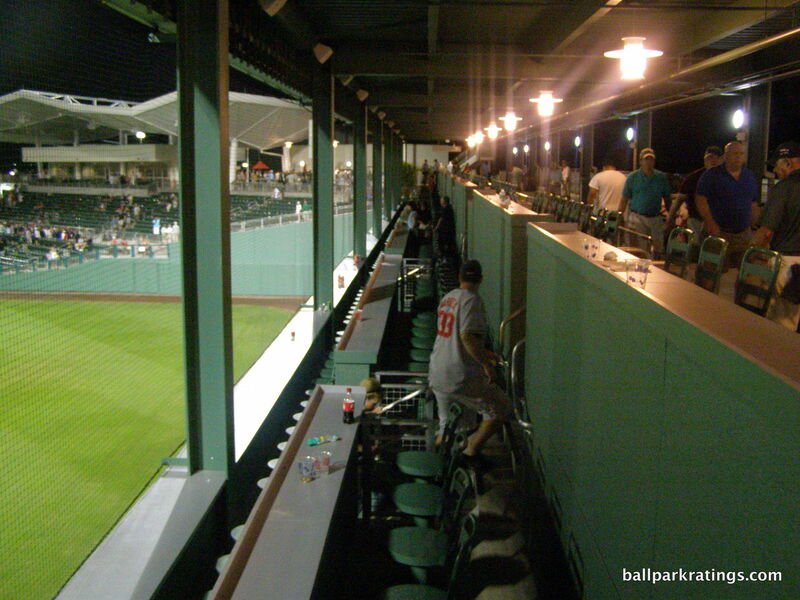 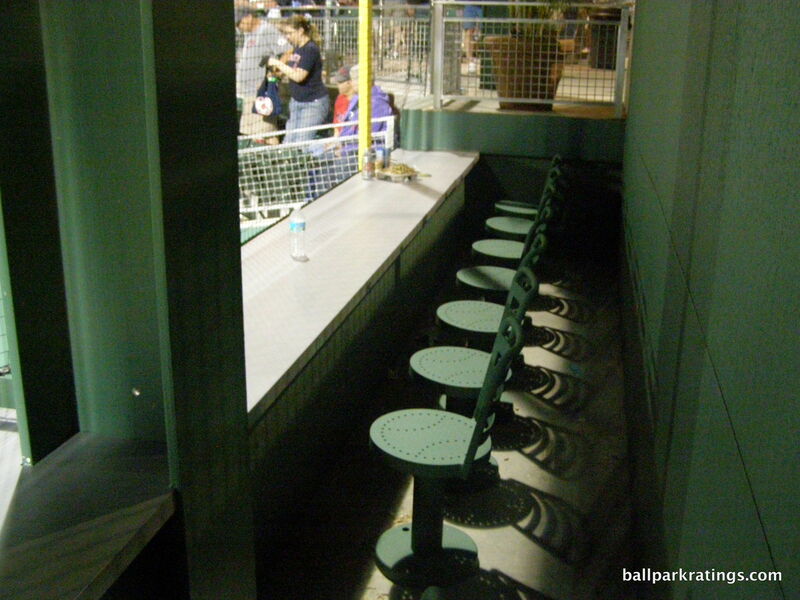 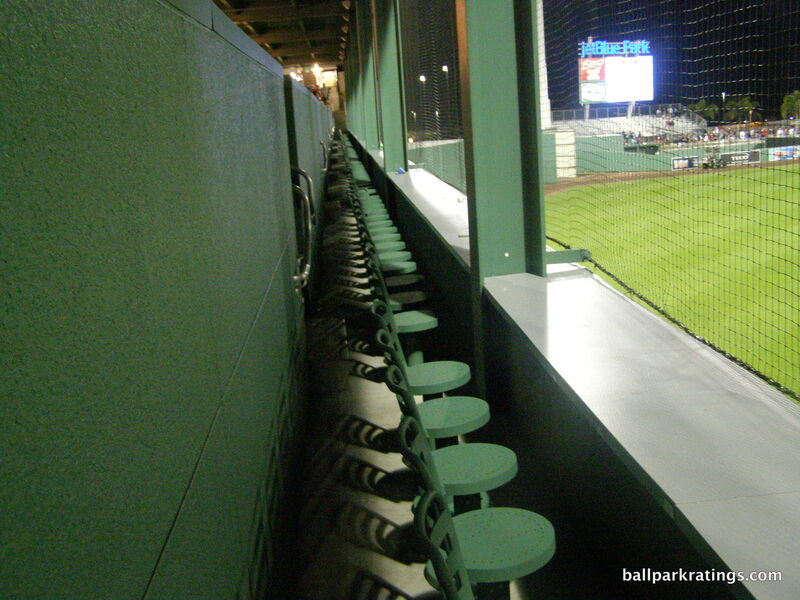 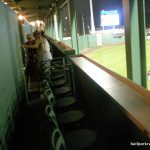 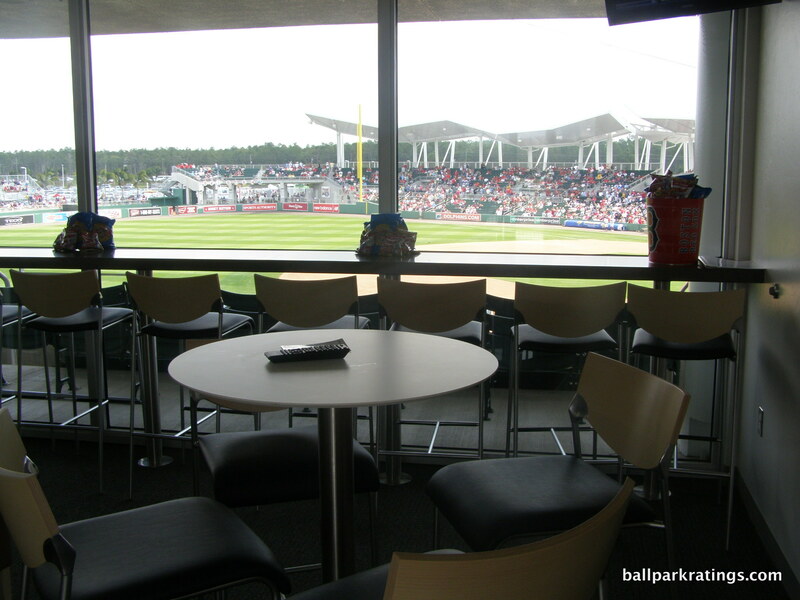 Extra points for the exclusive drink rail seating both inside and on top of the Green Monster though. 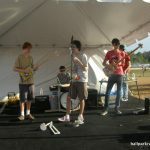 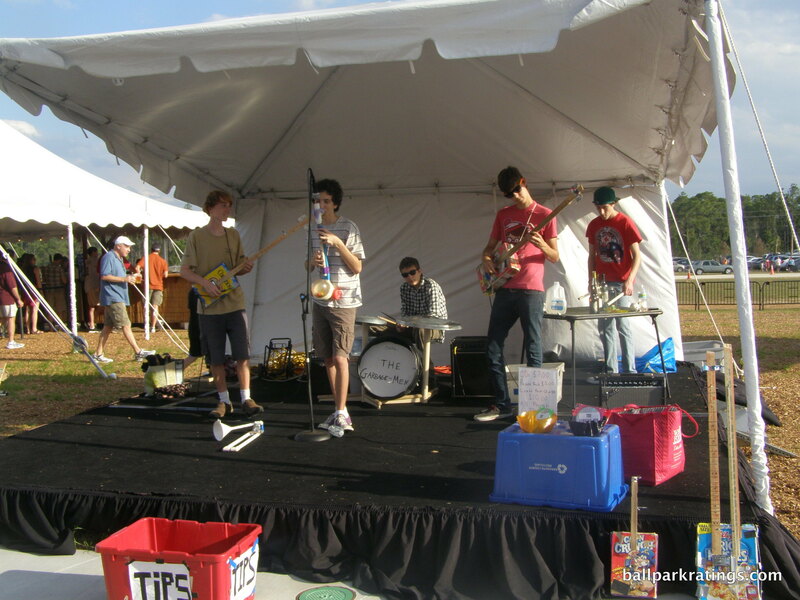 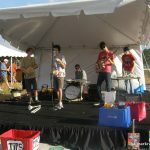 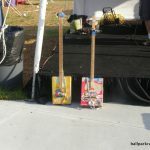 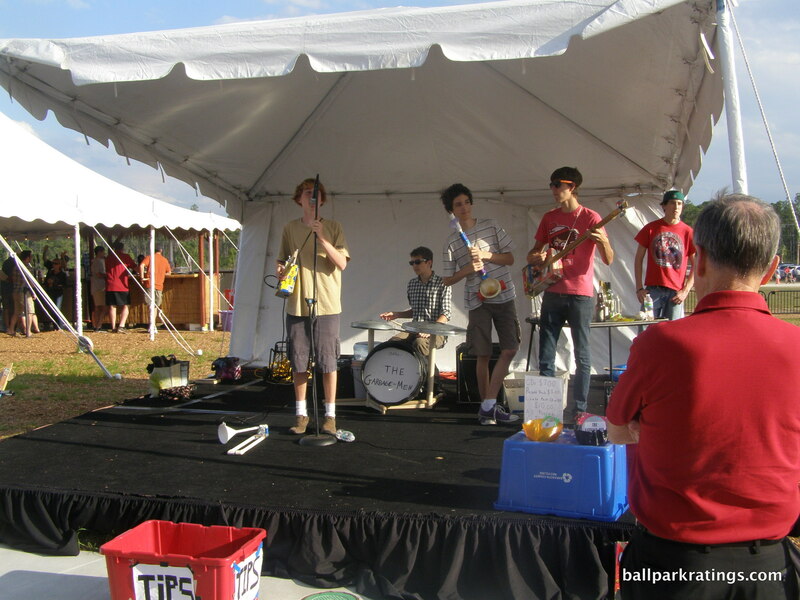 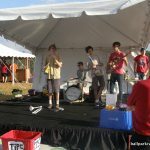 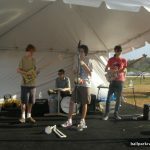 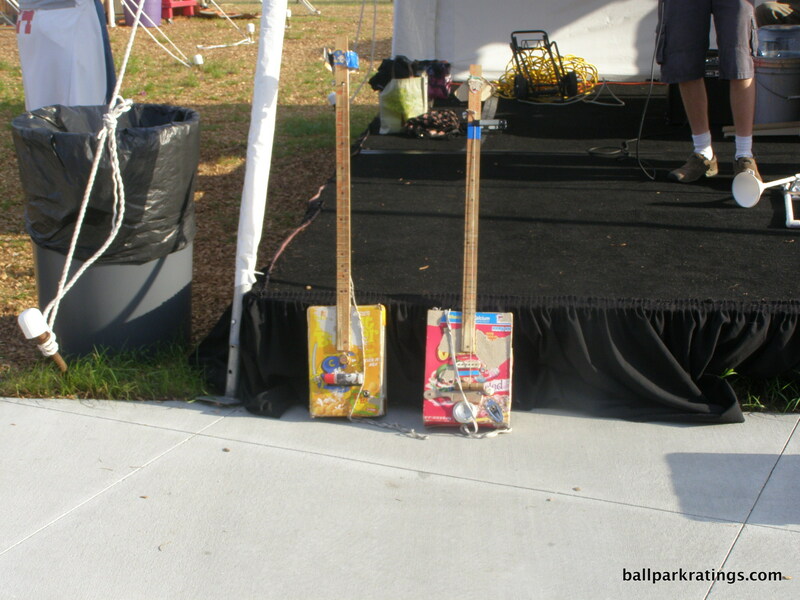 Speed pitch is the extent of the kids’ activities, but there are also sometimes pre-game music performances on Fenway South Drive. 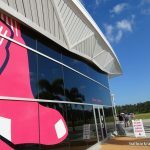 Some of these flaws are a natural function of (1) the lack of a 360-degree concourse or expansive 200-level, and (2) the Red Sox desire to stay faithful to Fenway Park, to be charitable. 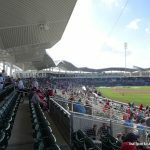 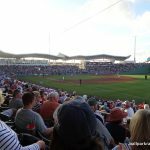 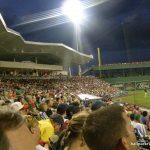 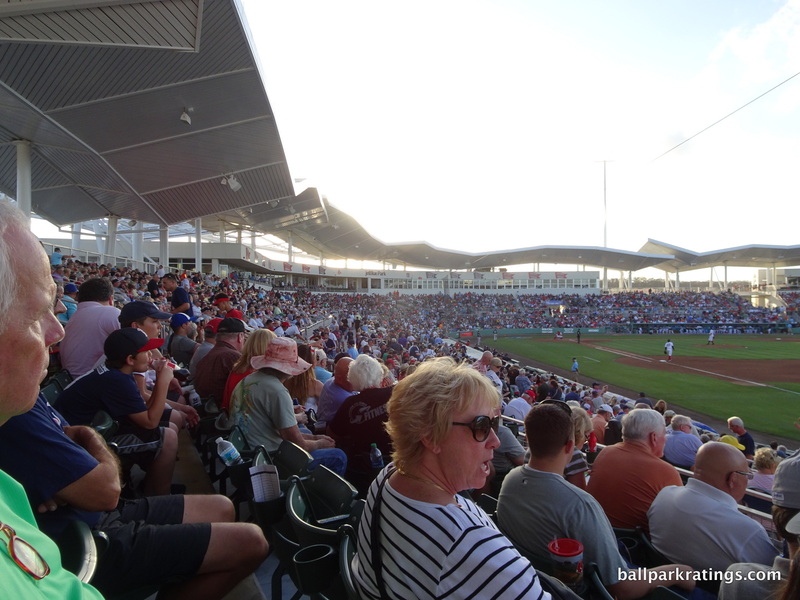 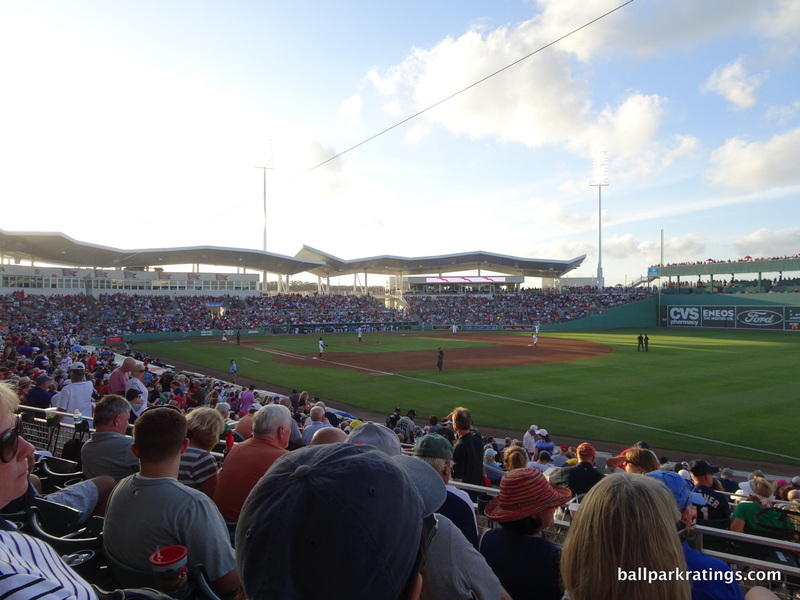 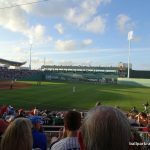 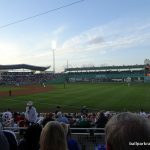 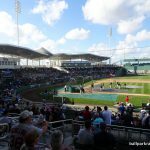 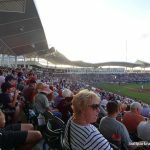 For better or for worse, JetBlue Park is a faithful re-creation of Fenway infused with a Floridian flare, which translates to a great atmosphere and striking design. 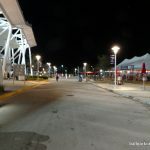 But that also comes with functionality and amenities that are mostly sufficient but don’t quite measure up to the state-of-the-art in the 2010s.